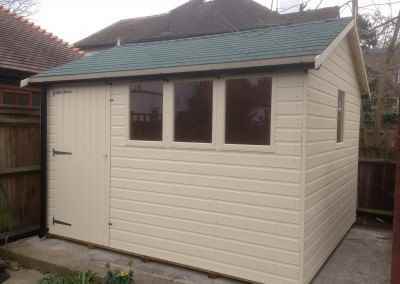 STANDARD AND BESPOKE AVAILABLE ANY SIZE, SHAPE, STYLE AND CONFIGURATION TO SUIT PLEASE ENQUIRE FOR PRICE ON 01252 737418 THANK YOU. 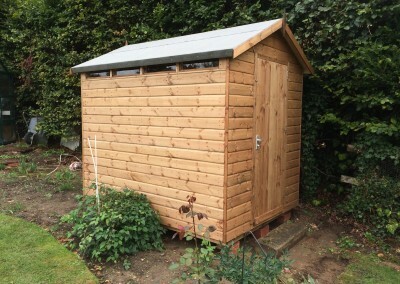 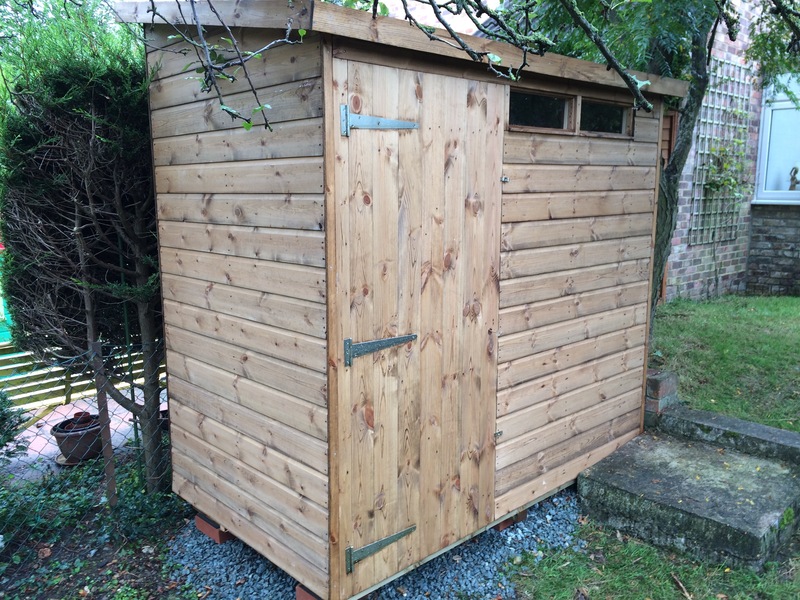 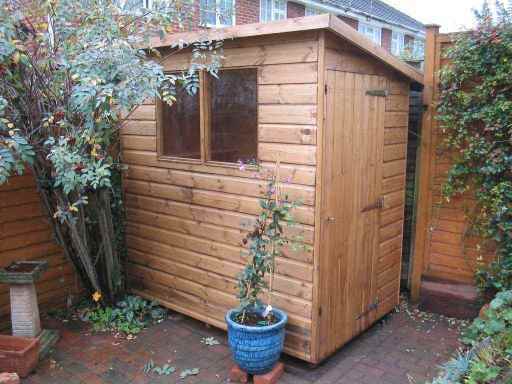 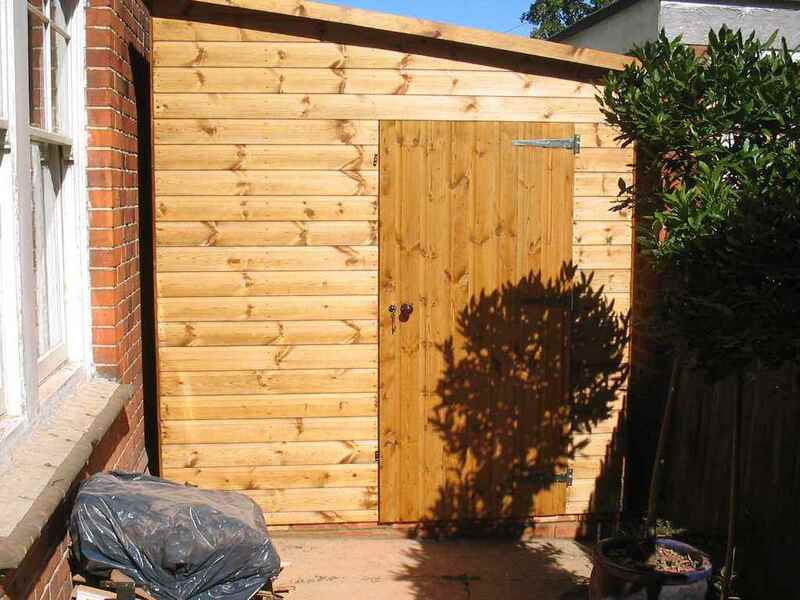 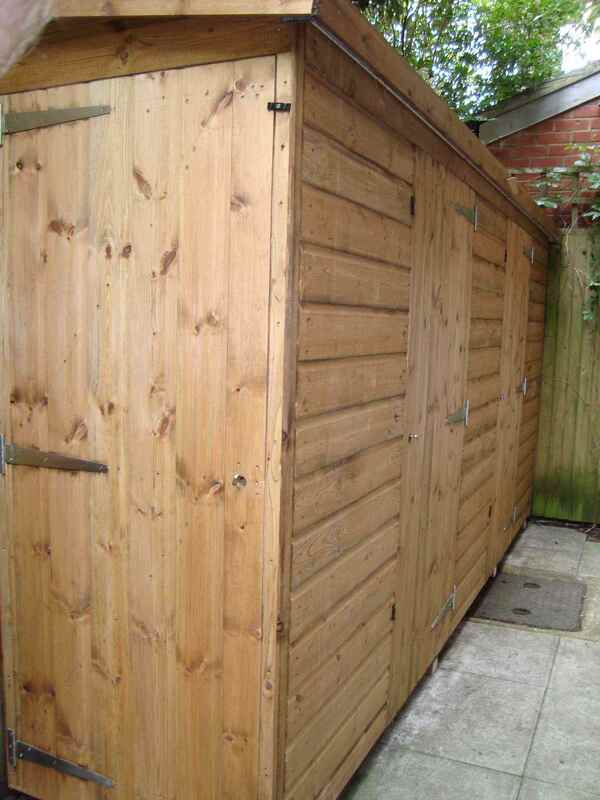 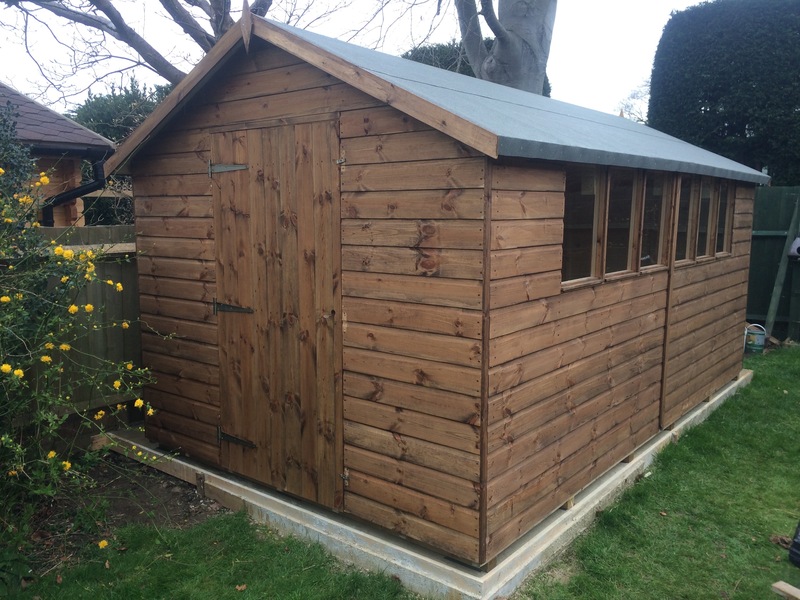 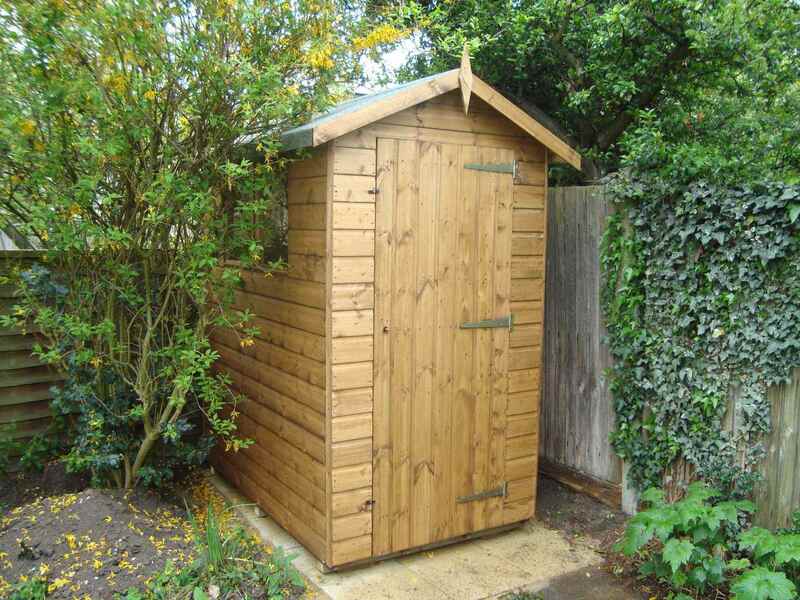 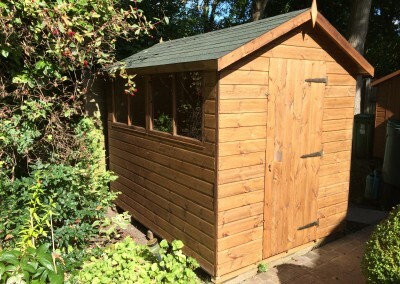 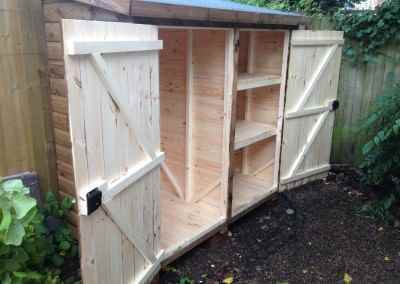 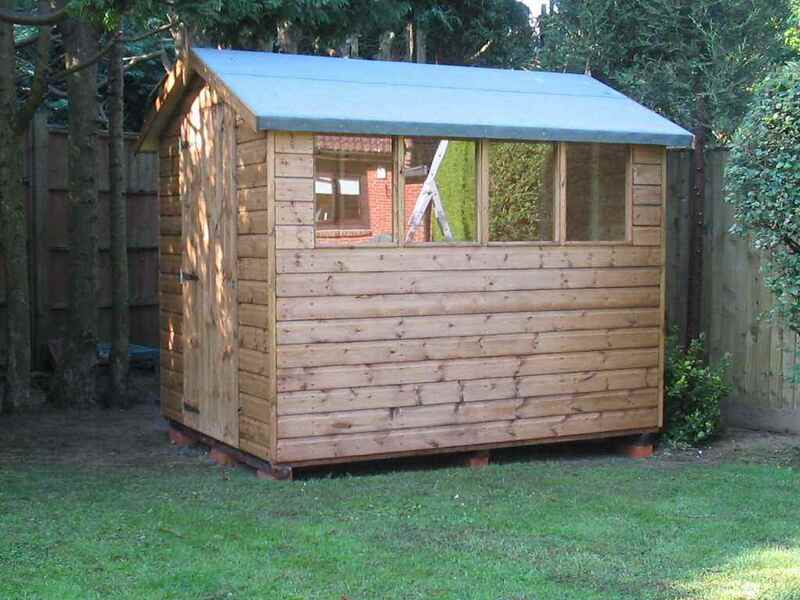 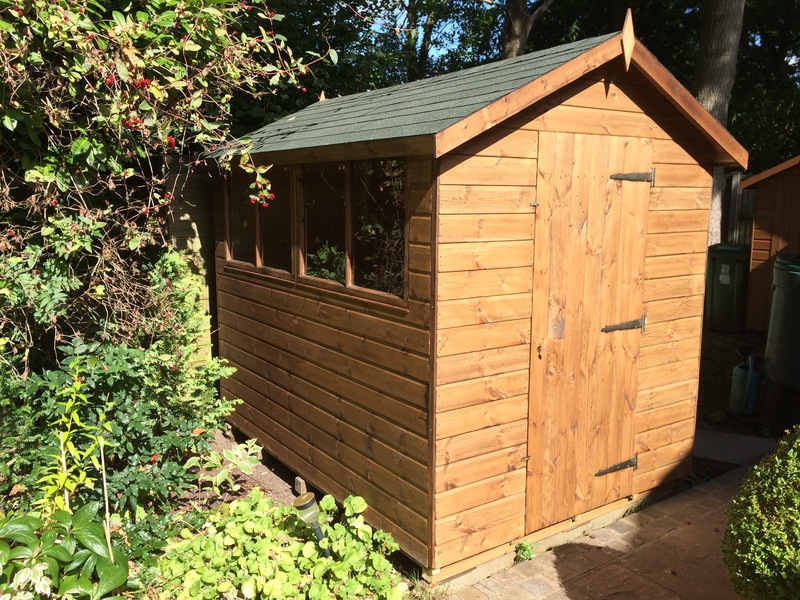 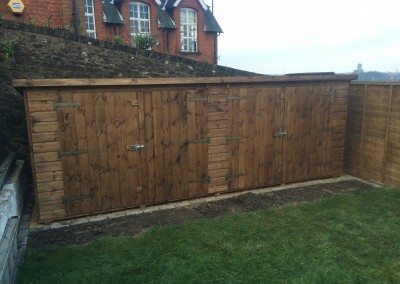 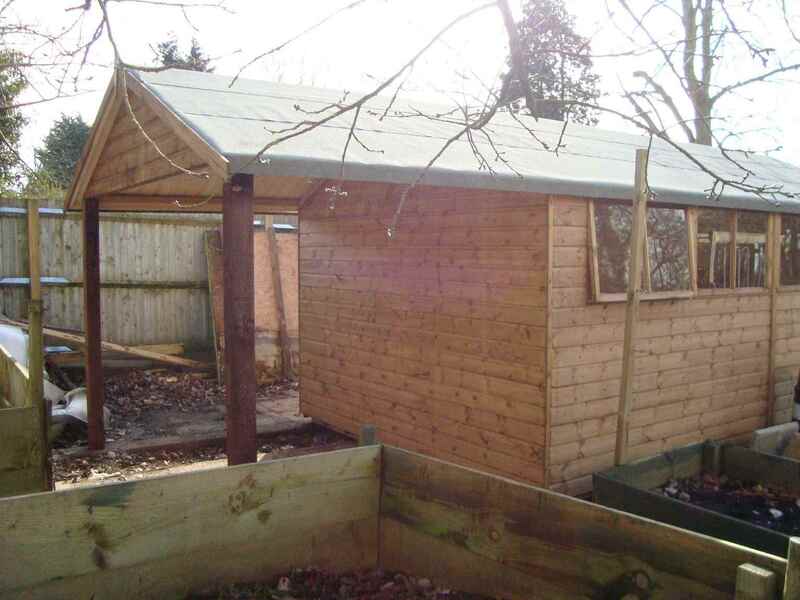 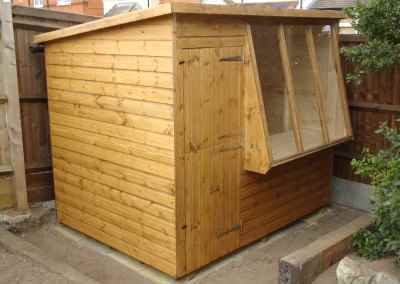 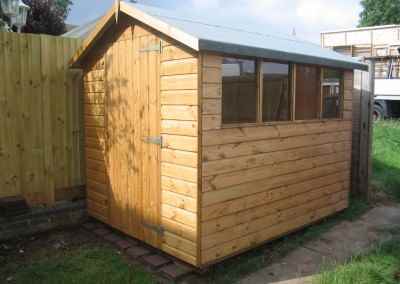 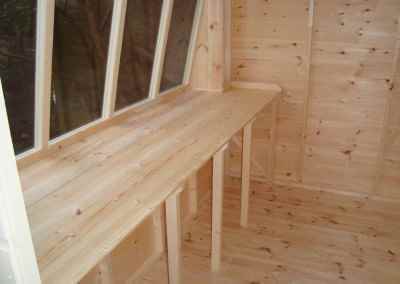 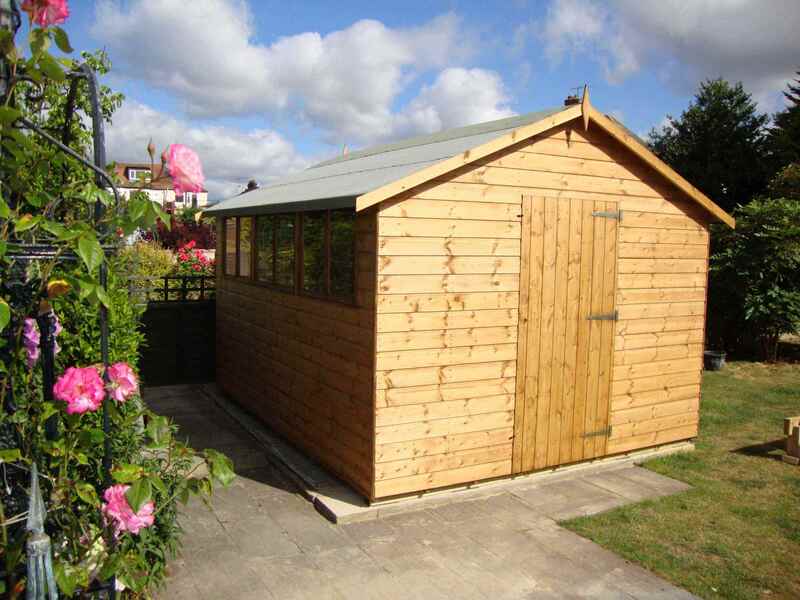 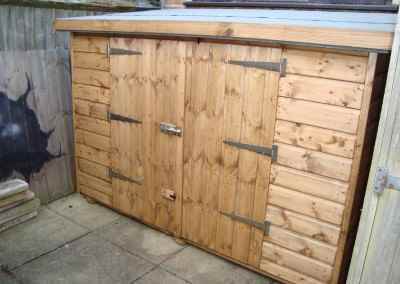 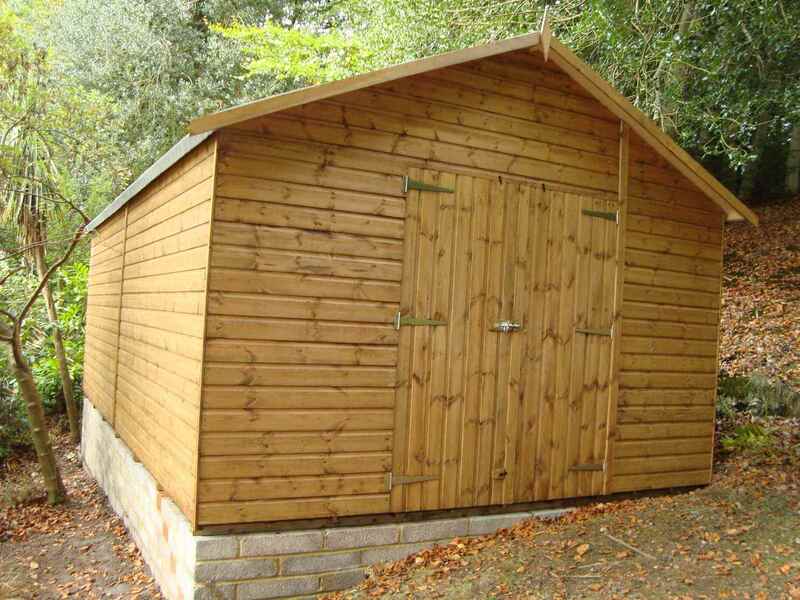 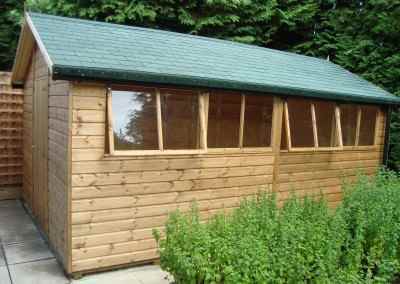 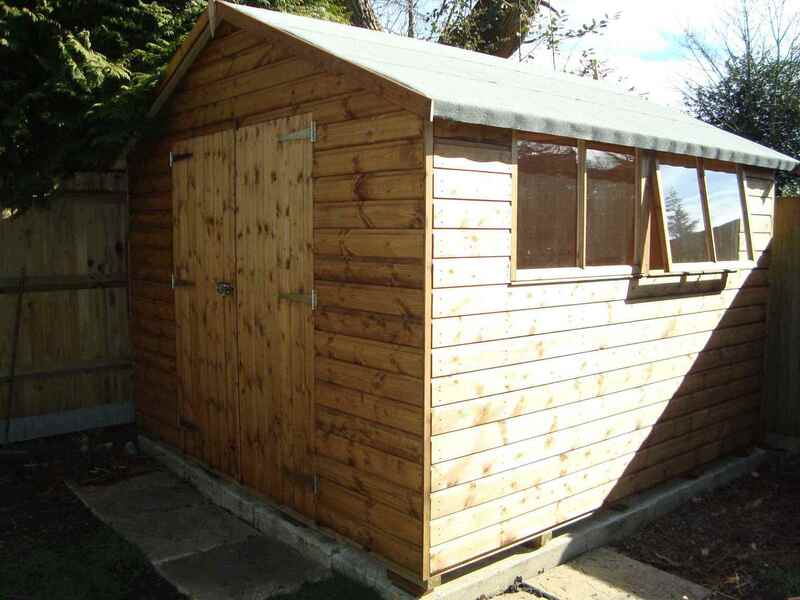 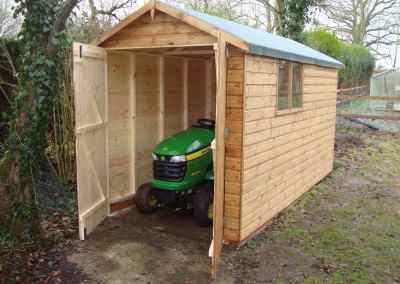 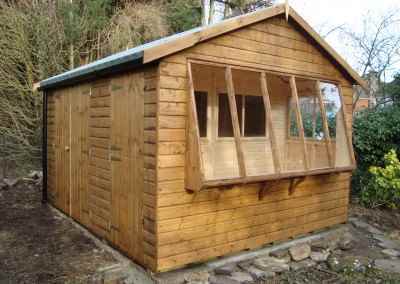 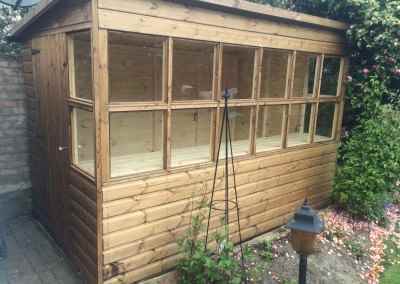 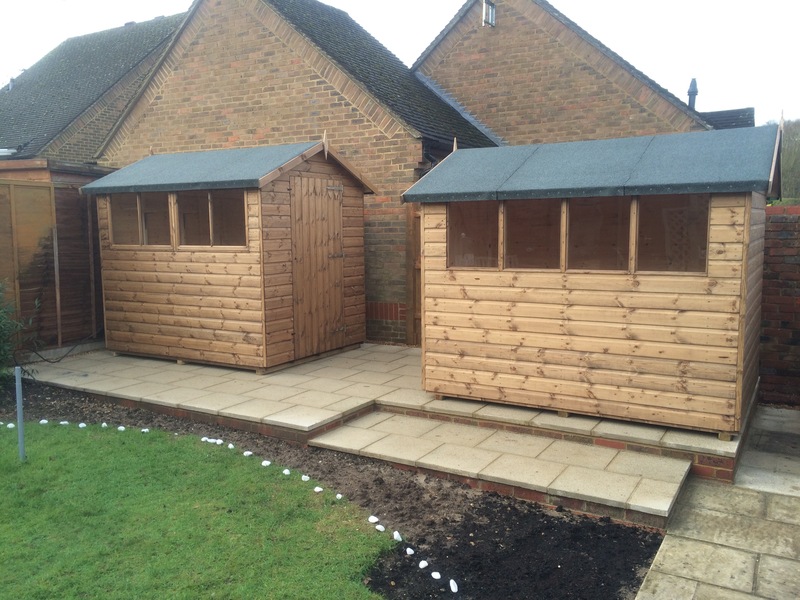 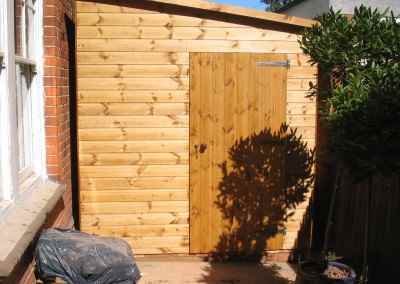 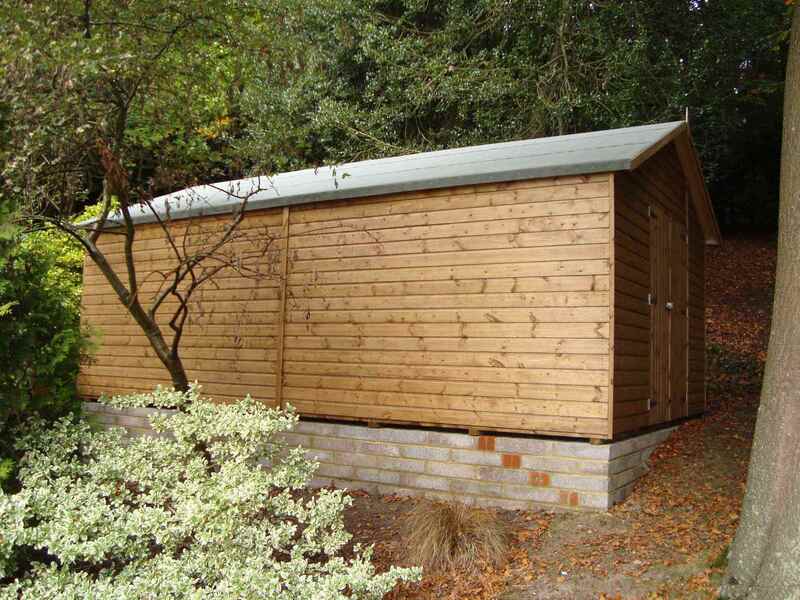 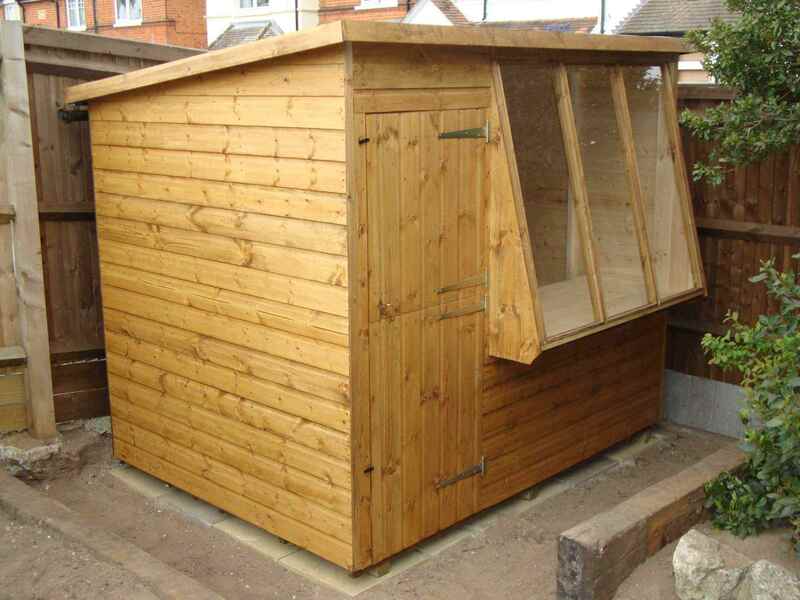 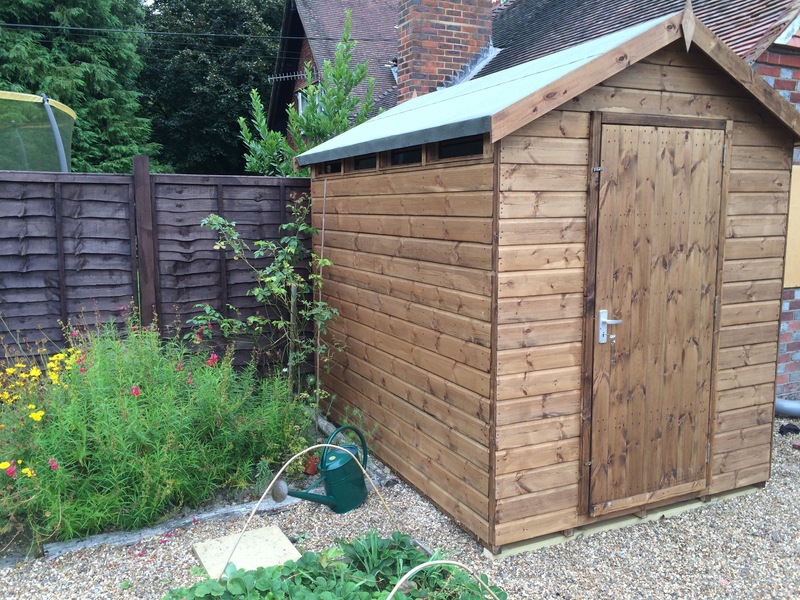 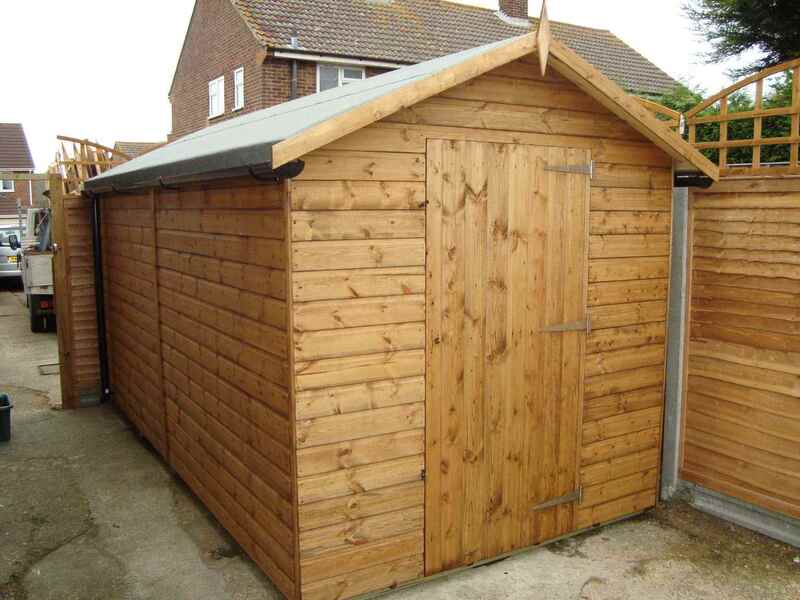 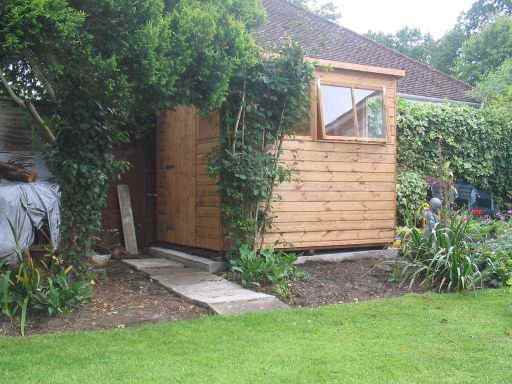 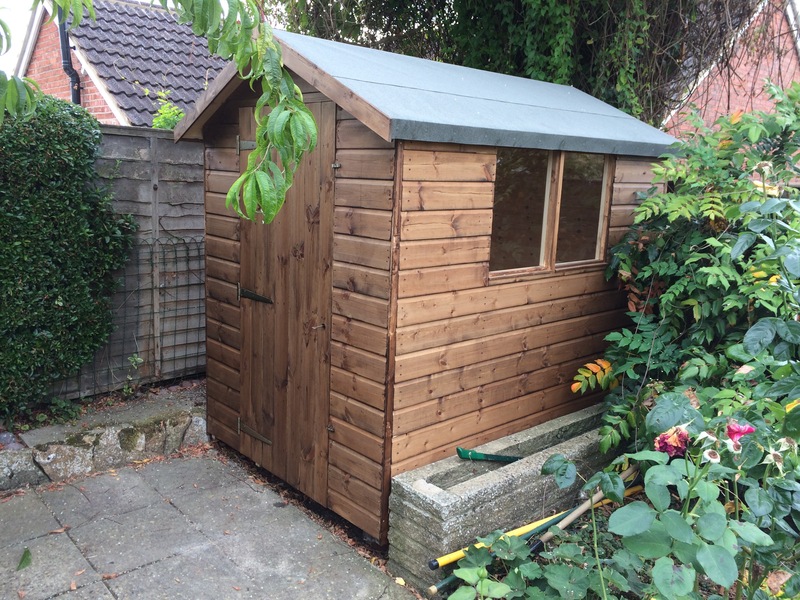 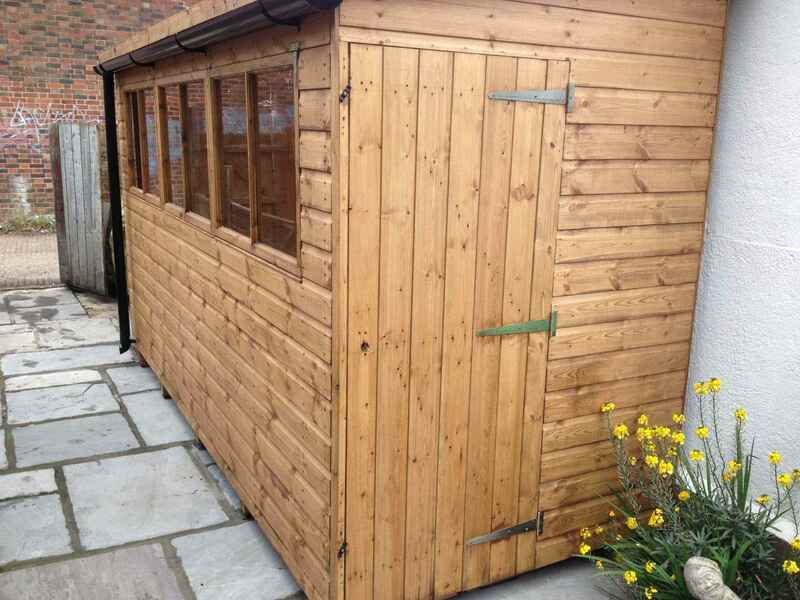 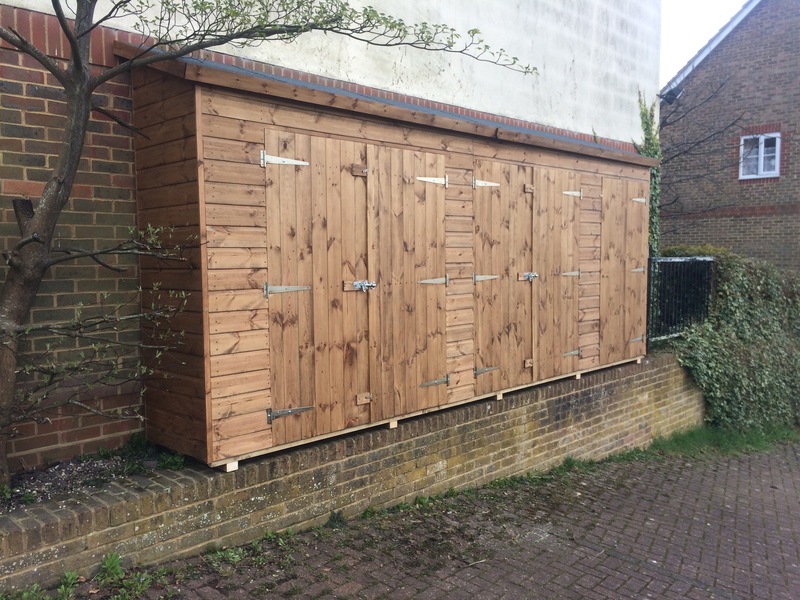 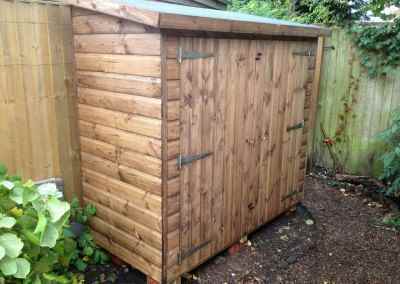 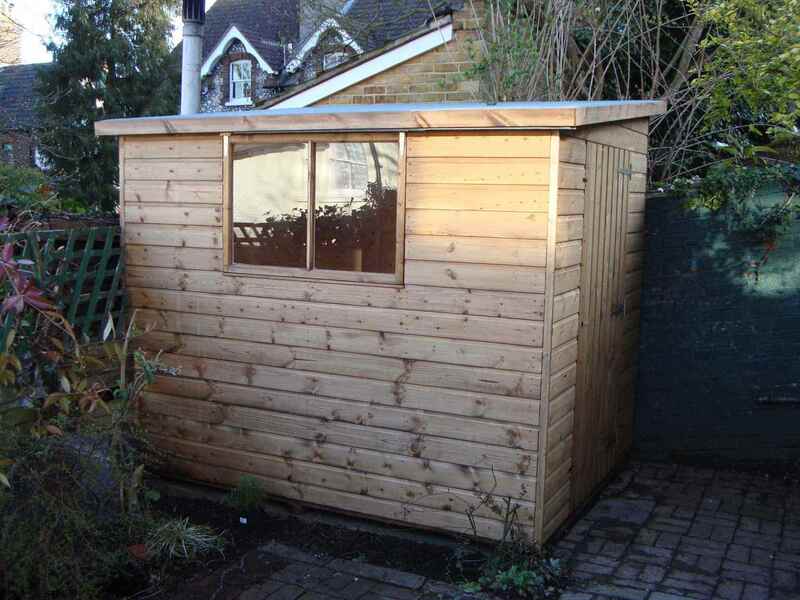 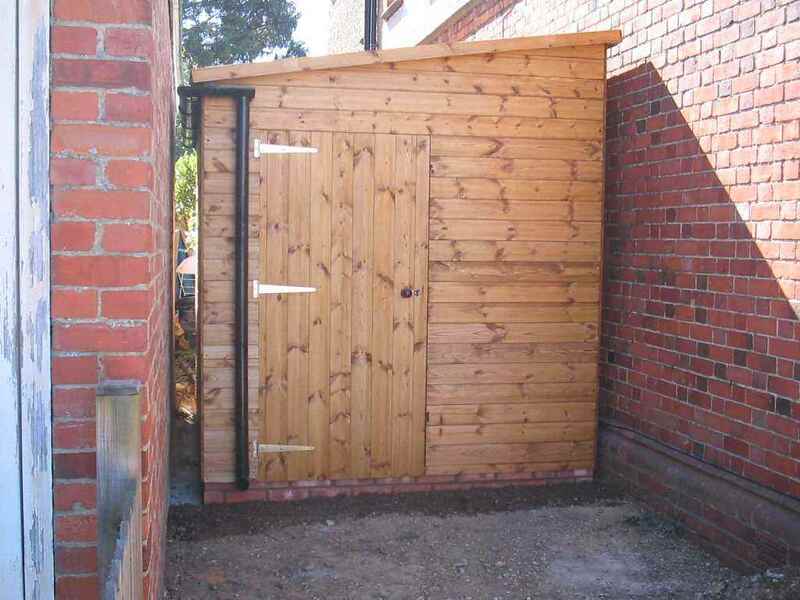 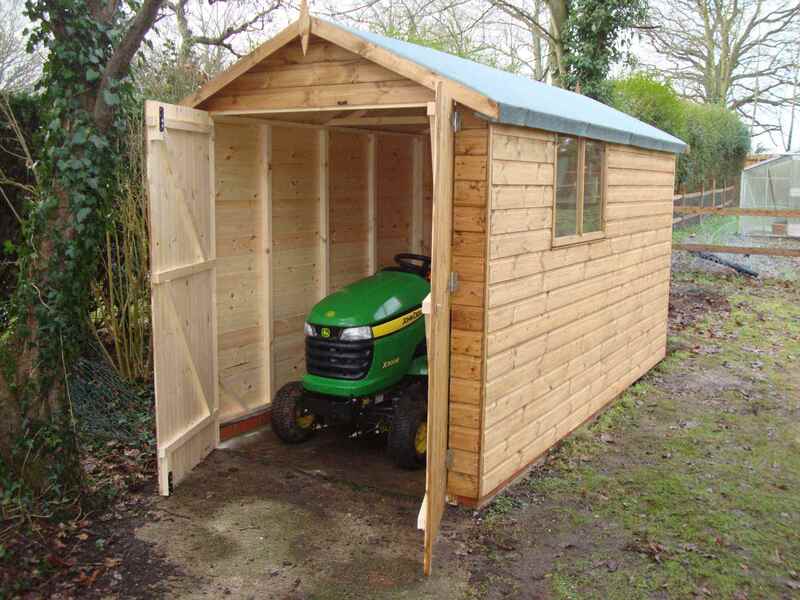 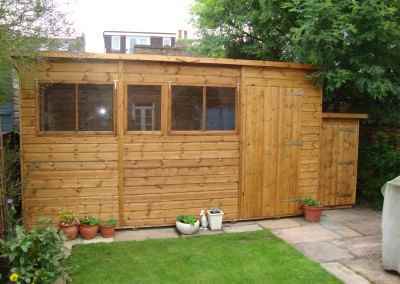 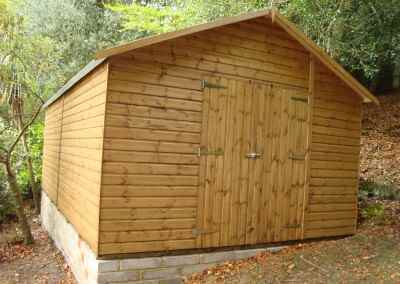 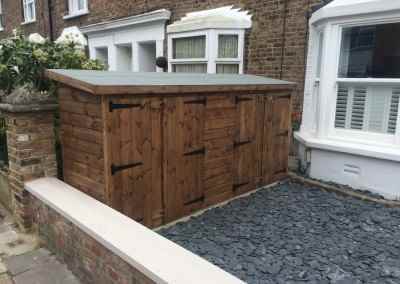 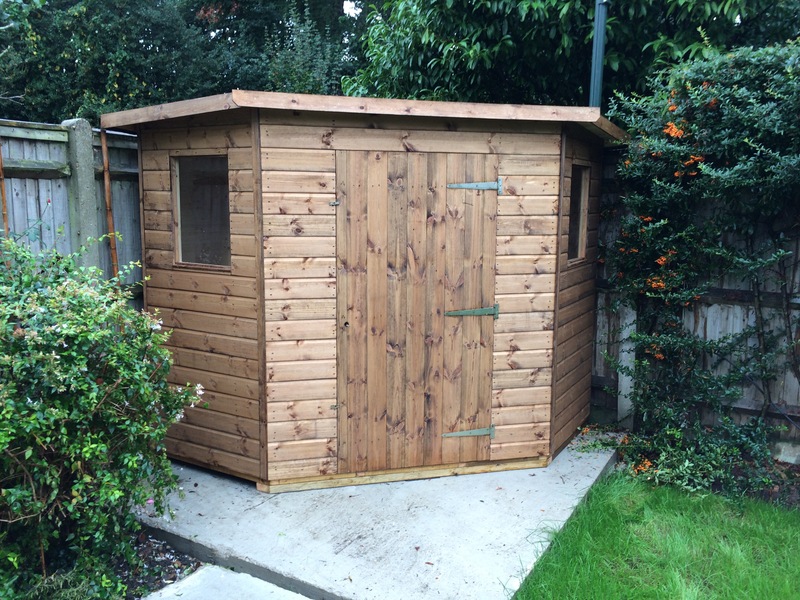 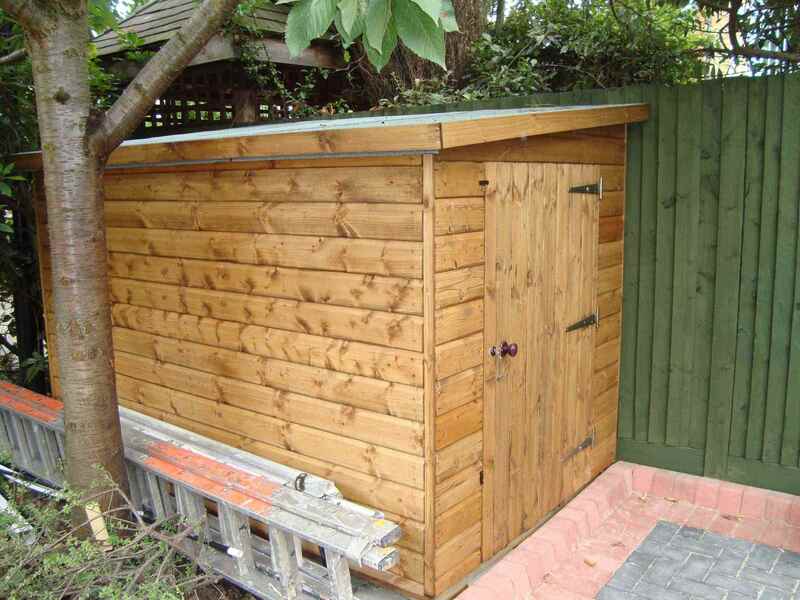 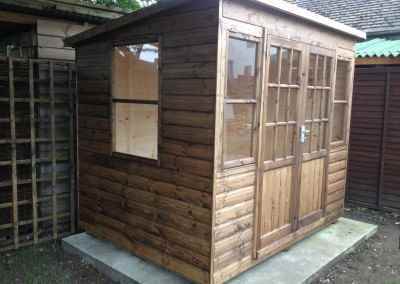 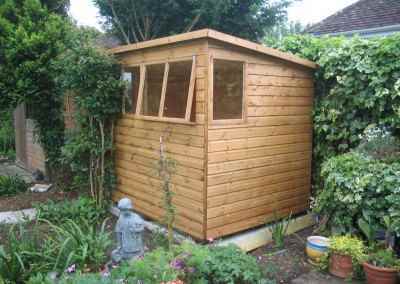 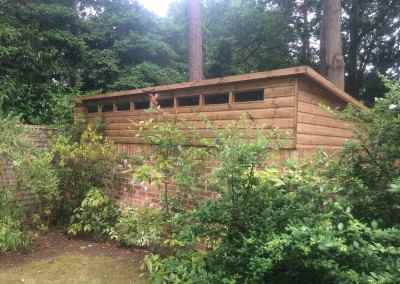 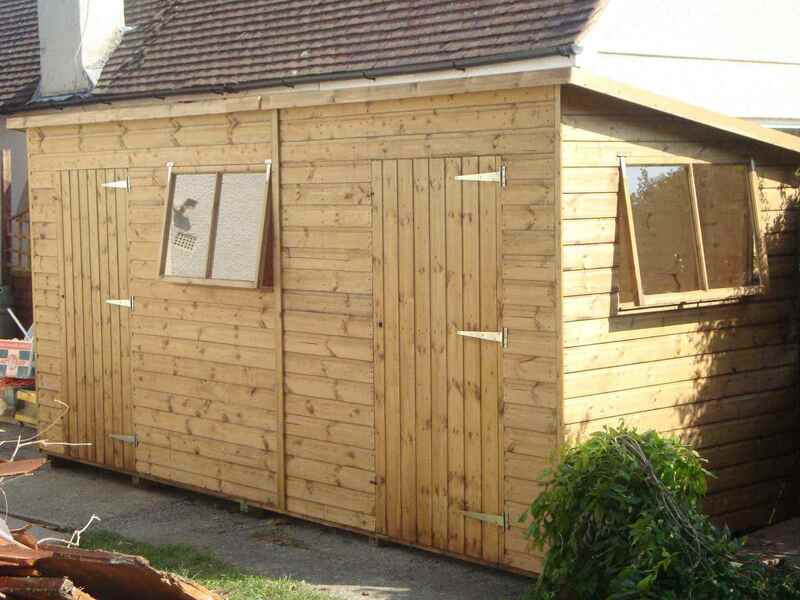 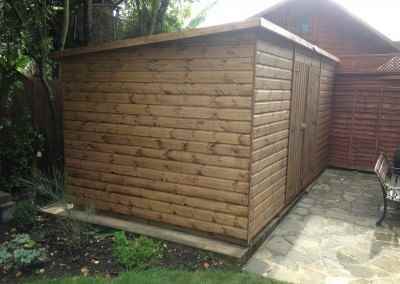 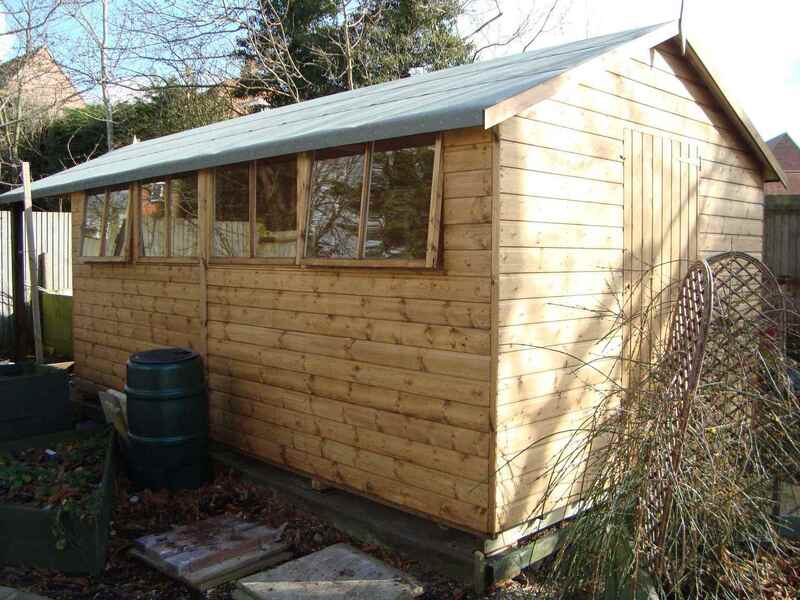 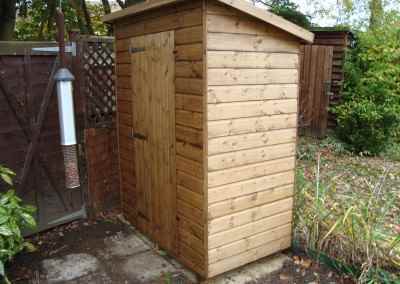 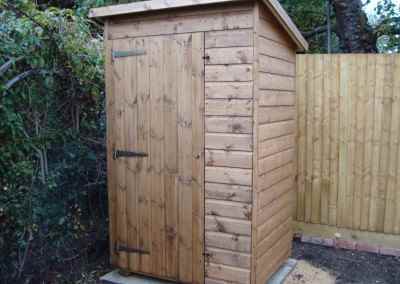 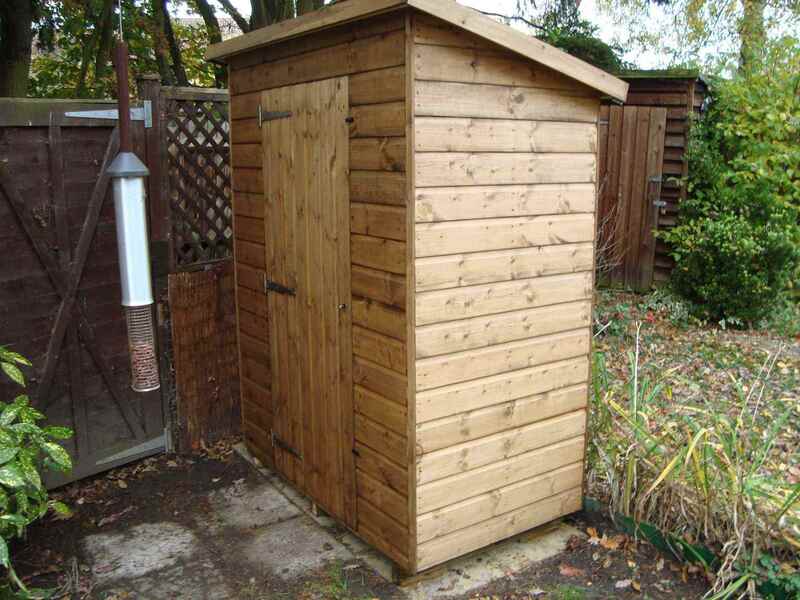 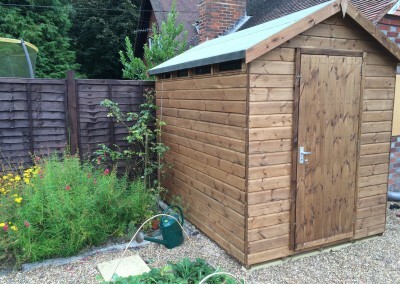 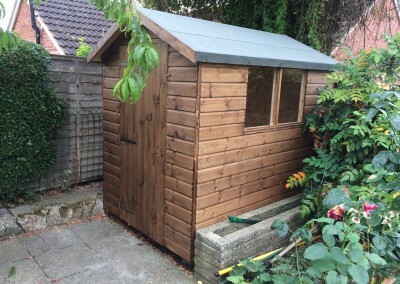 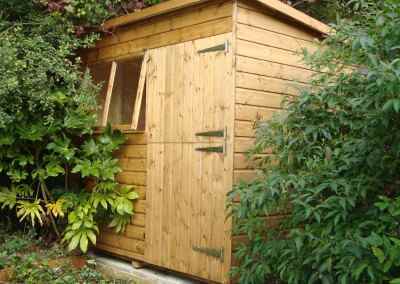 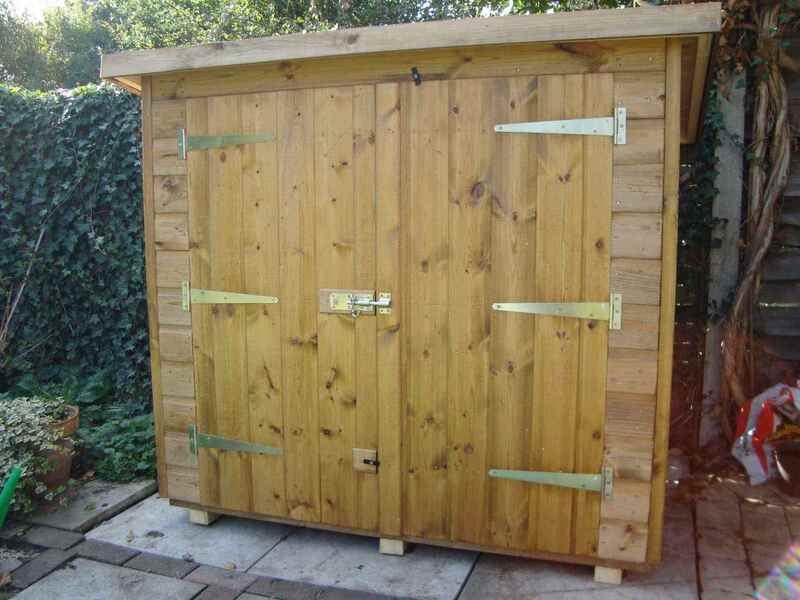 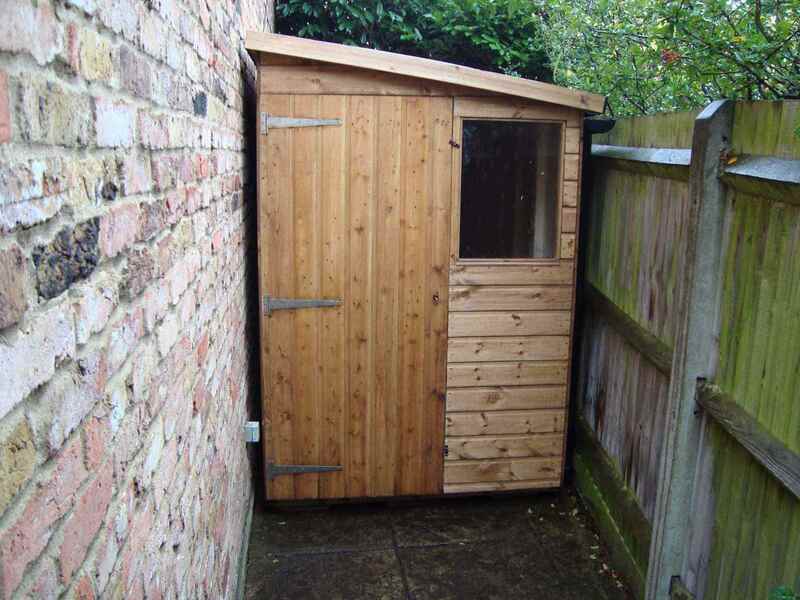 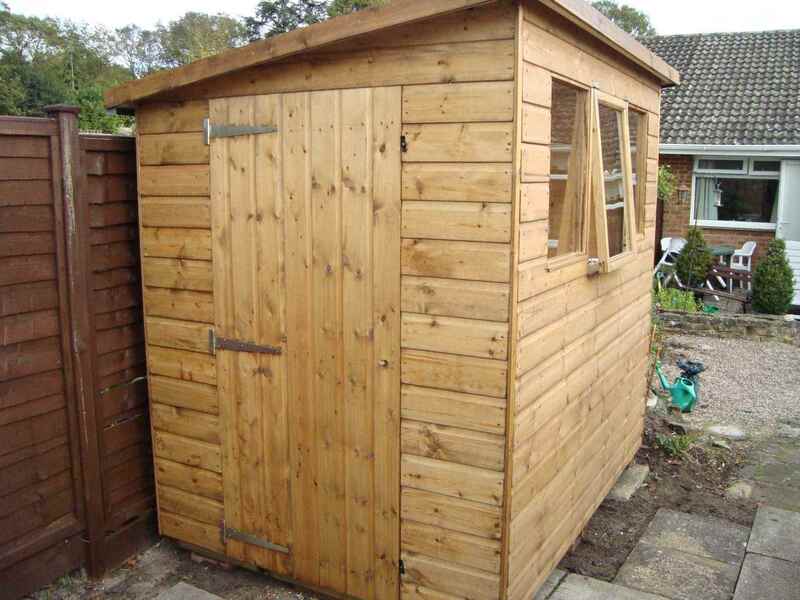 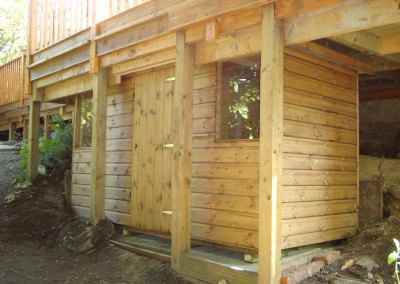 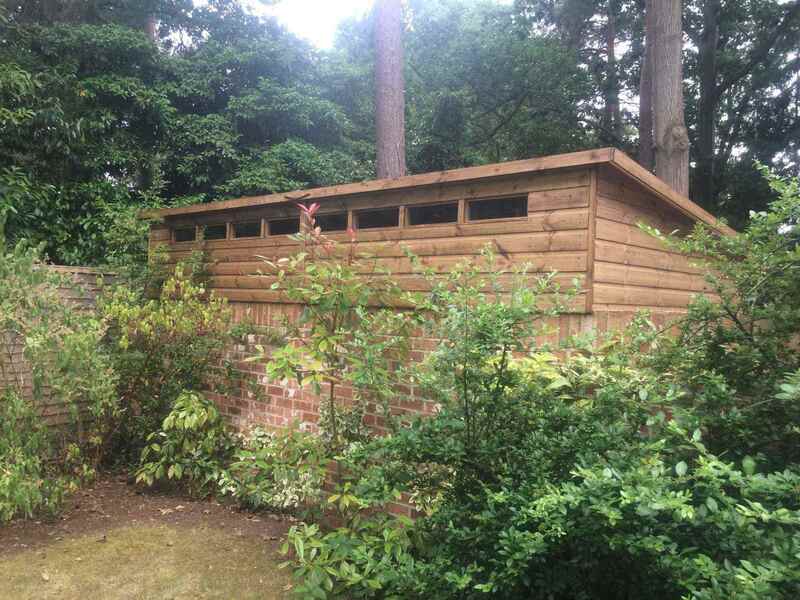 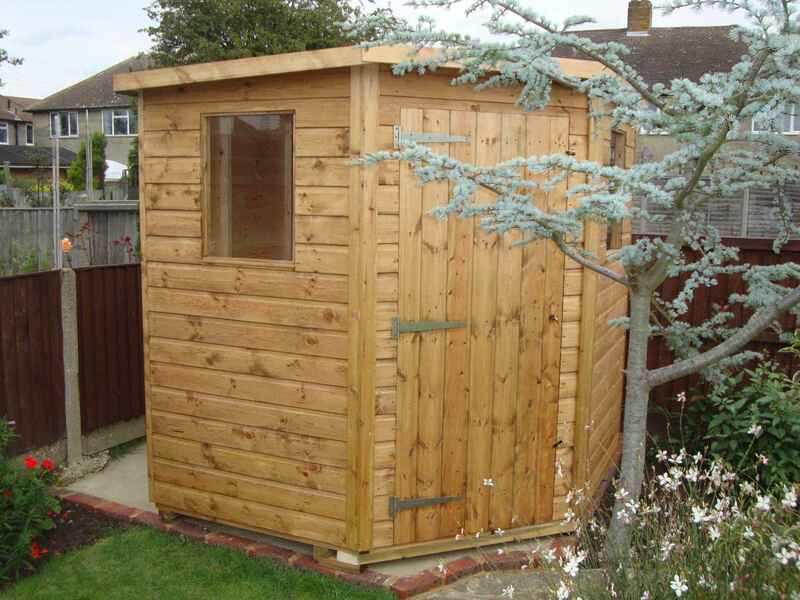 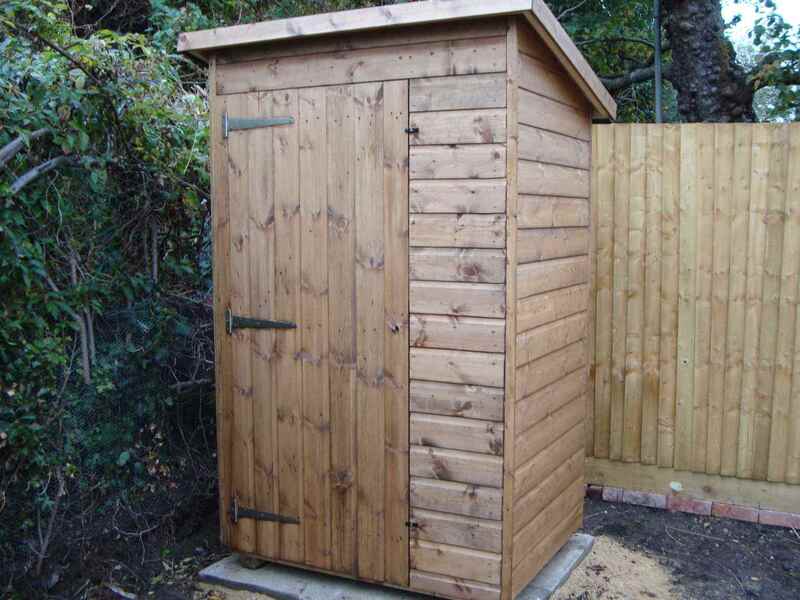 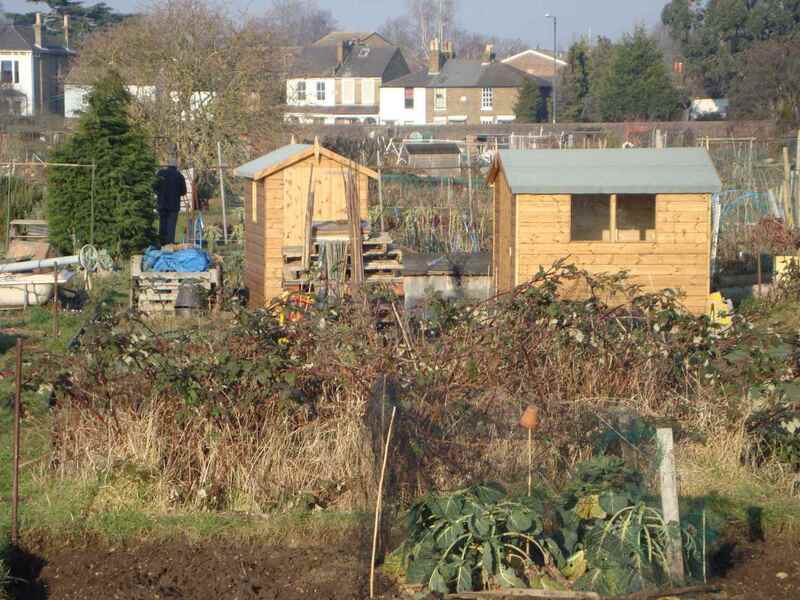 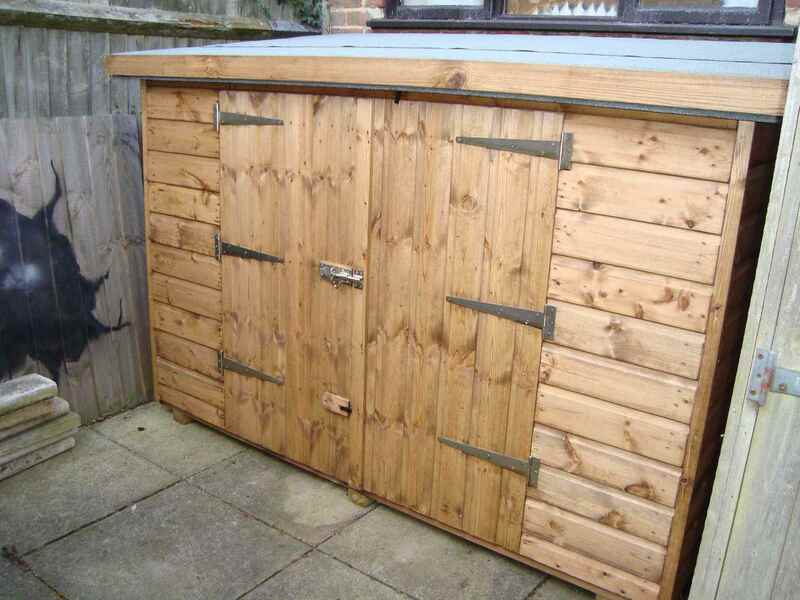 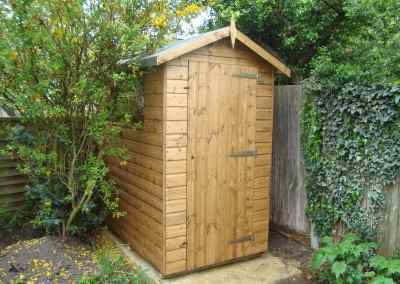 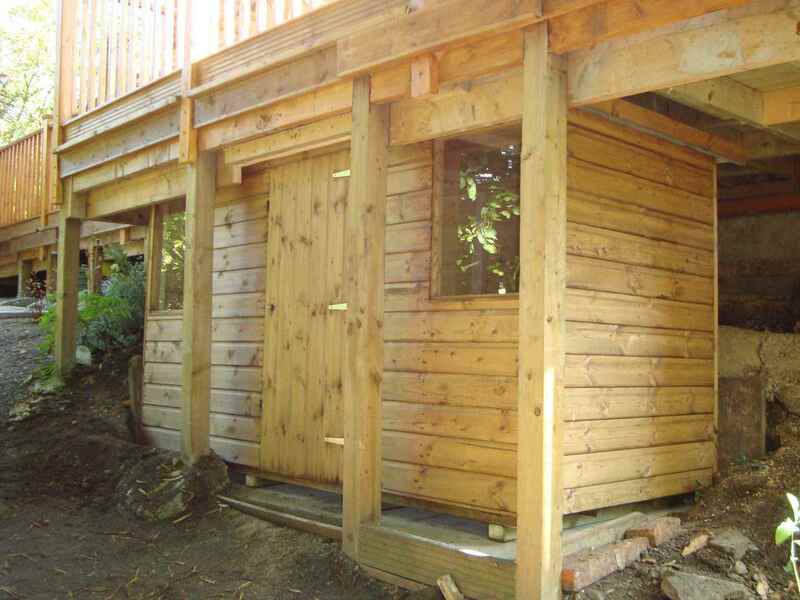 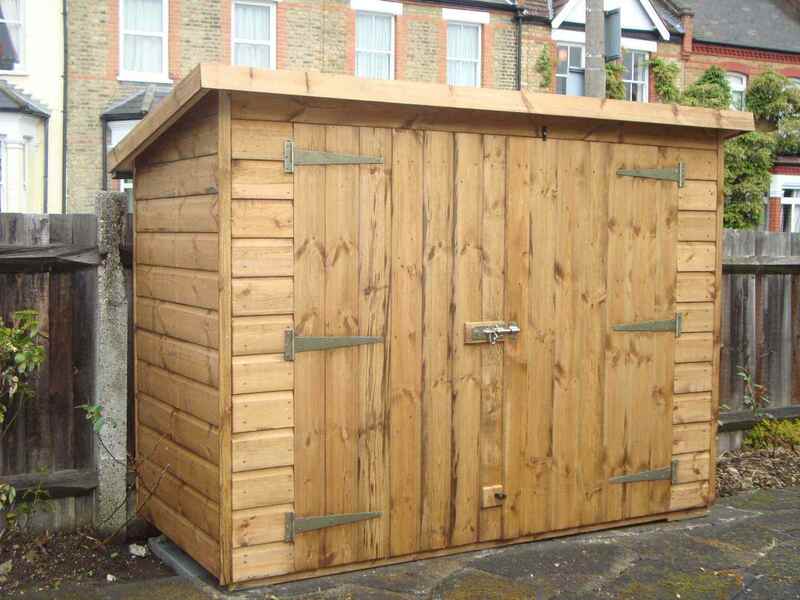 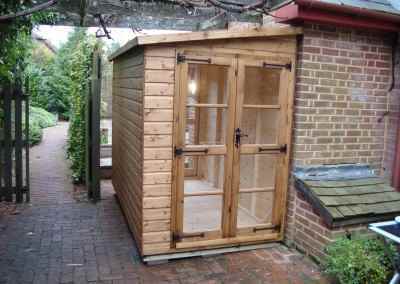 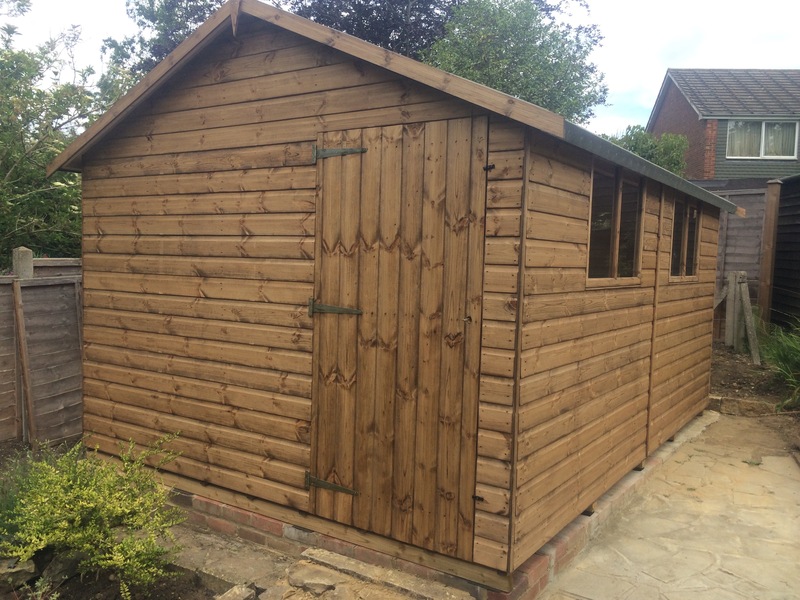 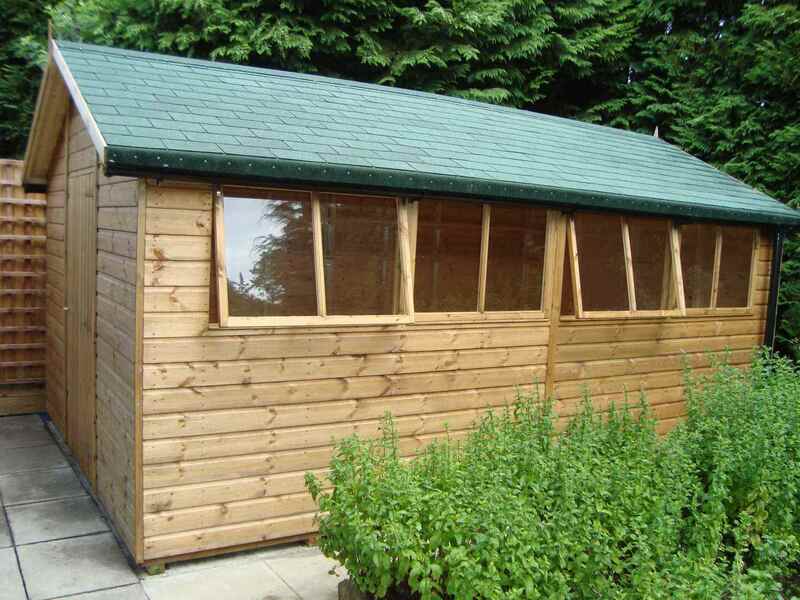 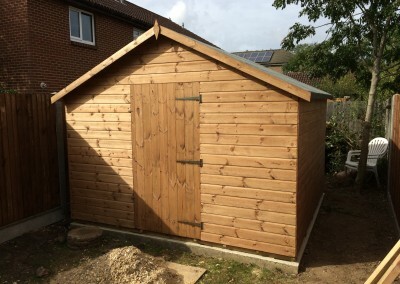 Every garden needs a practical, robust, good looking timber shed for storage and household maintenance jobs. 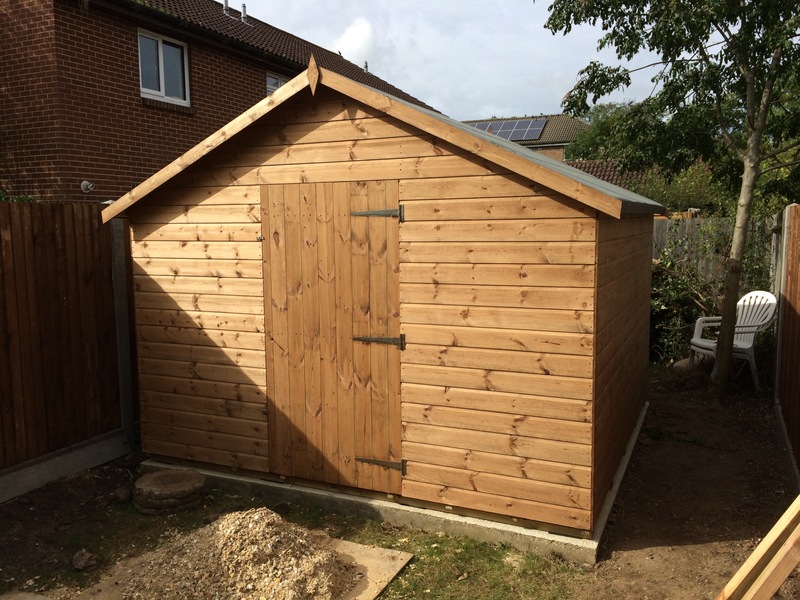 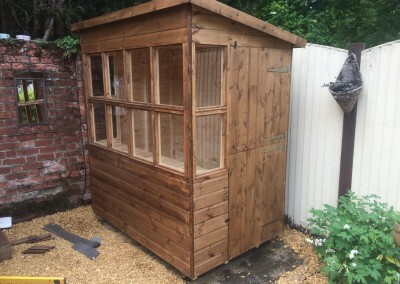 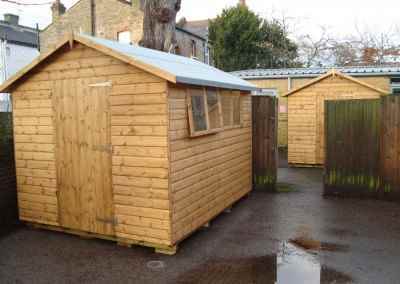 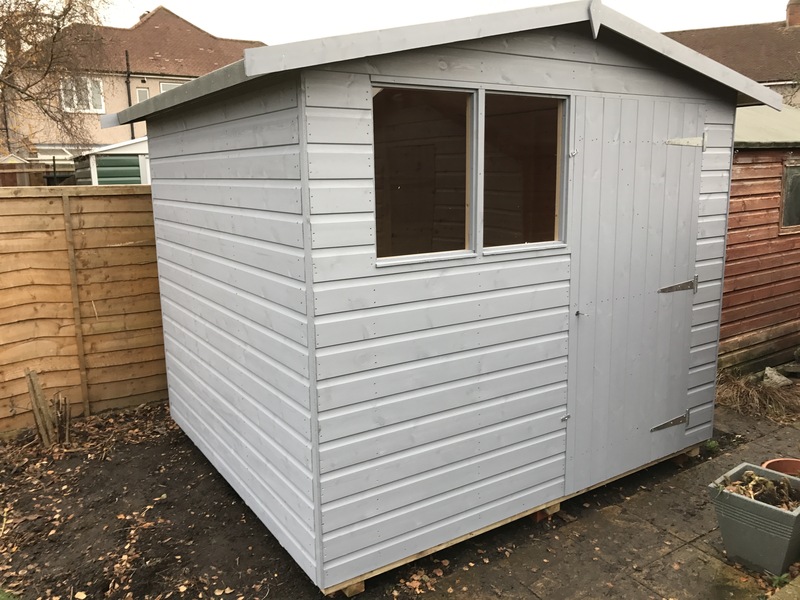 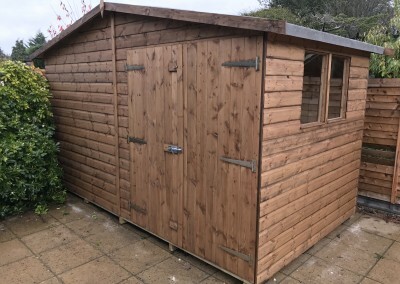 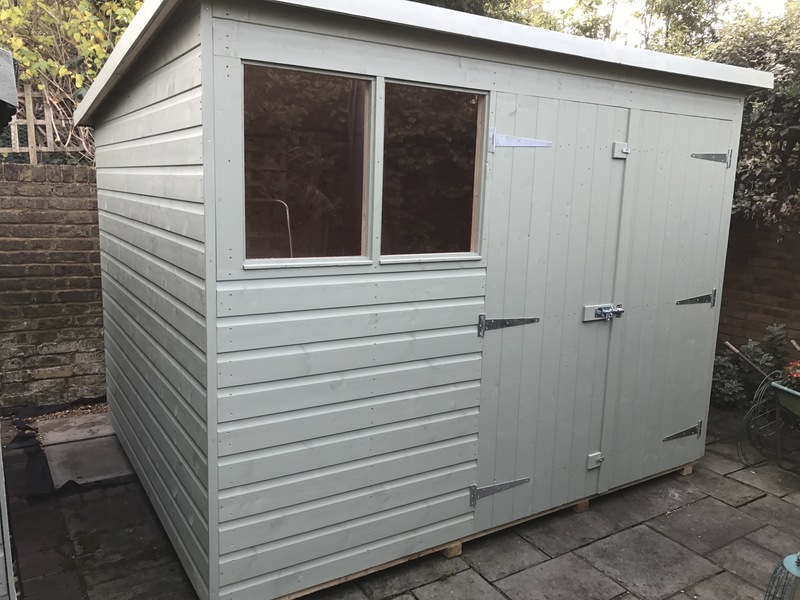 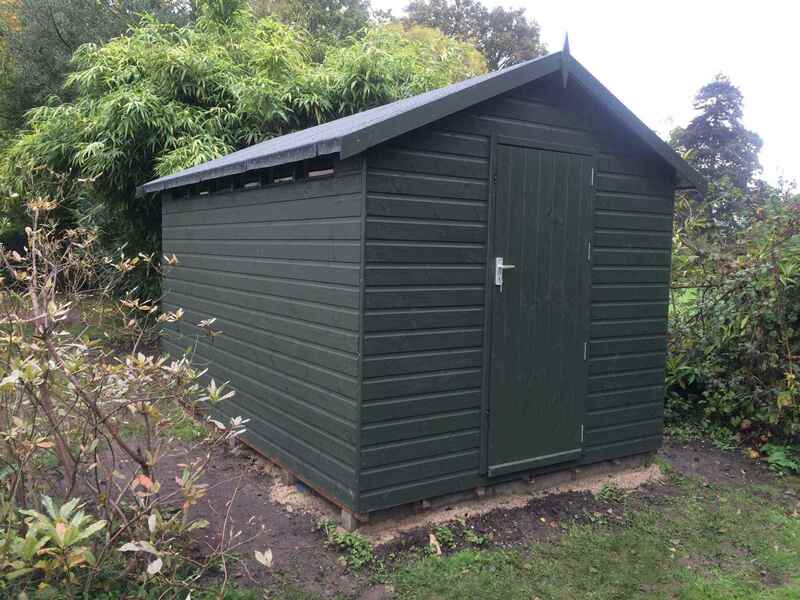 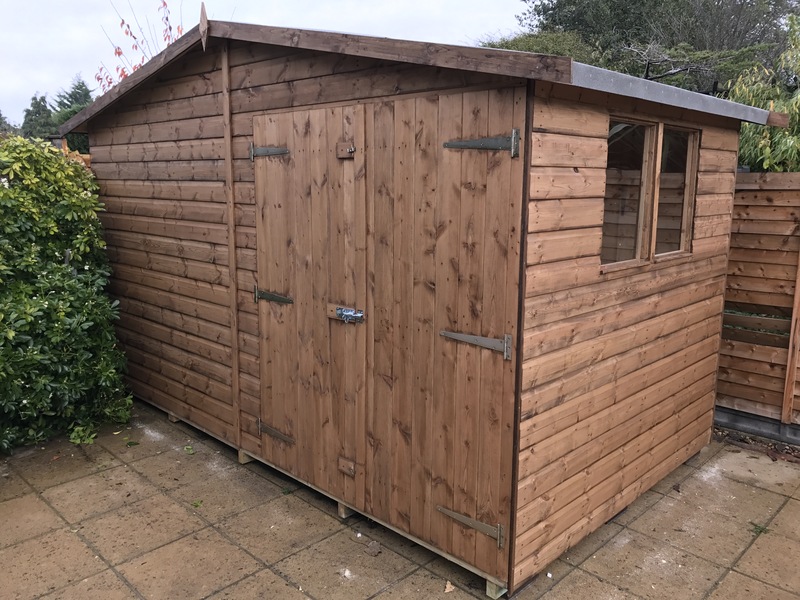 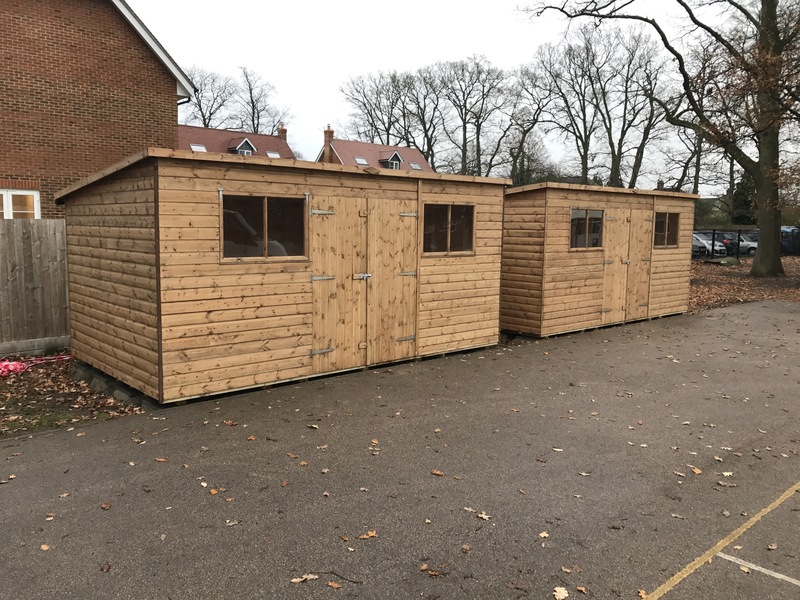 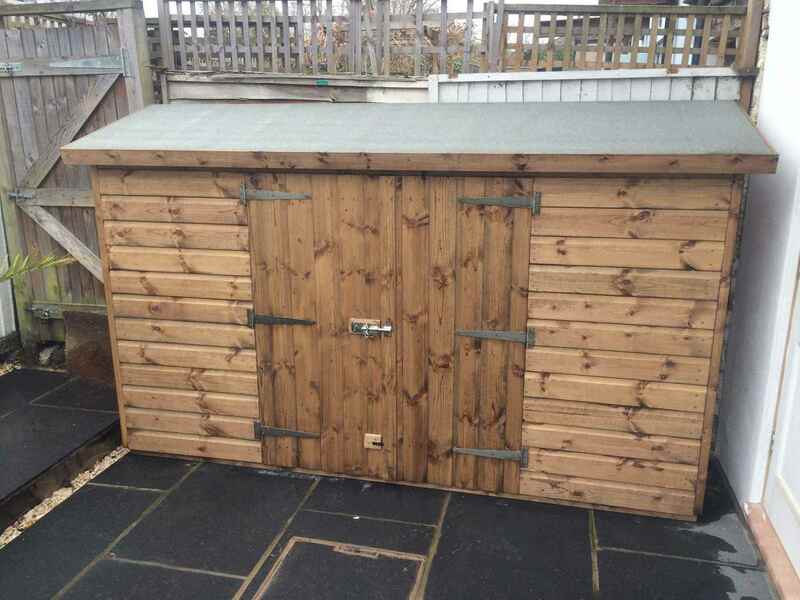 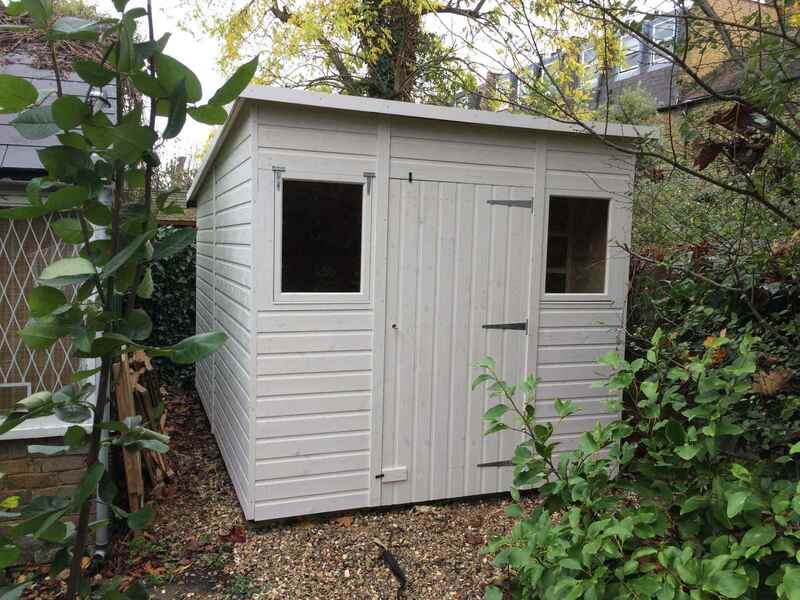 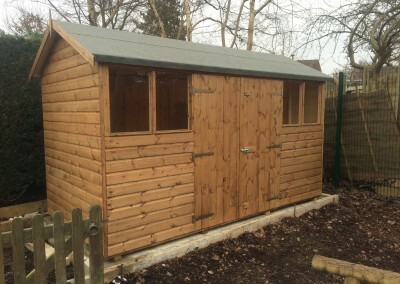 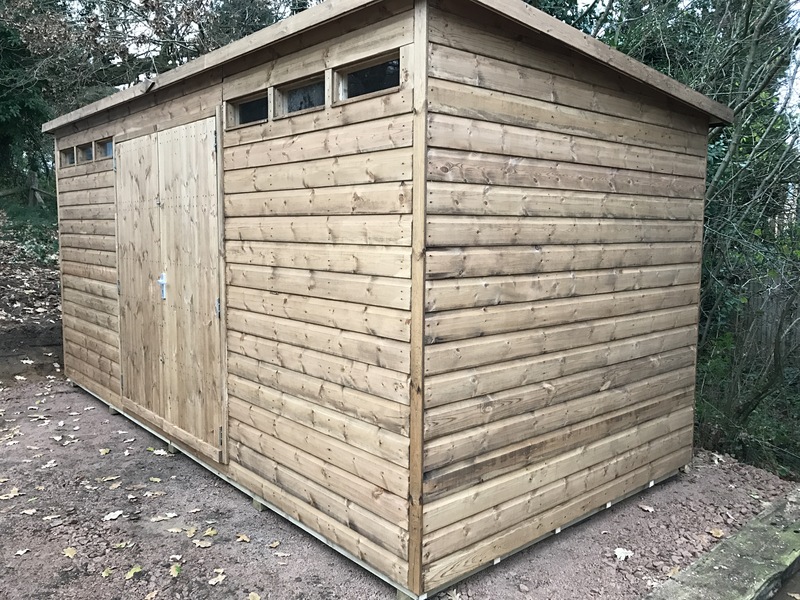 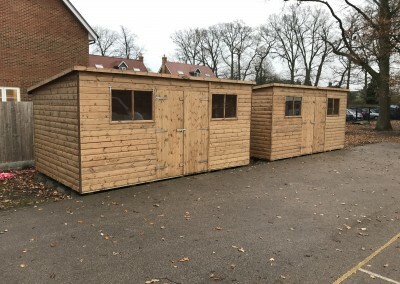 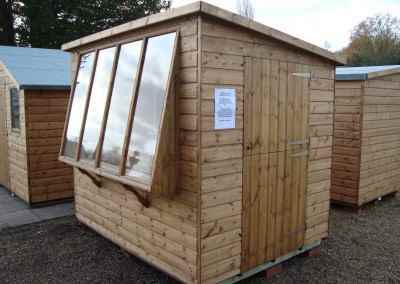 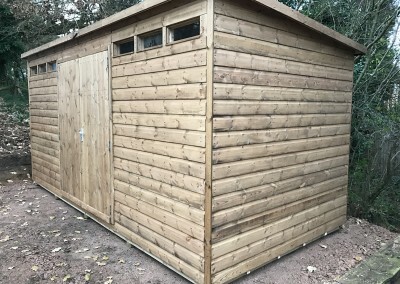 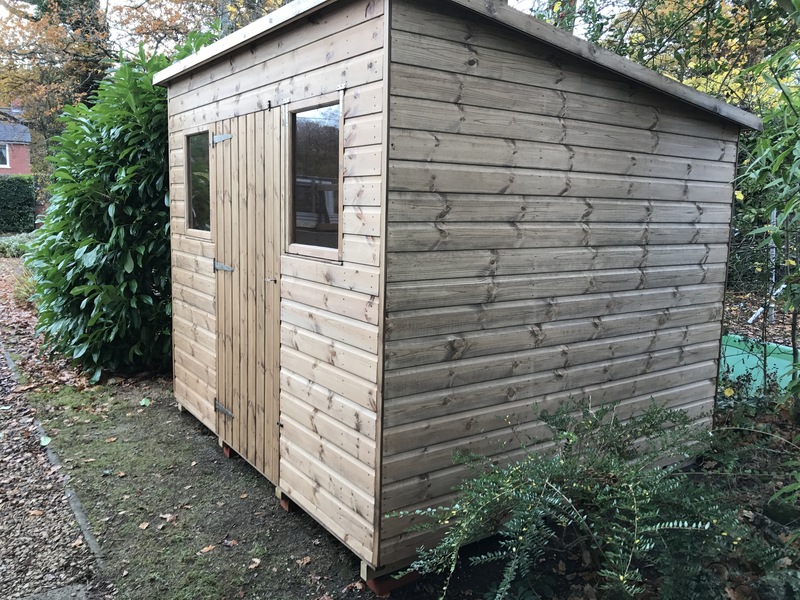 Since all gardens and all requirements aren’t the same, choose from our comprehensive range of Apex and Pent Sheds/Workshops manufactured to any size, style, shape and configuration to suit your own needs including lean-tos and odd shape buildings to fill up unusable space. 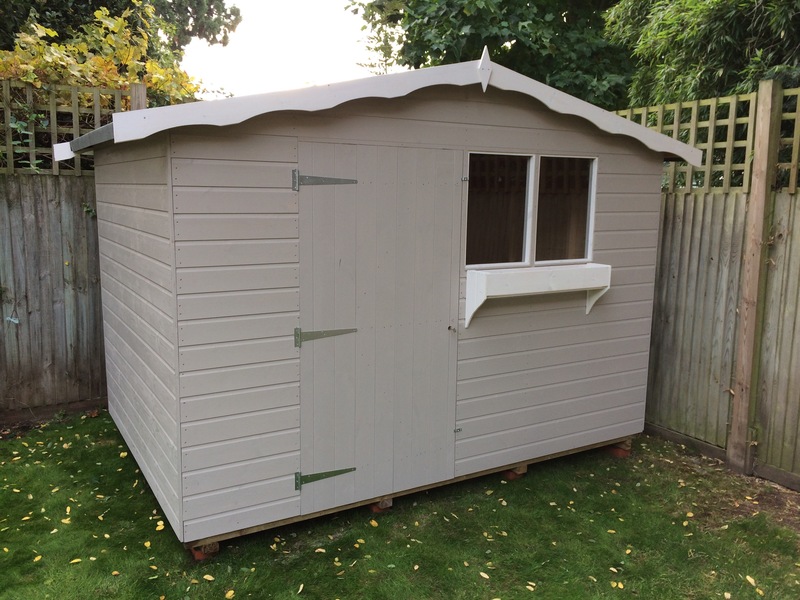 All sheds come fully tongue and grooved throughout. 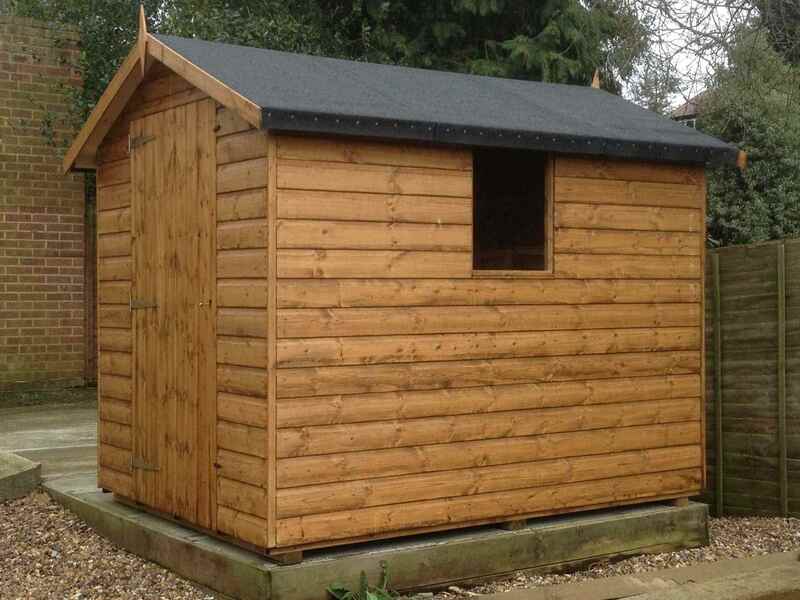 Value Apex 8×6 with Black Heavy Felt. 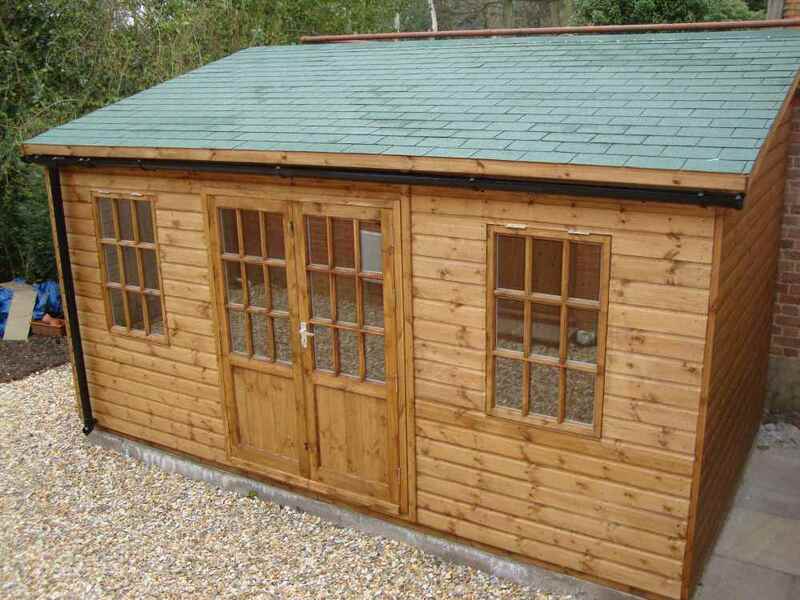 Super Apex 11×7 with Green Felt Tiles. 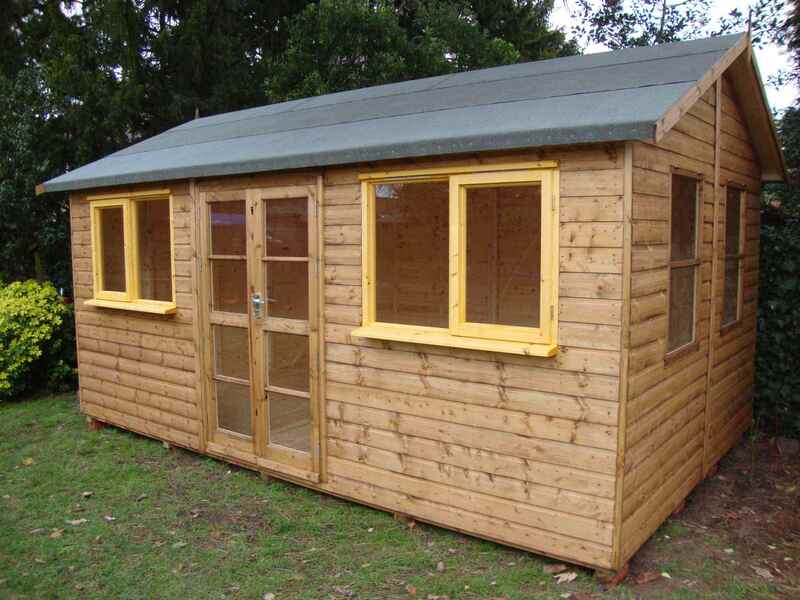 Super Apex 16×8 with No Windows. Deluxe Apex 7×5 with Painted Finish and Guttering. 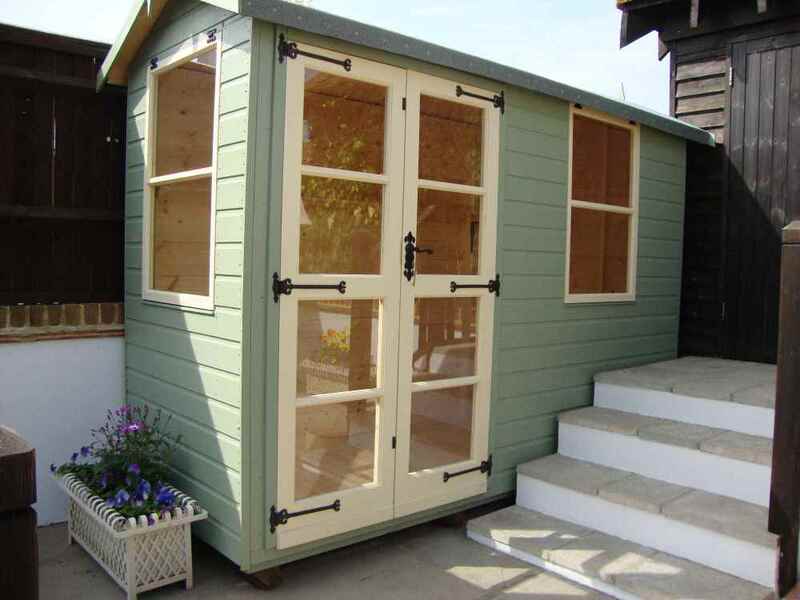 Deluxe Apex 8×8 with Double richmond doors, heavy felt and with painted finish. 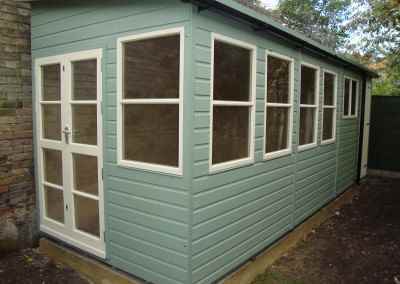 Deluxe Apex 9×7 with Sash Windows and matching Bespoke Door. 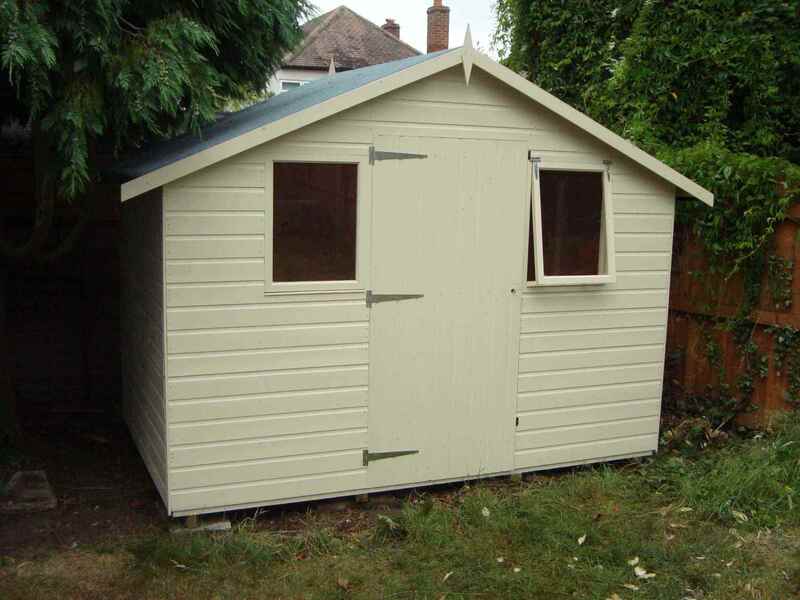 Deluxe Apex 10×6, Extra Height and Painted Finish. 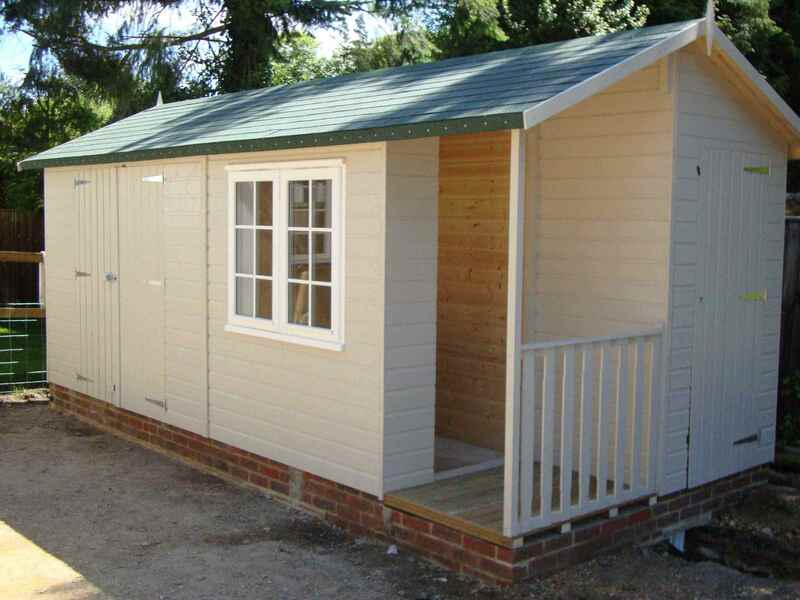 Deluxe Apex 11×7 Plus 2’6_ Verandah with Richmond Doors and Painted Finish. 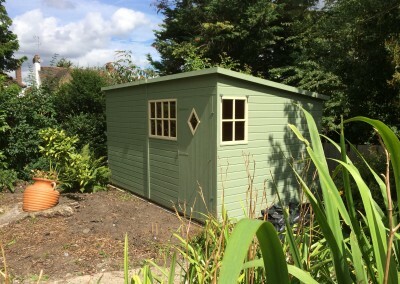 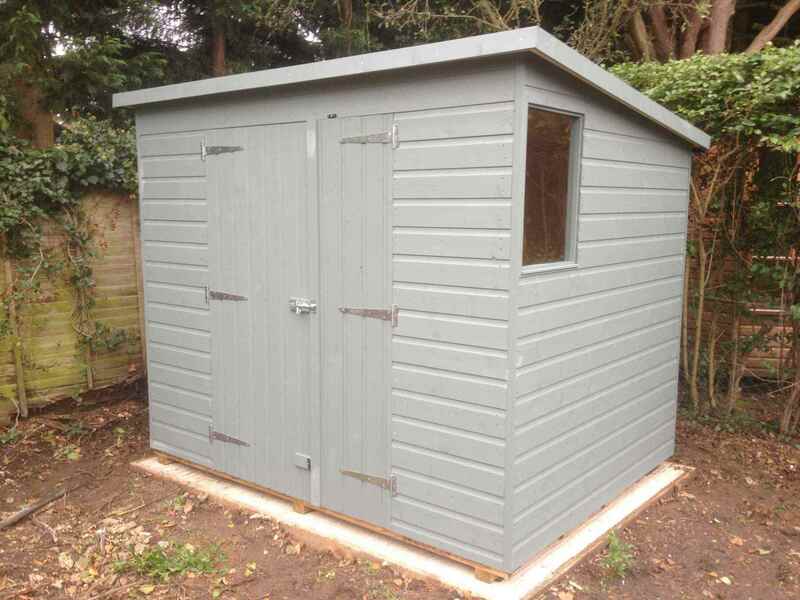 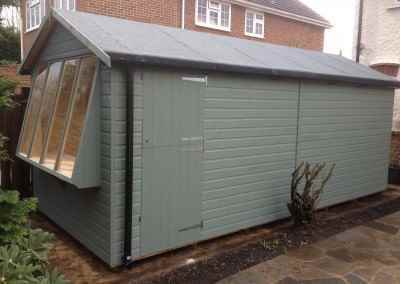 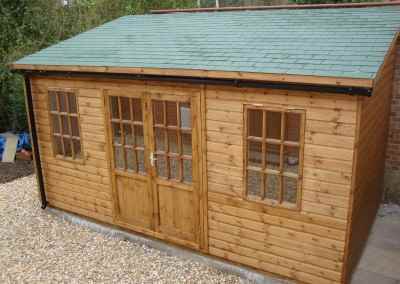 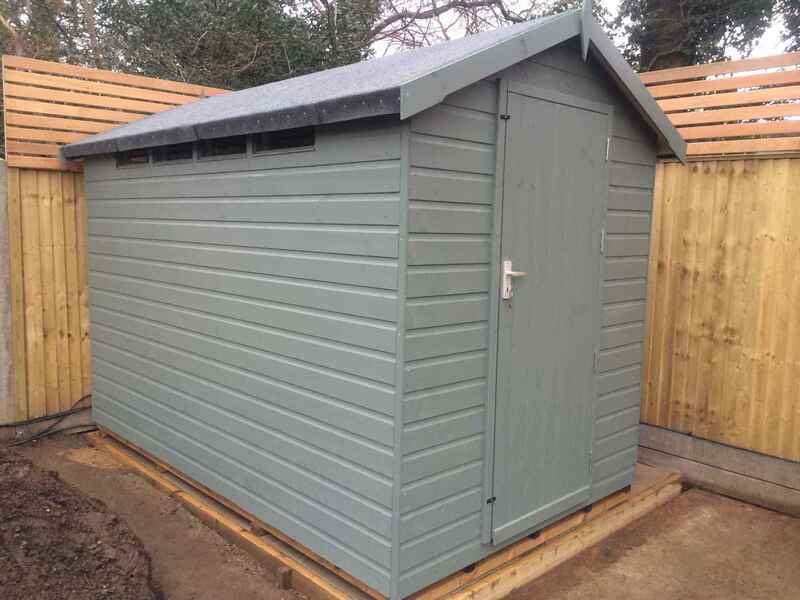 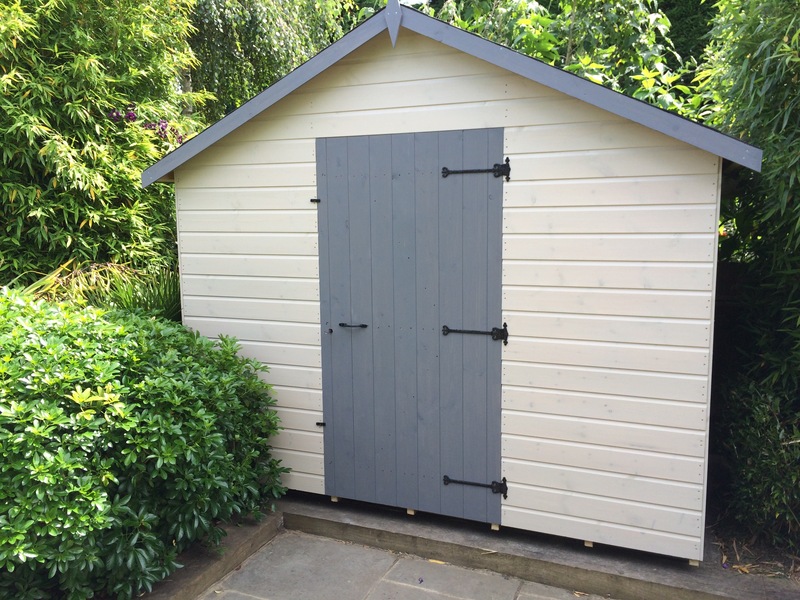 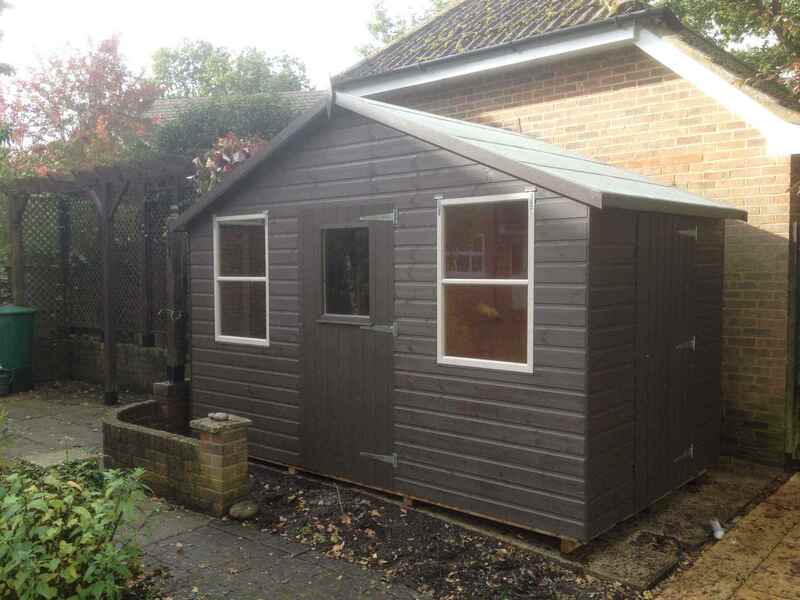 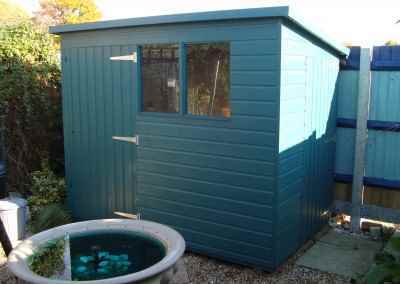 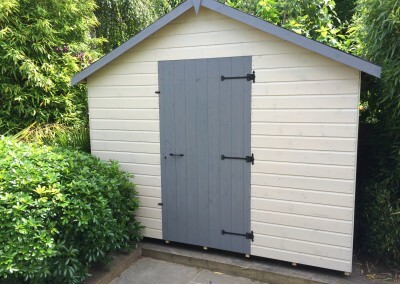 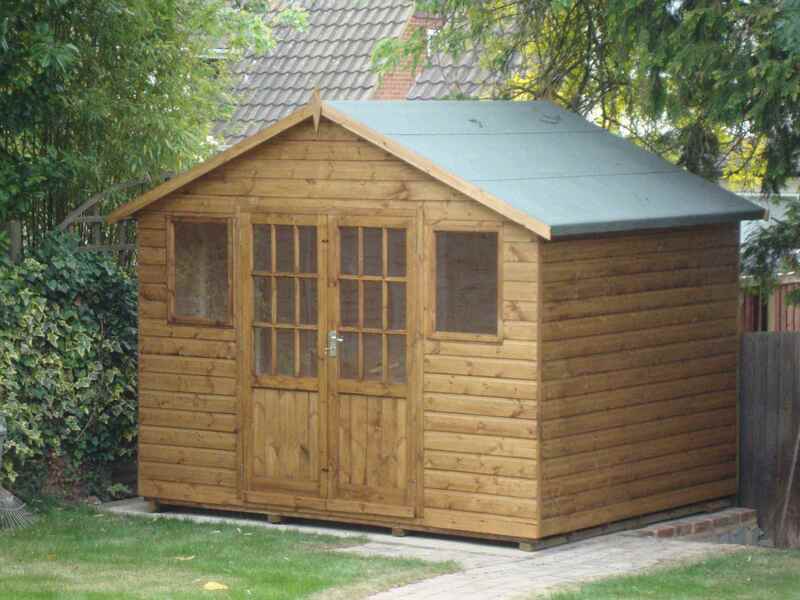 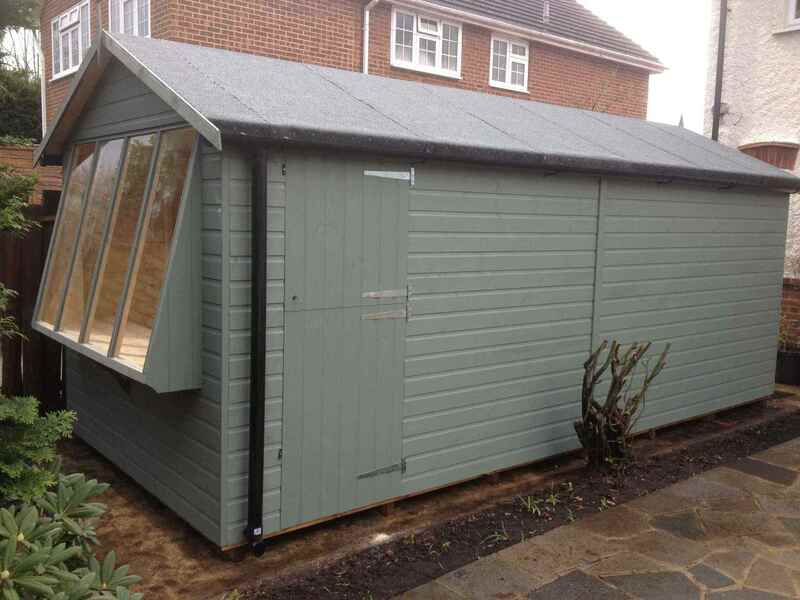 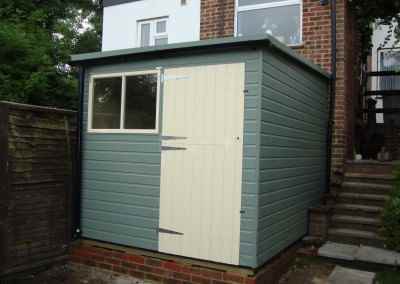 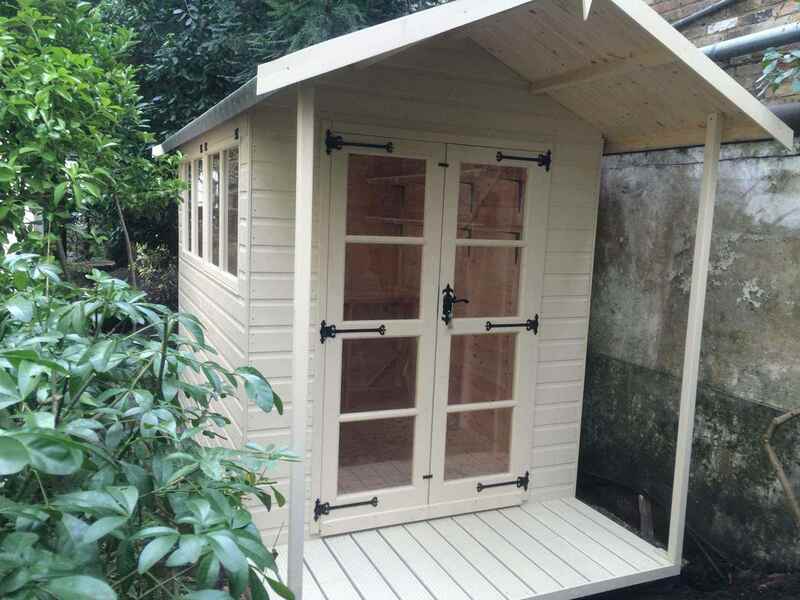 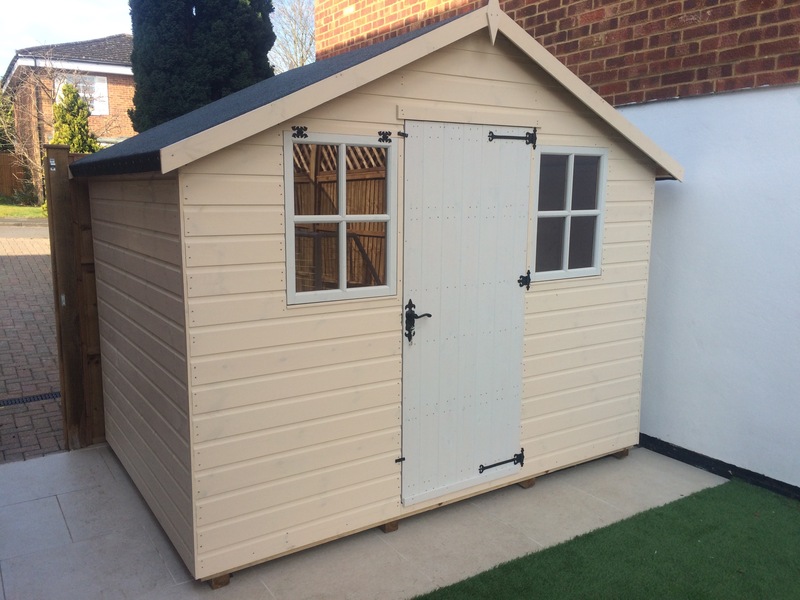 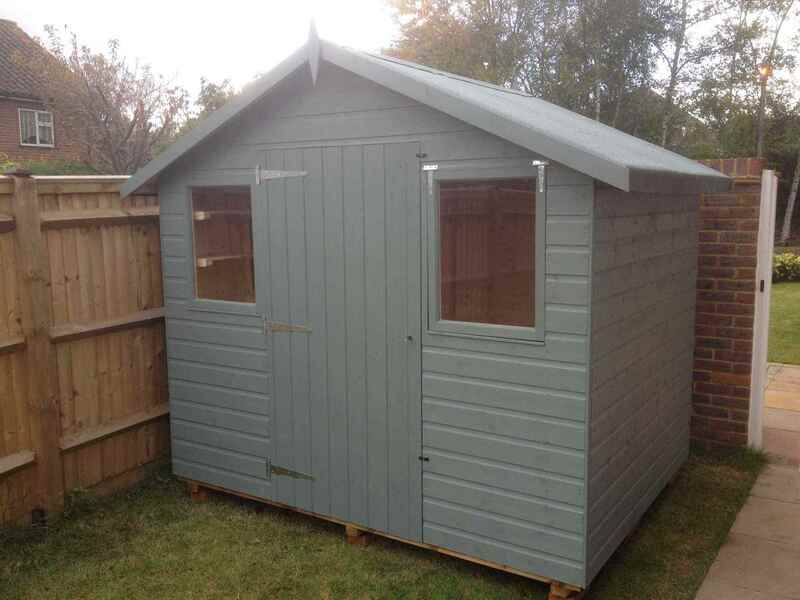 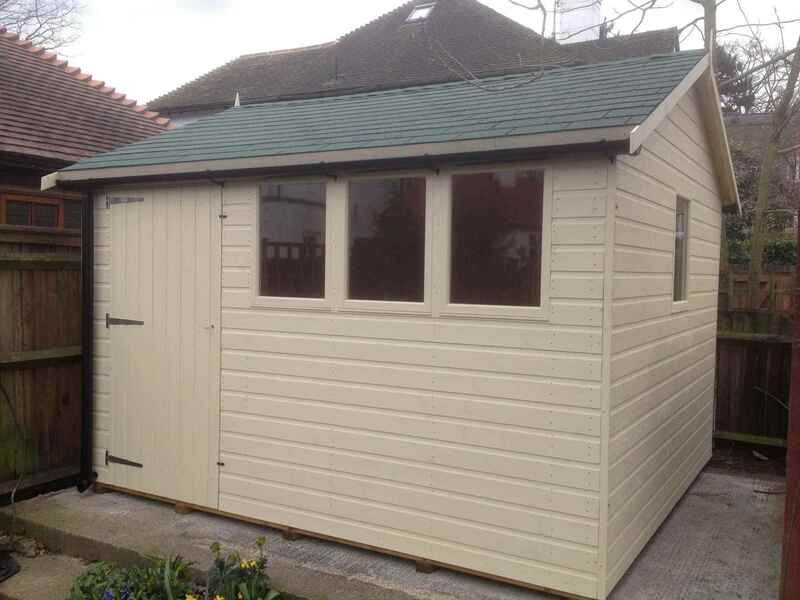 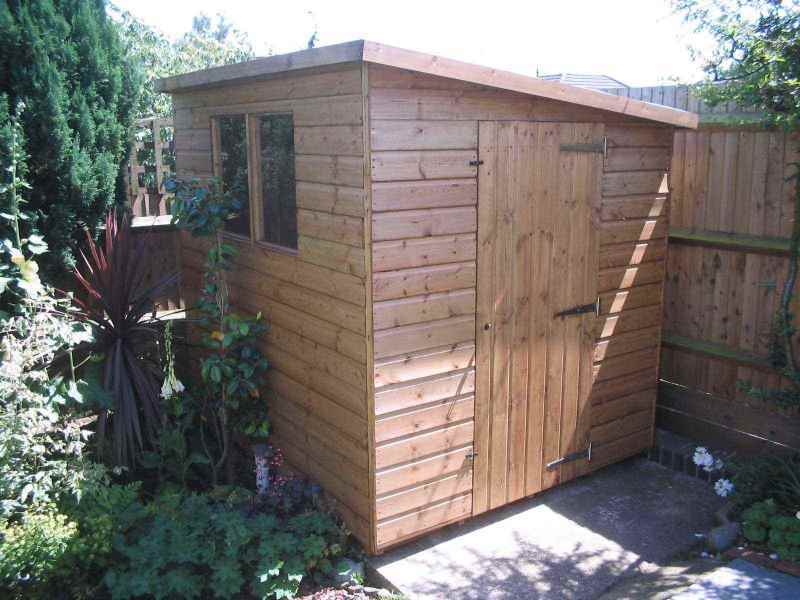 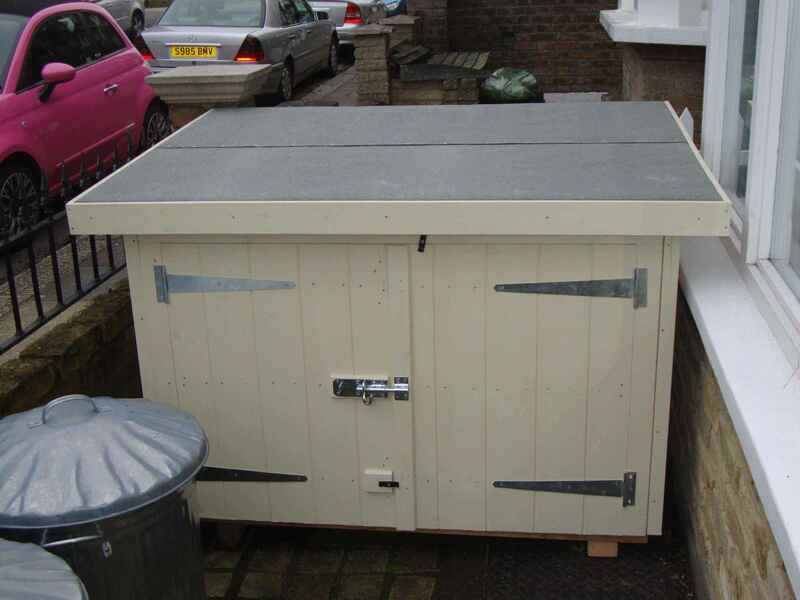 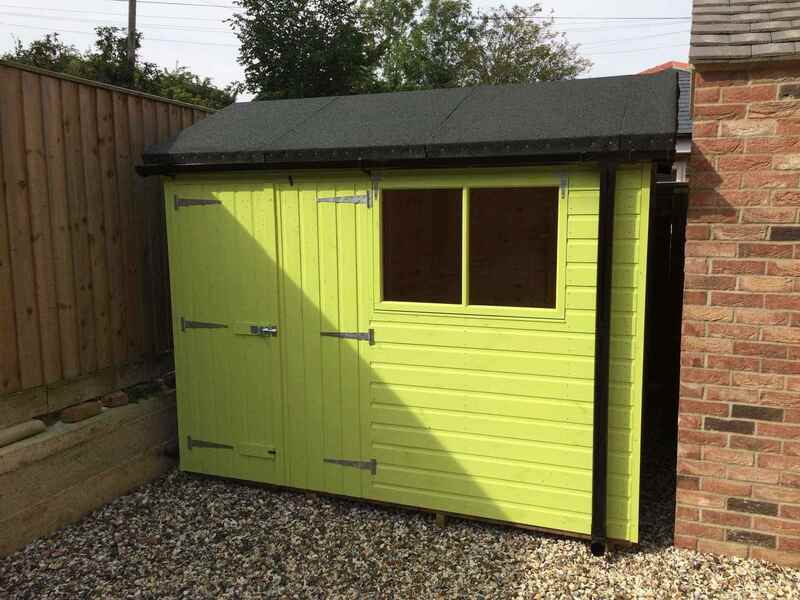 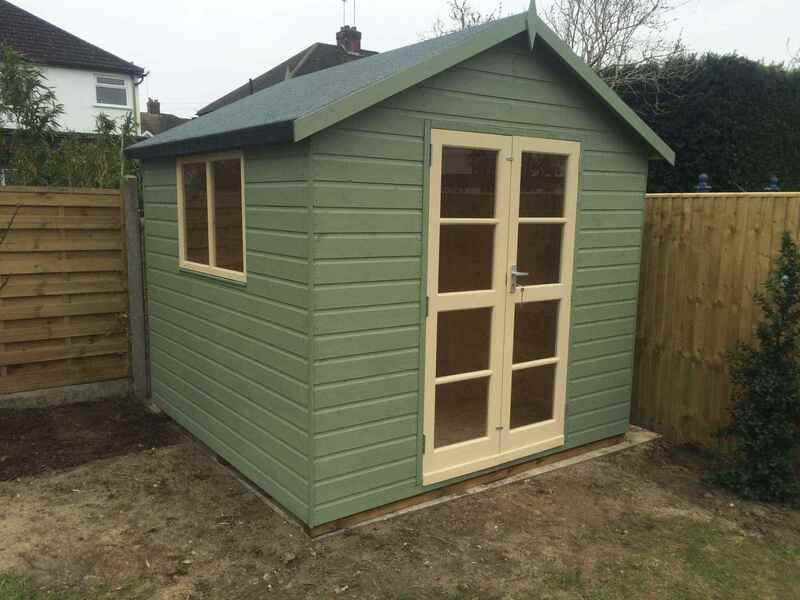 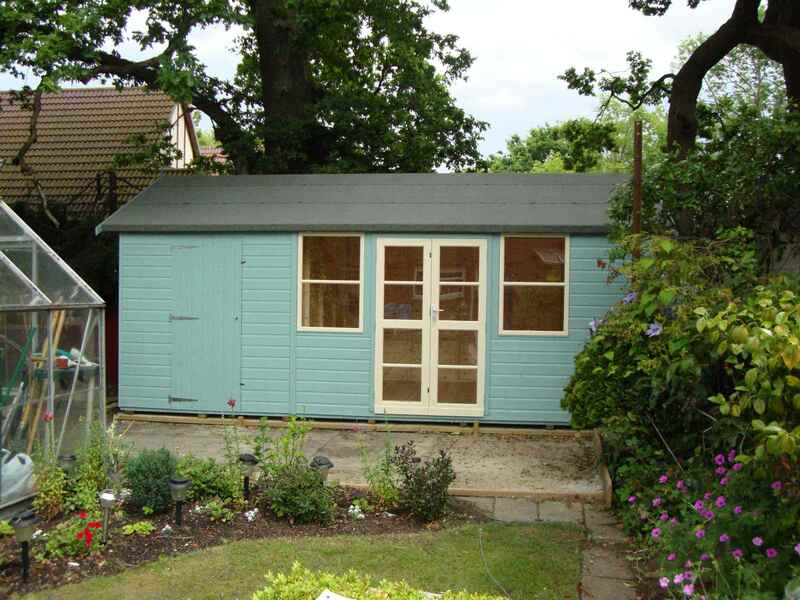 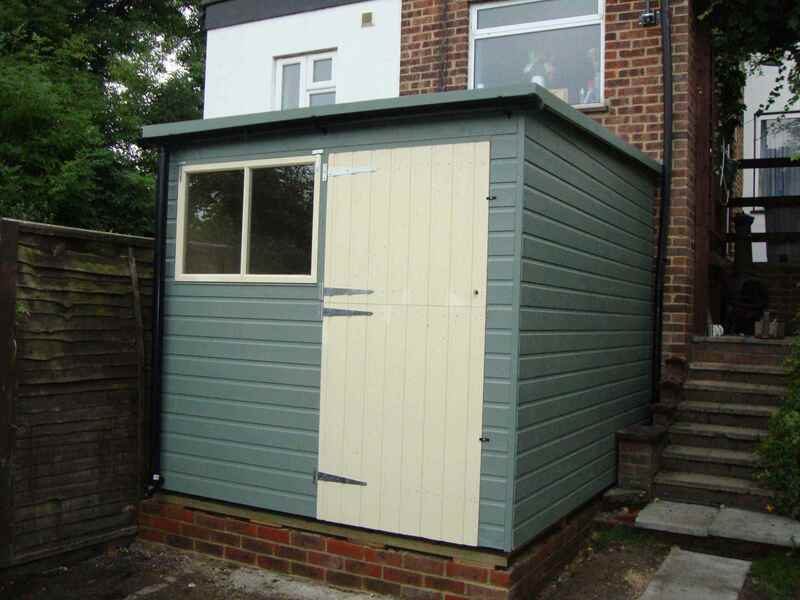 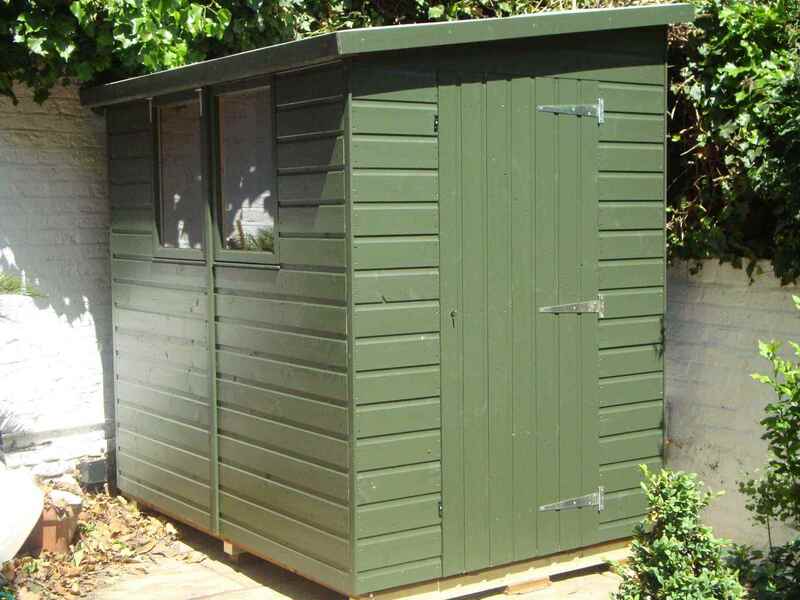 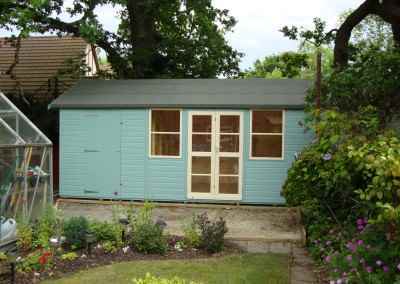 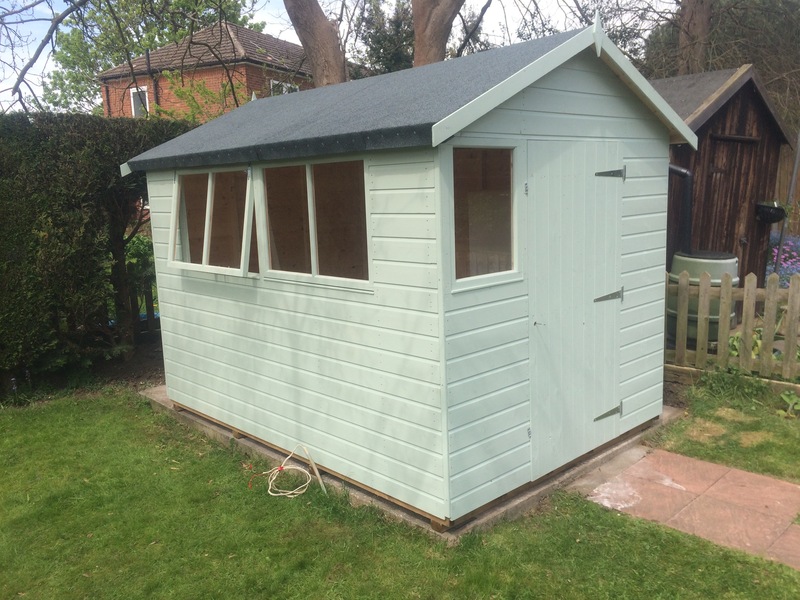 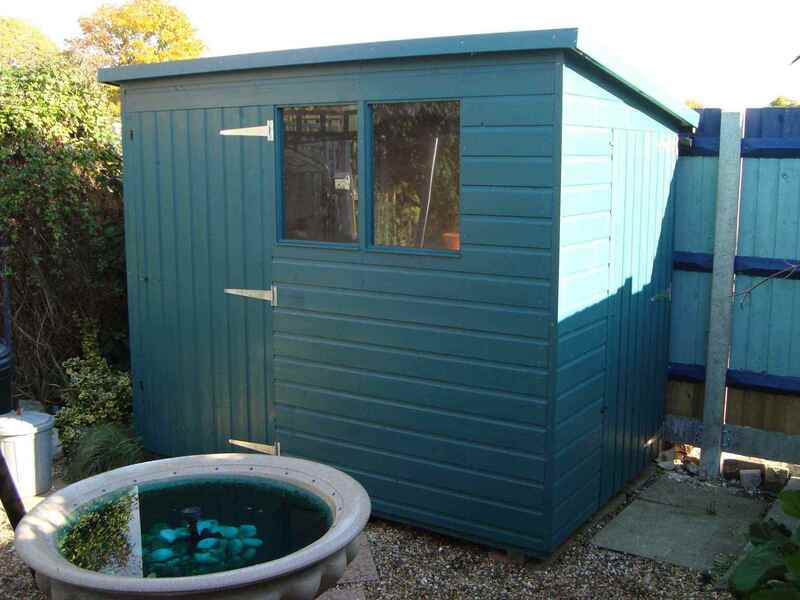 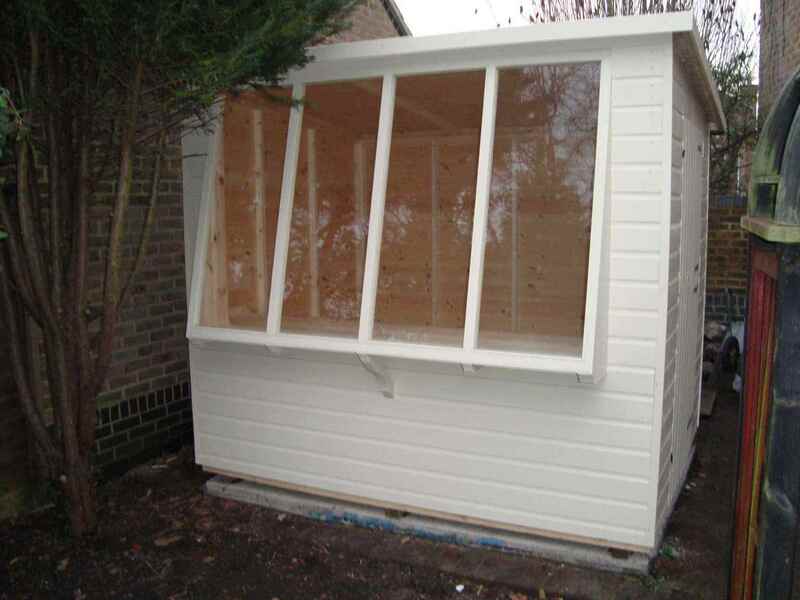 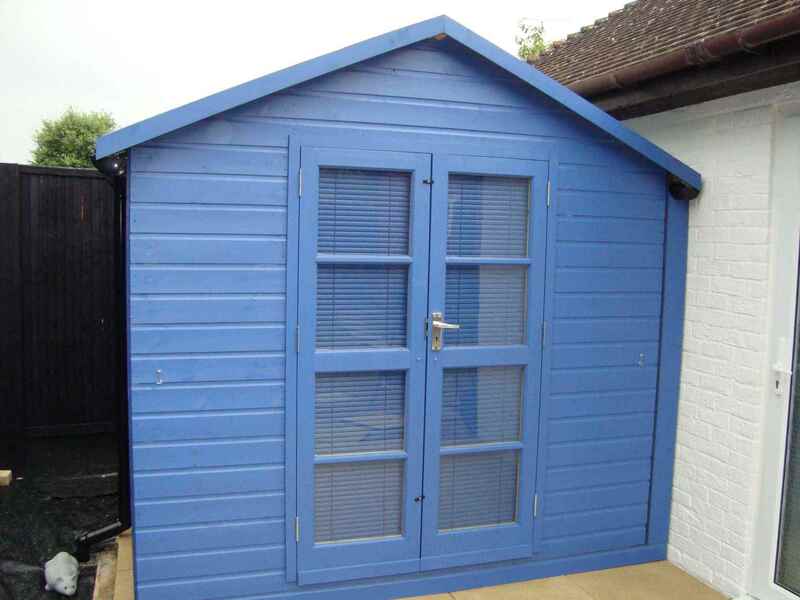 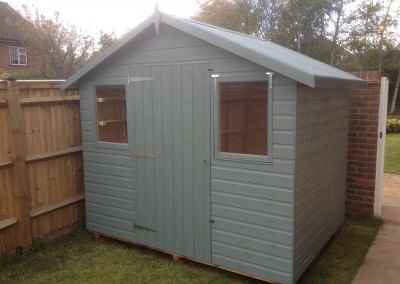 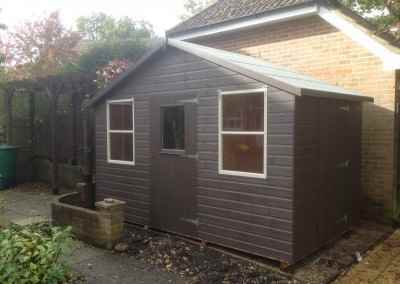 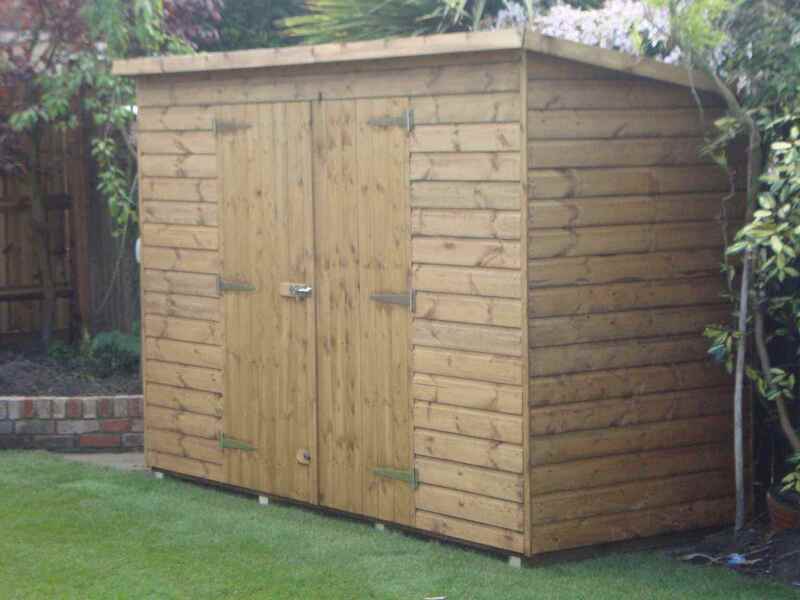 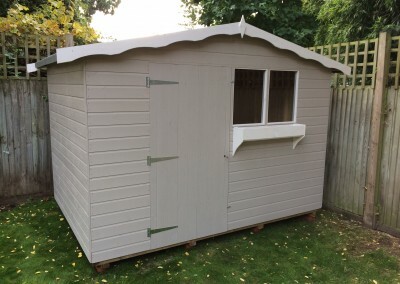 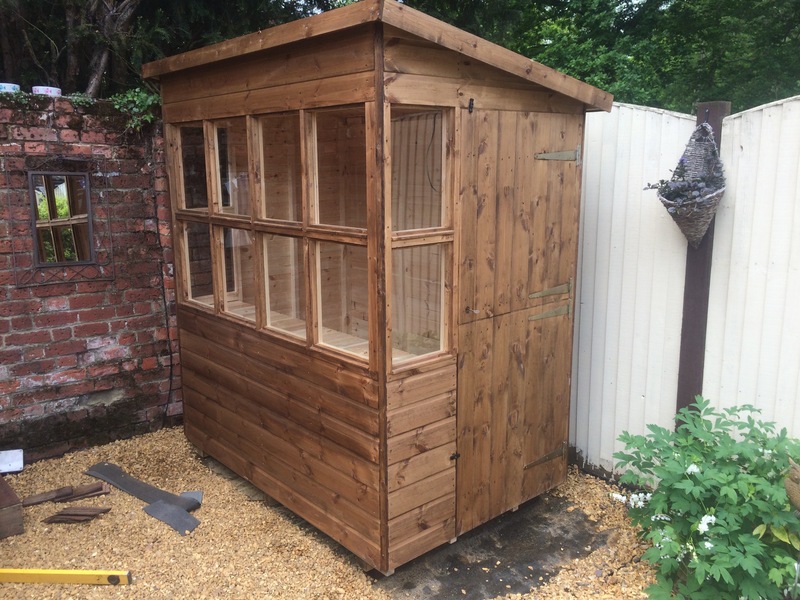 Deluxe Apex 11×7 with heavy Felt, Guttering, Double Doors and Painted Finish. 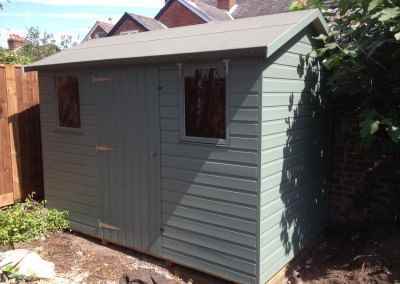 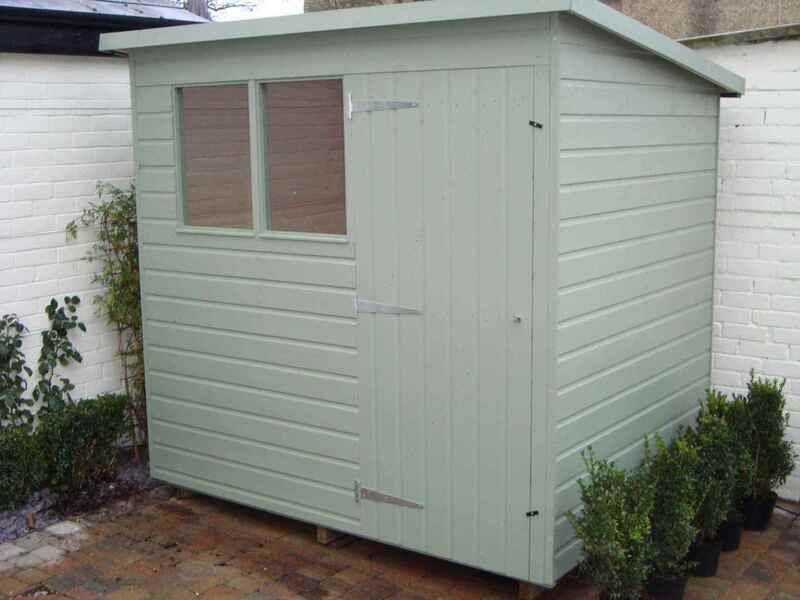 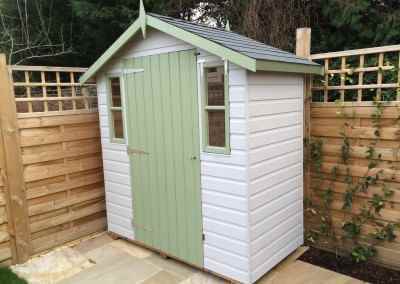 Deluxe Apex 11×9 with Green Felt Tiles, Guttering and Painted Finish. 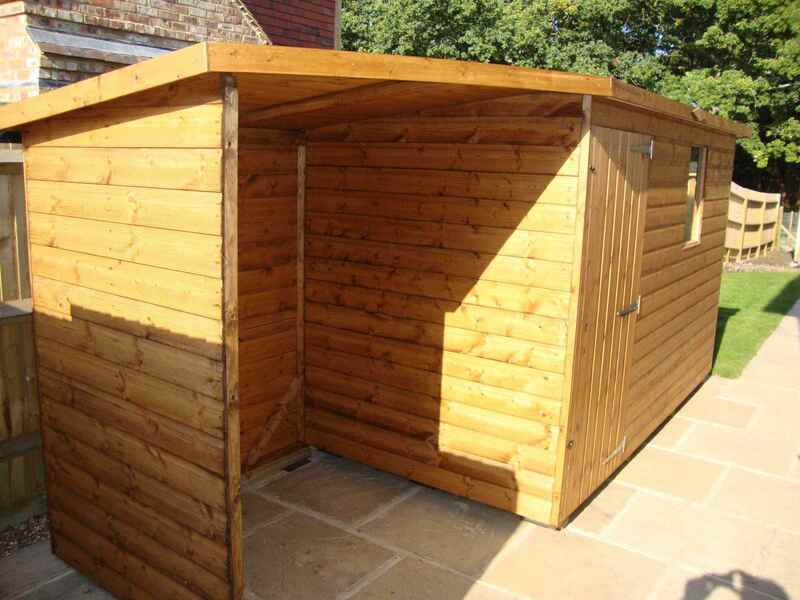 Deluxe Apex 12×8 with Extra Height and Heavy Felt. 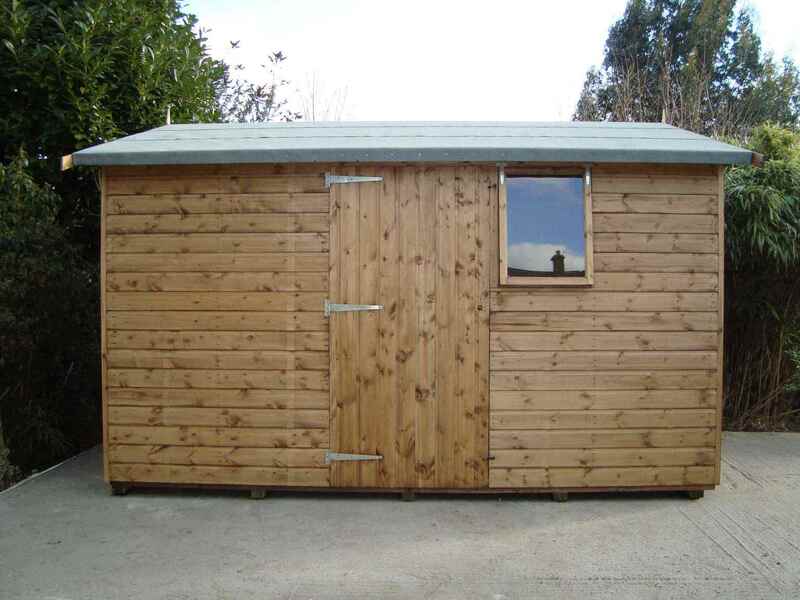 Deluxe Apex 12×10 with Double Doors and No Floor. 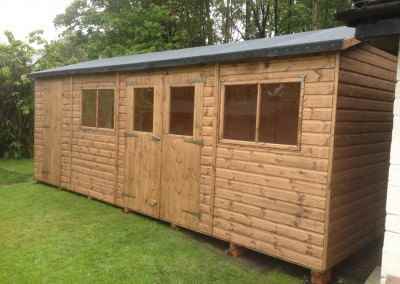 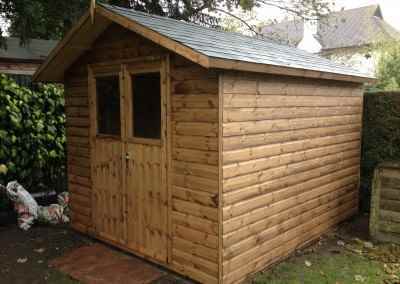 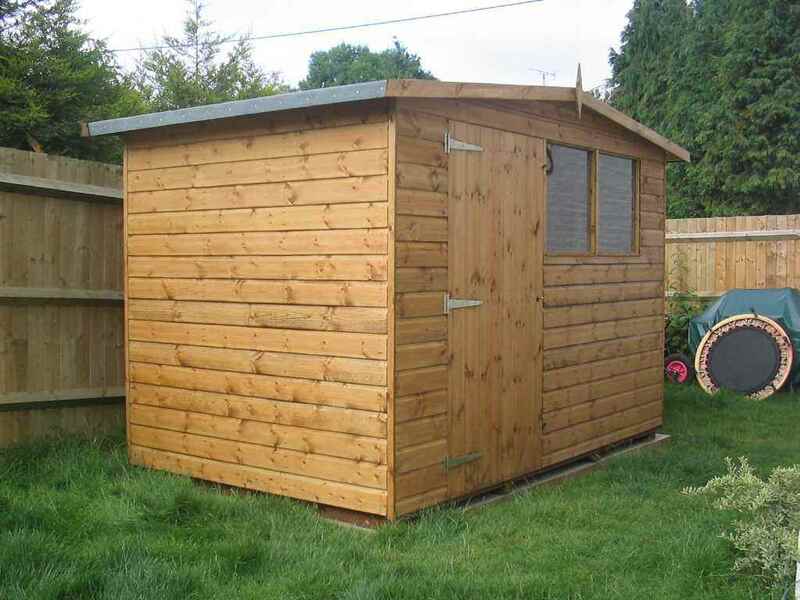 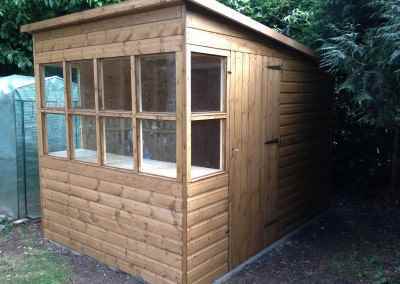 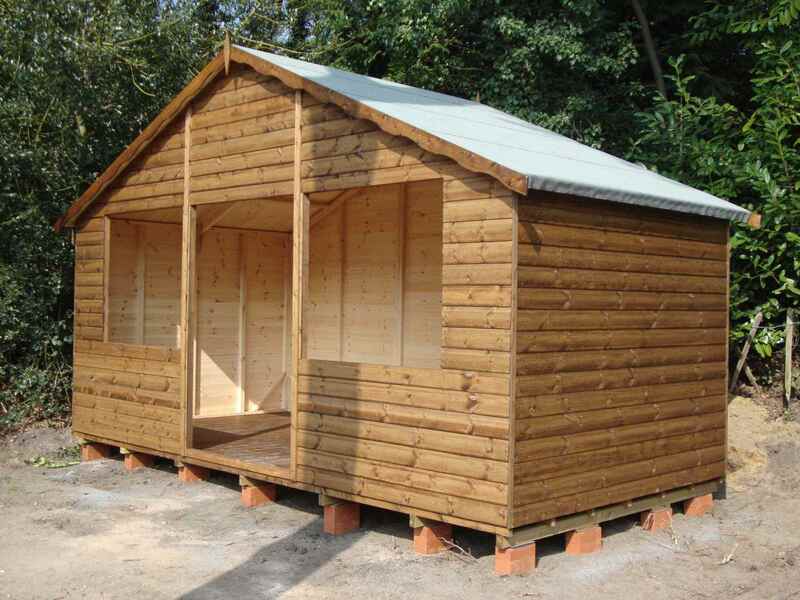 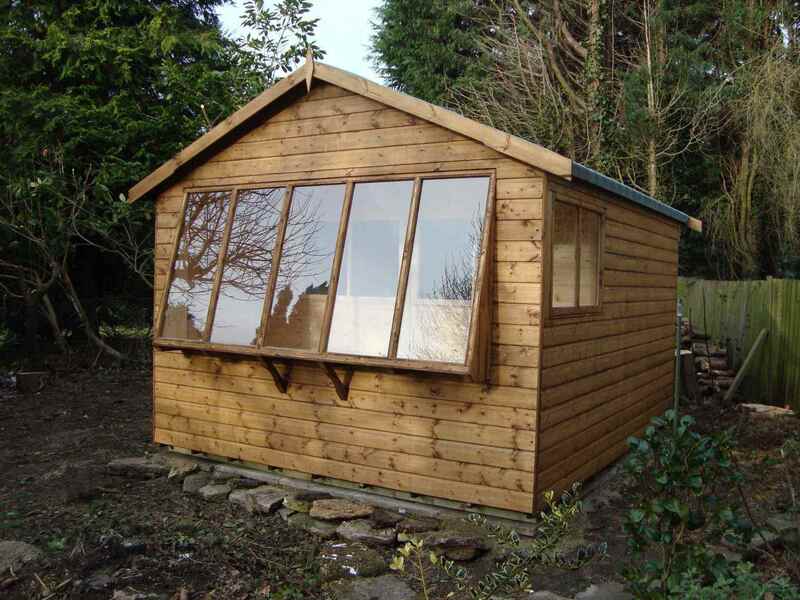 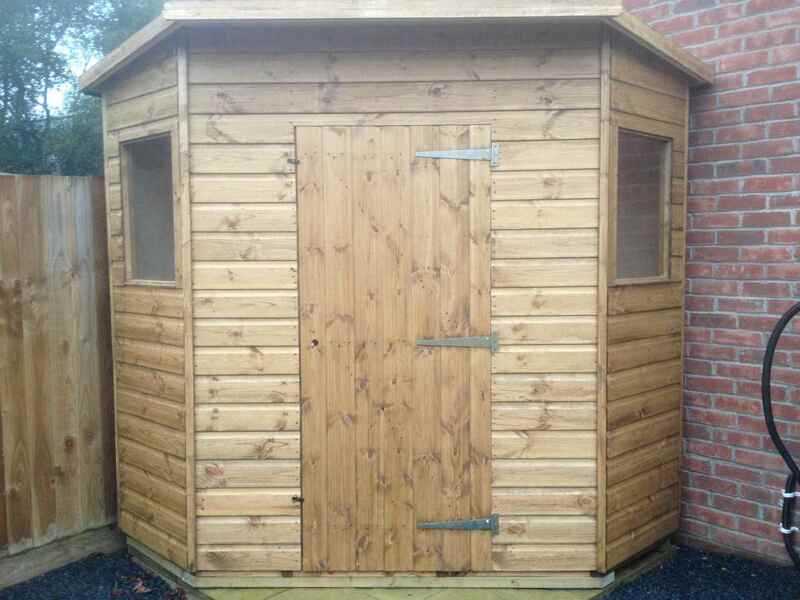 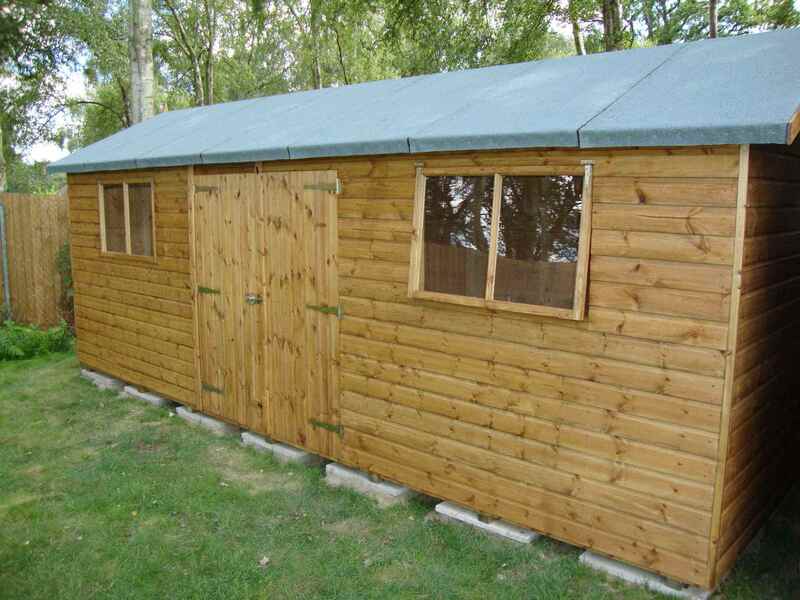 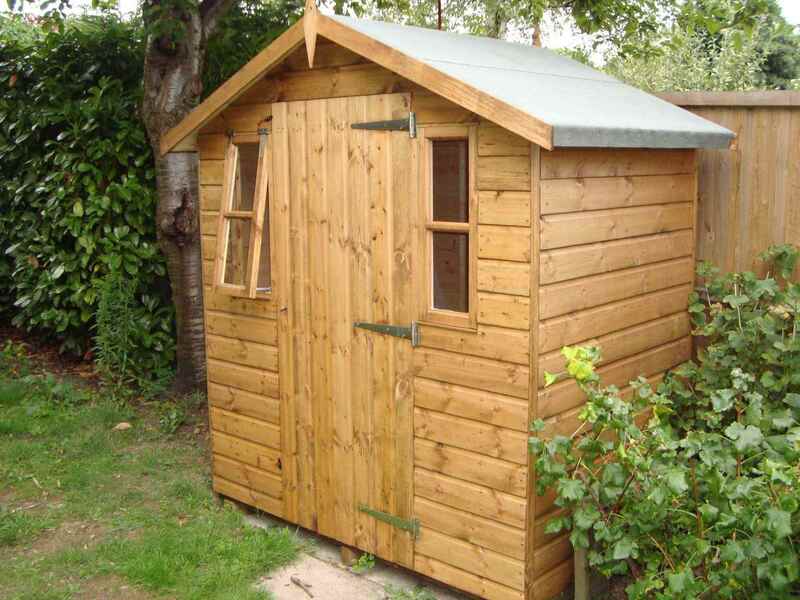 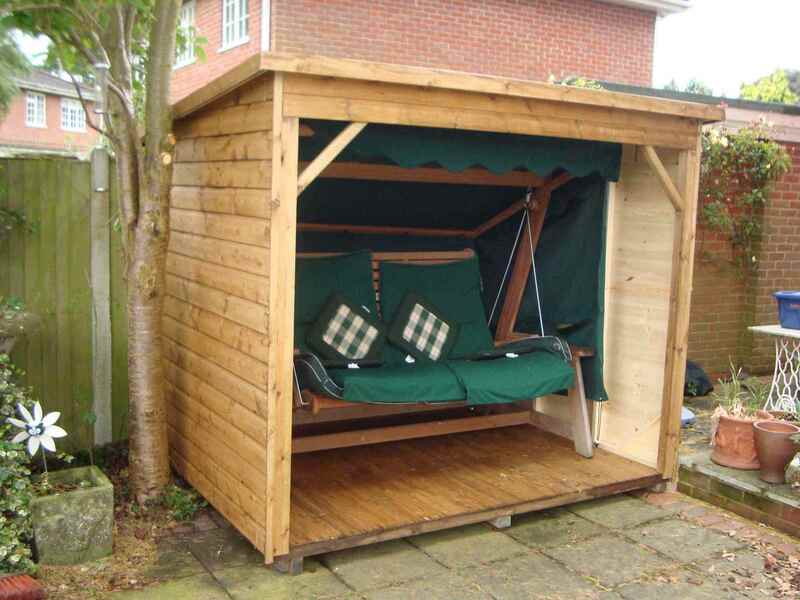 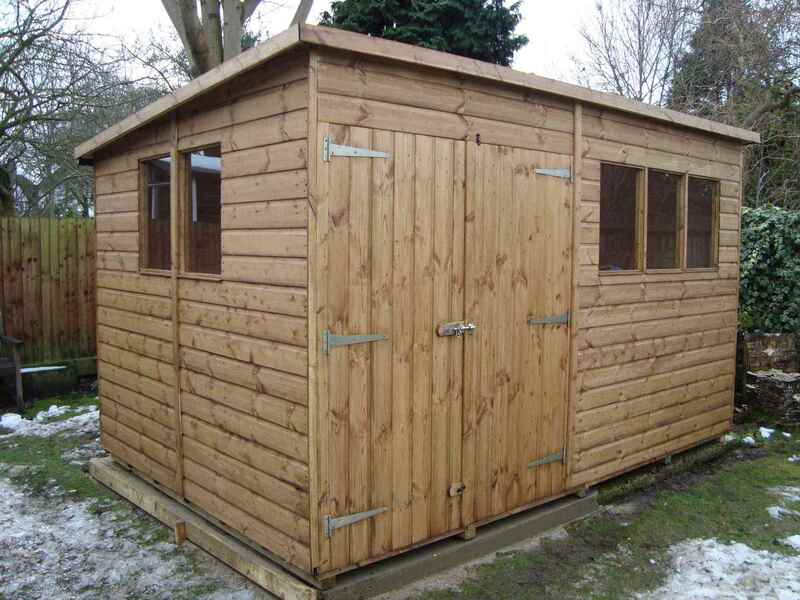 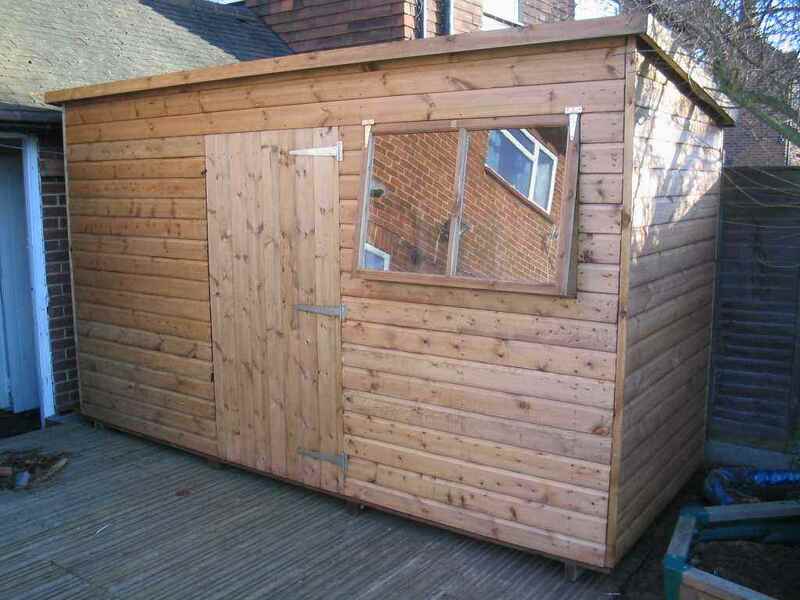 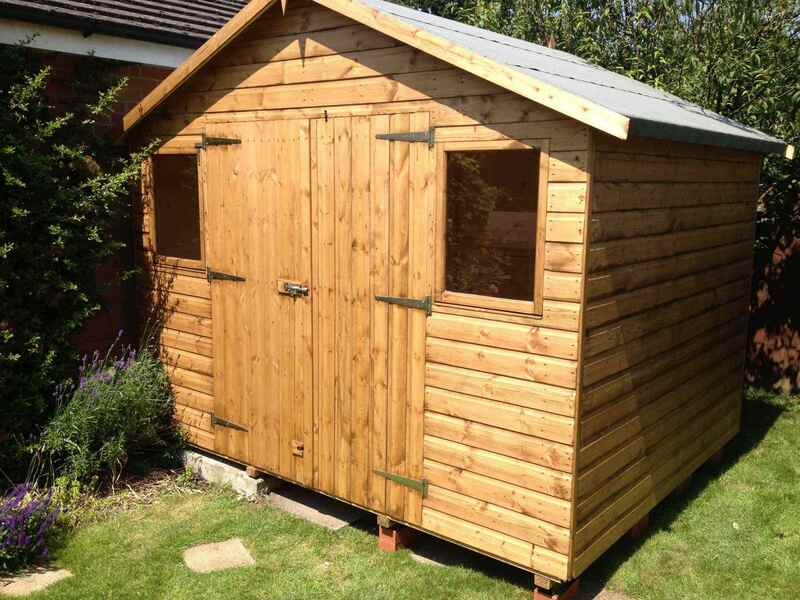 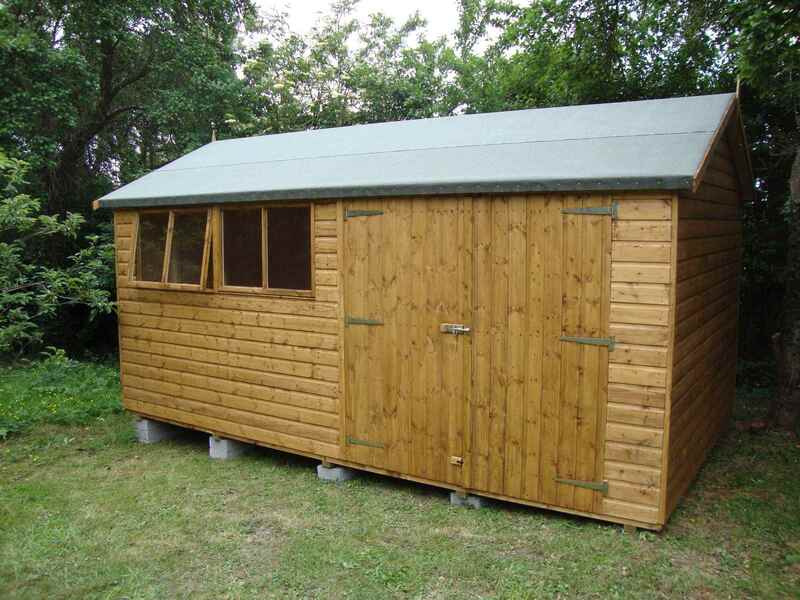 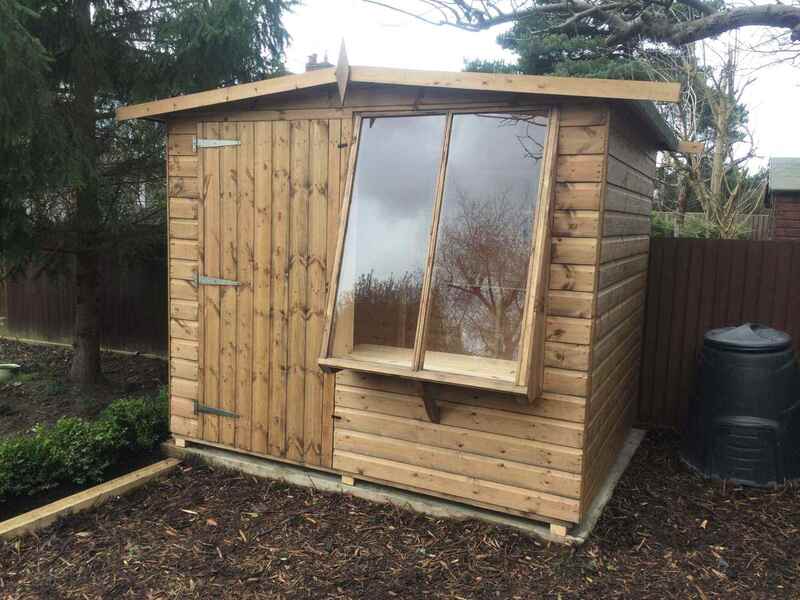 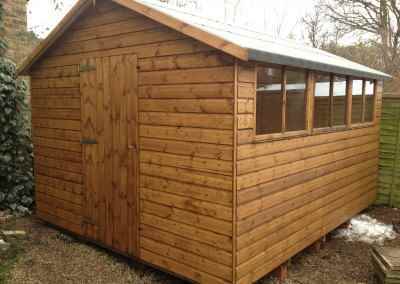 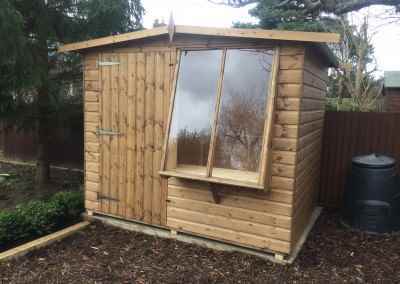 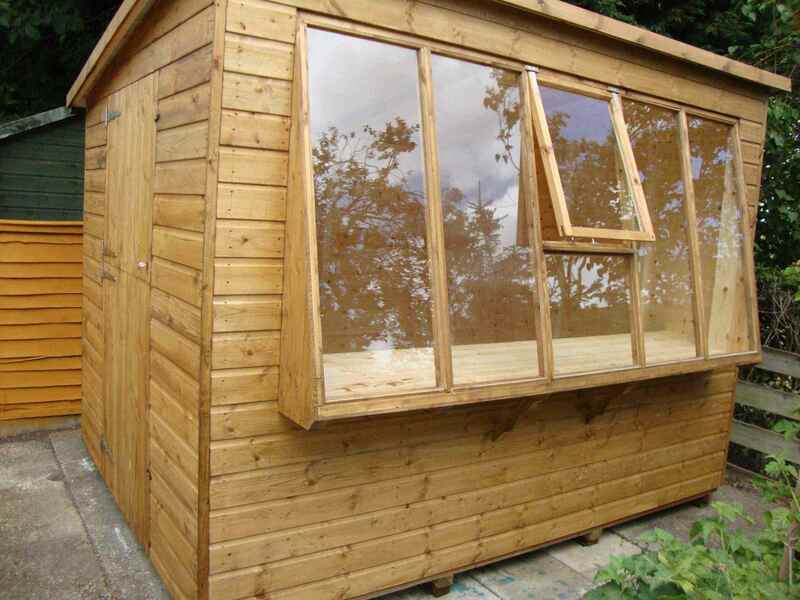 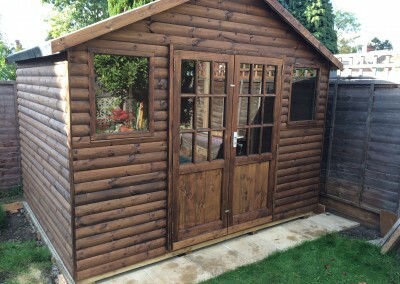 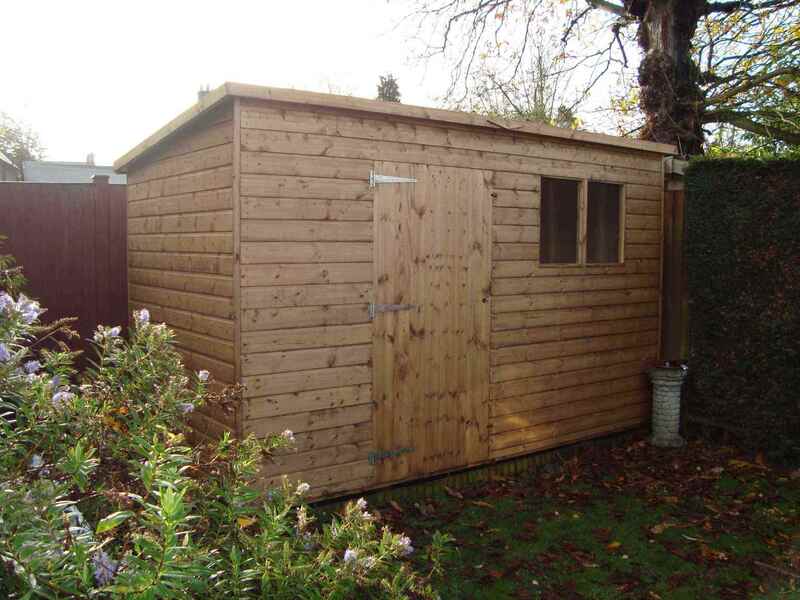 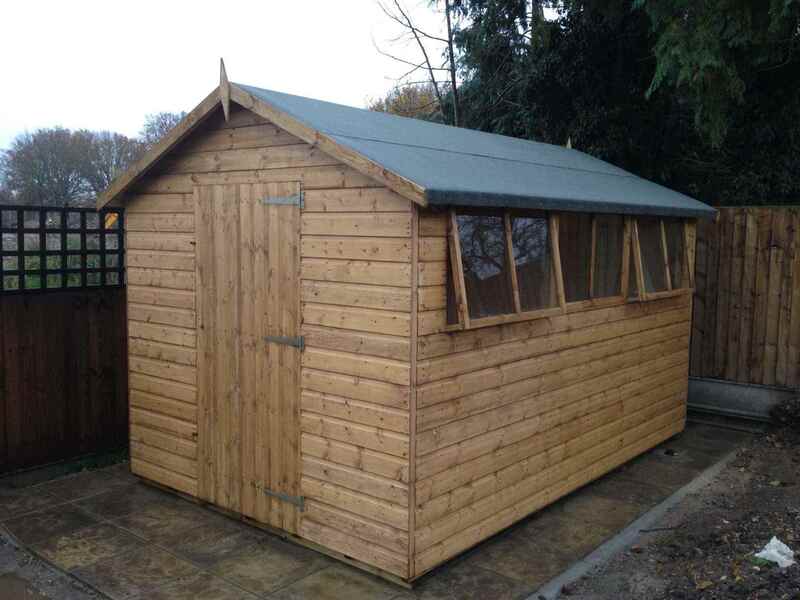 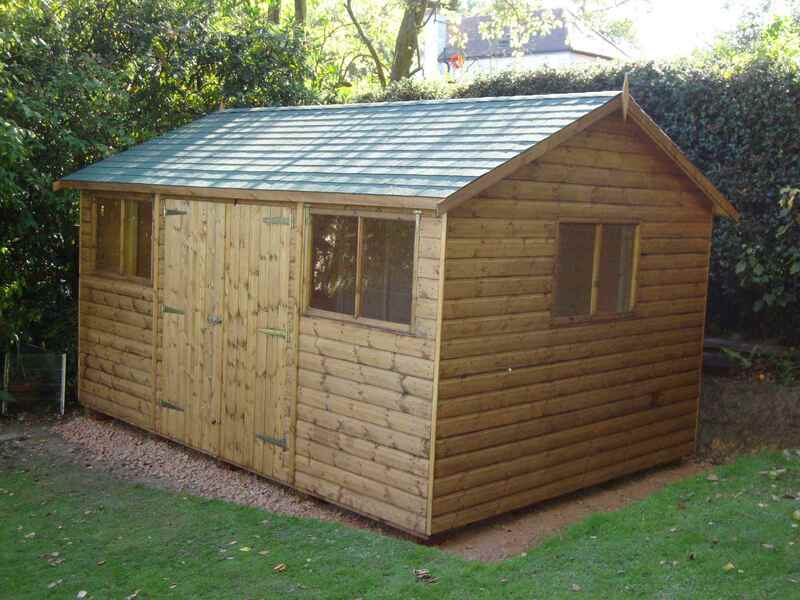 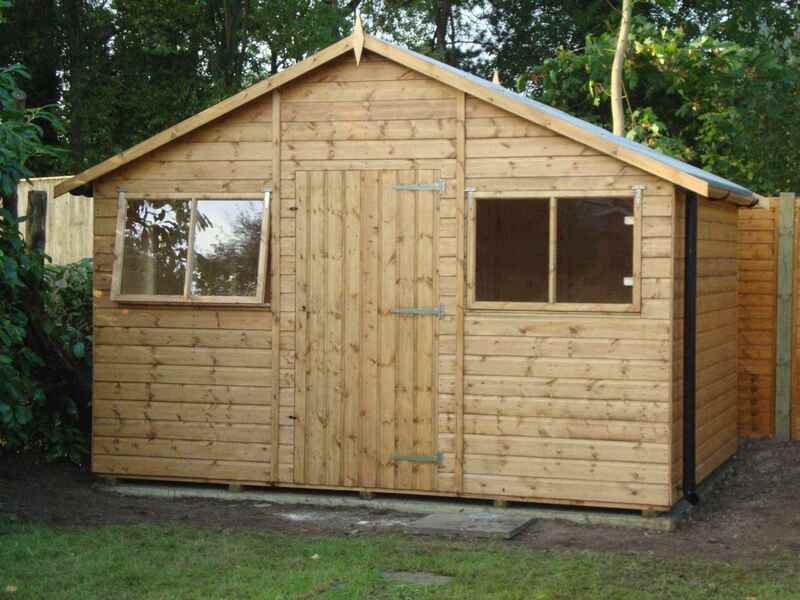 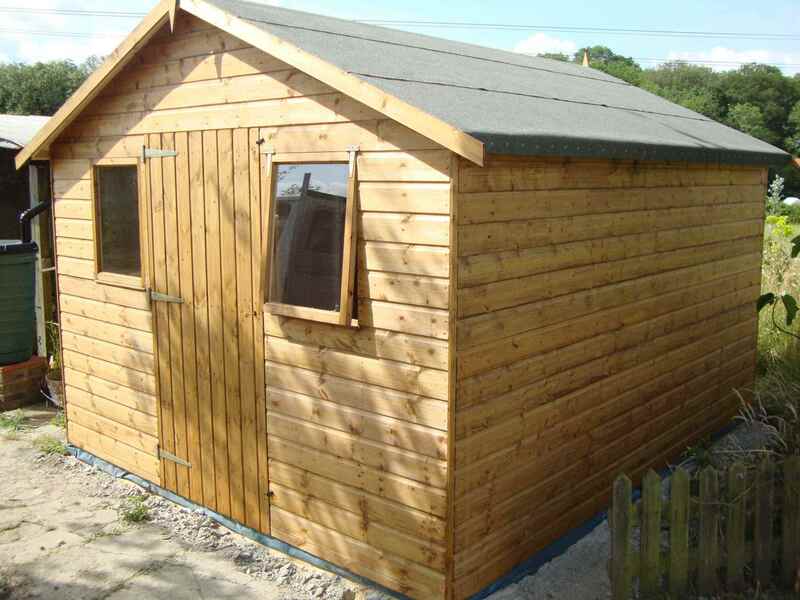 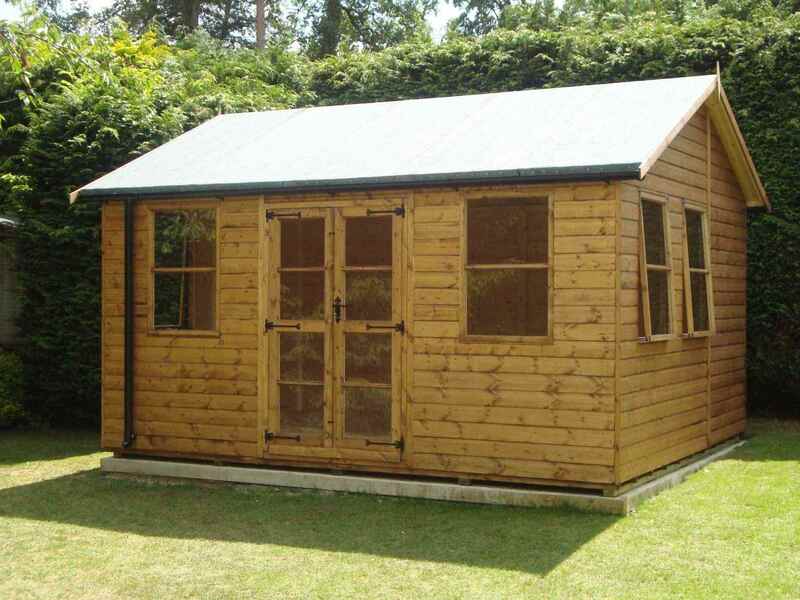 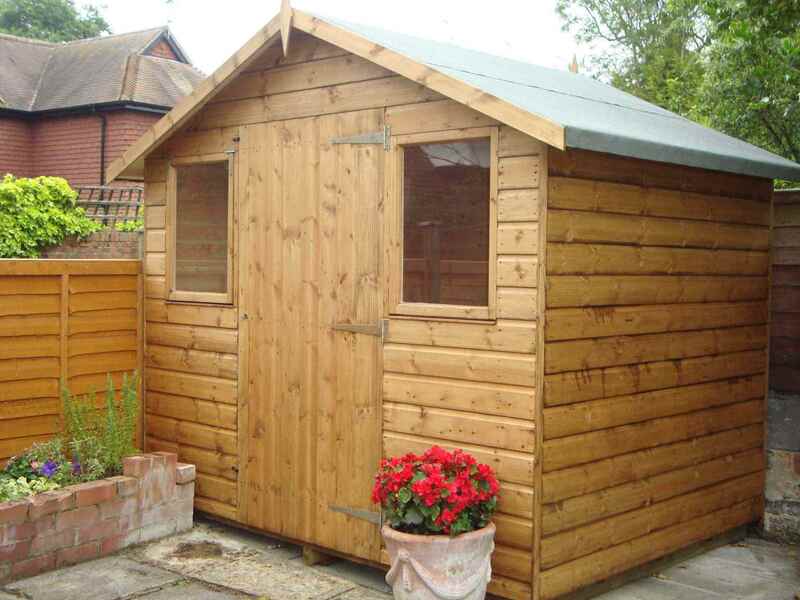 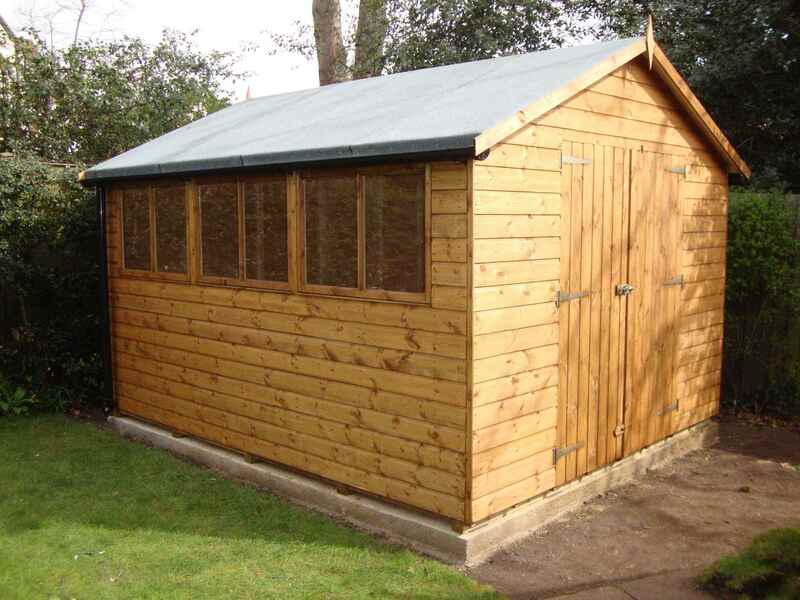 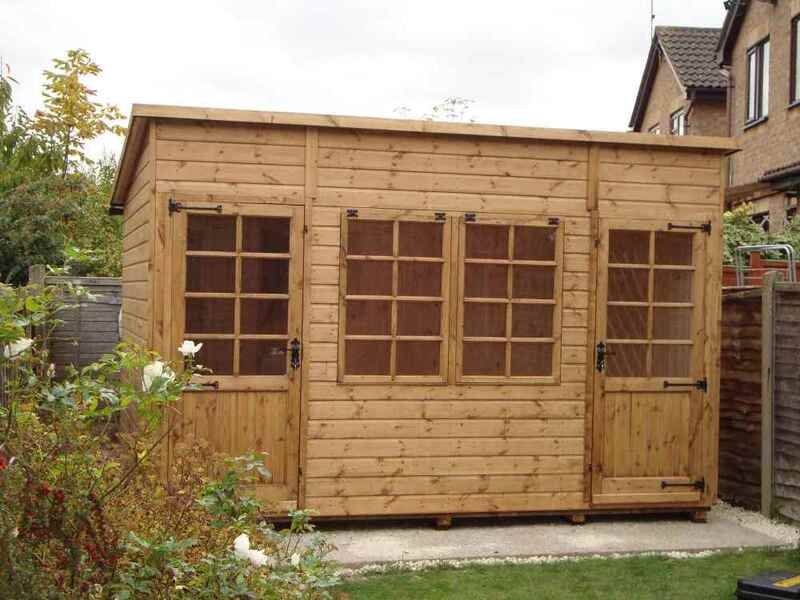 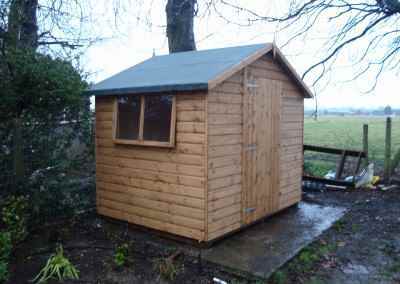 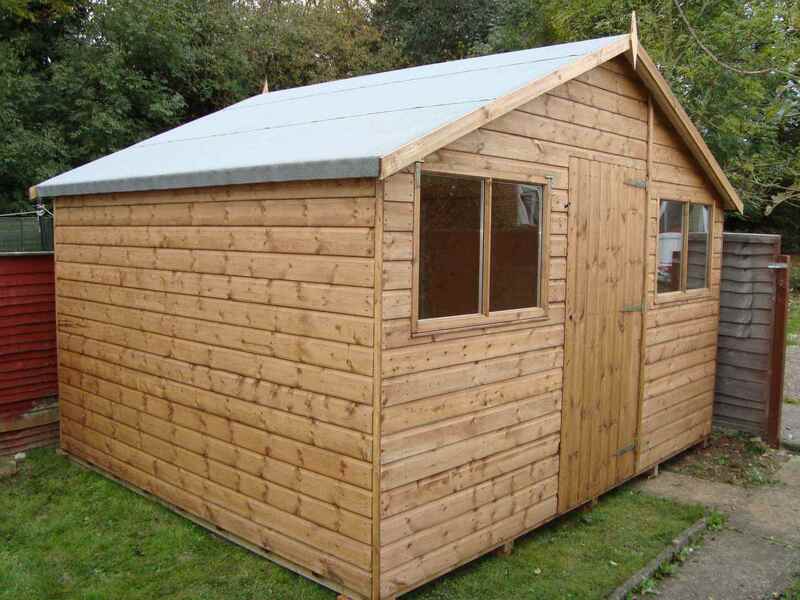 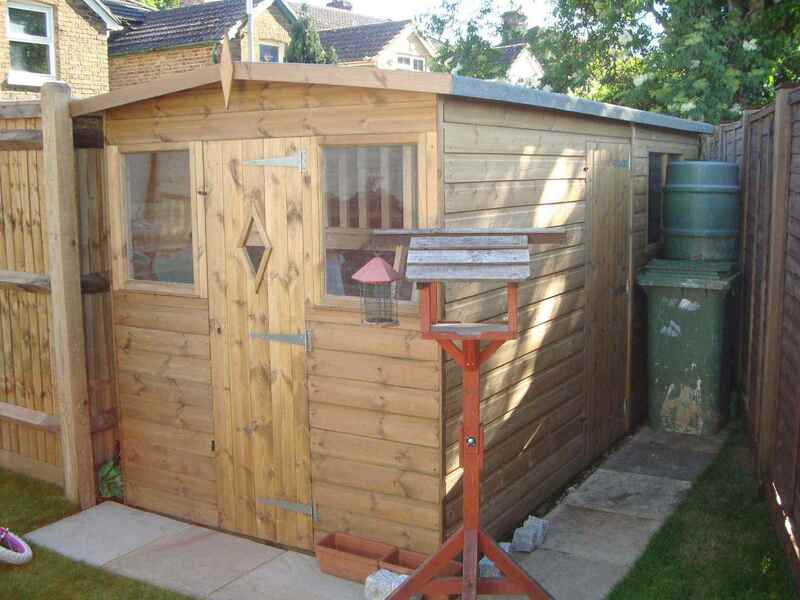 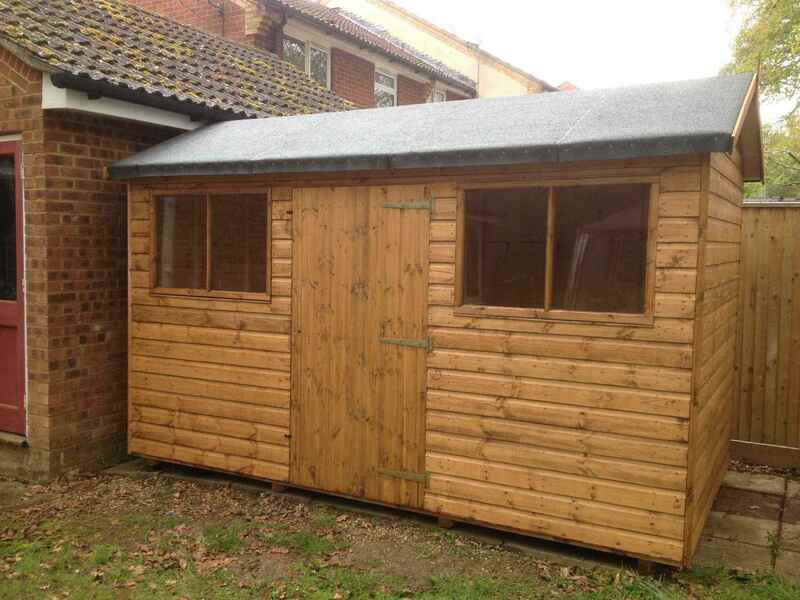 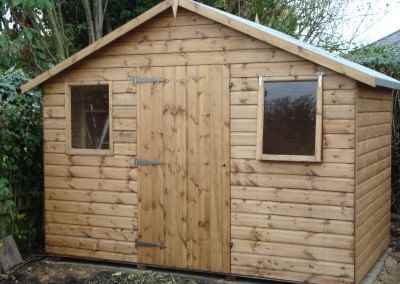 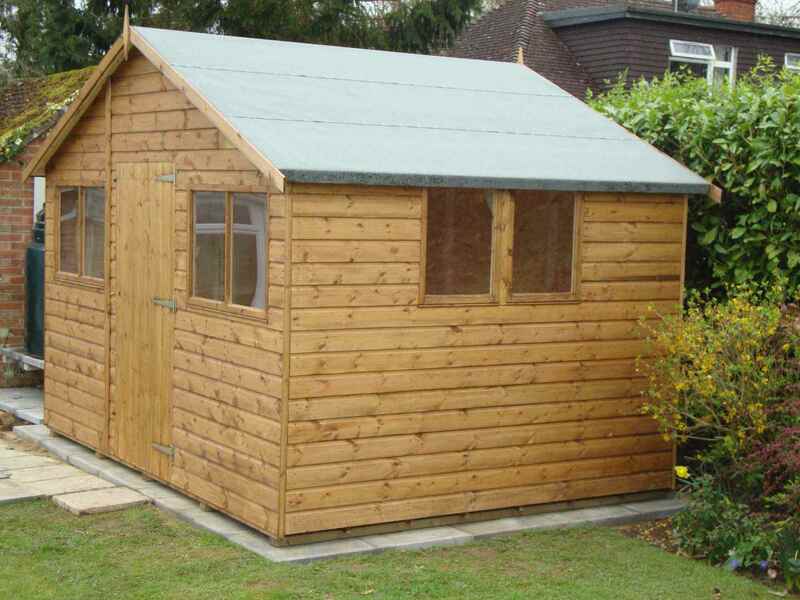 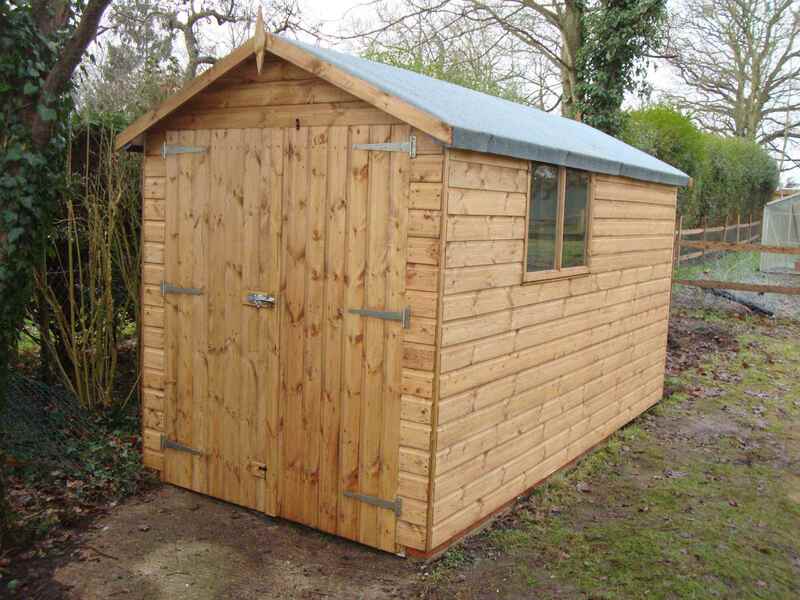 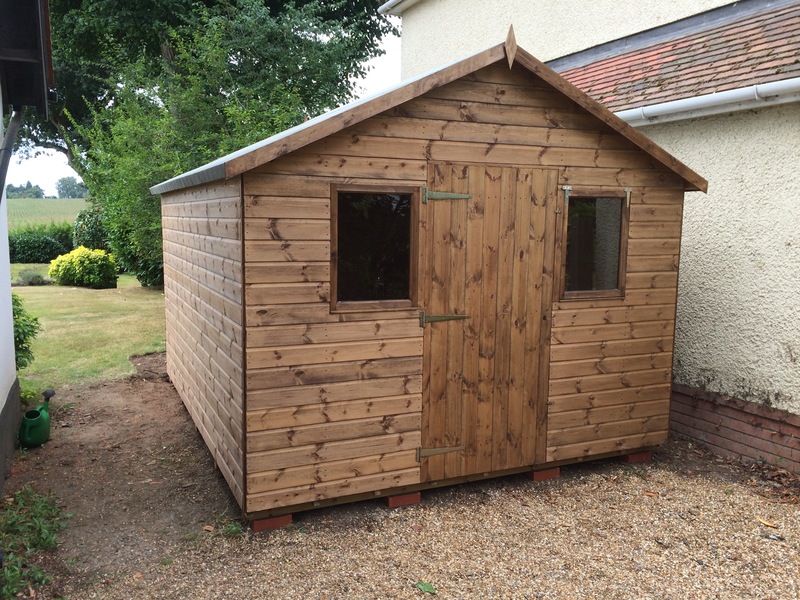 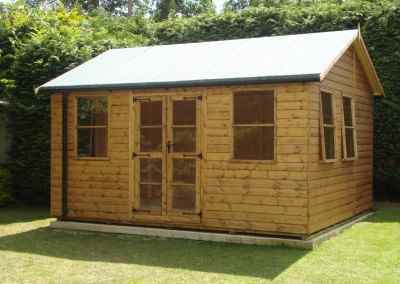 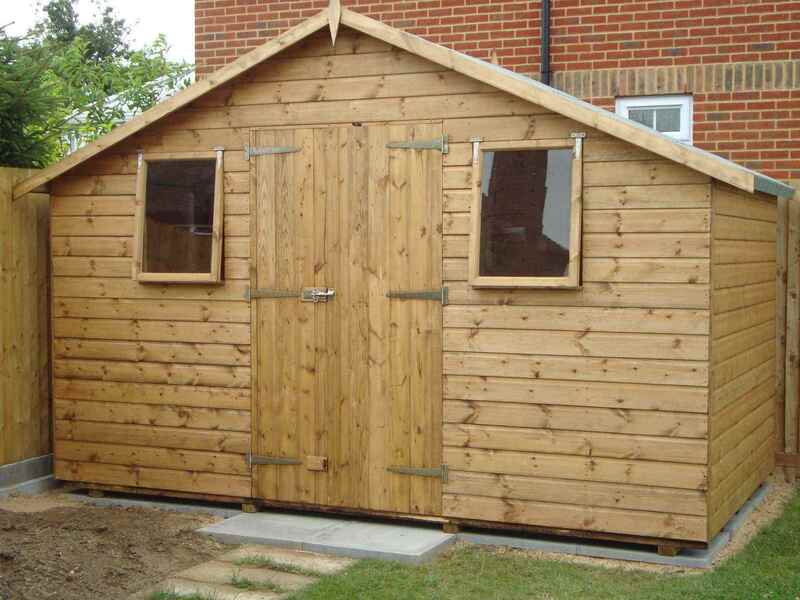 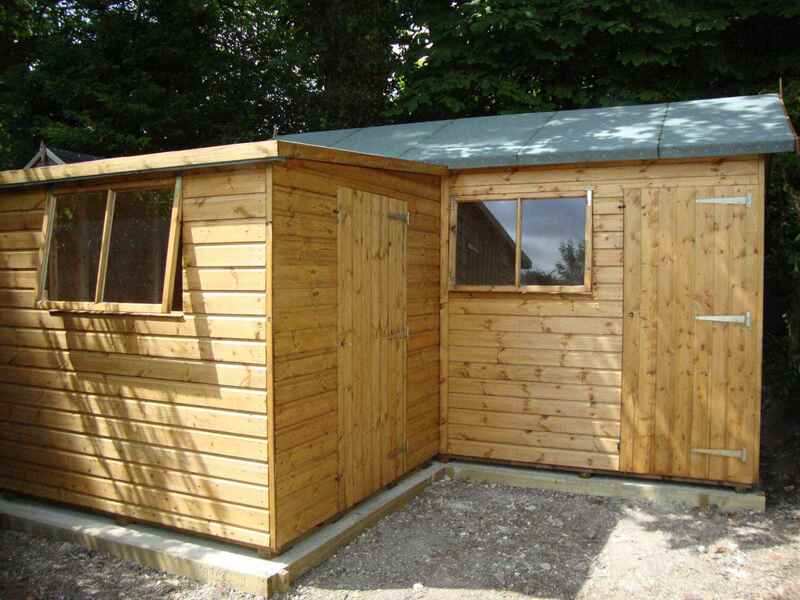 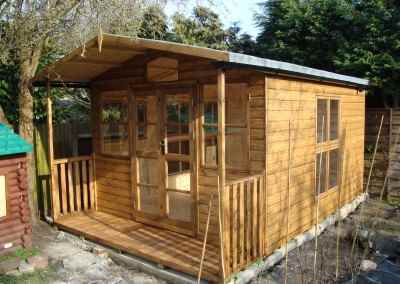 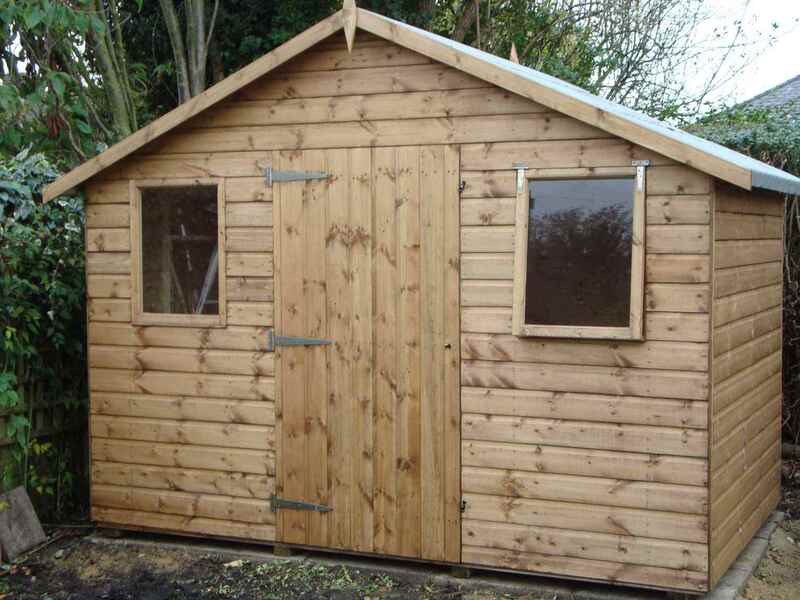 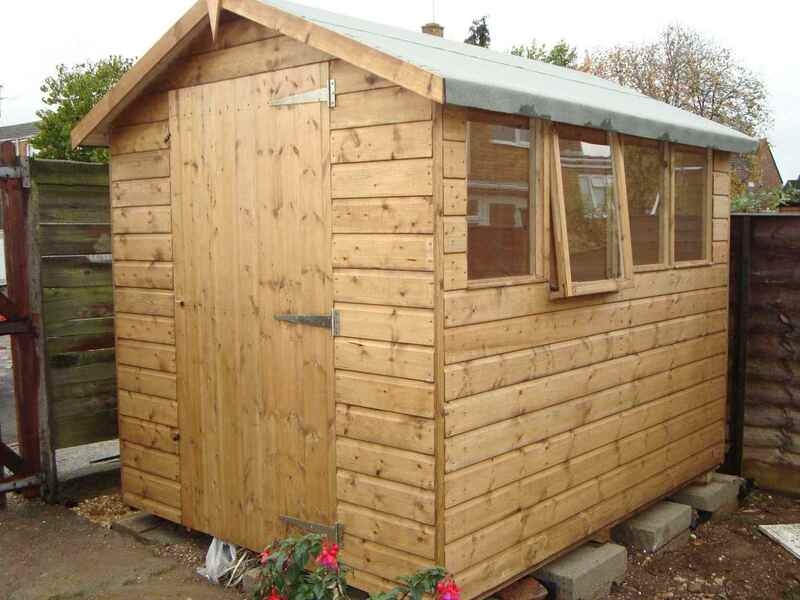 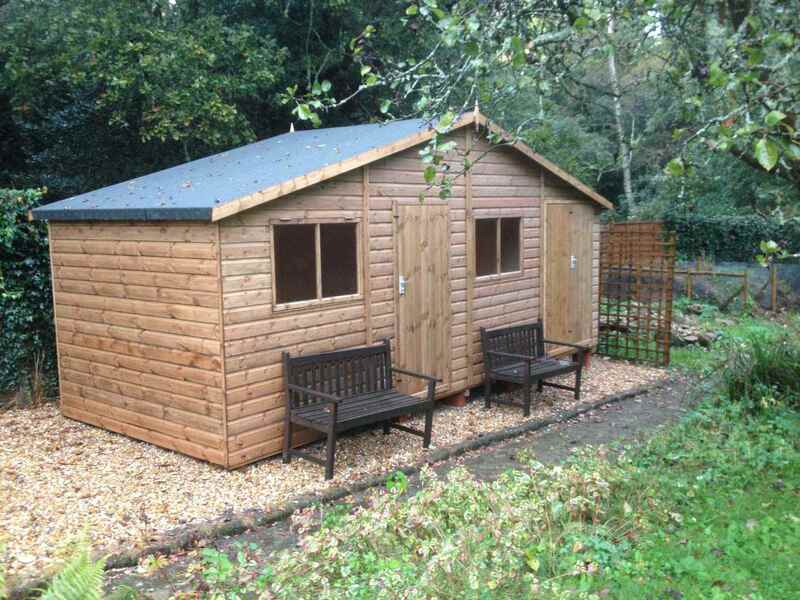 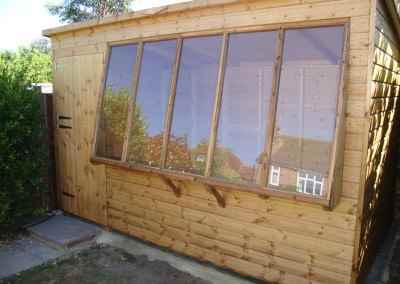 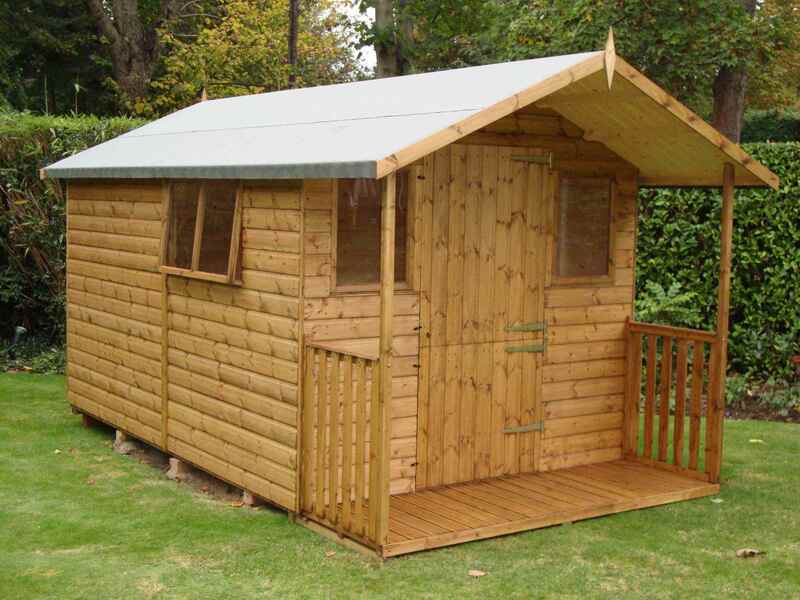 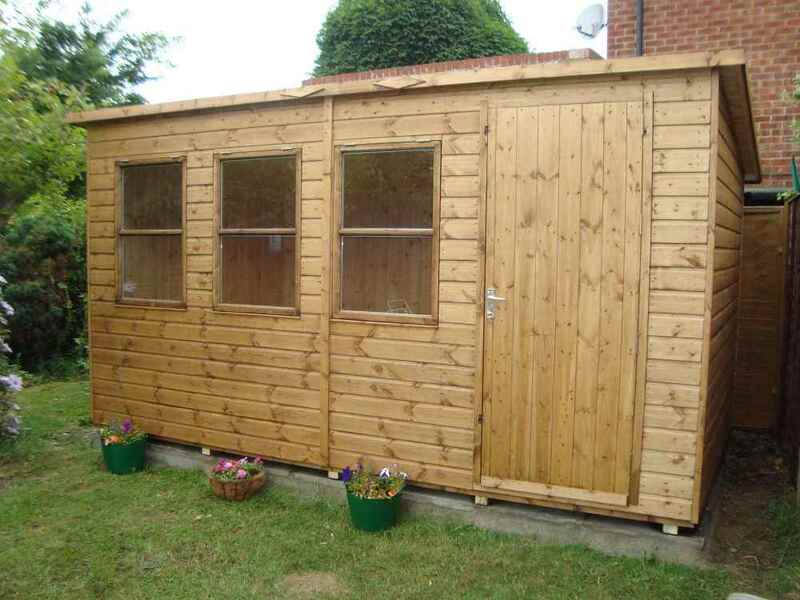 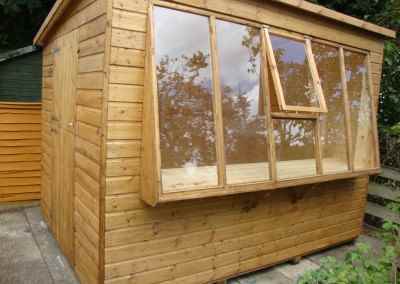 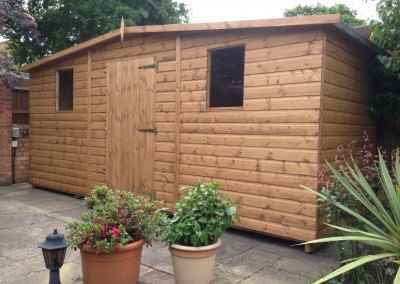 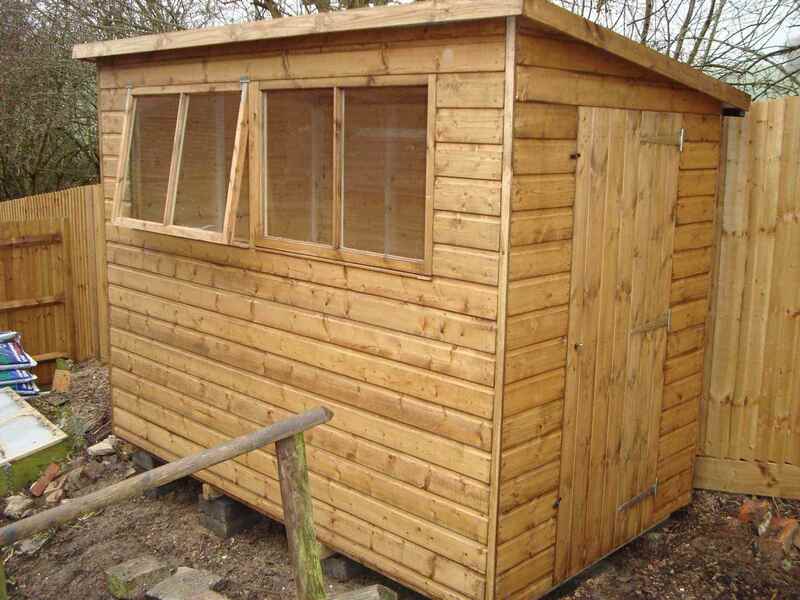 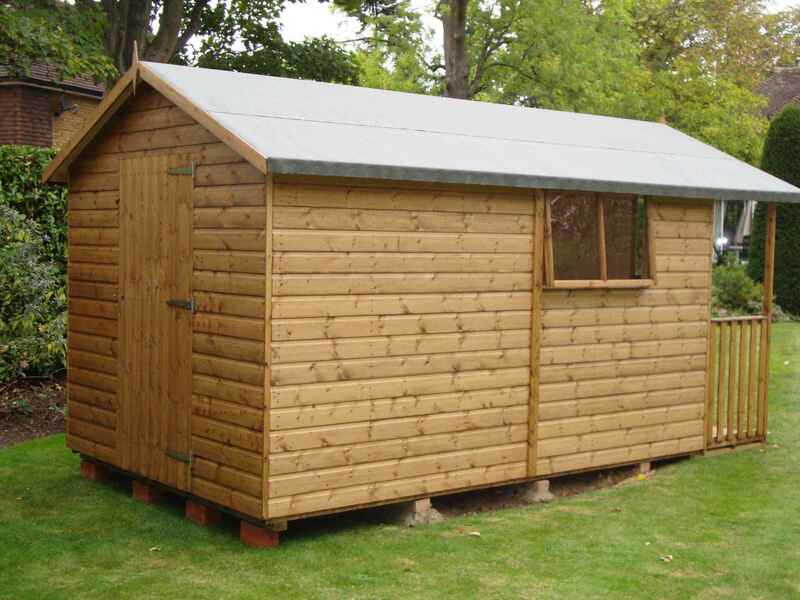 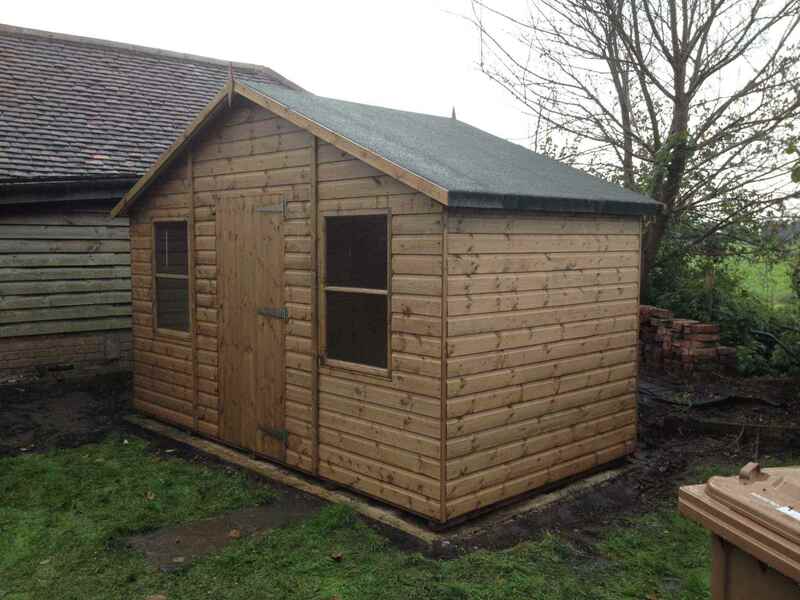 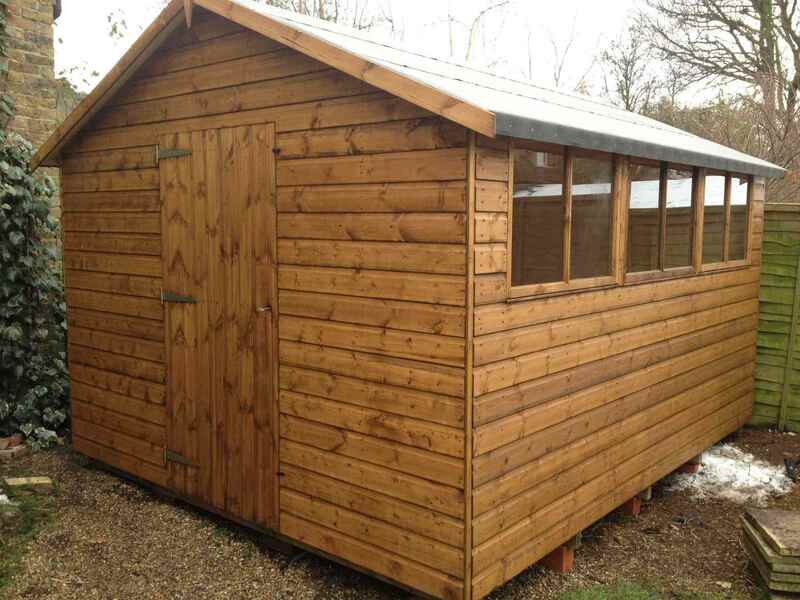 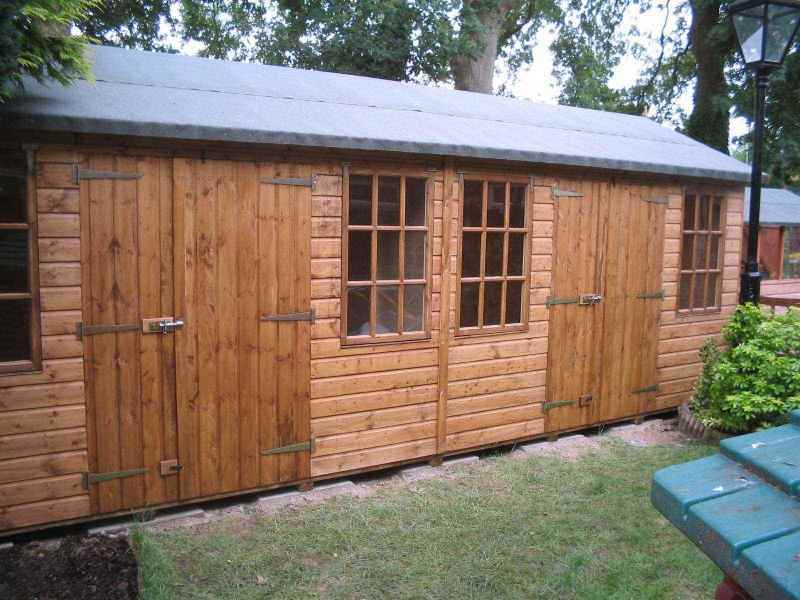 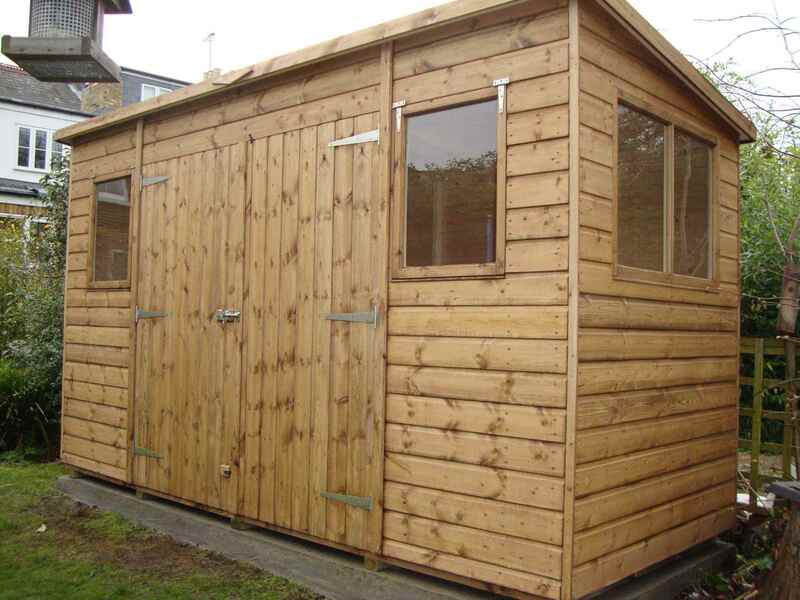 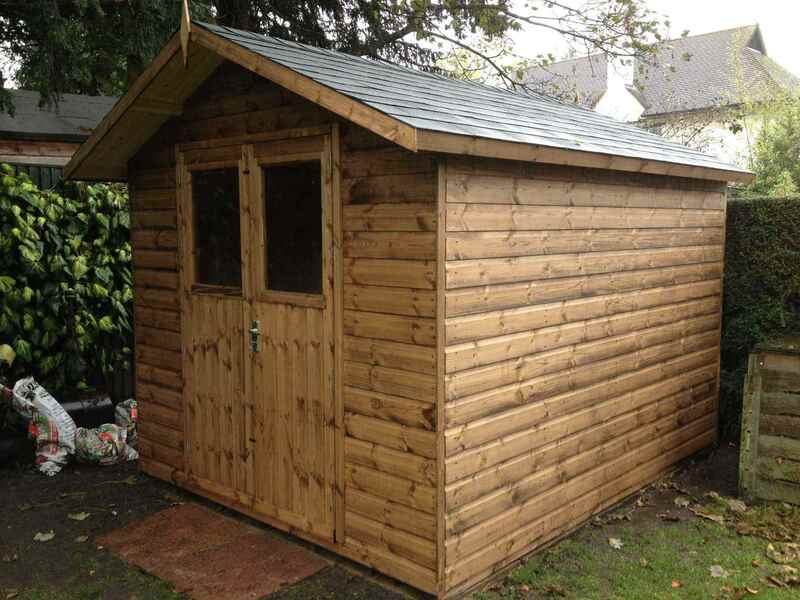 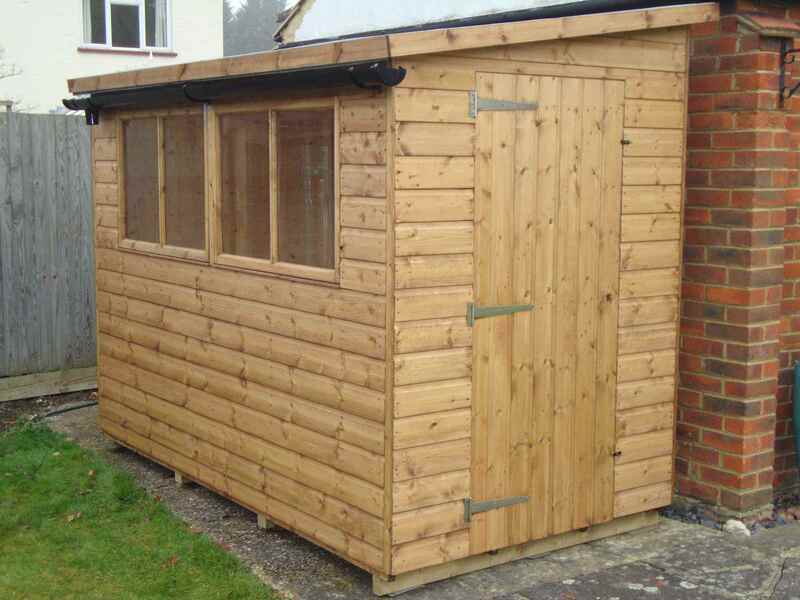 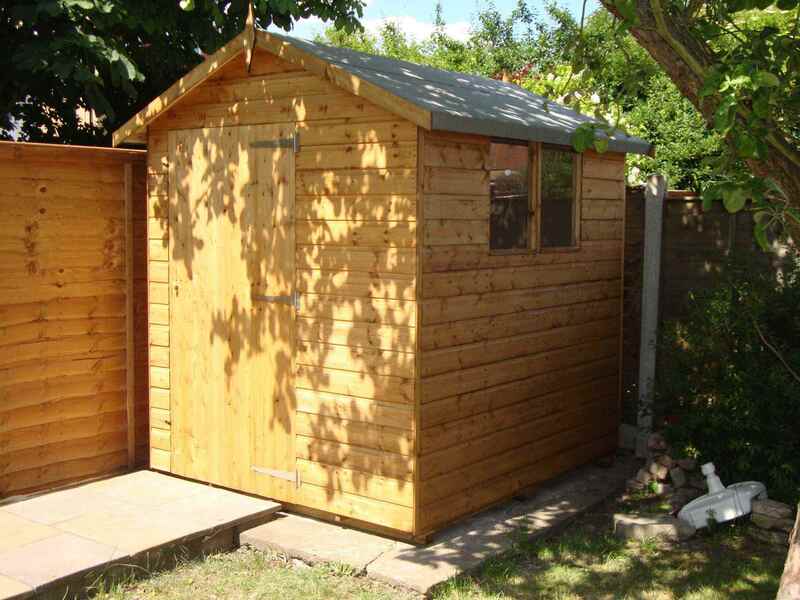 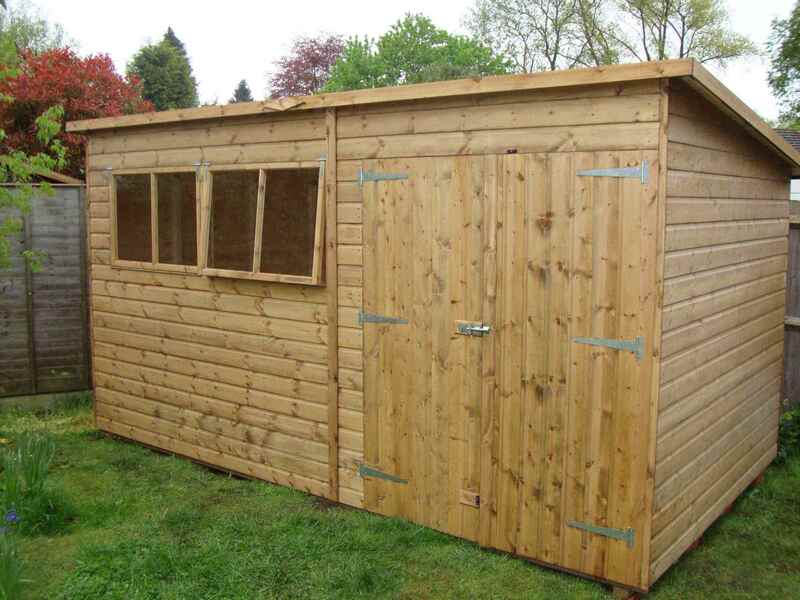 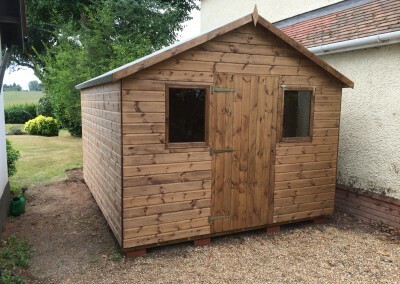 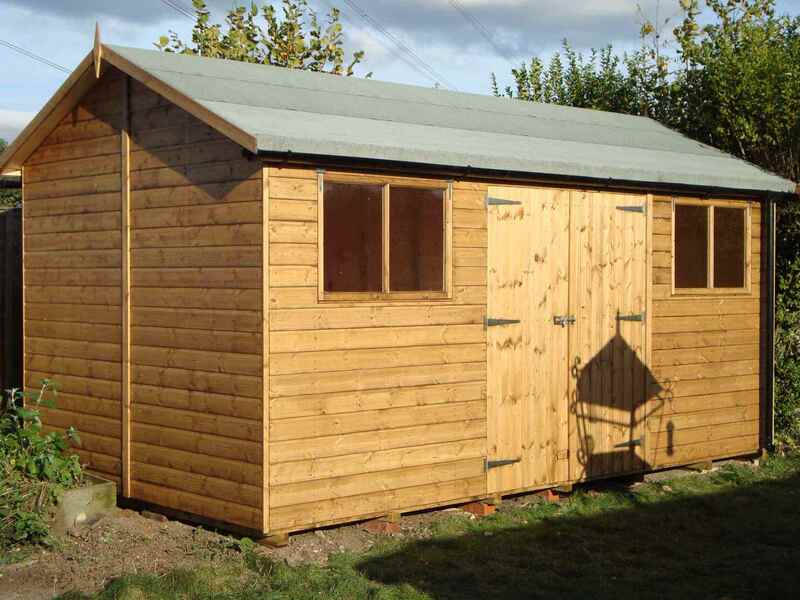 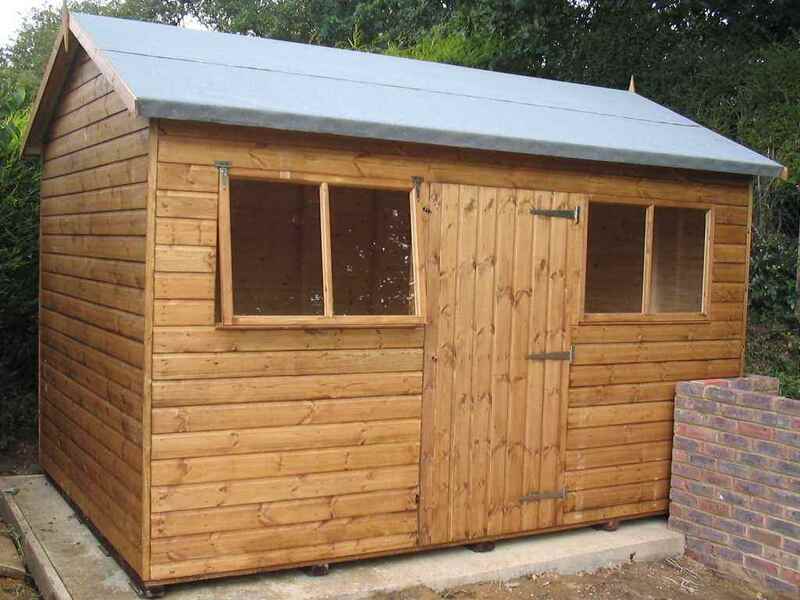 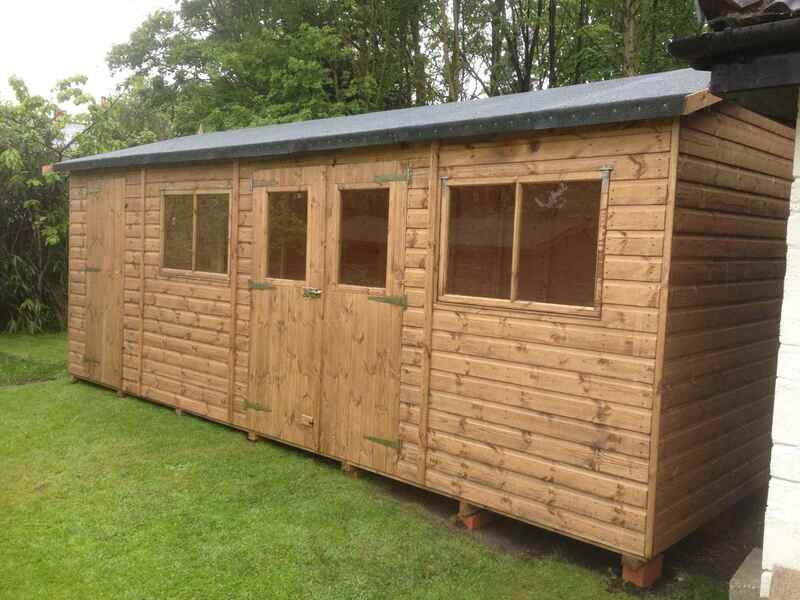 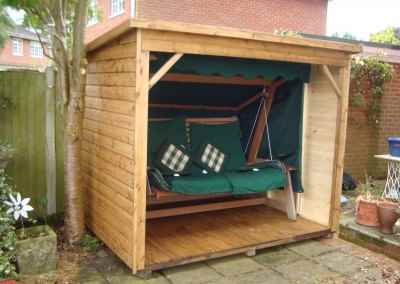 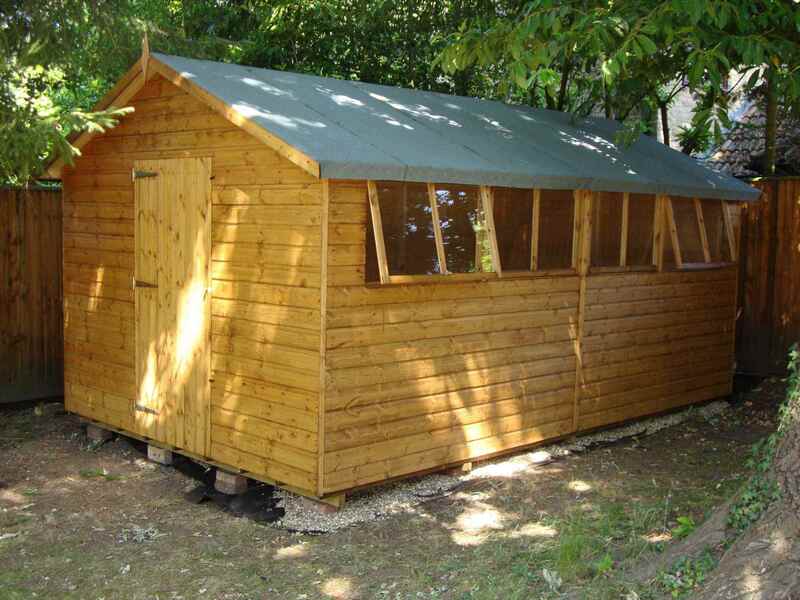 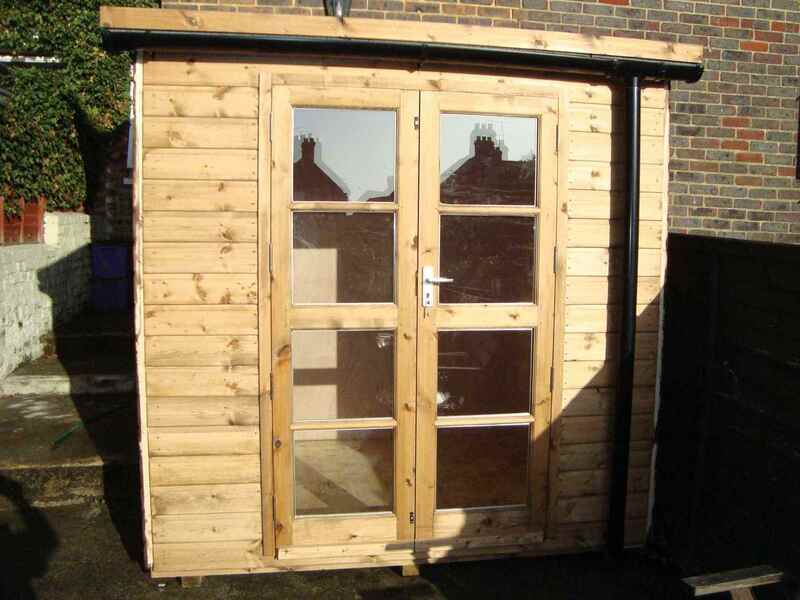 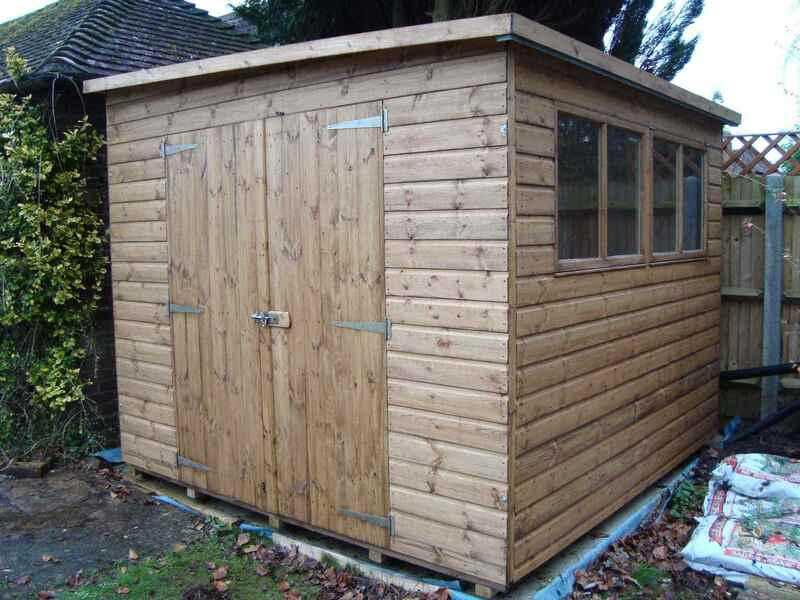 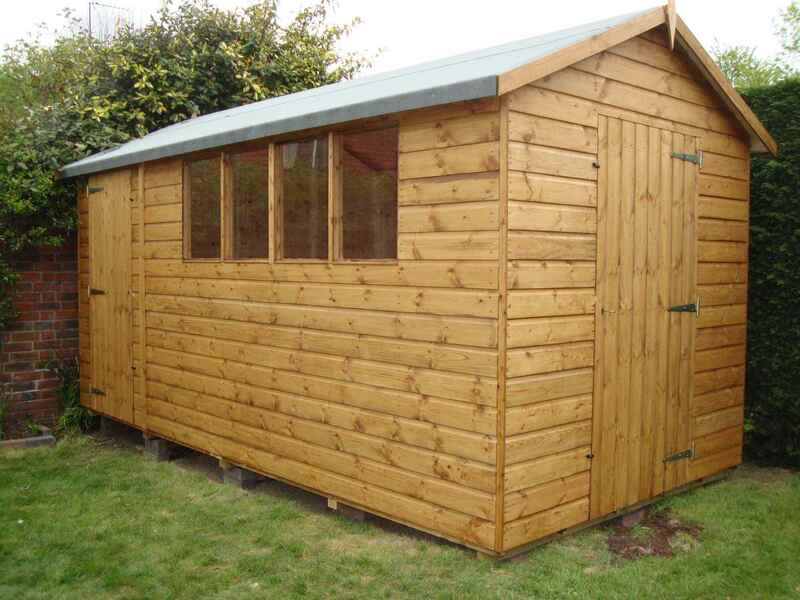 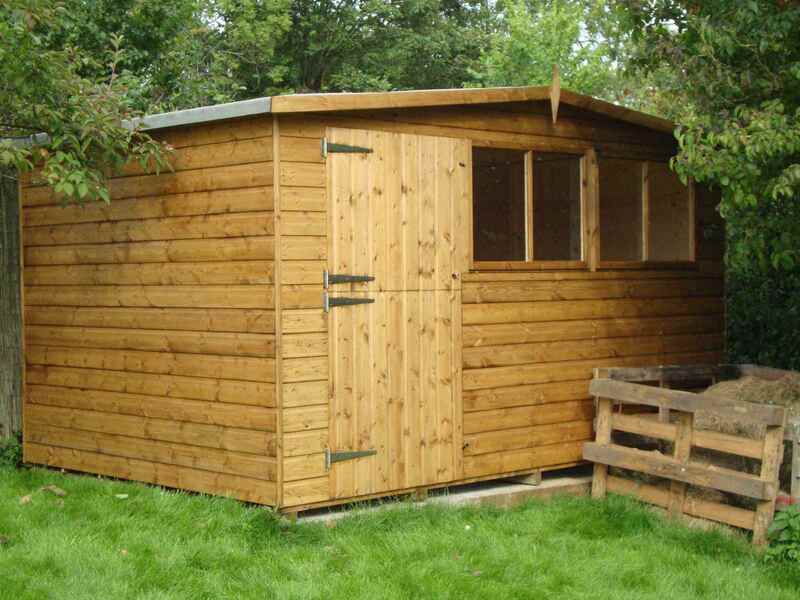 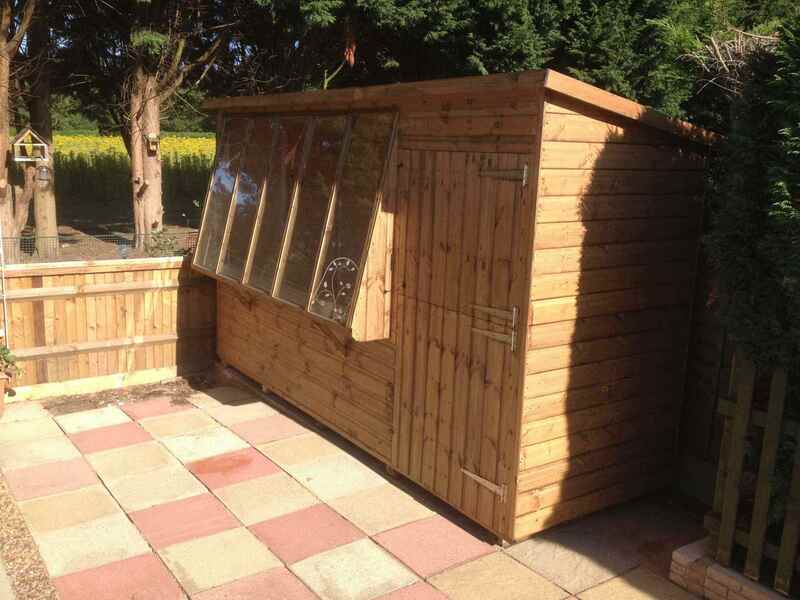 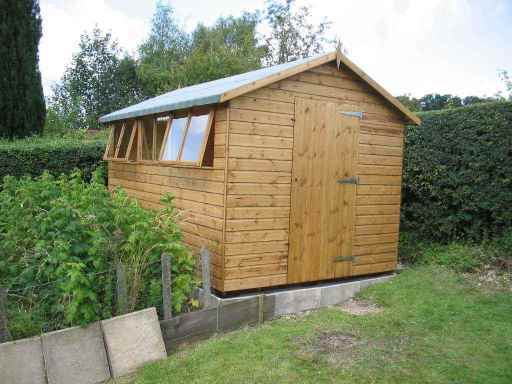 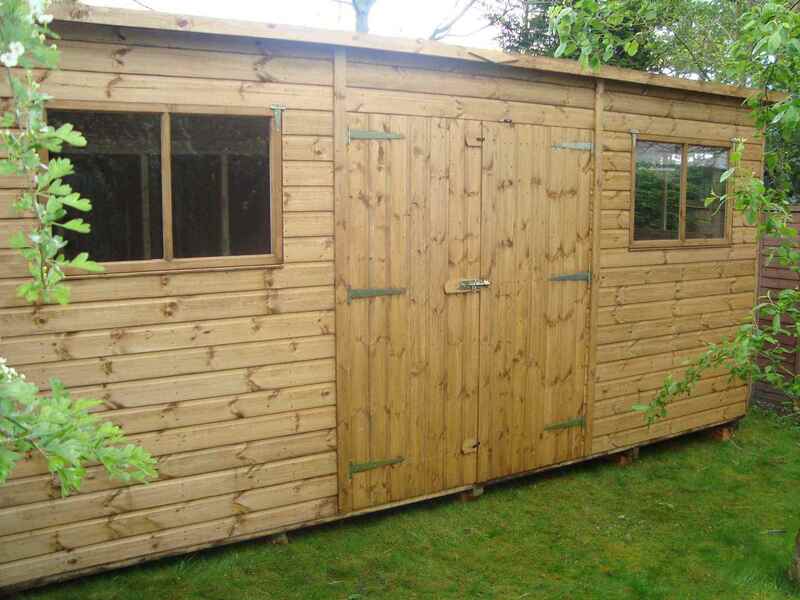 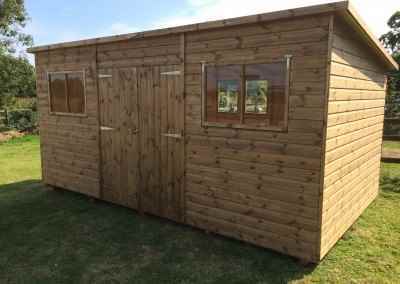 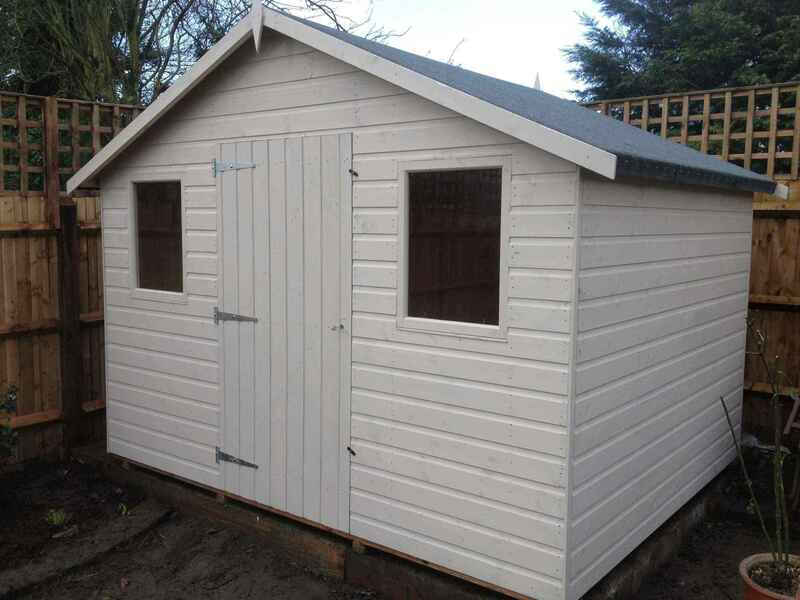 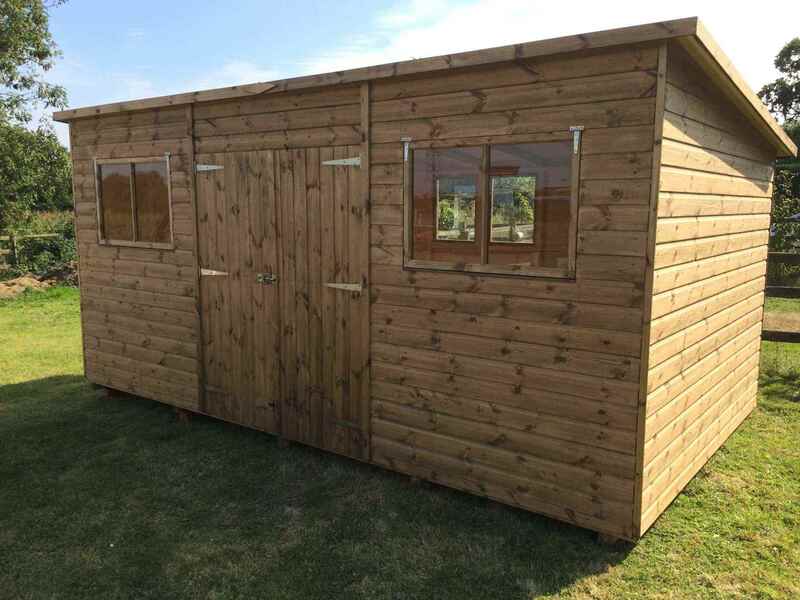 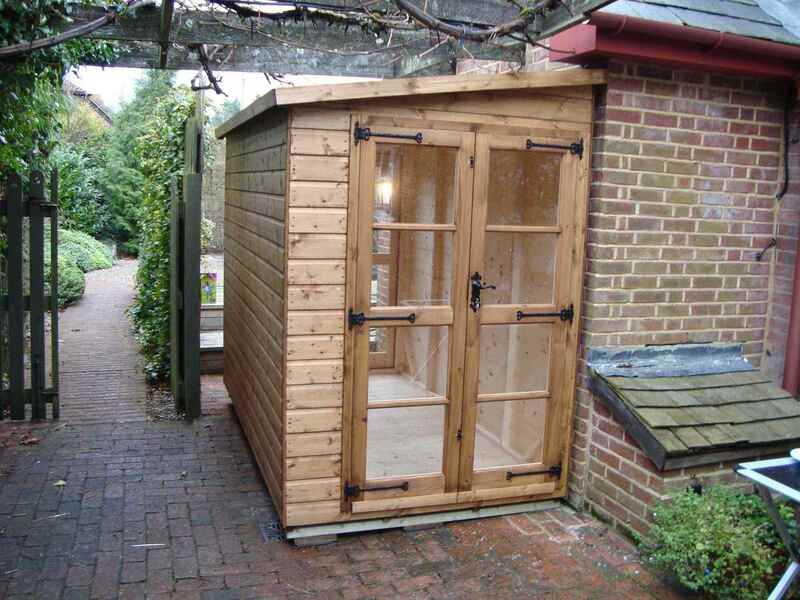 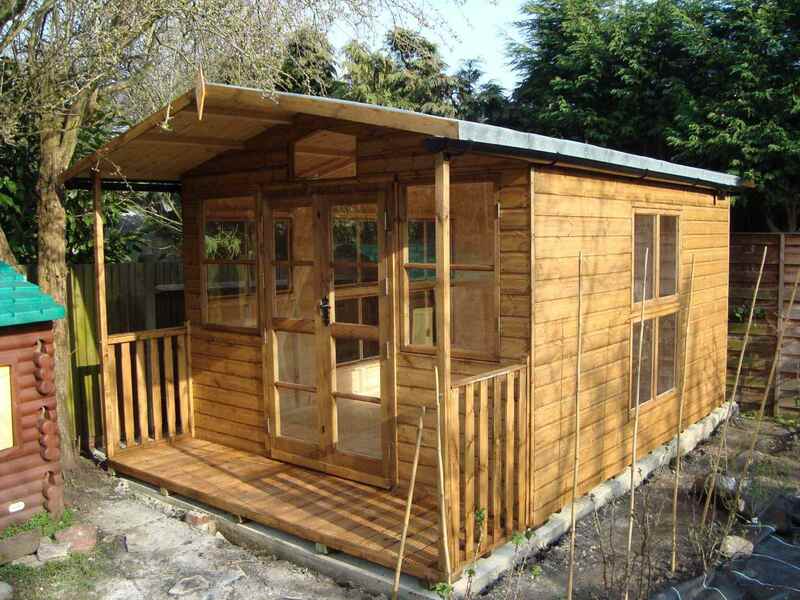 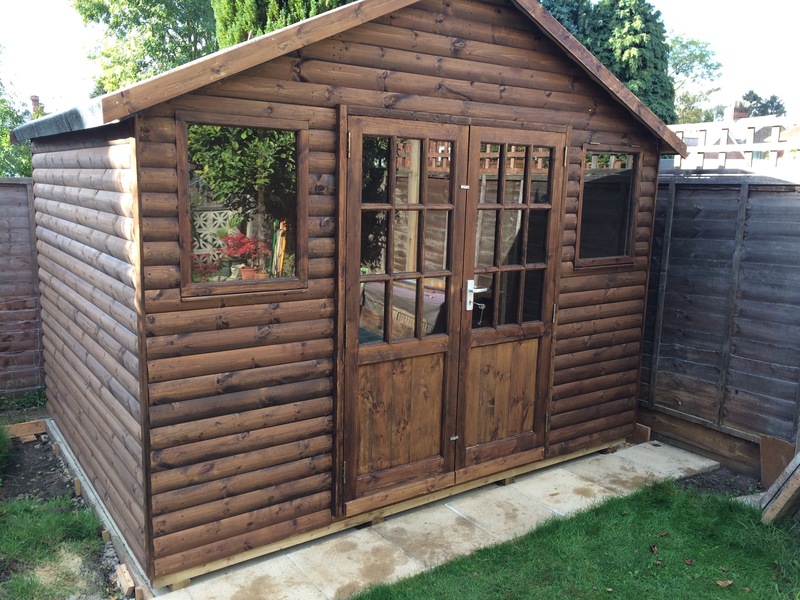 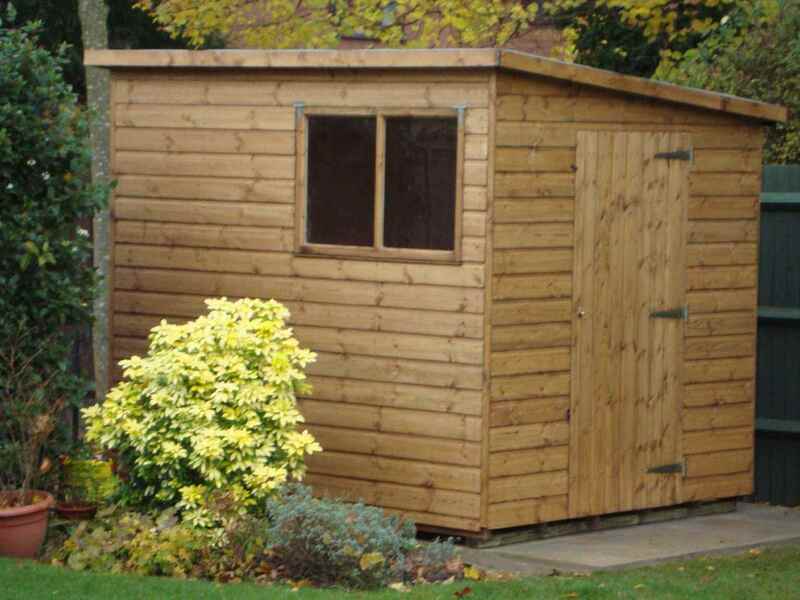 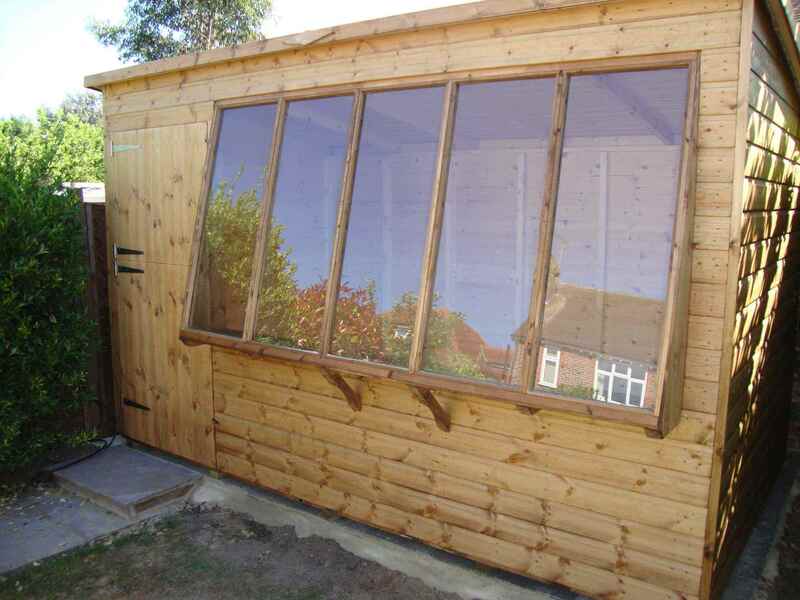 Deluxe Apex 22×10 with Windows in Double Doors, Seperate Shed Compartment and heavy Felt. 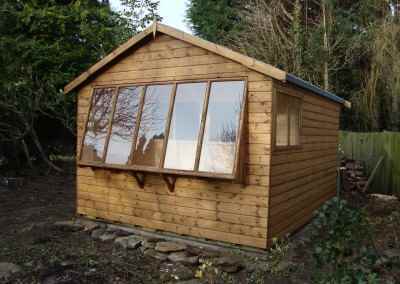 Special Apex 9×7 with Tilford Doorand Lower Windows. 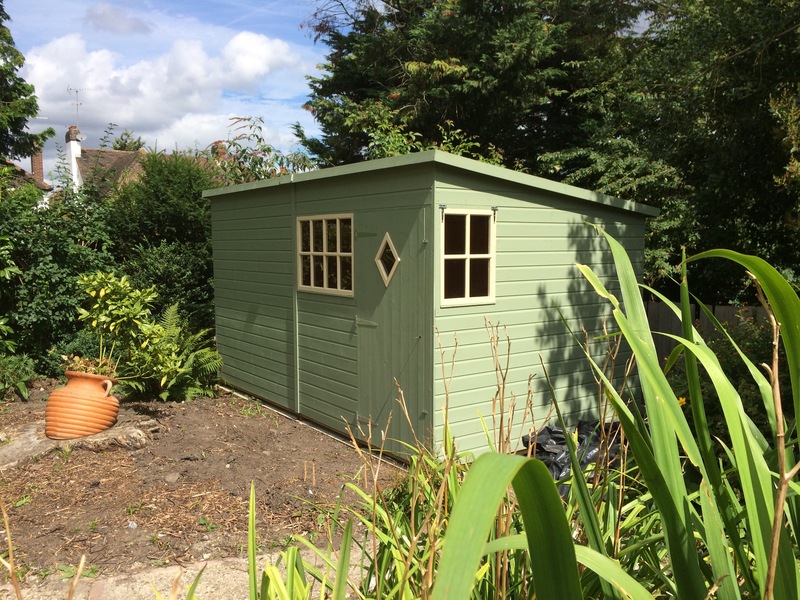 Special Apex 10×6 with Tilford Door and Four-Pane Windows and Painted Finish. 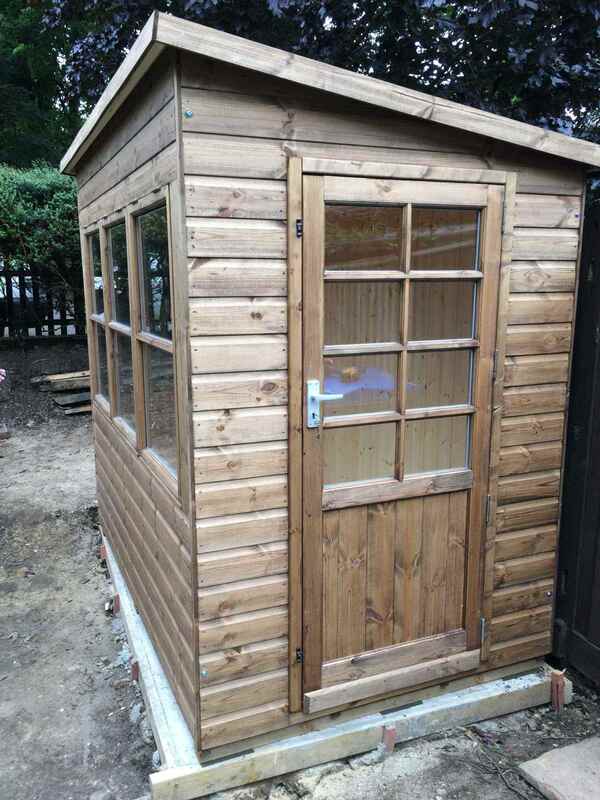 Special Apex 12×7, sash Windows and Heavy Felt. 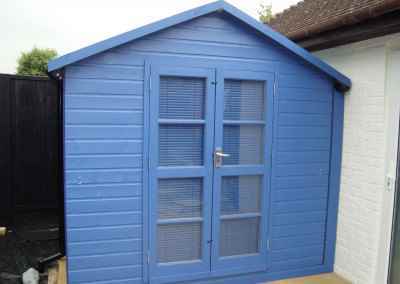 Special Apex 12×8 with Painted Finish. 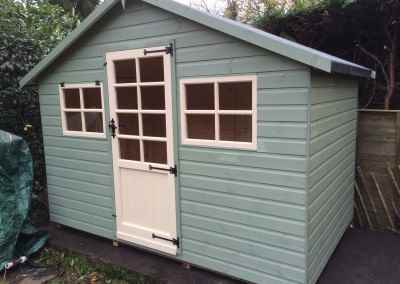 Special Apex 12×8 with Window in Door, Extra Door,Sash Windows and Painted Finish. 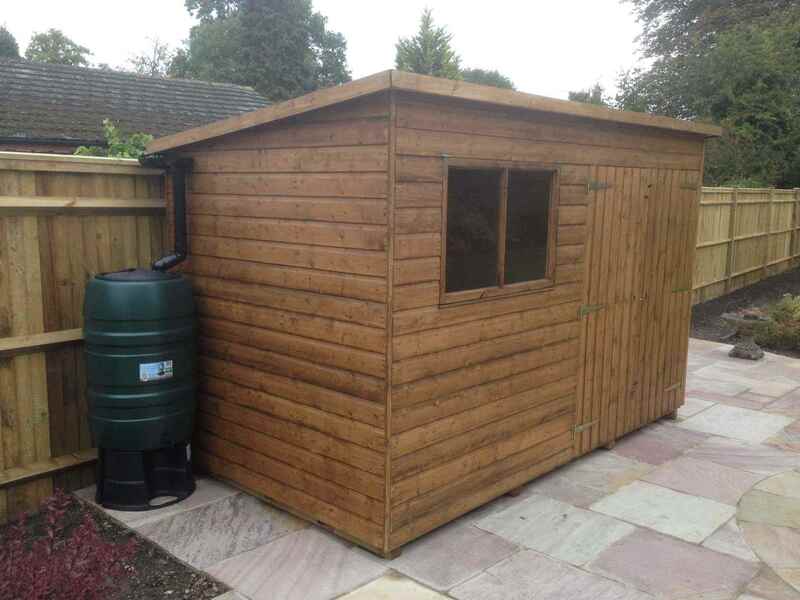 Special Apex 20×10 with Extra Doors and Heavy Felt. 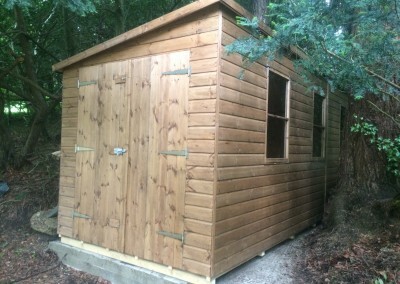 Hobby Apex 13×7 with Combined Log Store. 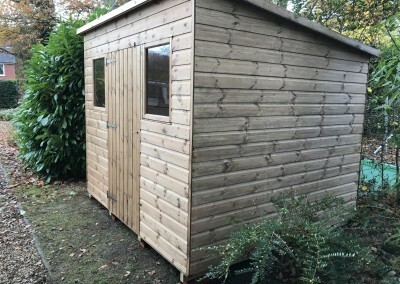 Super Pent 8×6 with Door and a Half. 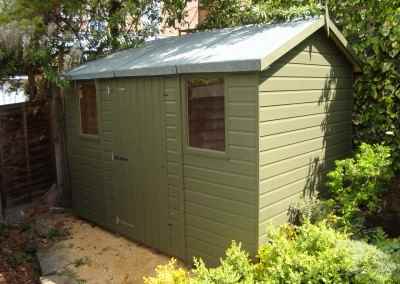 Super Pent 8×6 with Painted Finish. 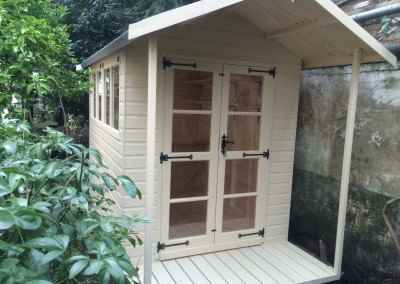 Deluxe Pent 7×5 with Window in Door and Sash Windows. 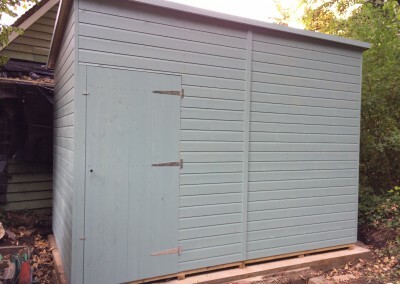 Deluxe Pent 8×12 with Painted Finish. 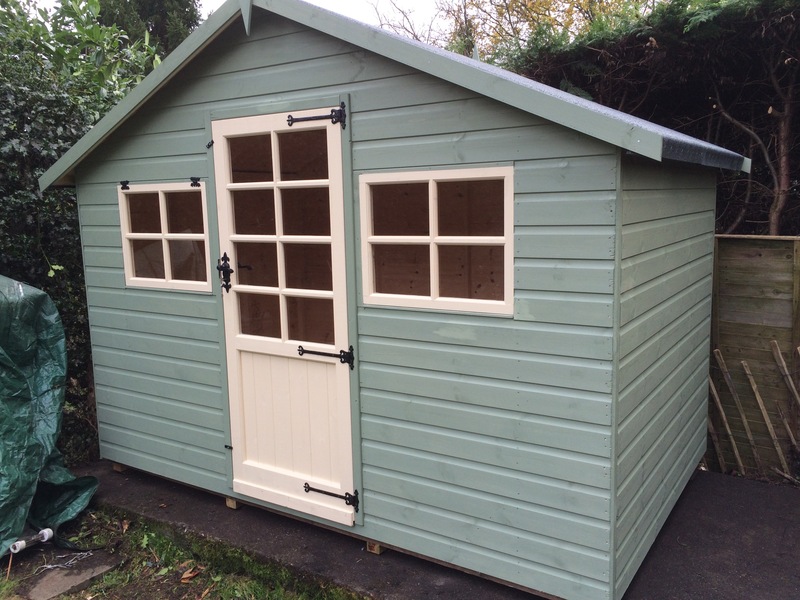 Deluxe Pent 9×5 with Sash Windows, Tilford Door and T&Gv Lining and Insulation. 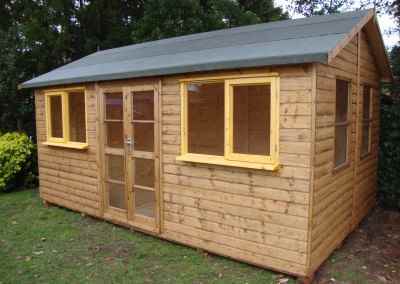 Deluxe Pent 10×8 with Extra Window. 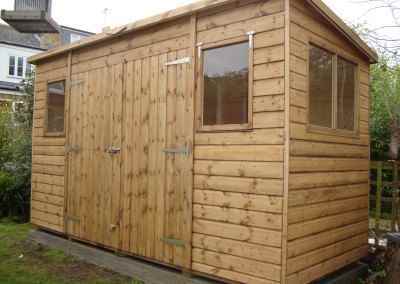 Deluxe Pent 12×6 with Double Doors. 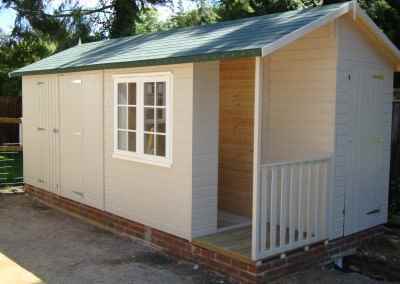 Deluxe Pent 12×7 No Windows and Painted Finish. 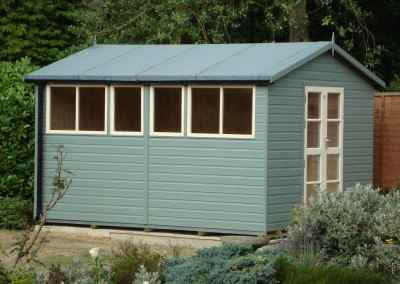 Deluxe Pent 13×8 with Painted Finish. 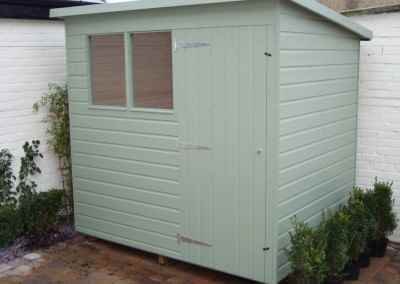 Deluxe Pent 14×4 with Extra Door, Partion and Painted Finish. 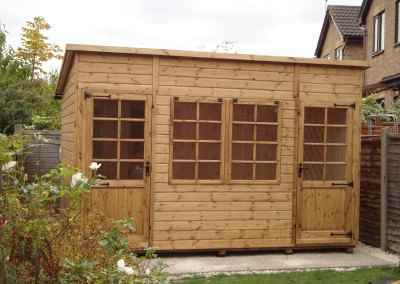 Deluxe Pent 16×9 with Double Doors. 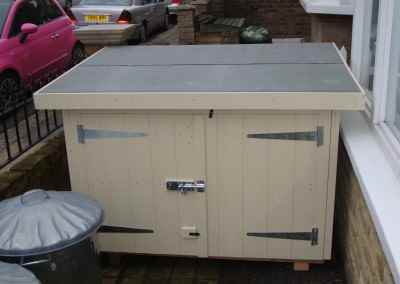 Planter 7×3 with Painted Finish. Solar 8×6 with 3 Windows Only and Painted finish. 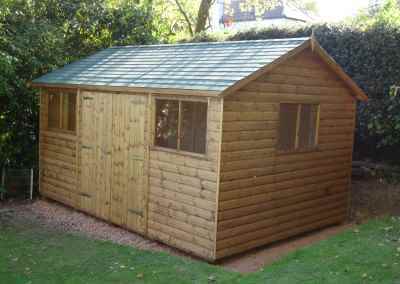 Solar 8×6 with Hobby Roof. 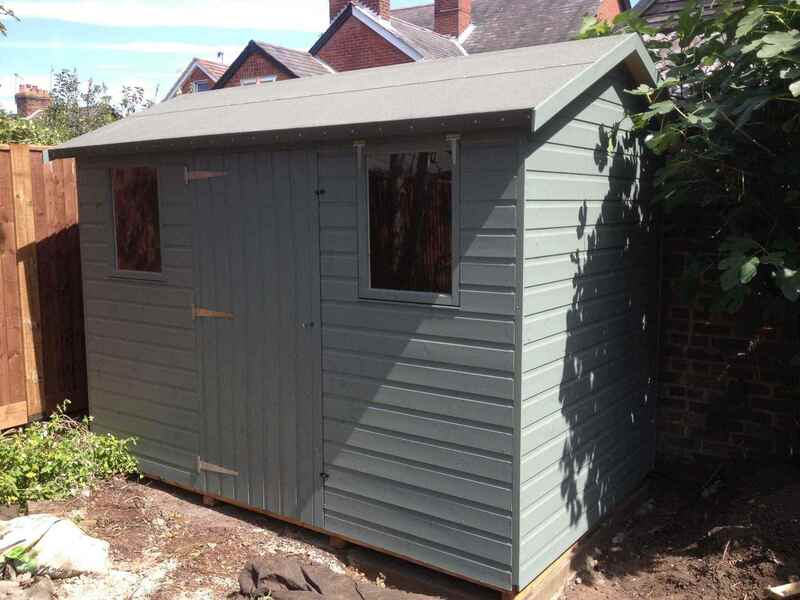 Solar 8×18 with Apex Roof, Guttering, Heavy Felt and Painted Finish. 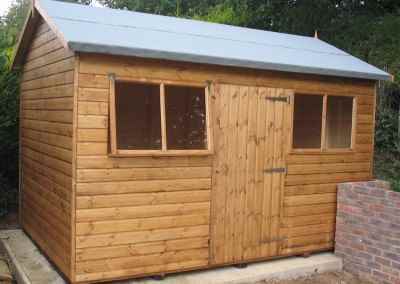 Solar 12×5 with Door in Front. 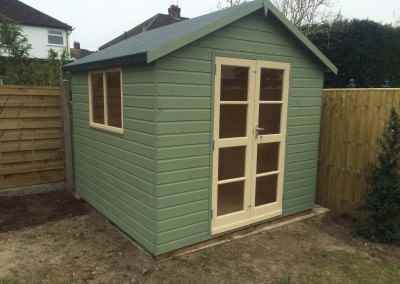 Security Shed 10×7 with Pent Roof and Green Stained By Customer. 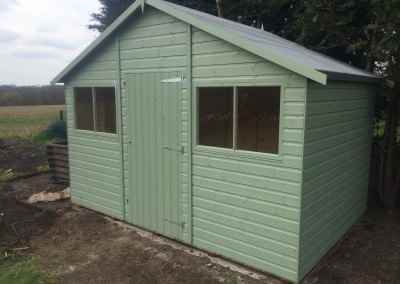 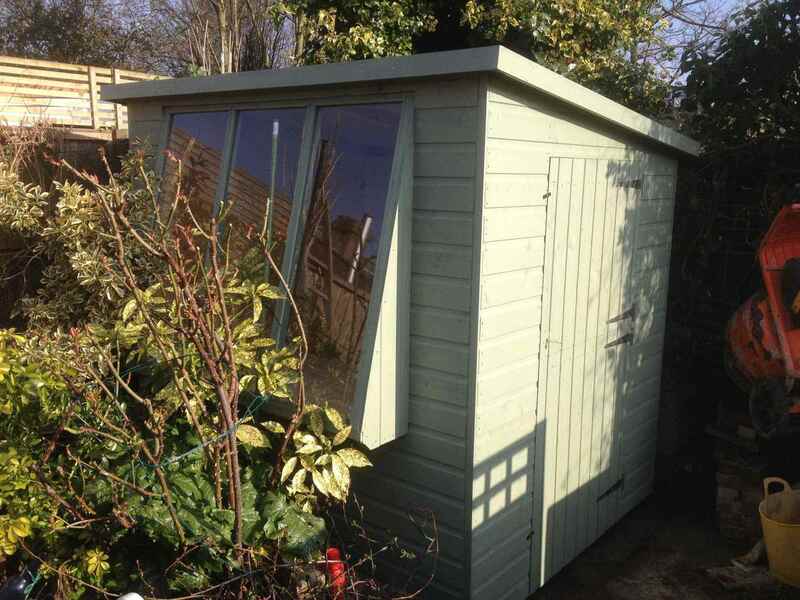 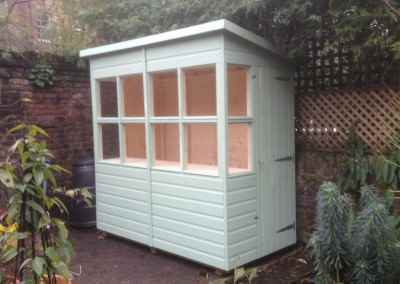 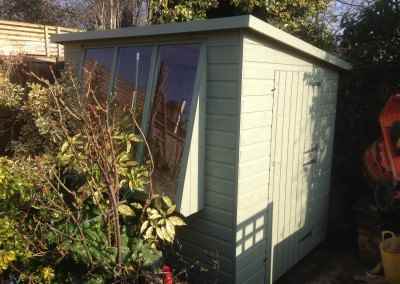 Security Shed 10×8, Windows in Double Doors, Green Felt Tiles. 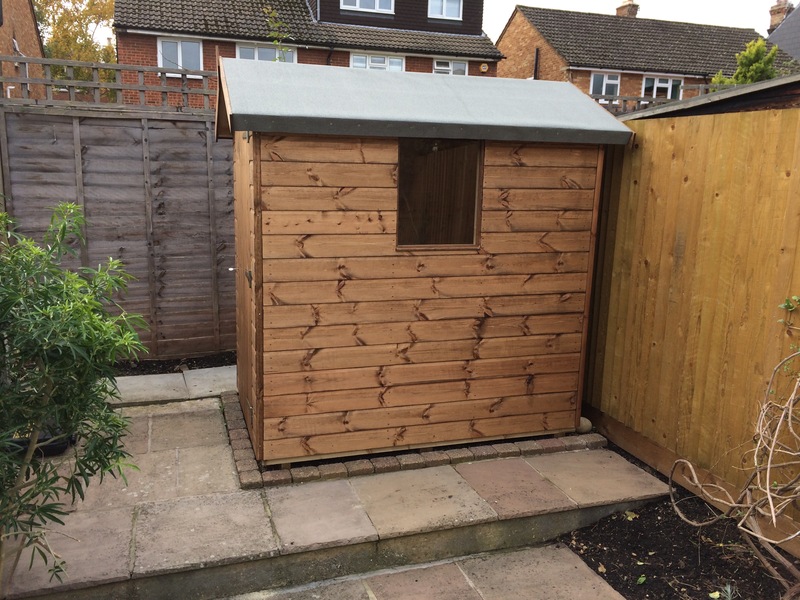 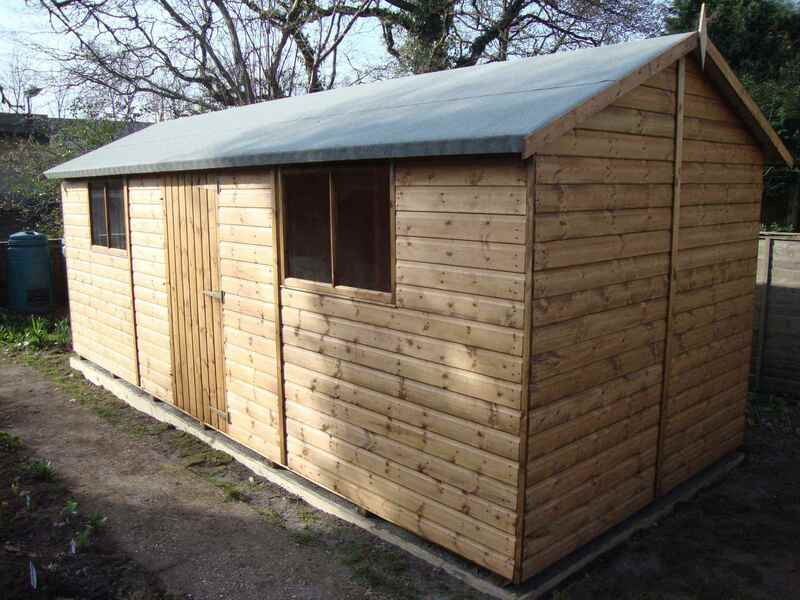 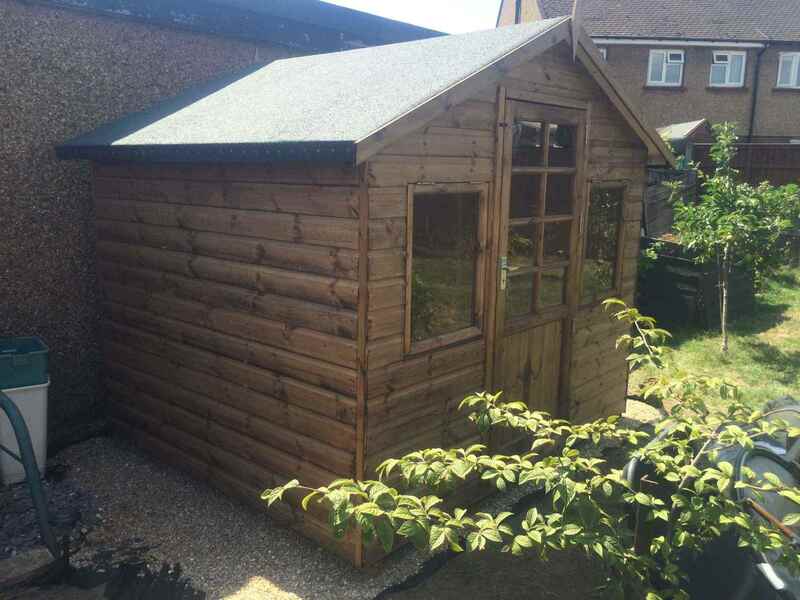 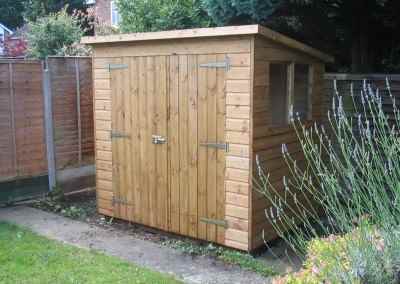 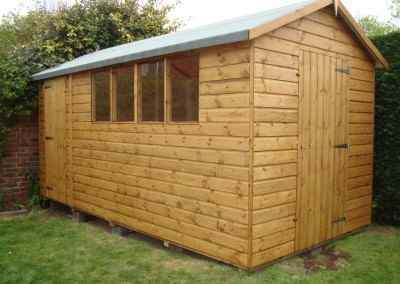 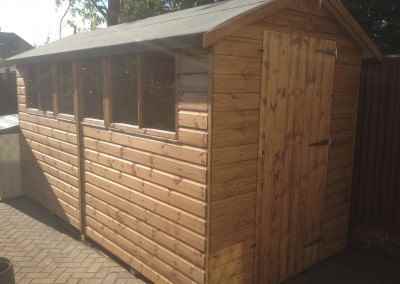 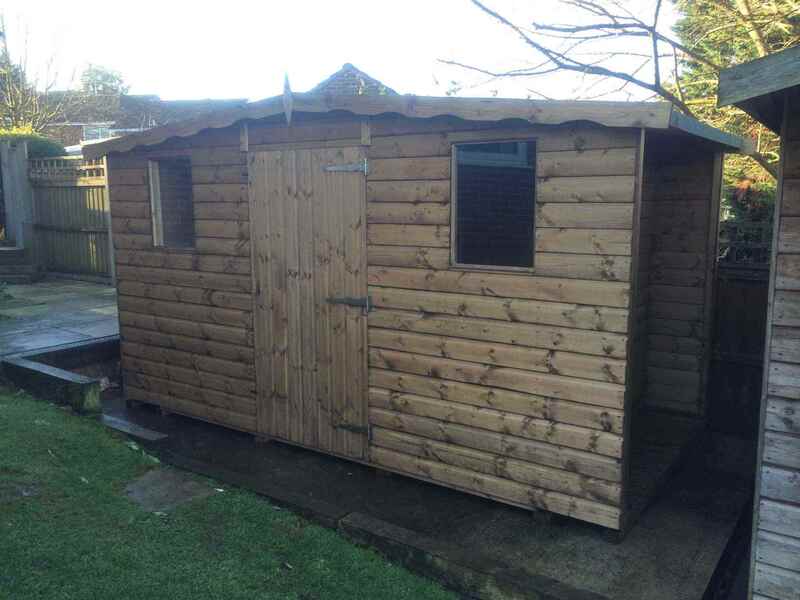 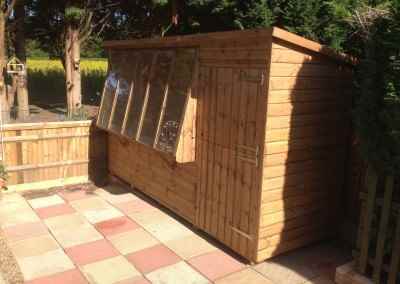 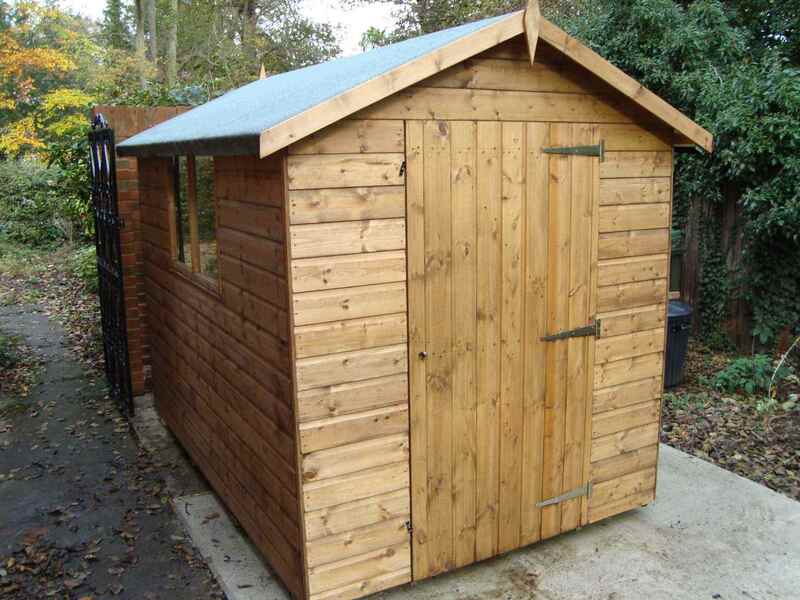 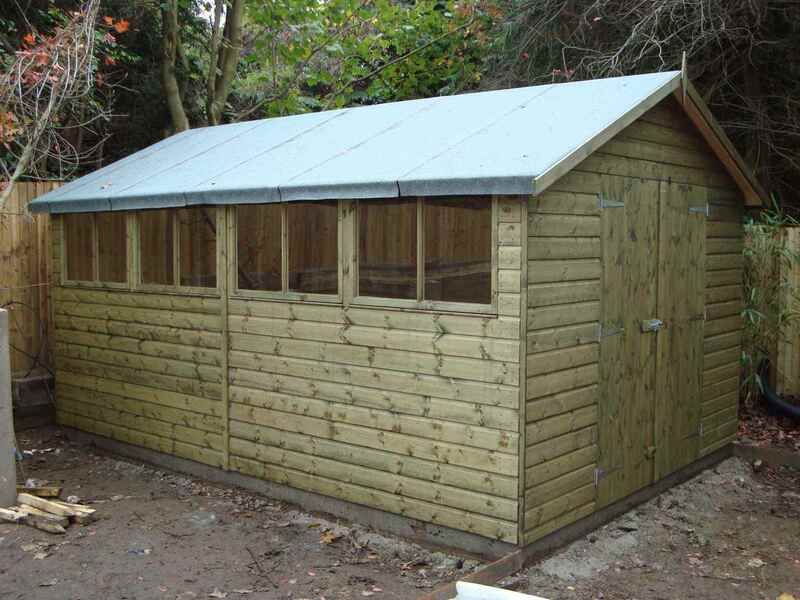 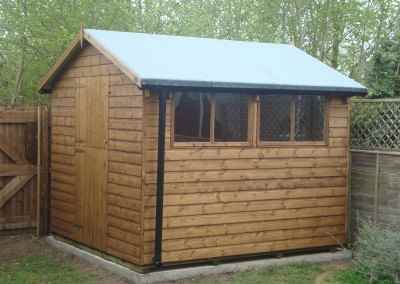 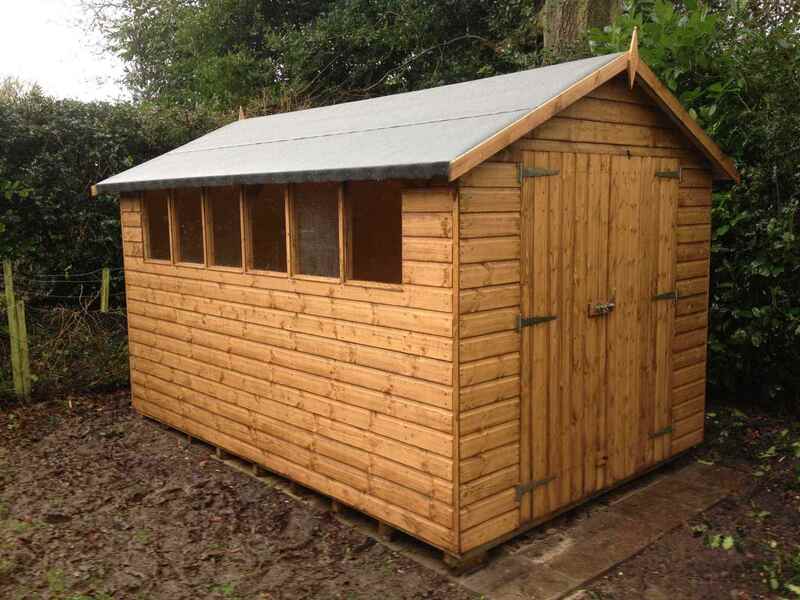 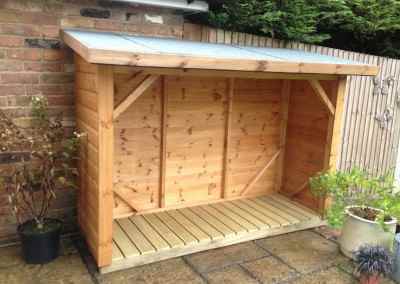 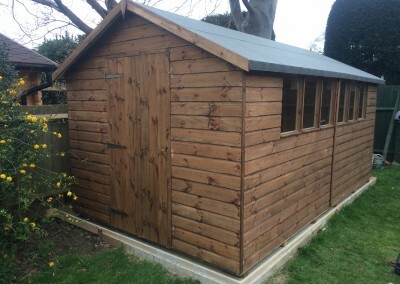 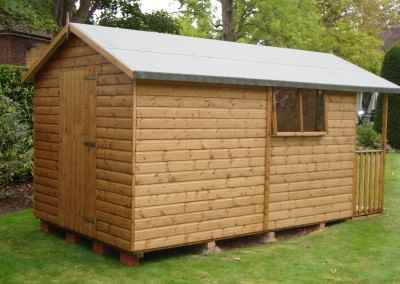 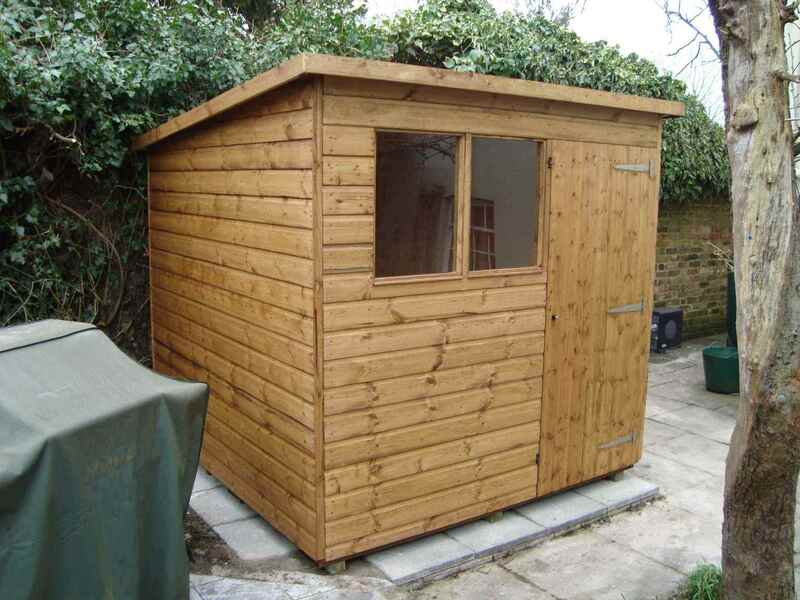 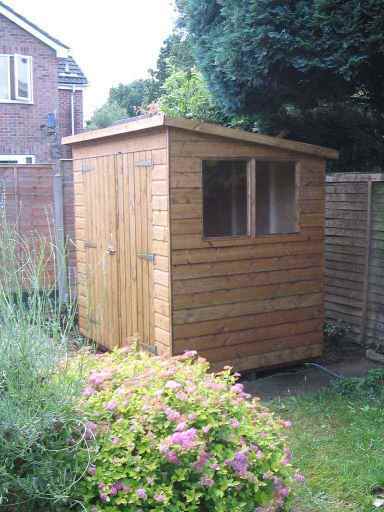 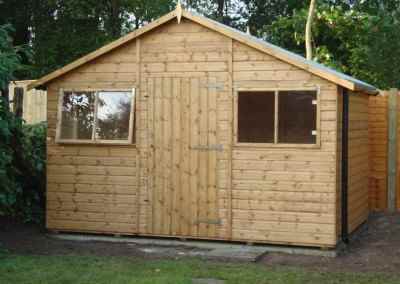 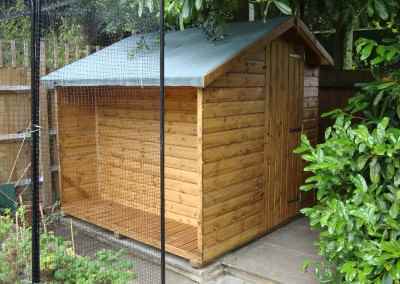 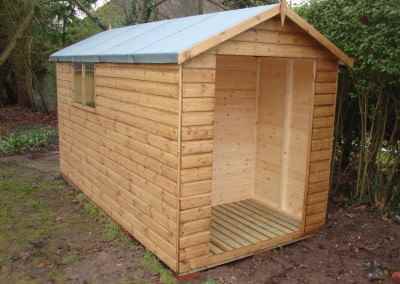 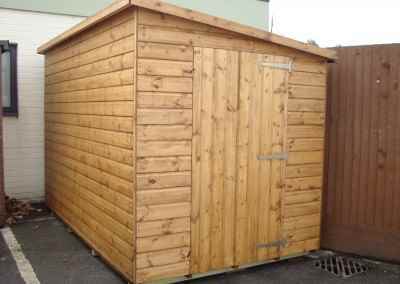 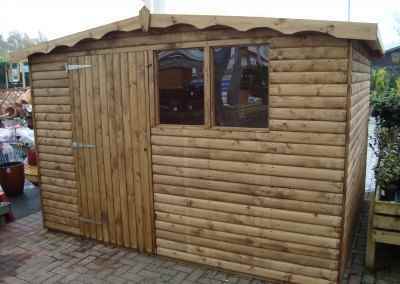 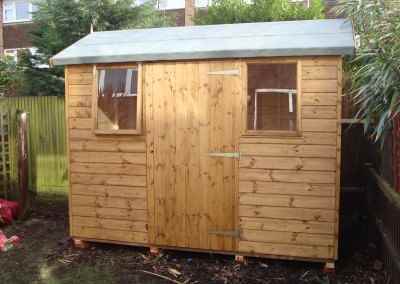 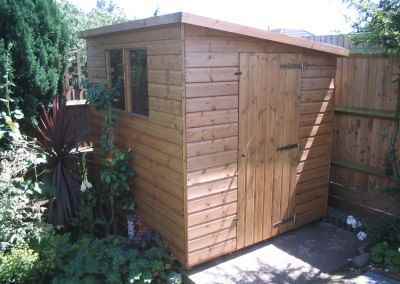 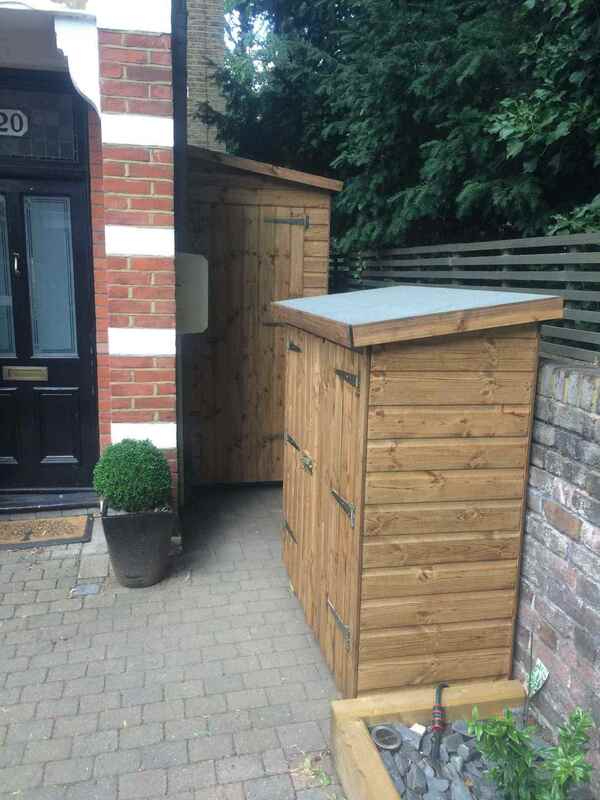 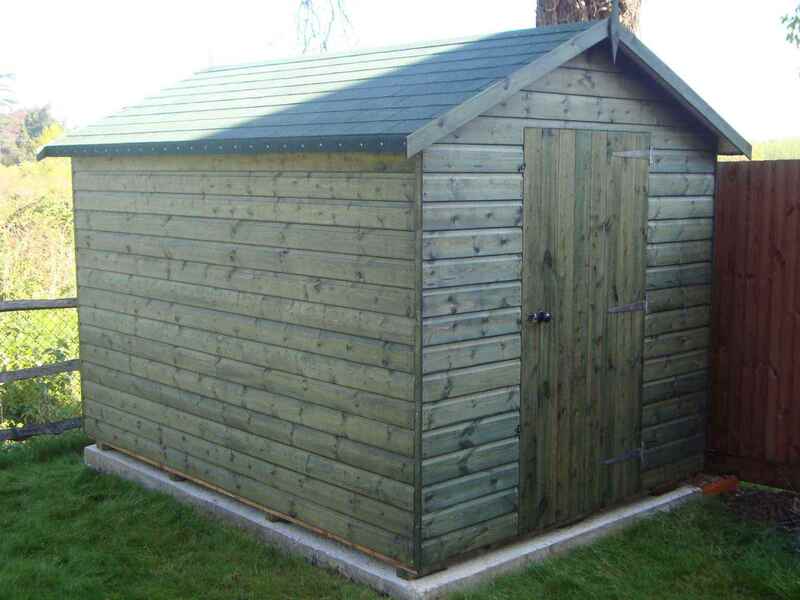 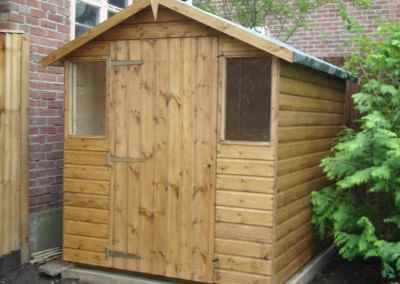 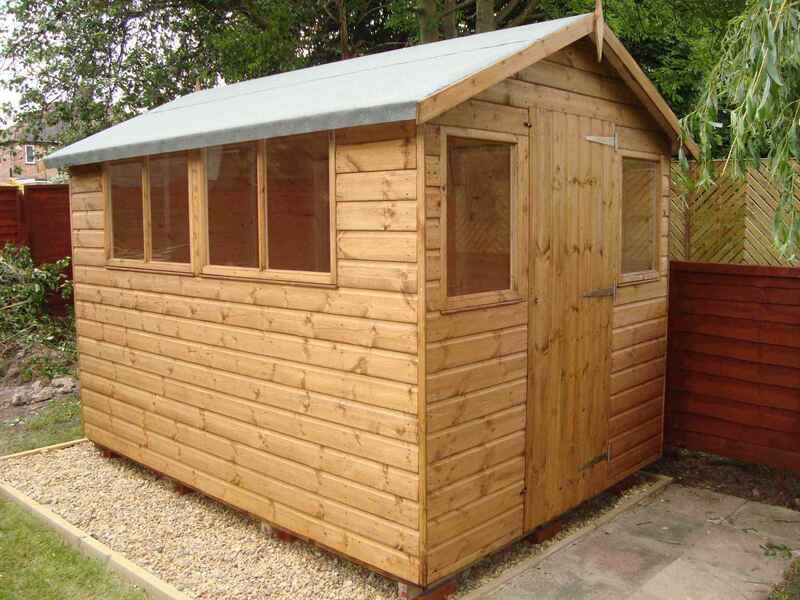 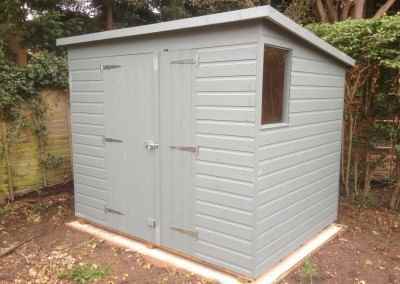 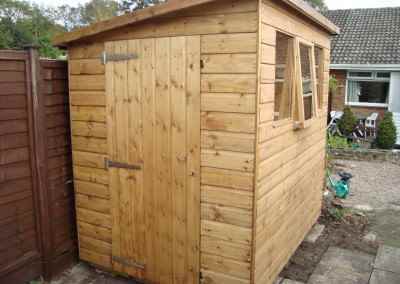 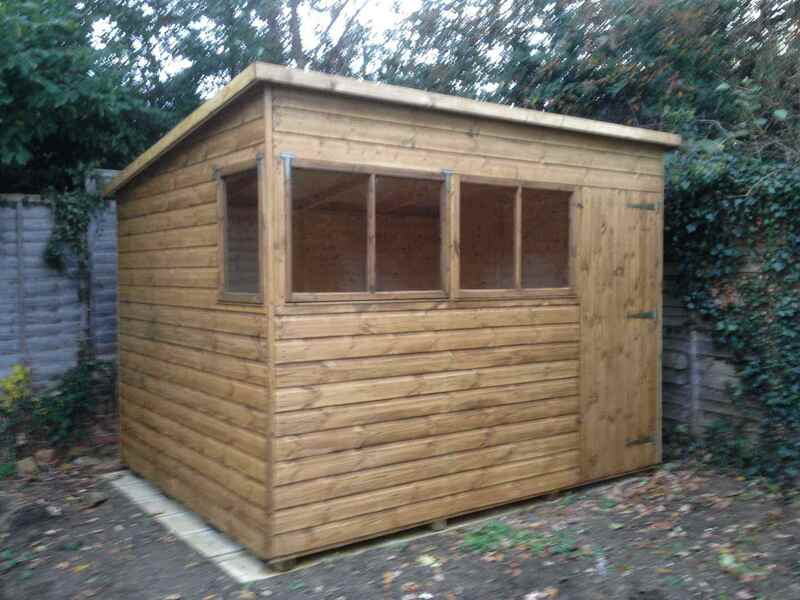 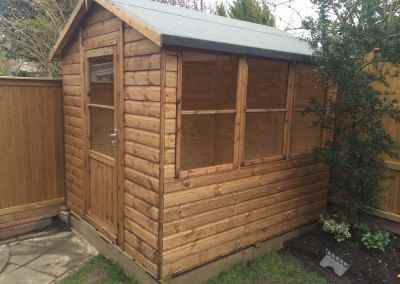 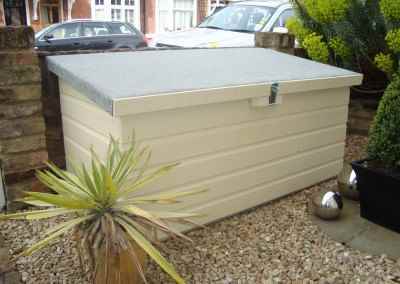 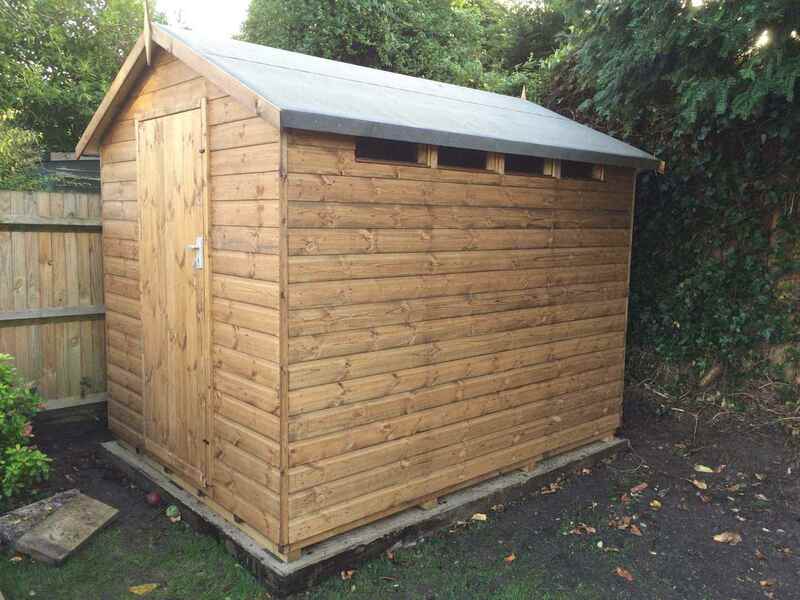 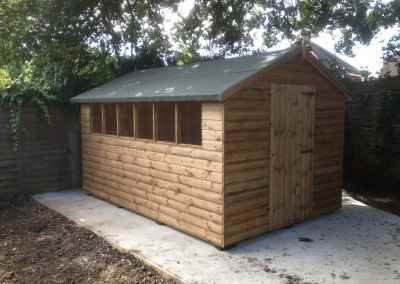 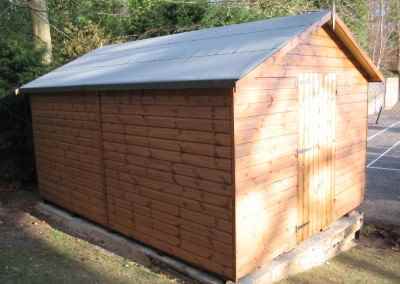 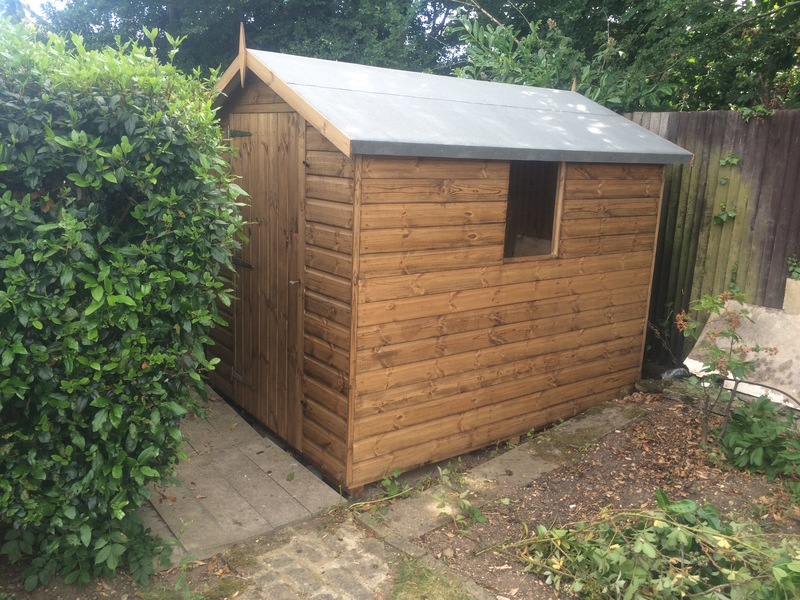 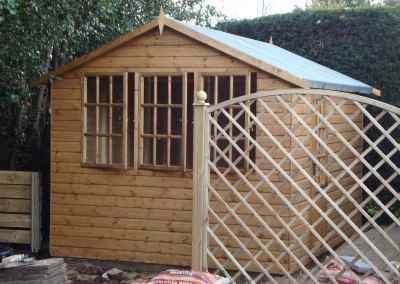 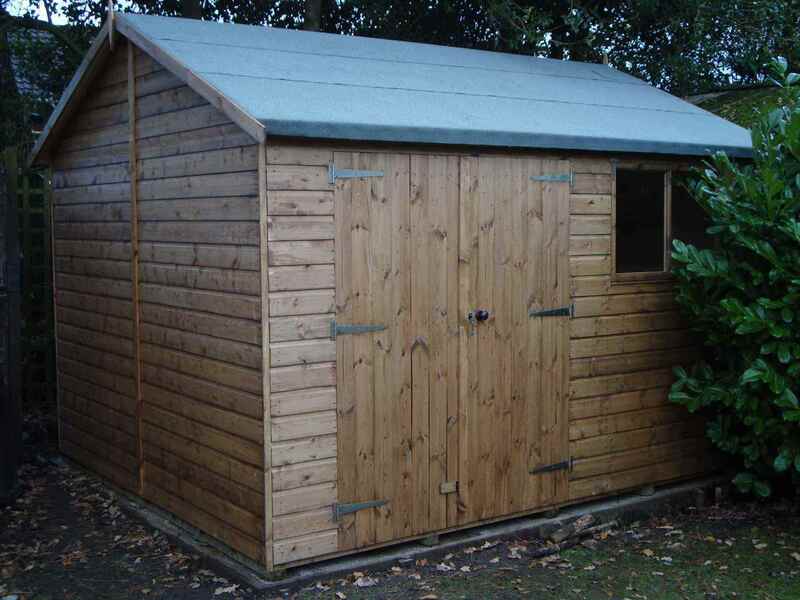 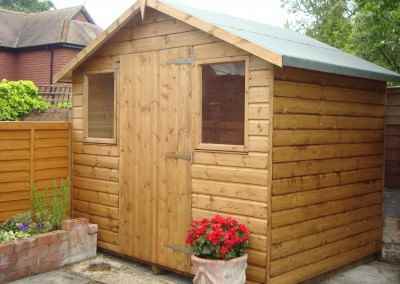 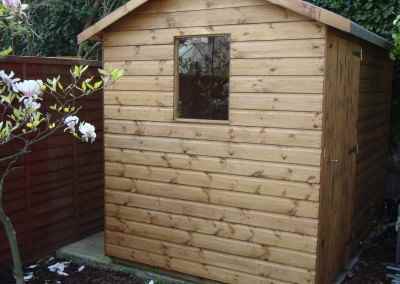 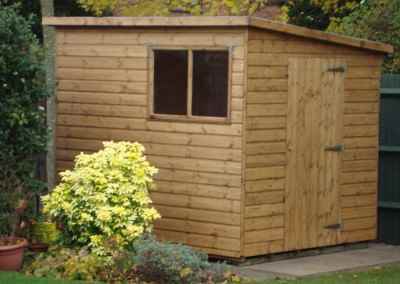 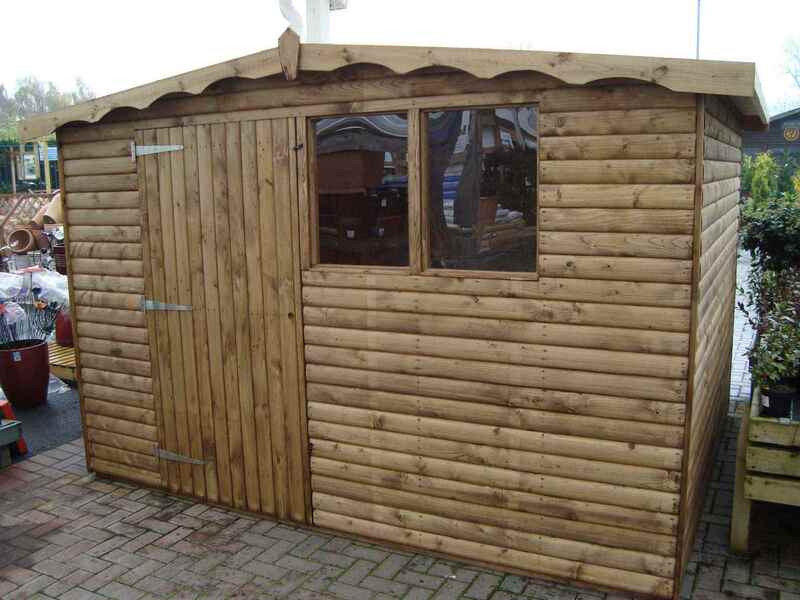 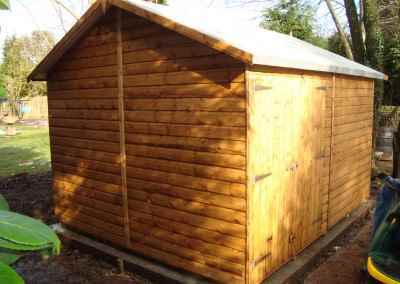 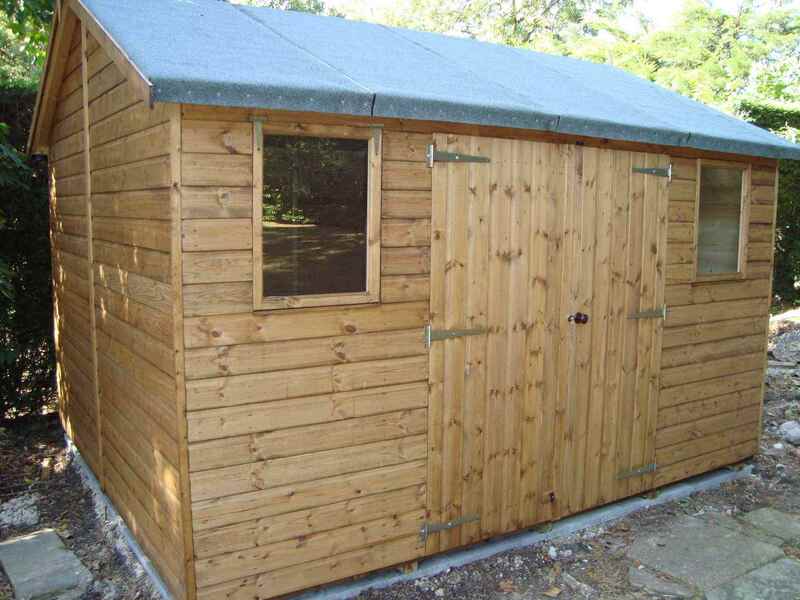 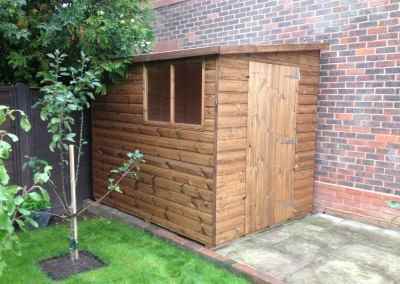 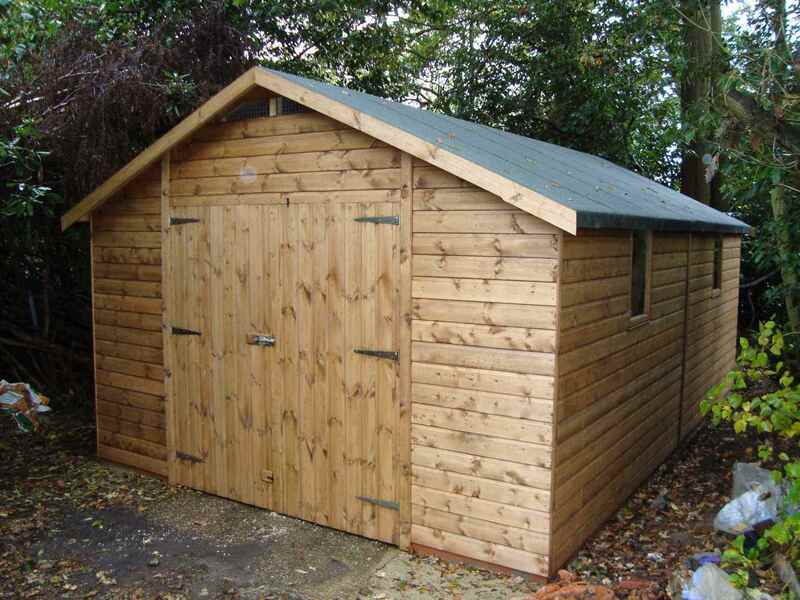 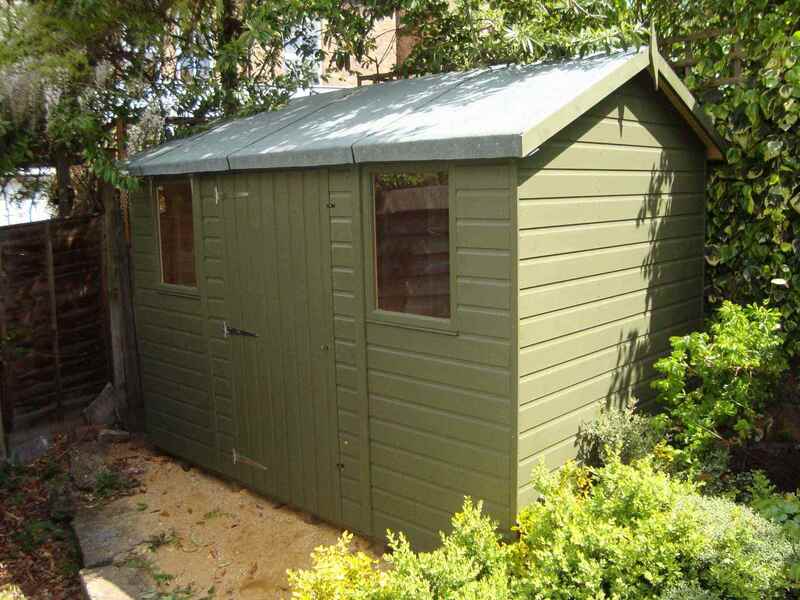 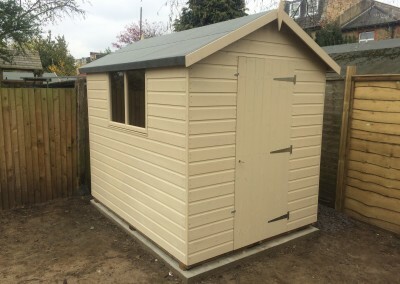 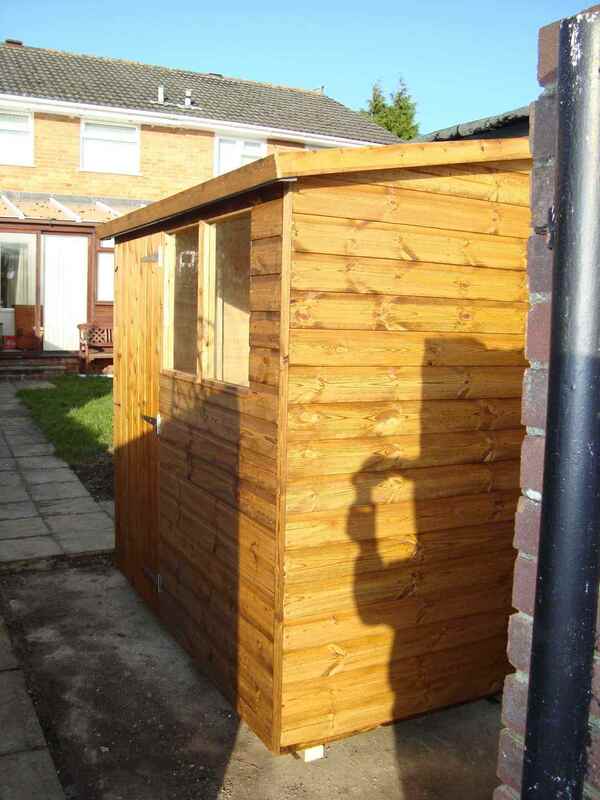 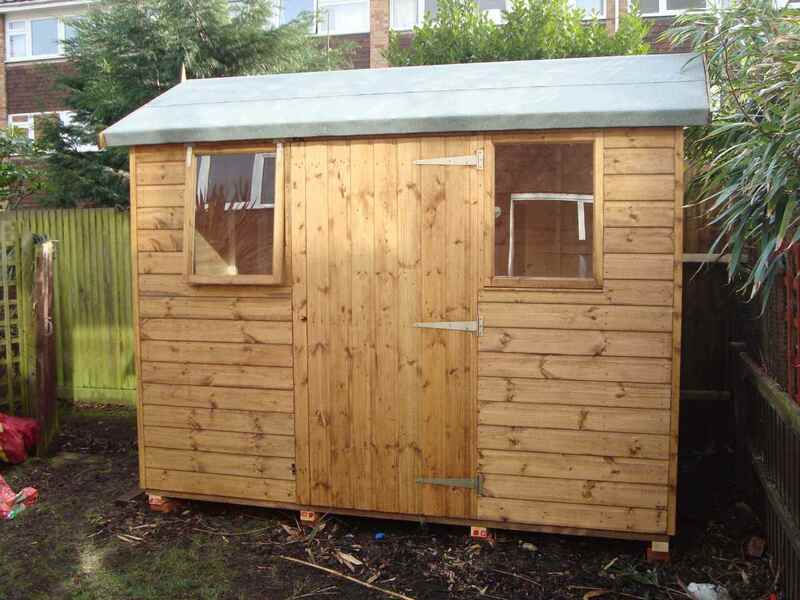 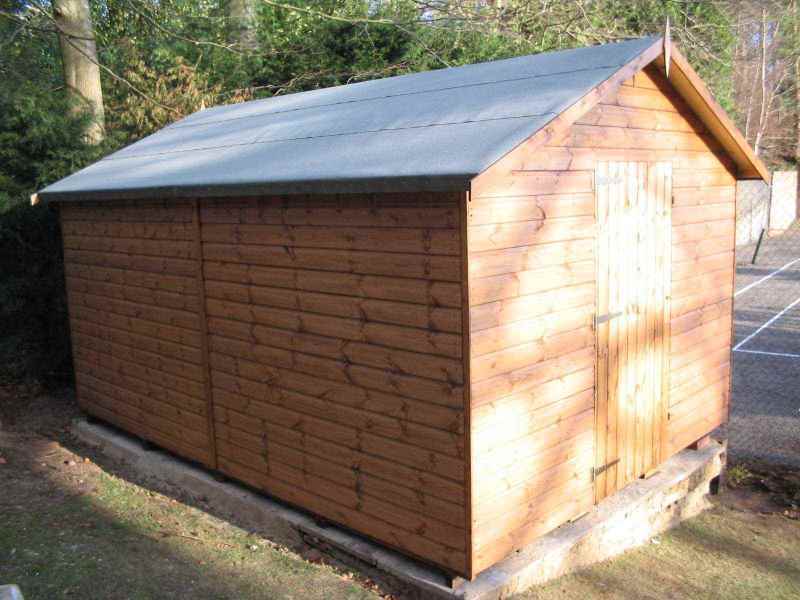 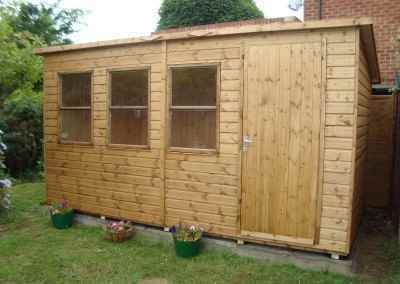 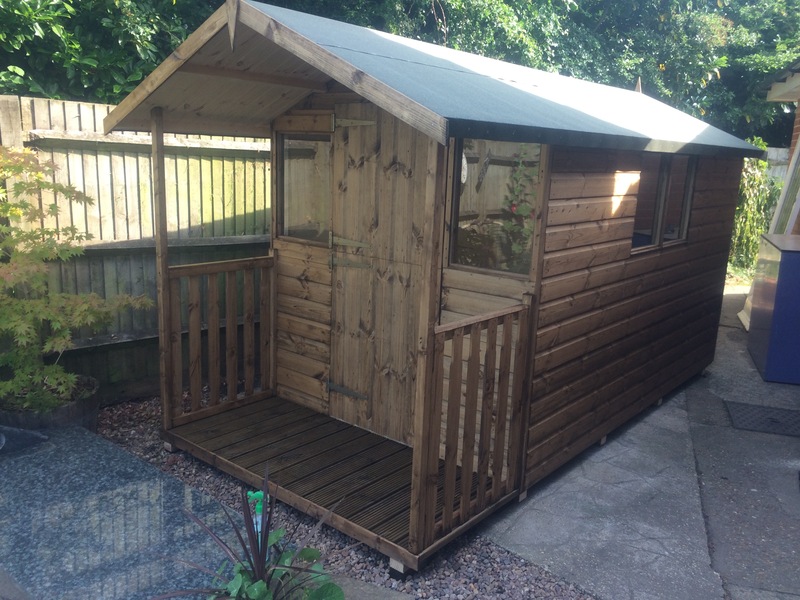 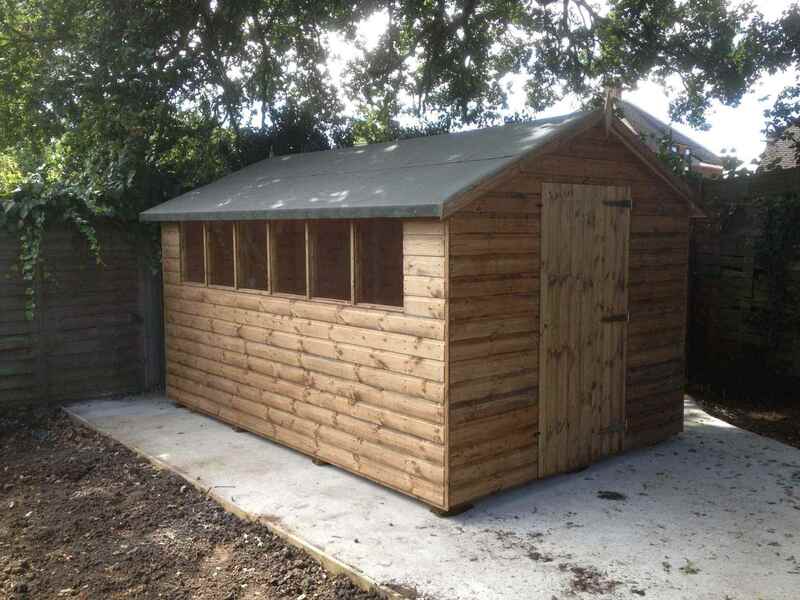 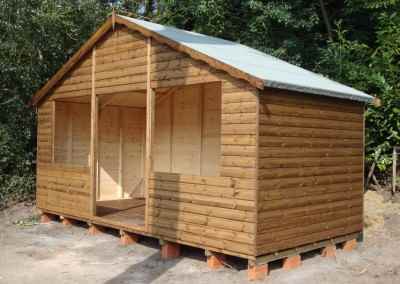 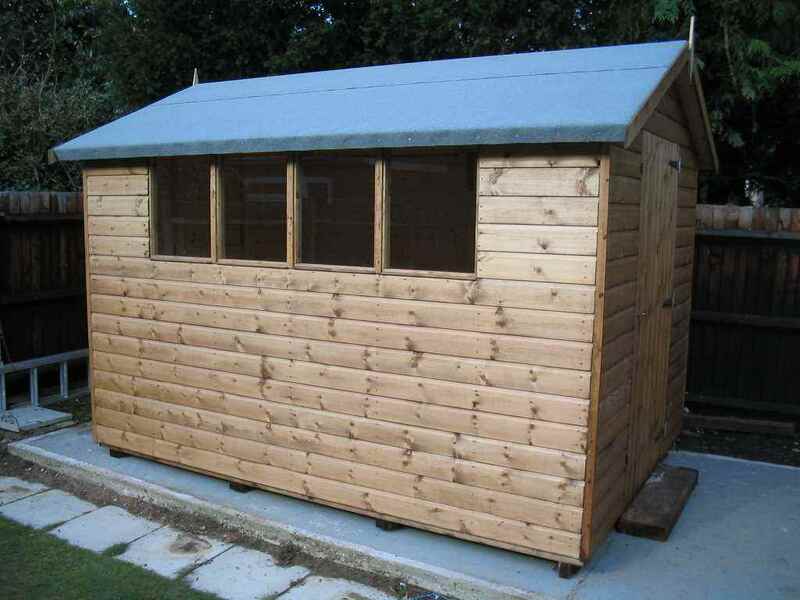 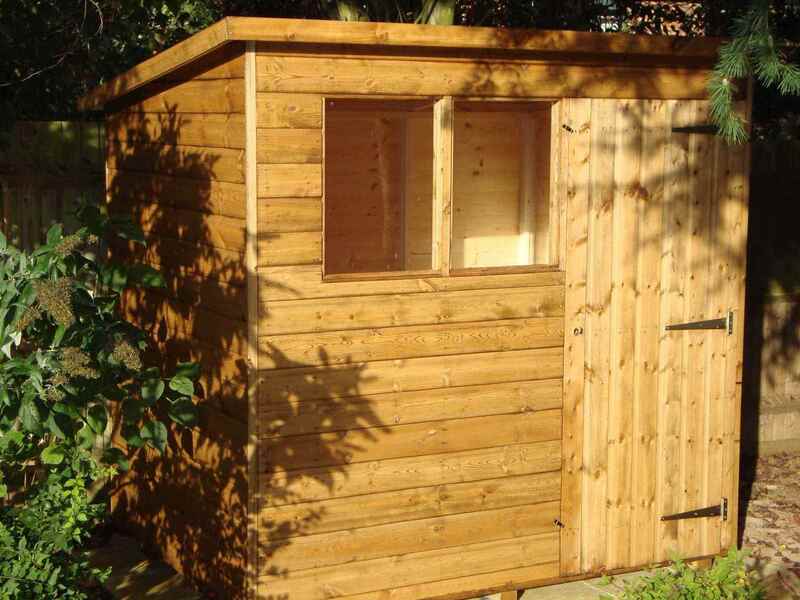 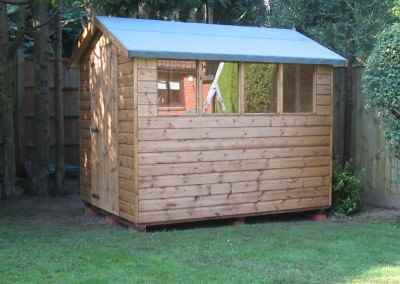 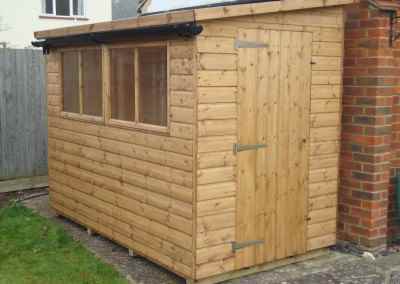 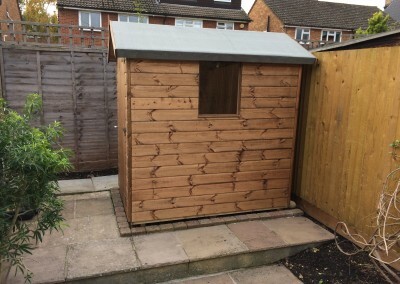 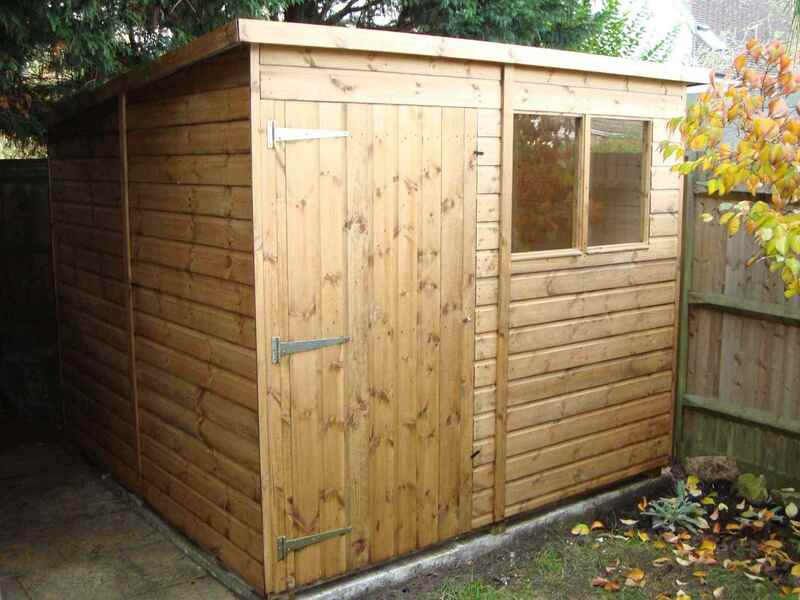 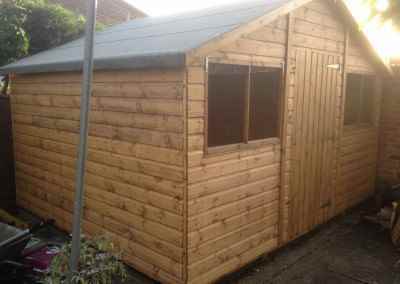 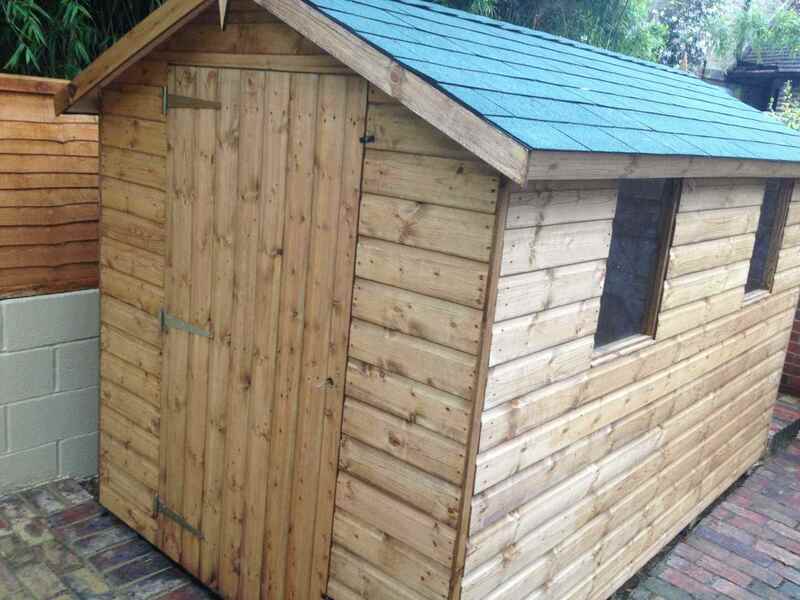 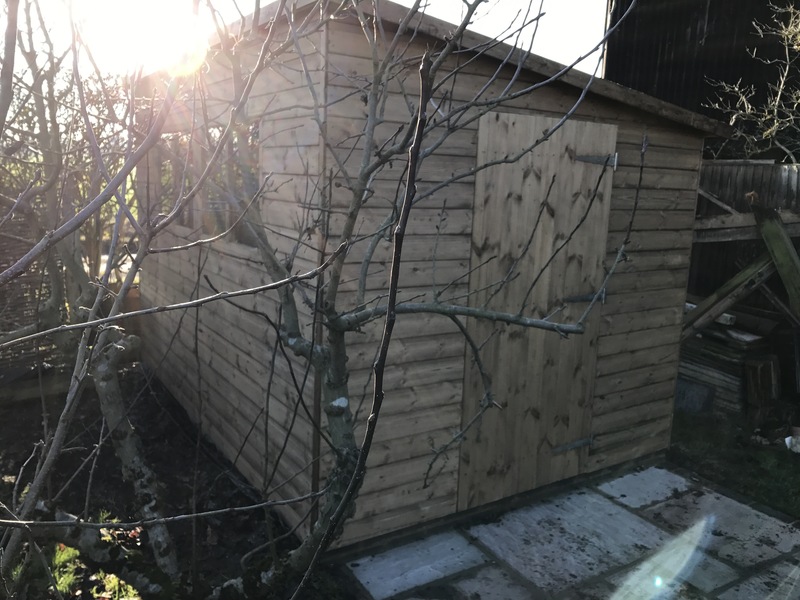 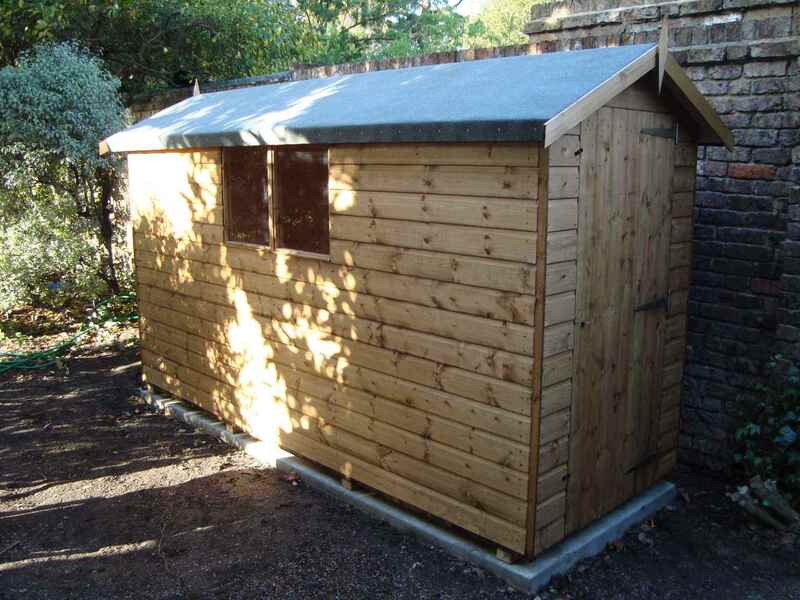 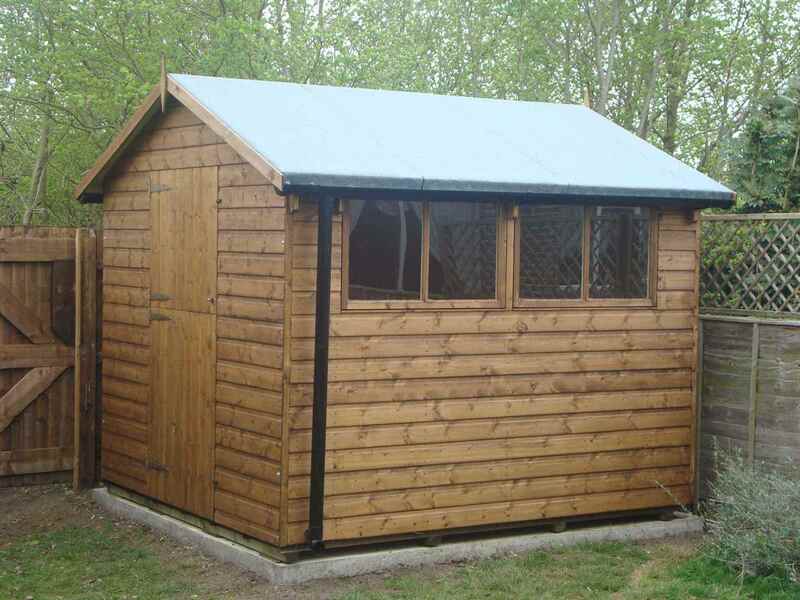 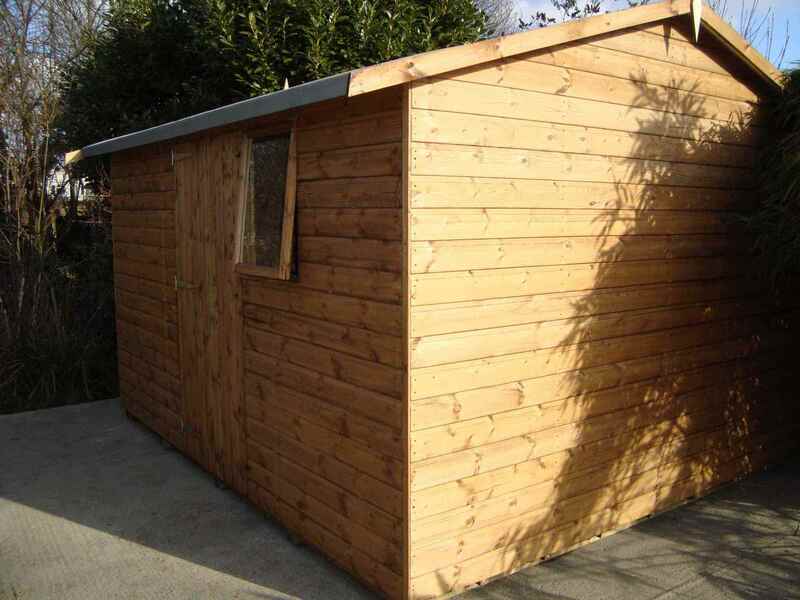 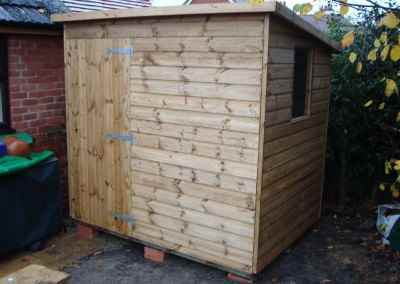 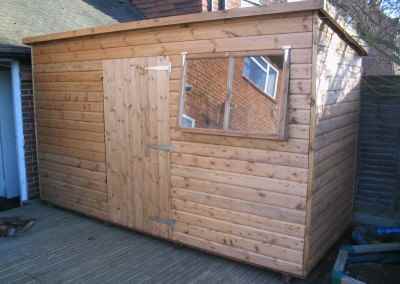 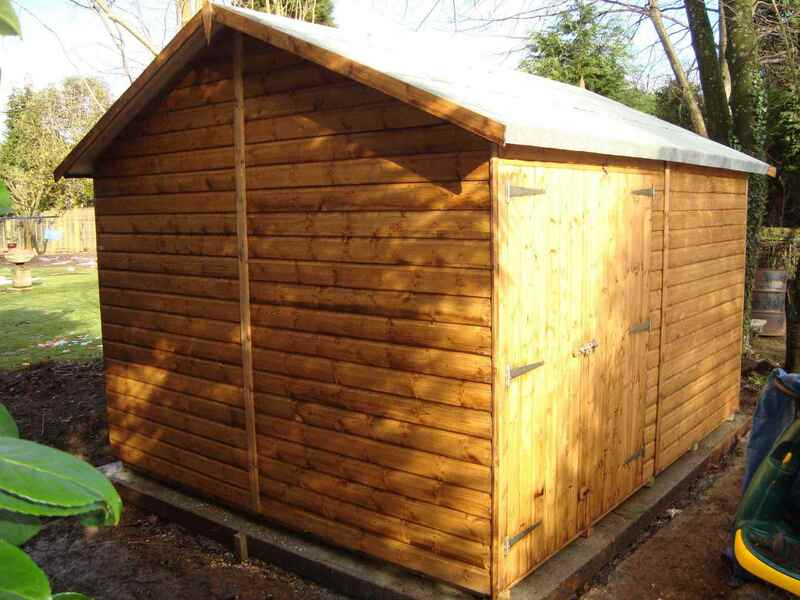 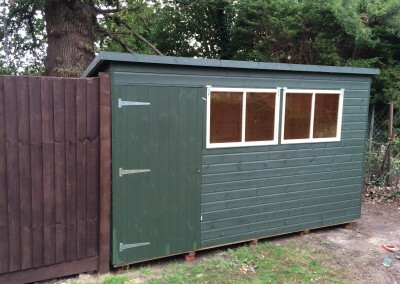 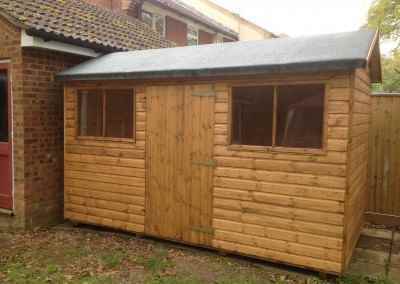 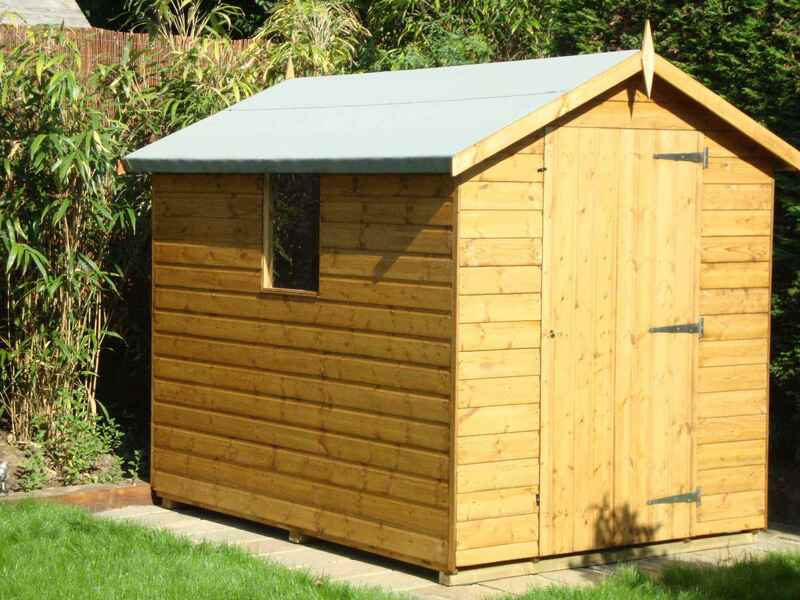 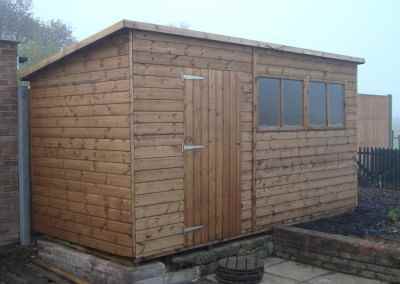 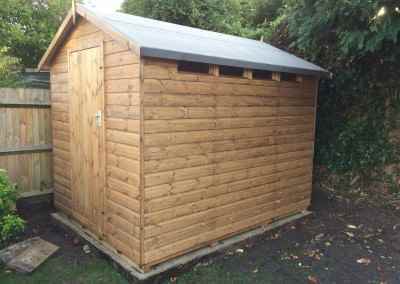 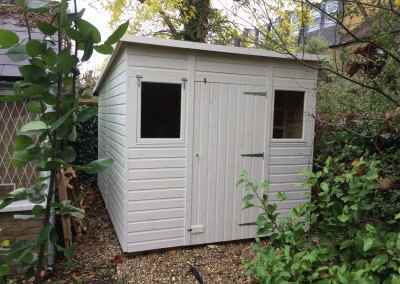 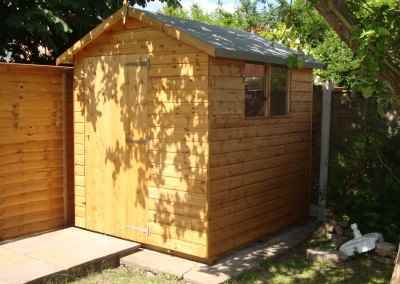 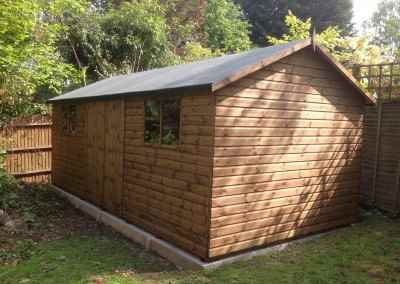 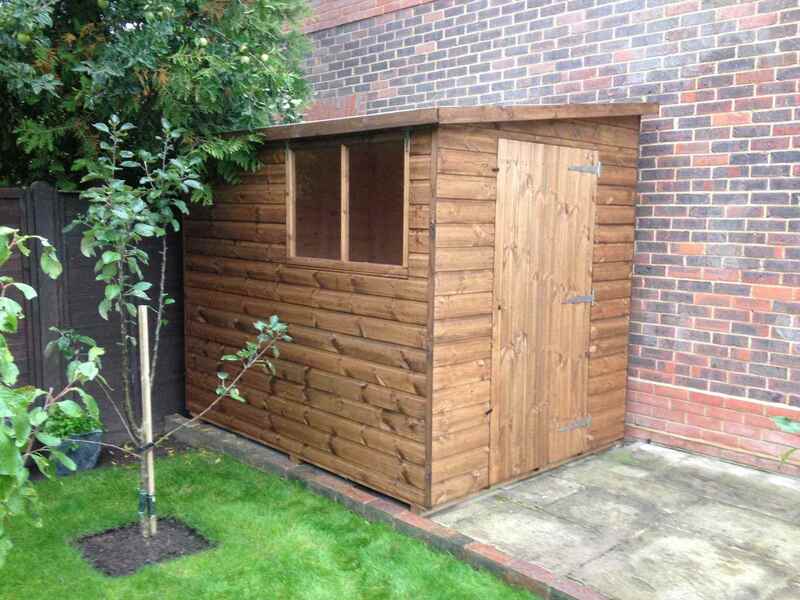 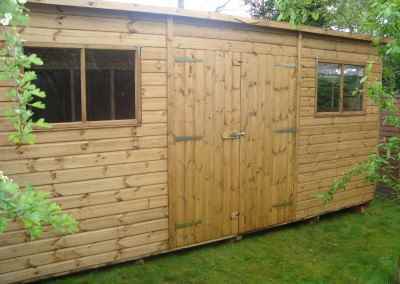 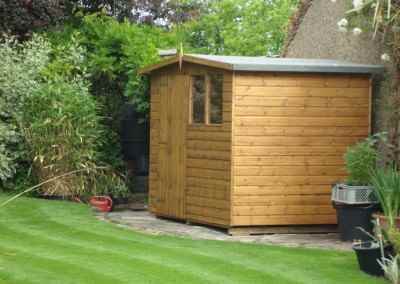 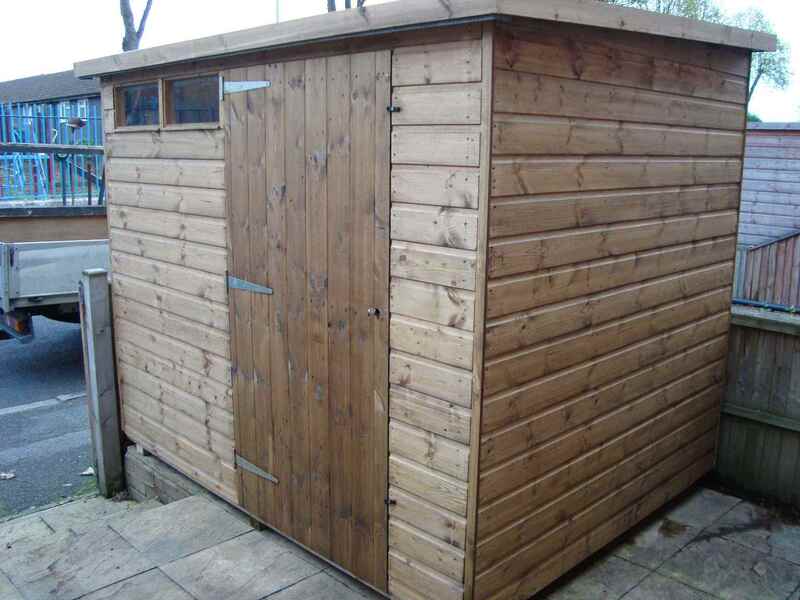 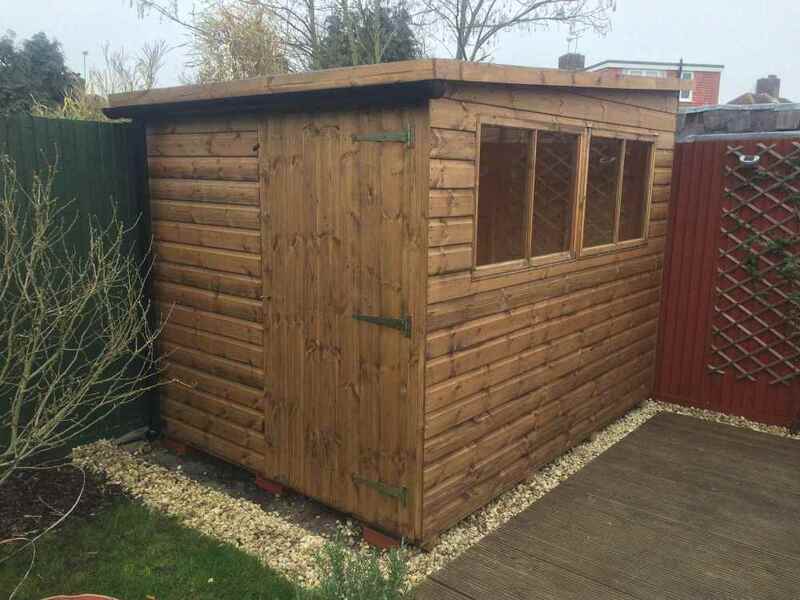 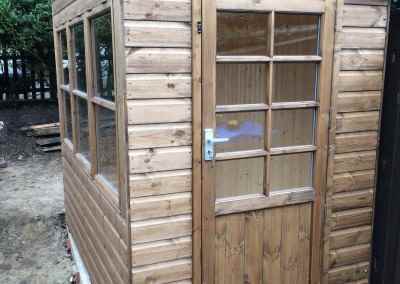 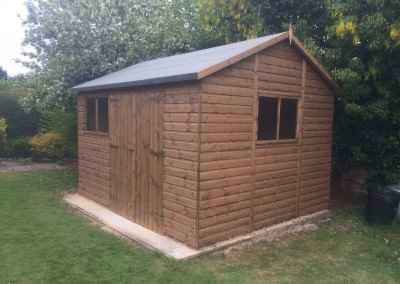 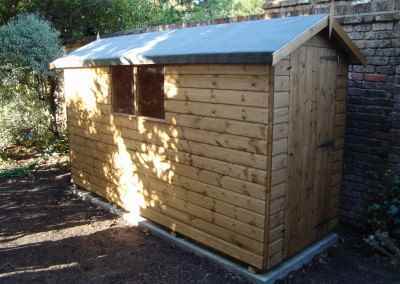 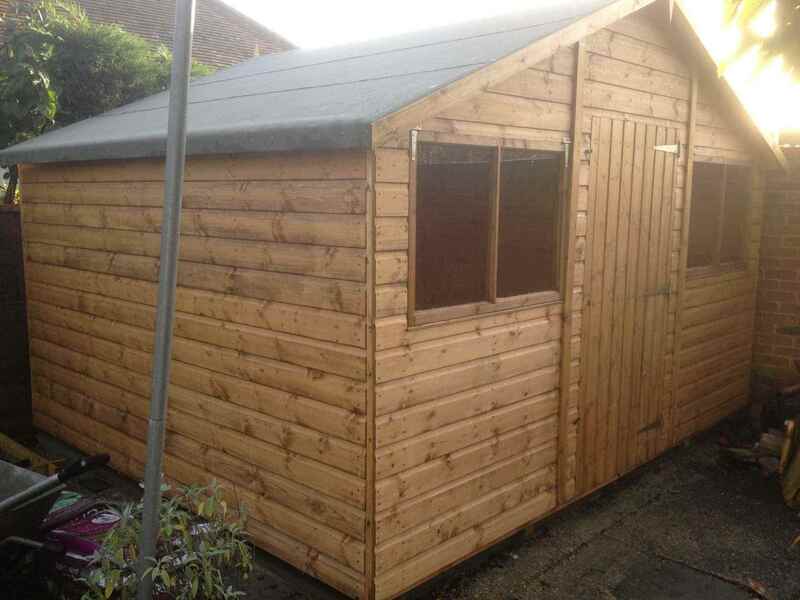 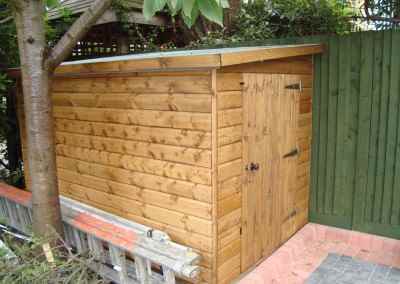 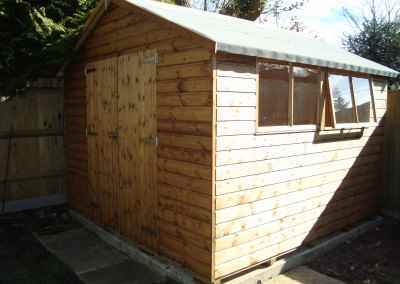 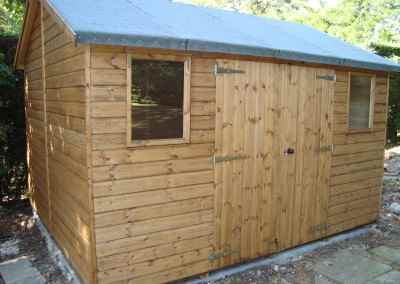 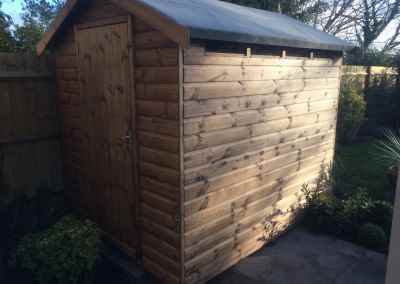 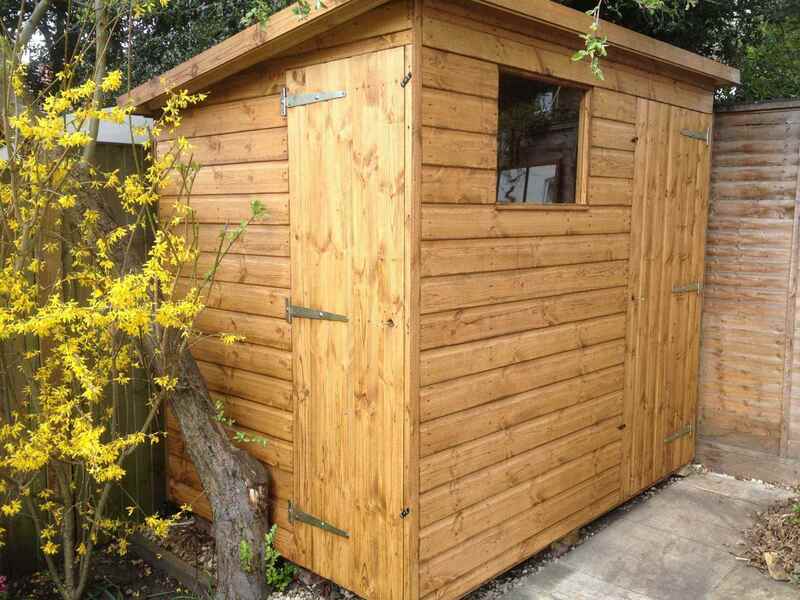 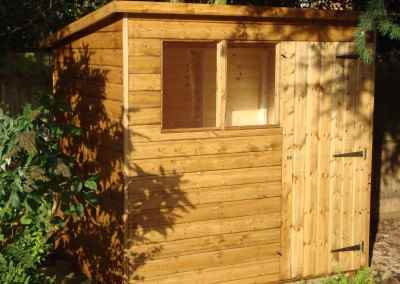 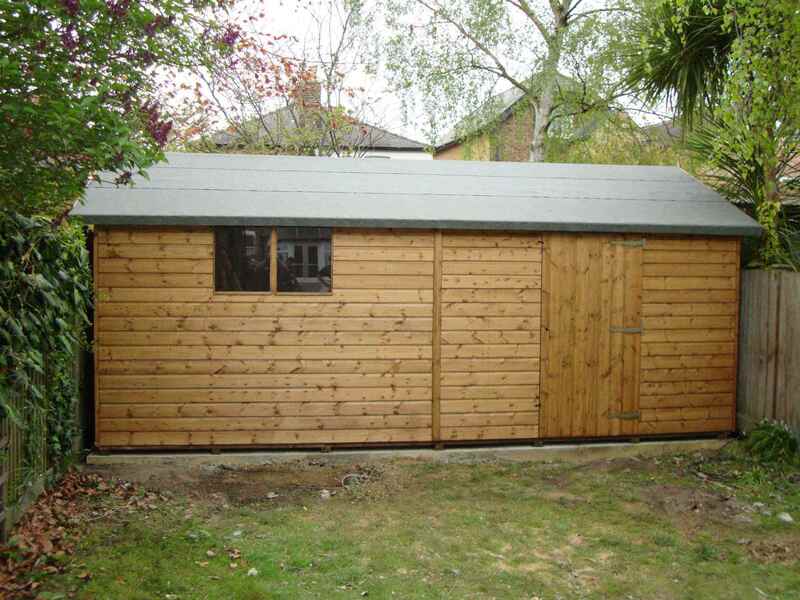 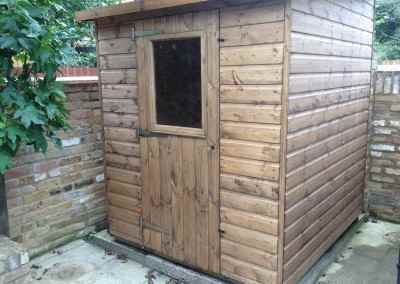 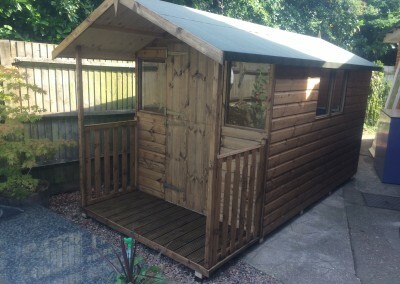 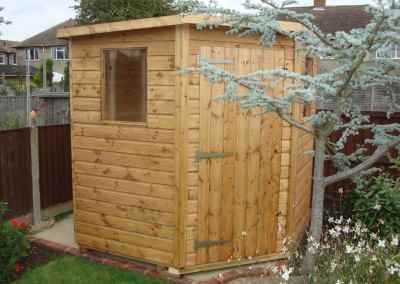 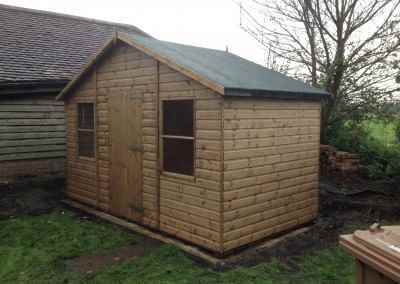 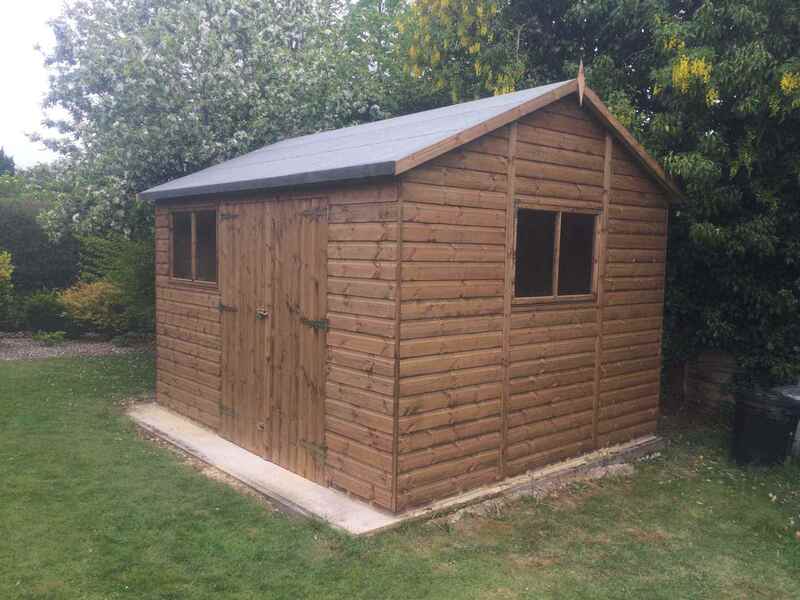 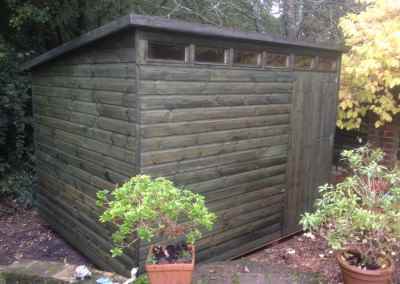 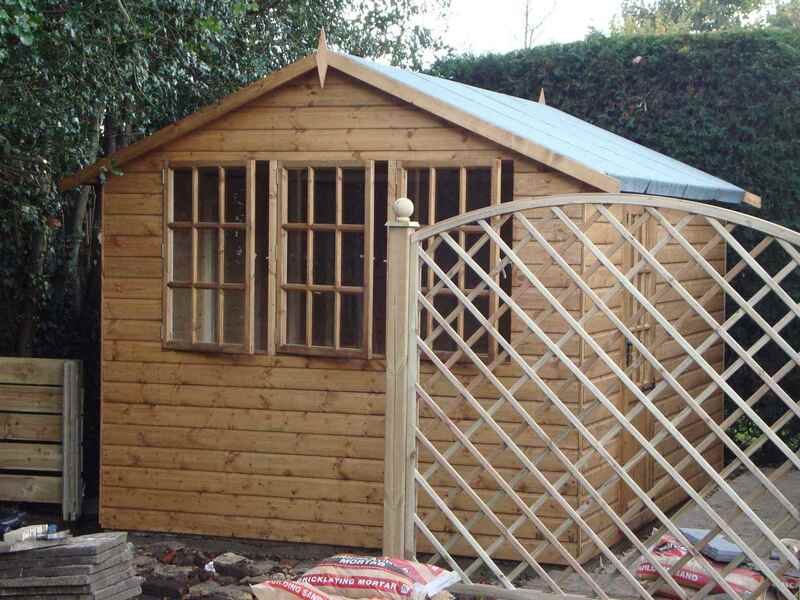 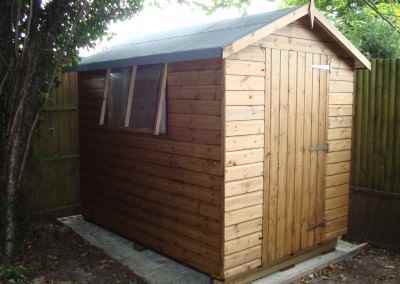 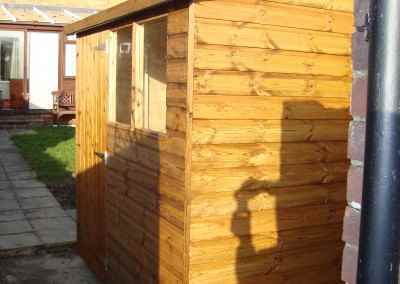 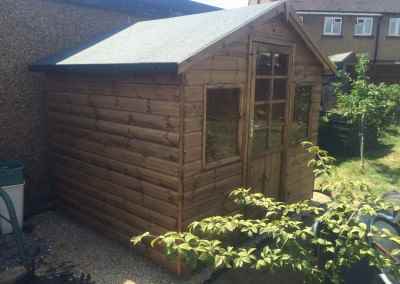 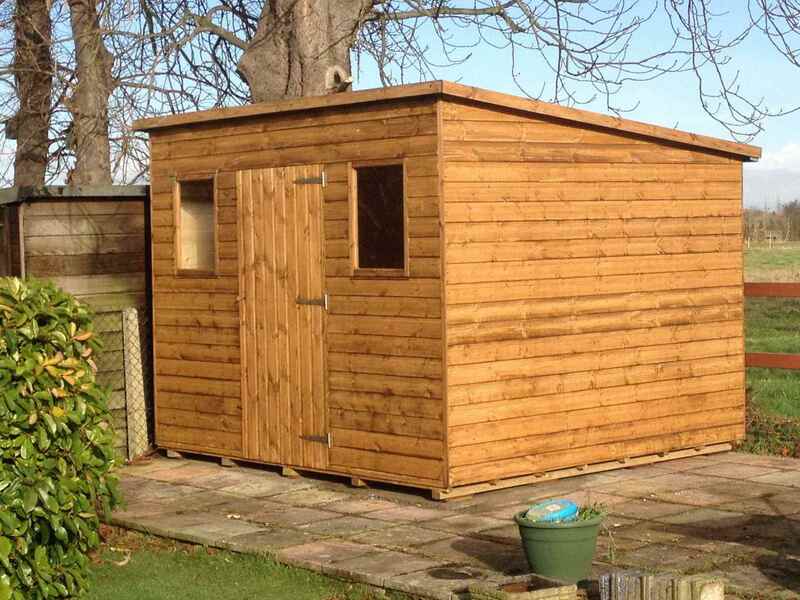 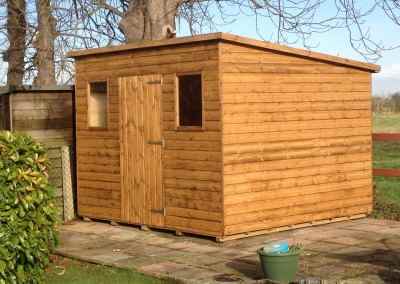 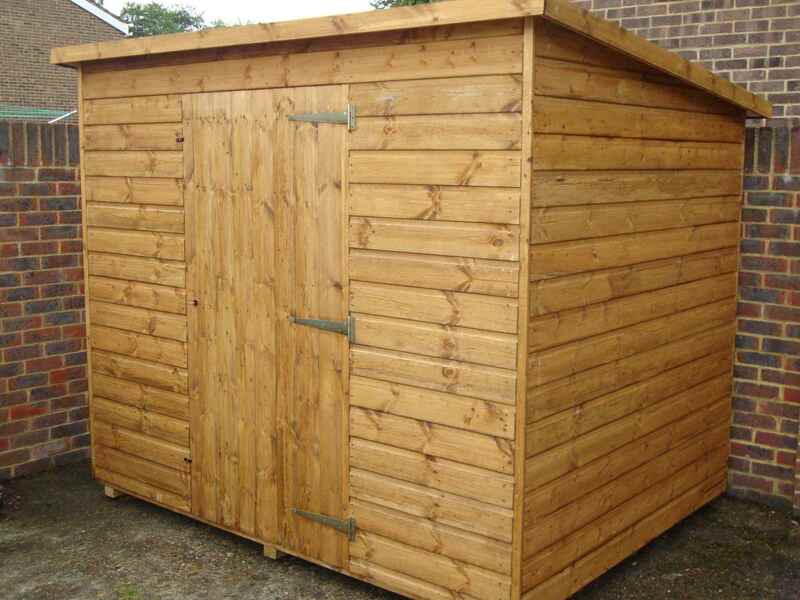 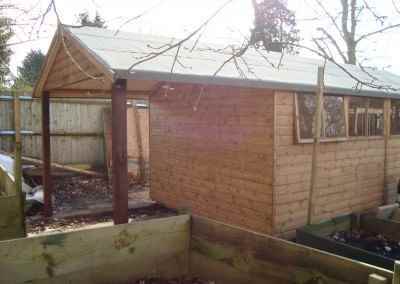 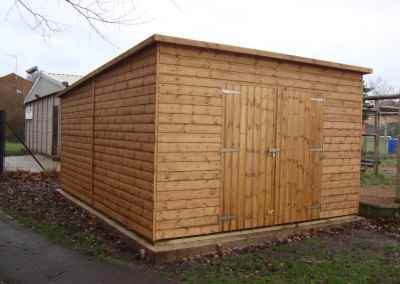 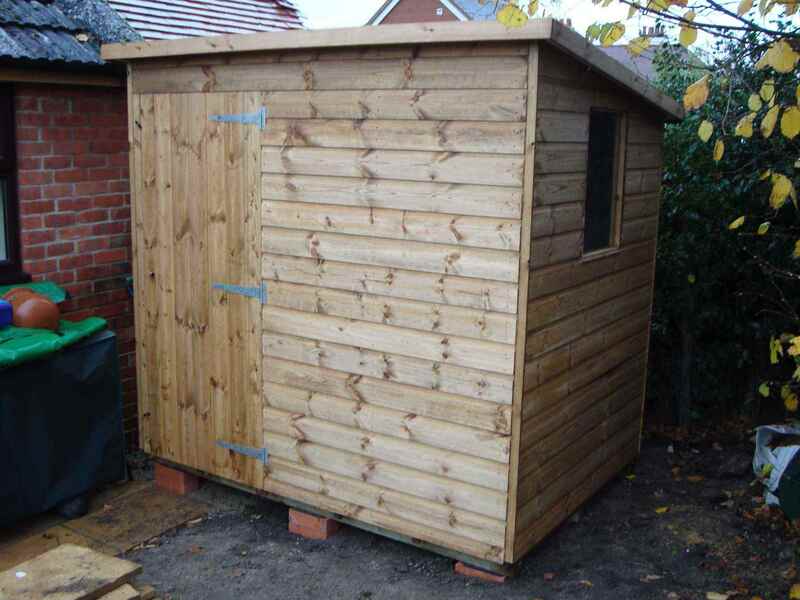 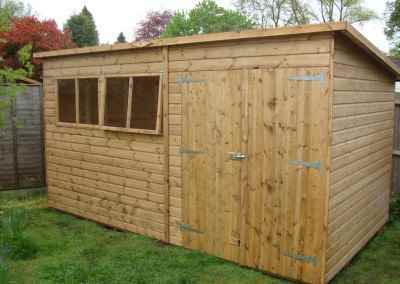 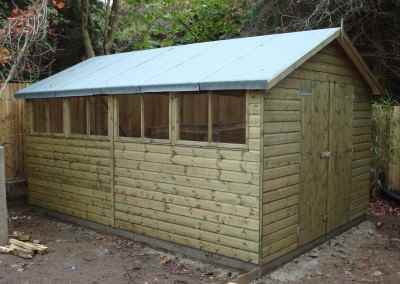 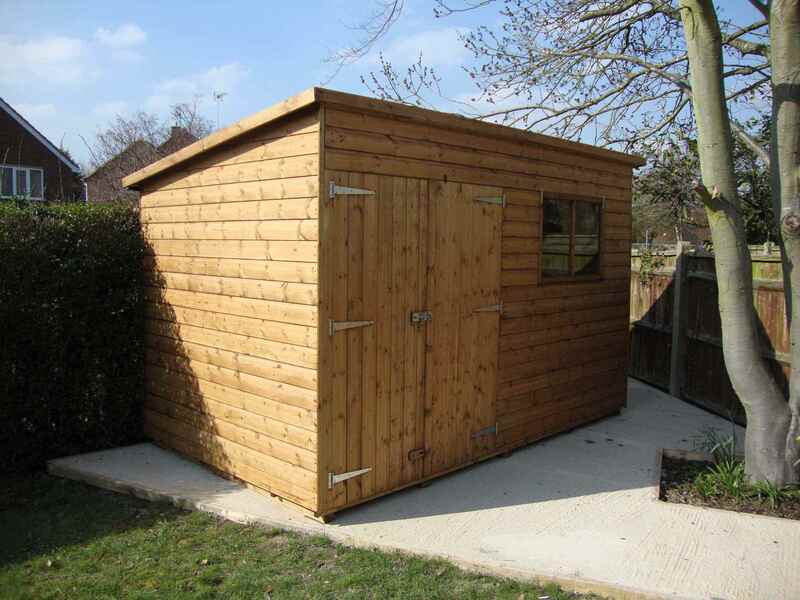 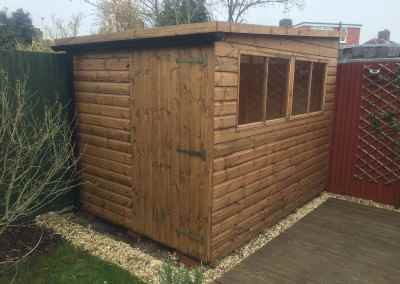 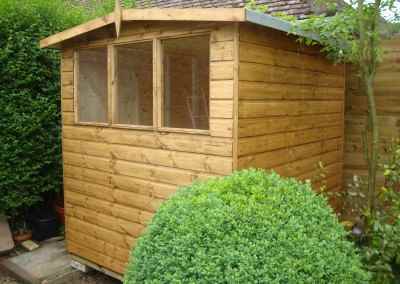 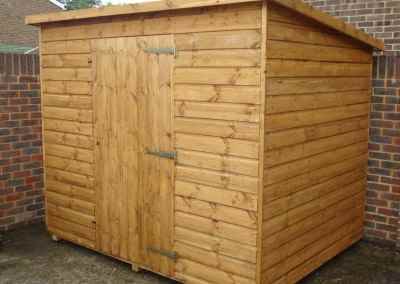 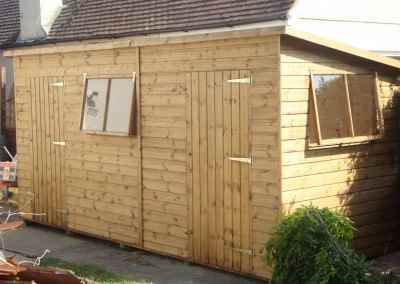 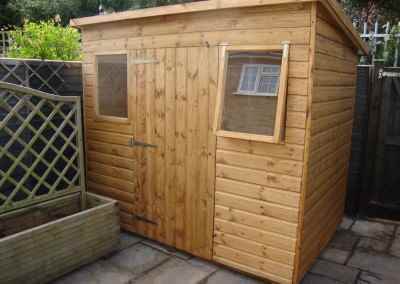 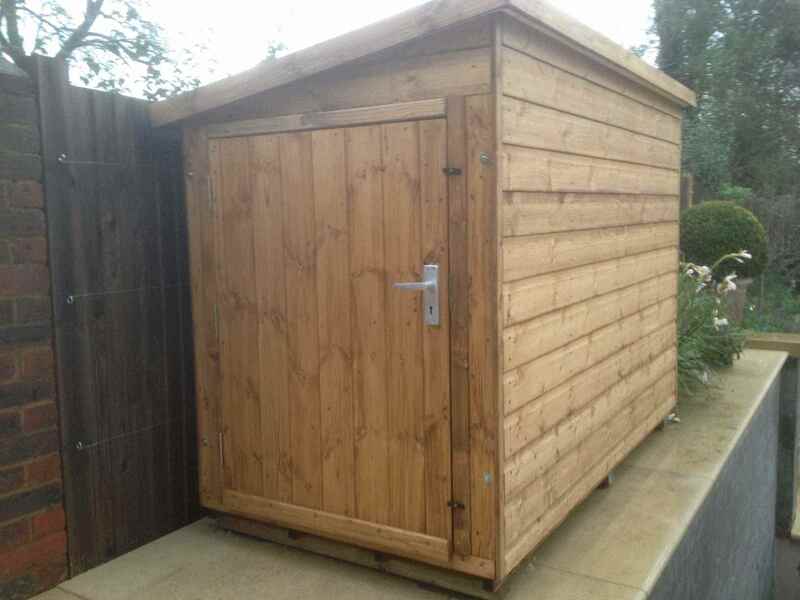 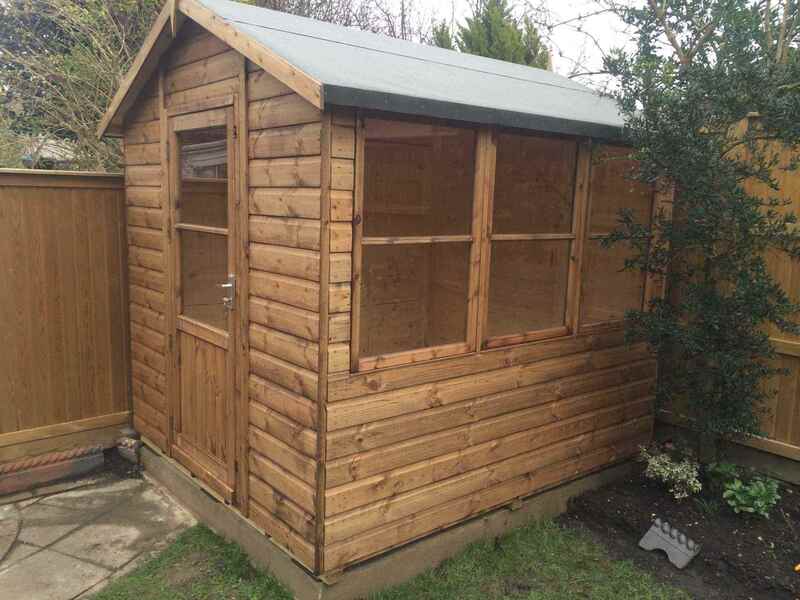 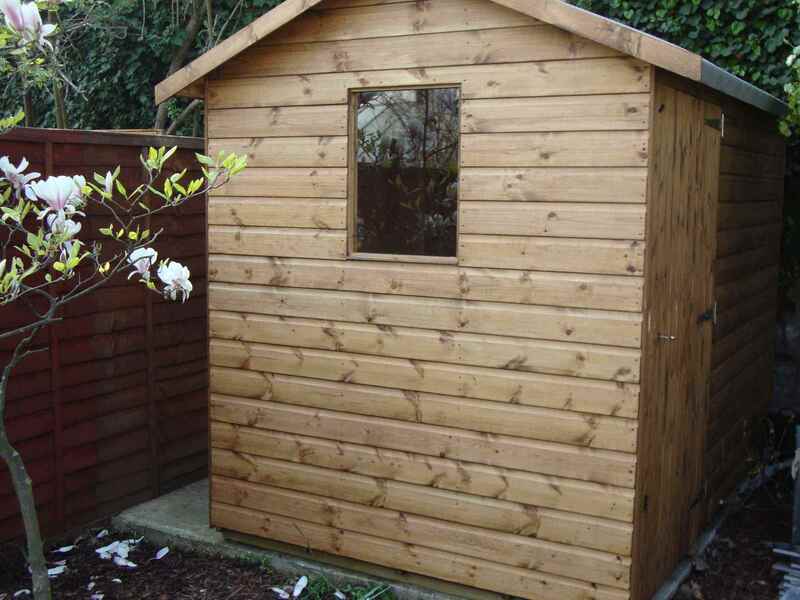 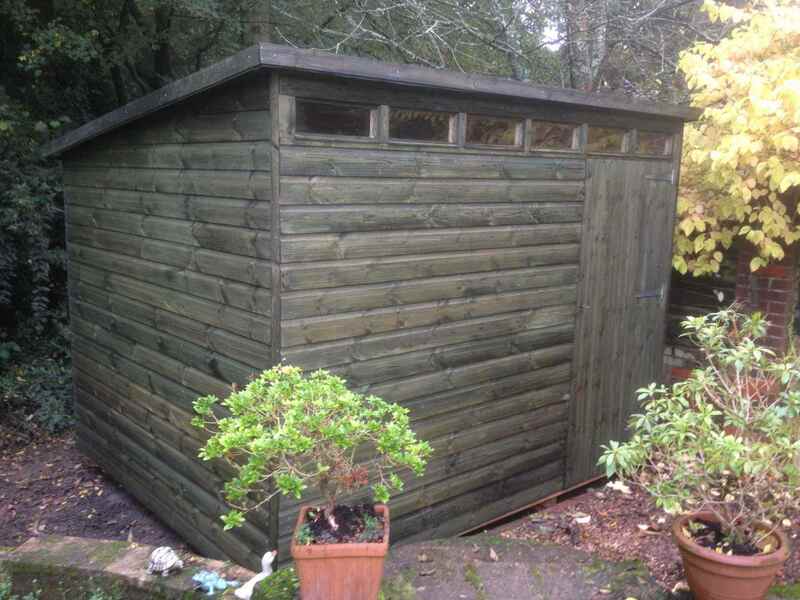 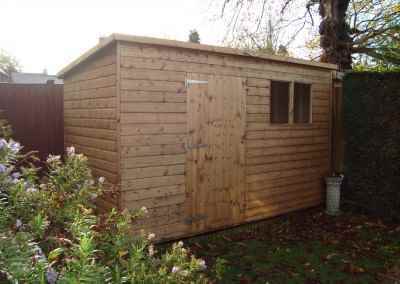 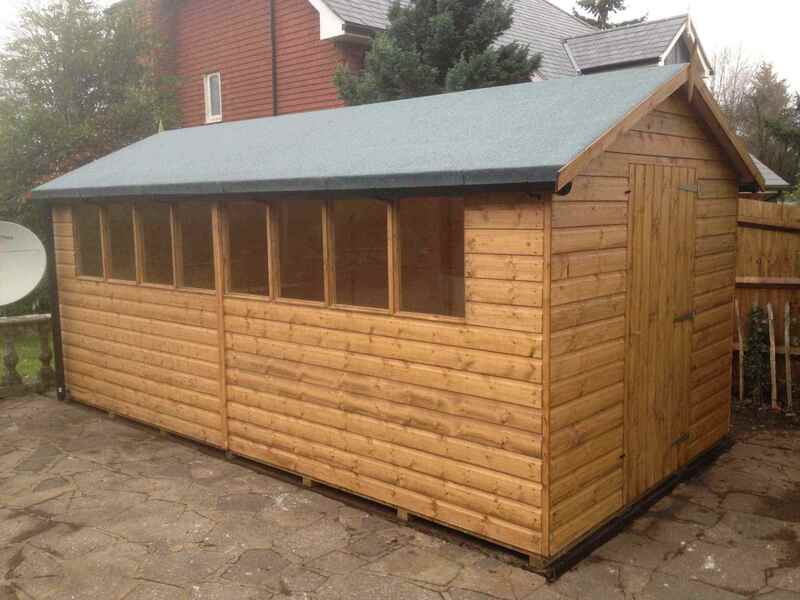 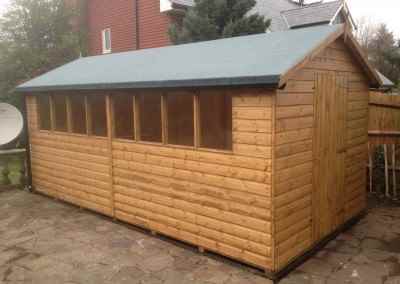 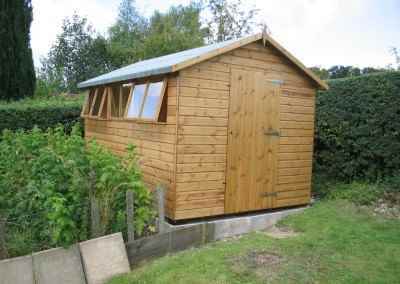 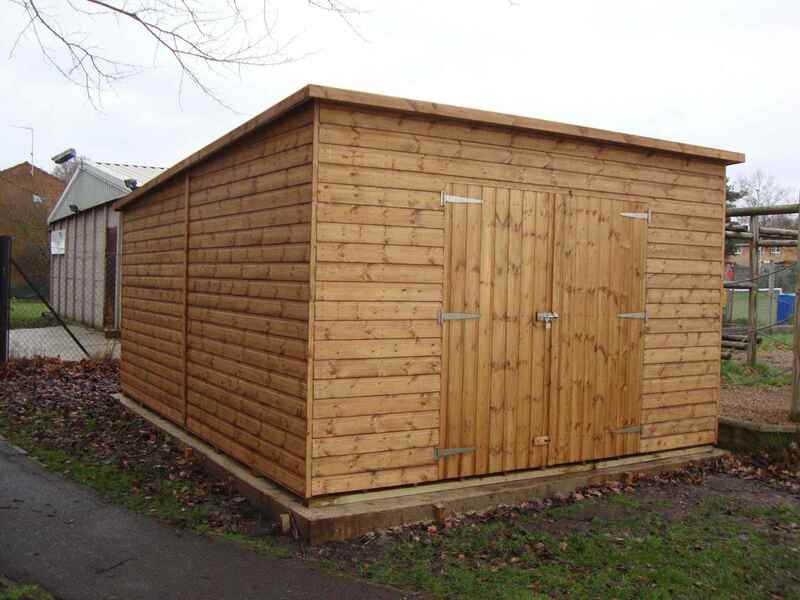 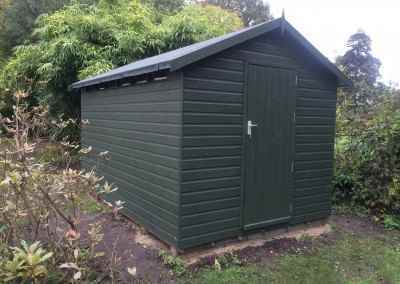 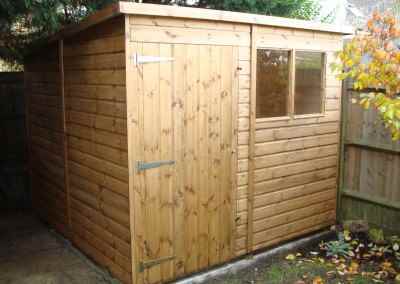 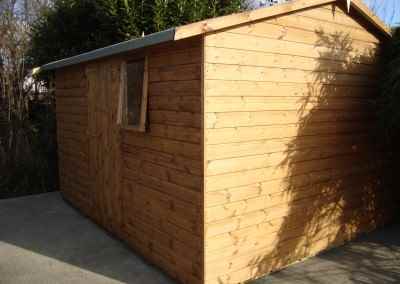 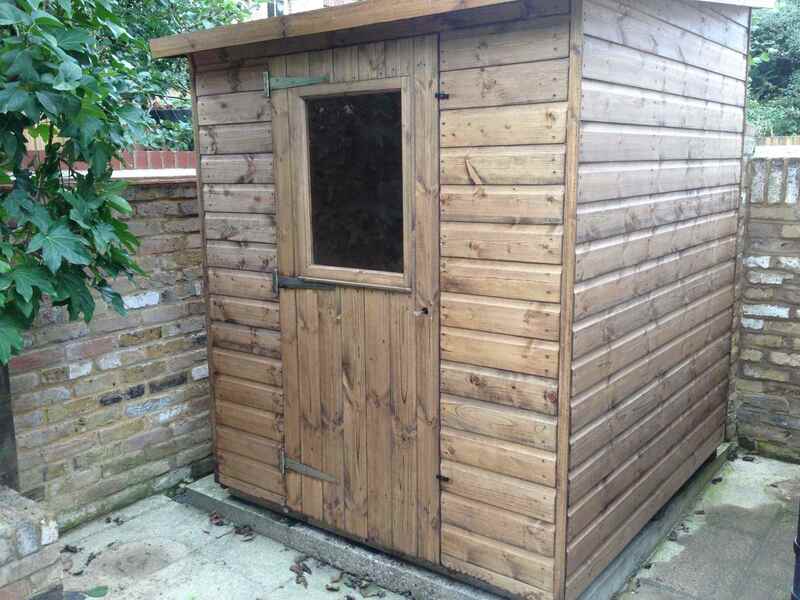 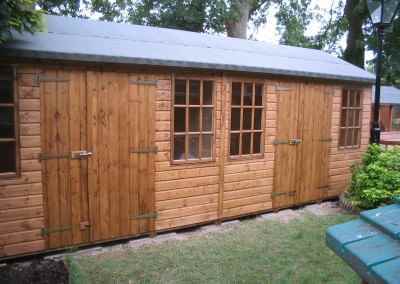 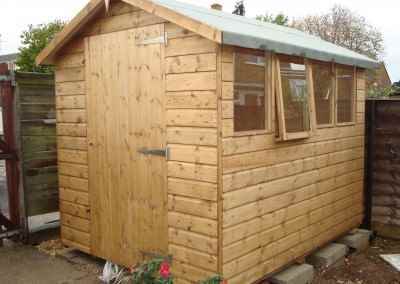 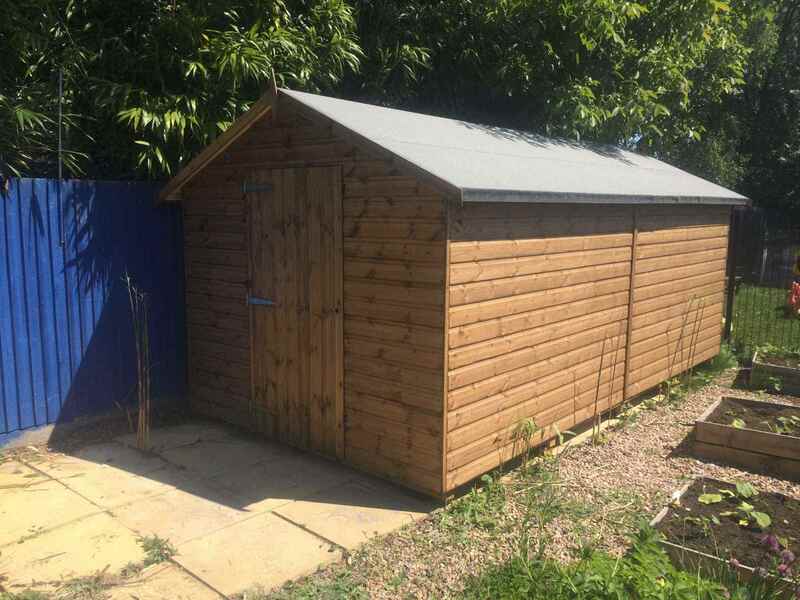 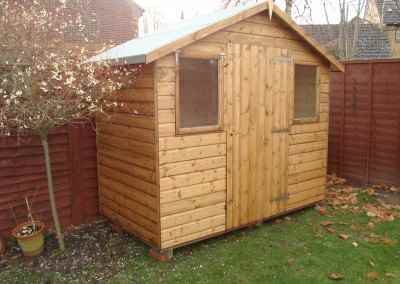 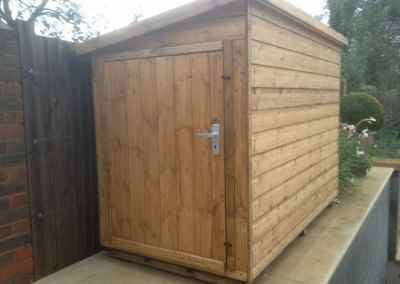 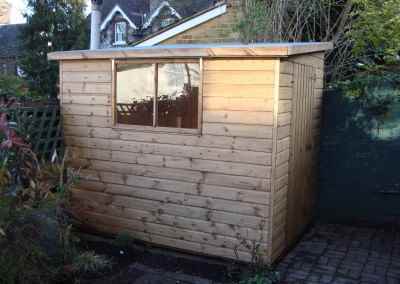 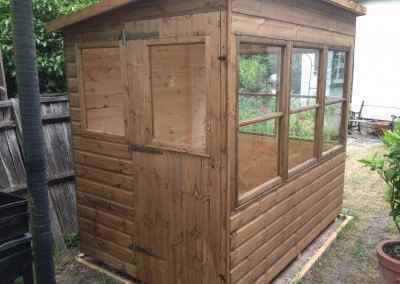 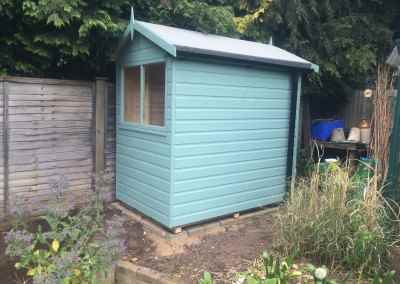 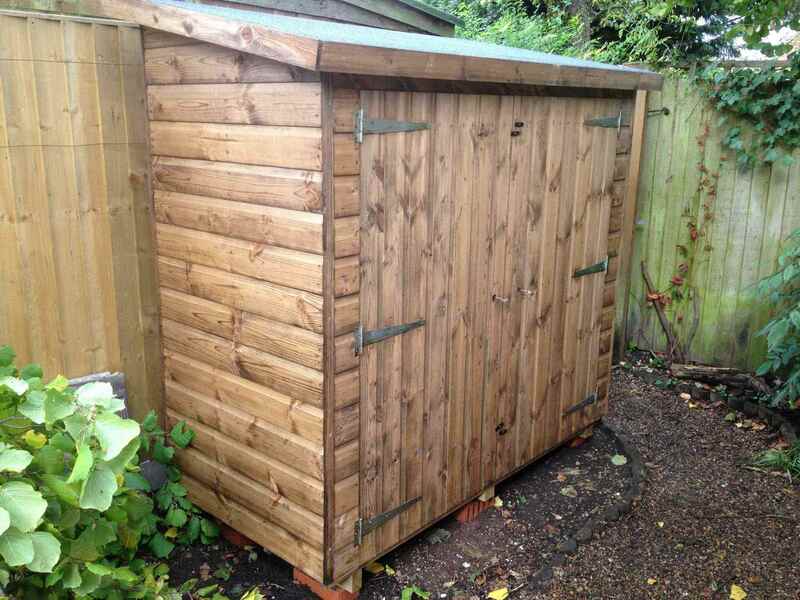 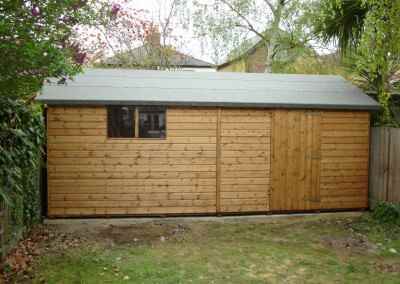 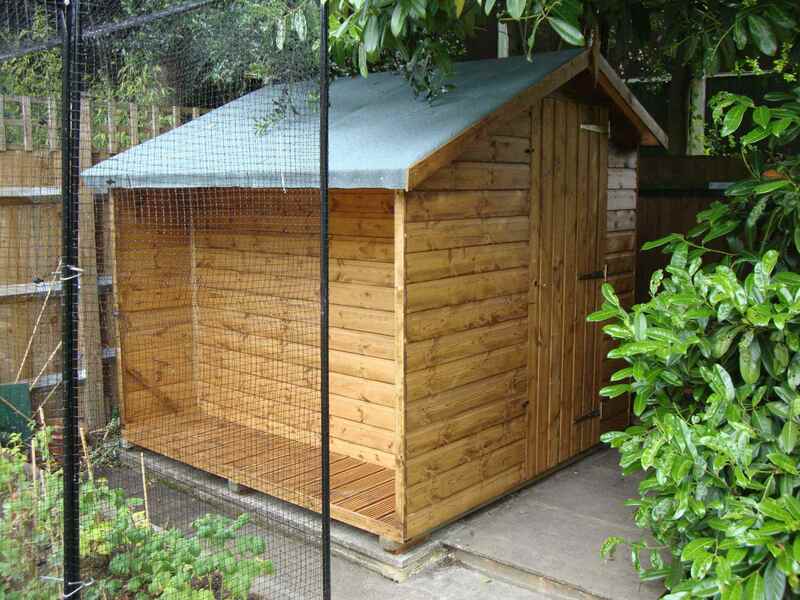 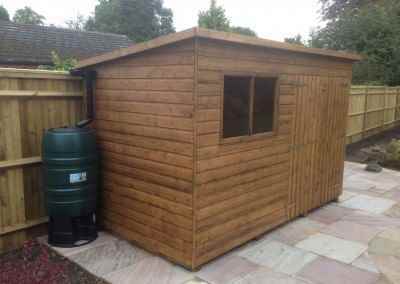 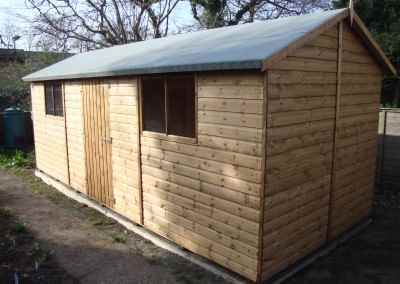 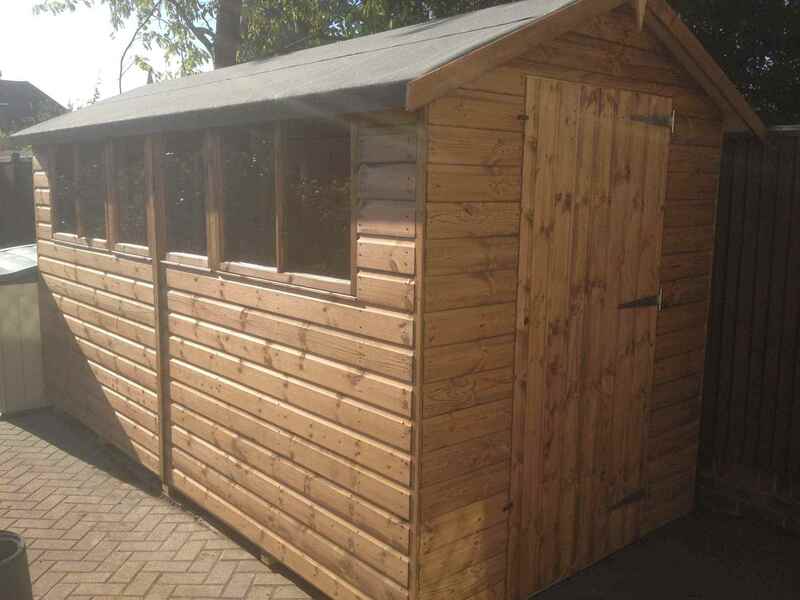 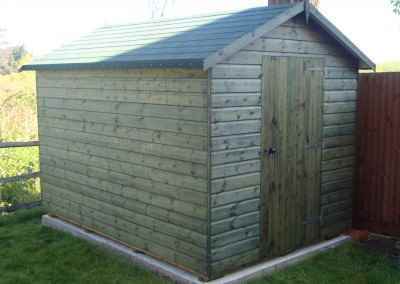 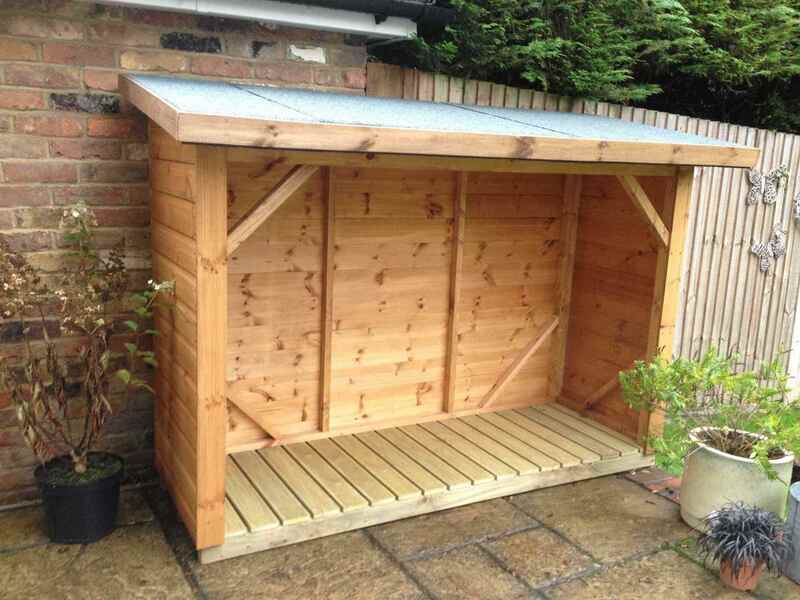 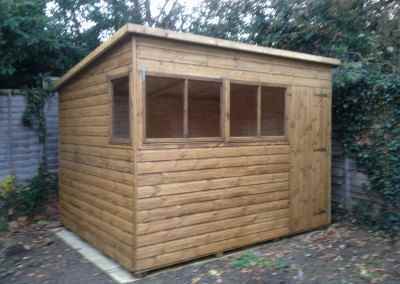 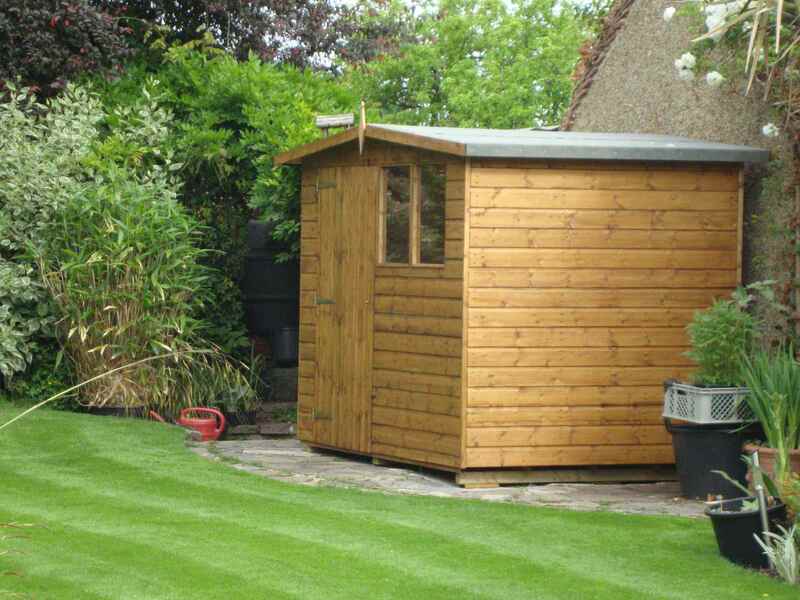 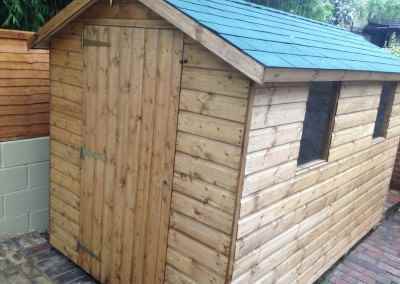 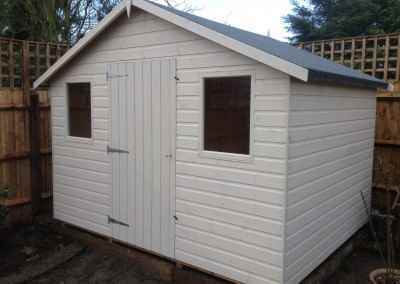 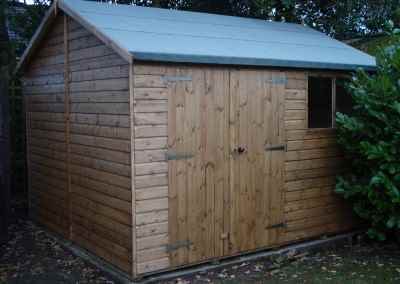 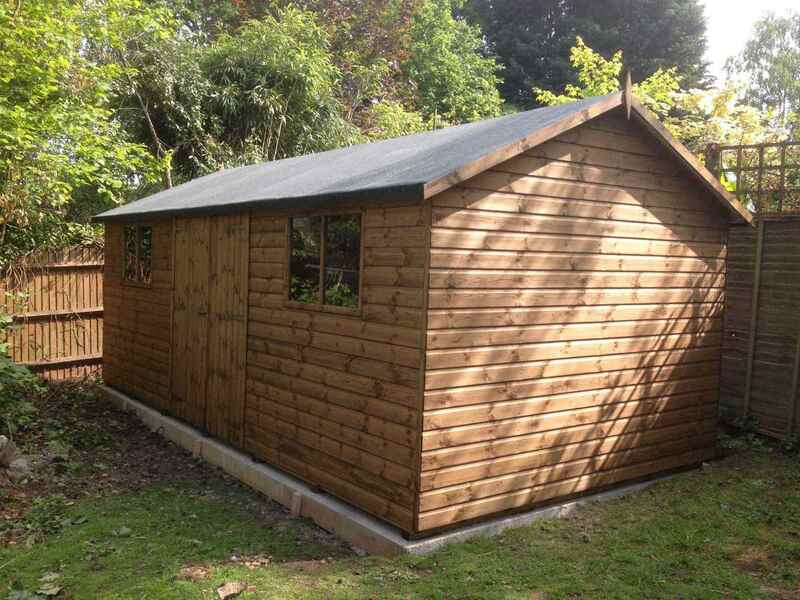 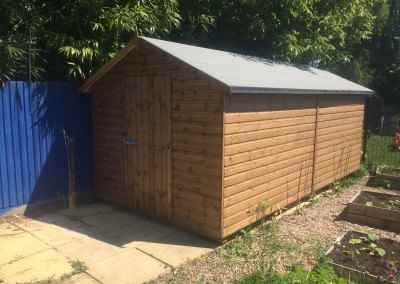 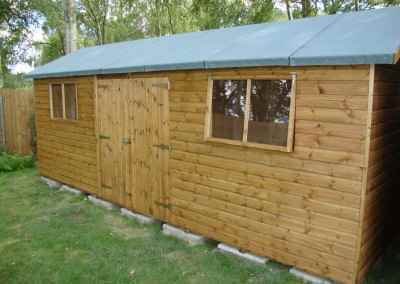 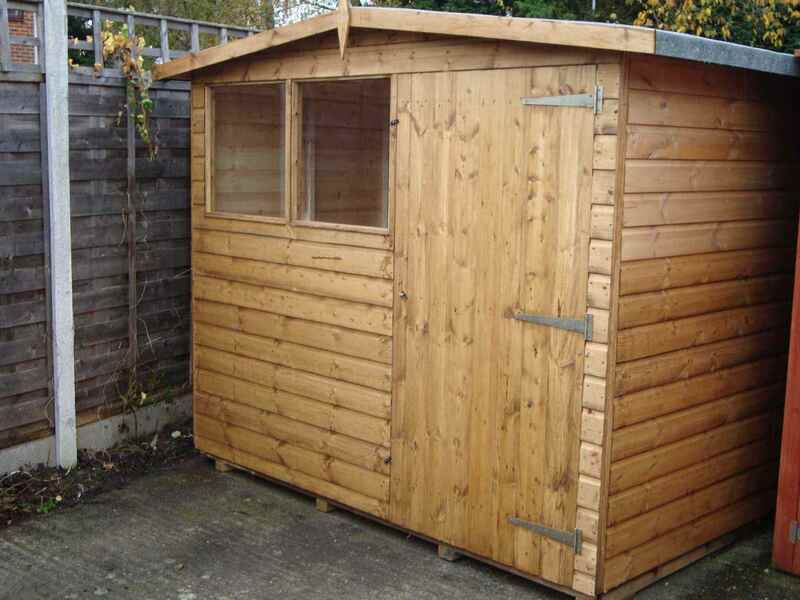 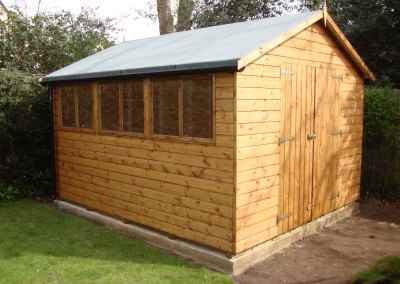 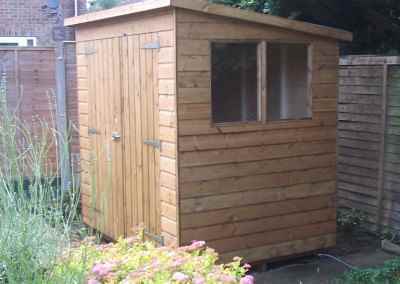 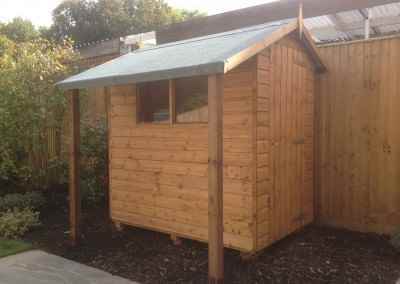 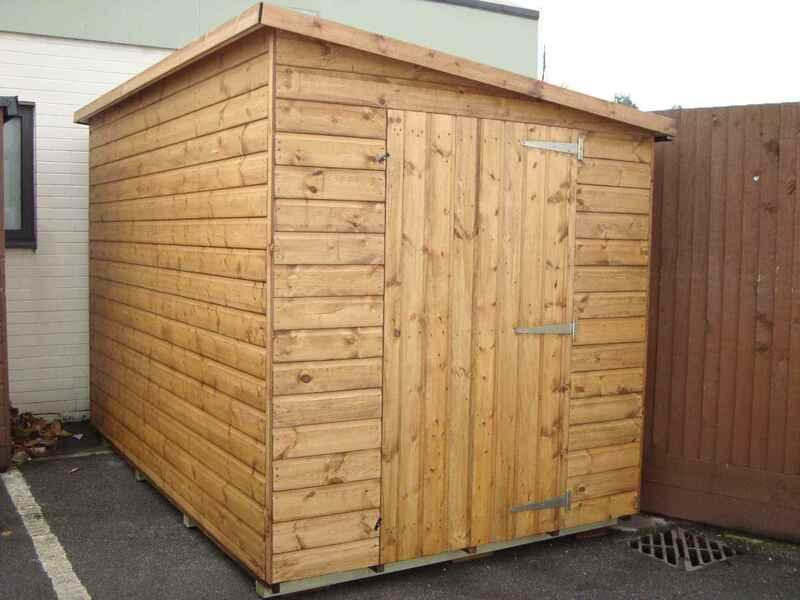 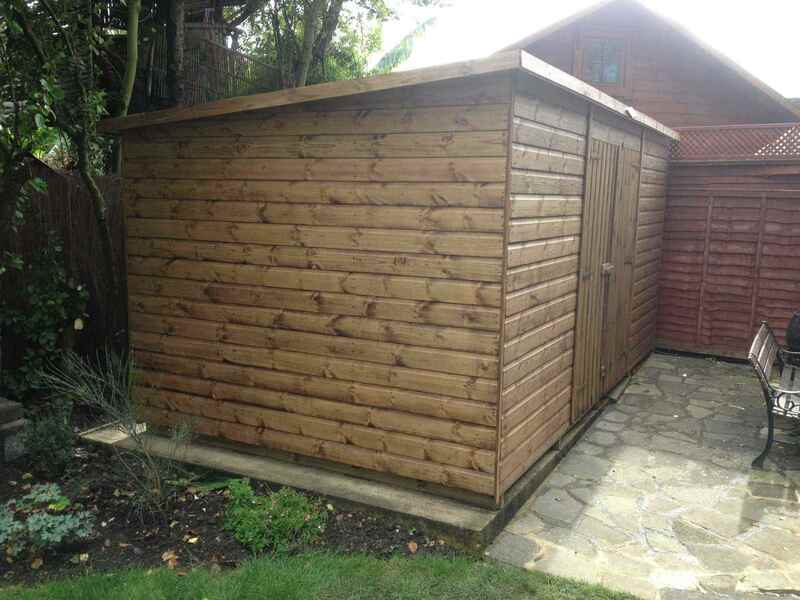 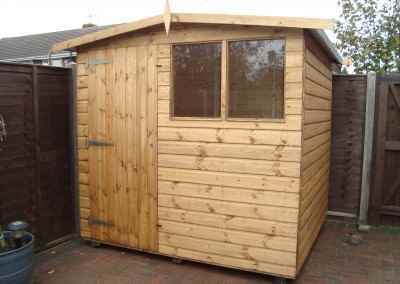 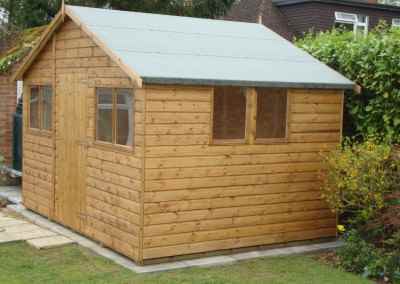 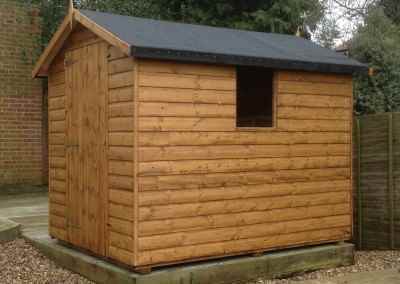 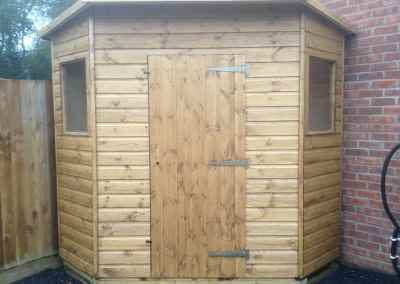 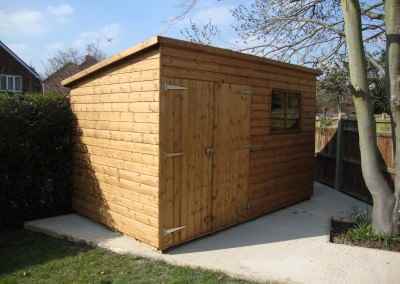 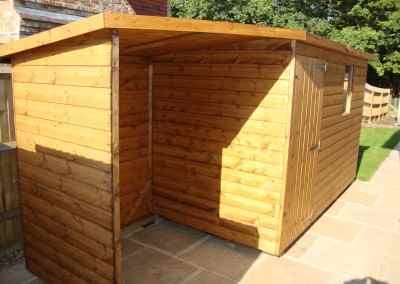 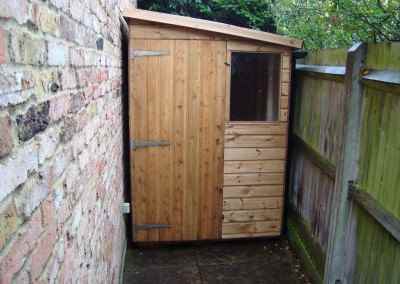 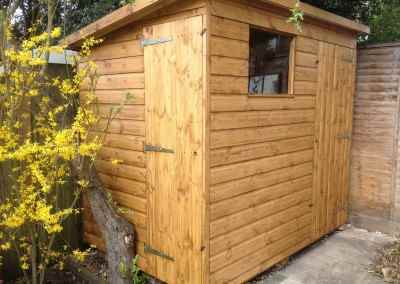 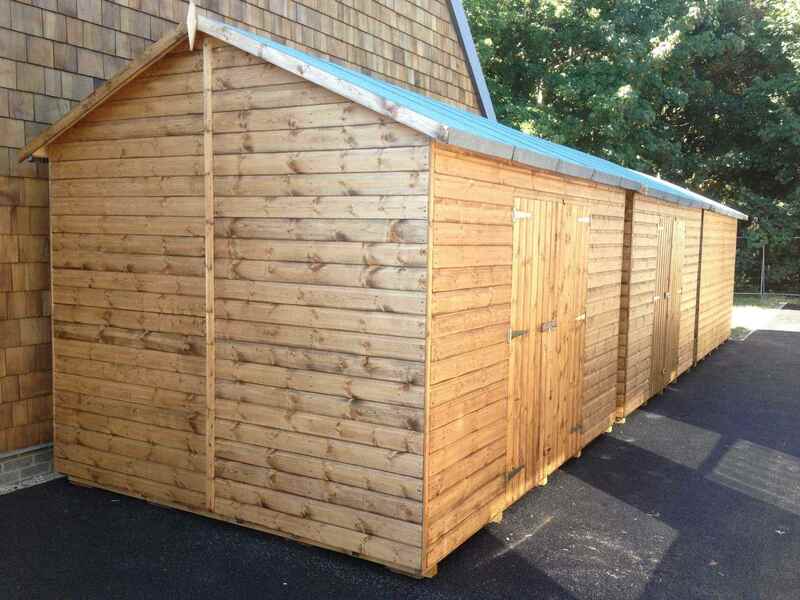 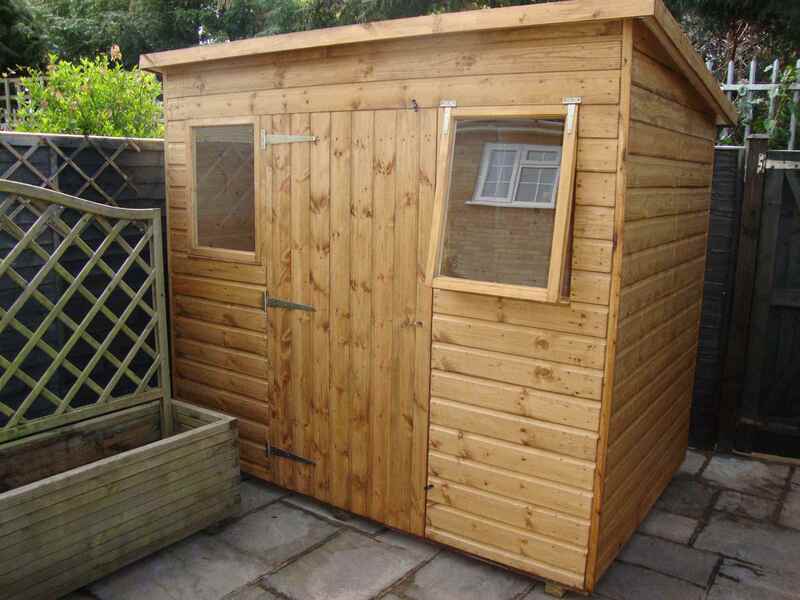 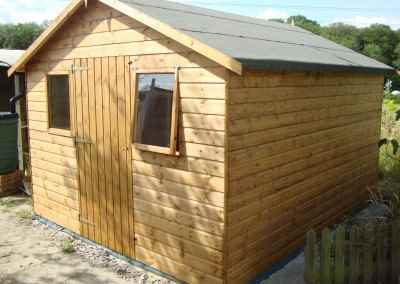 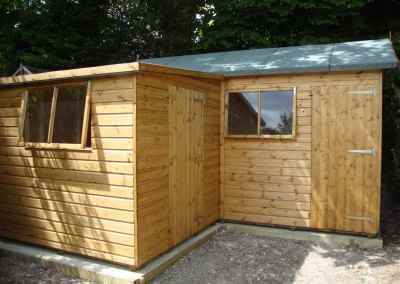 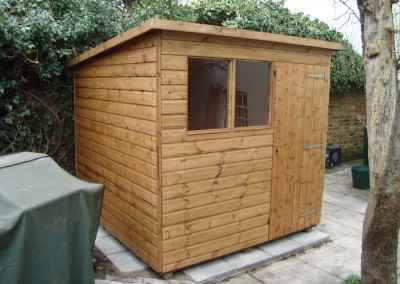 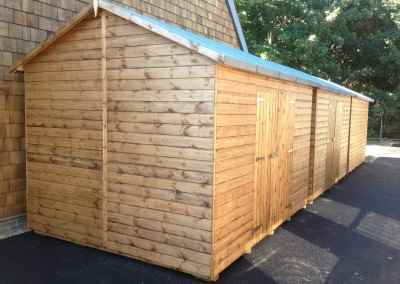 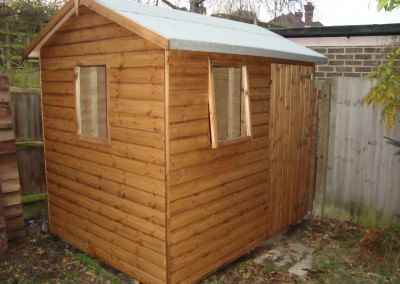 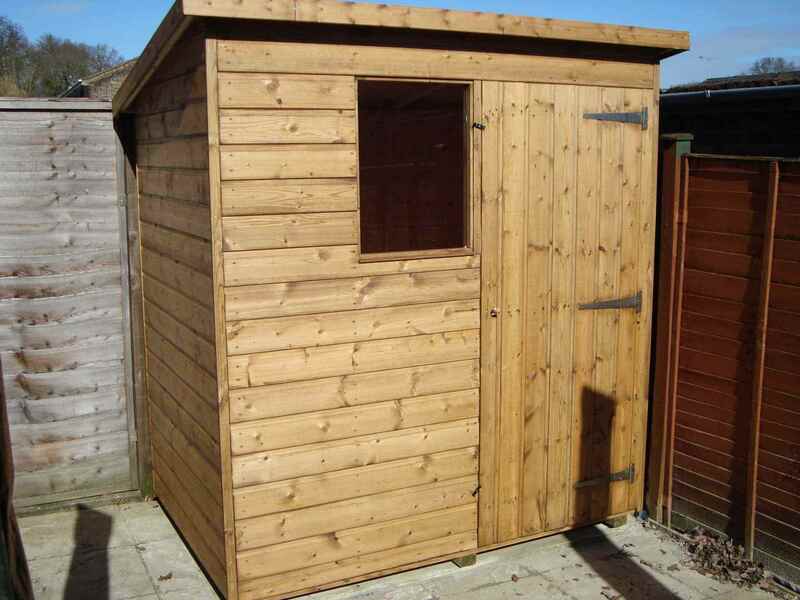 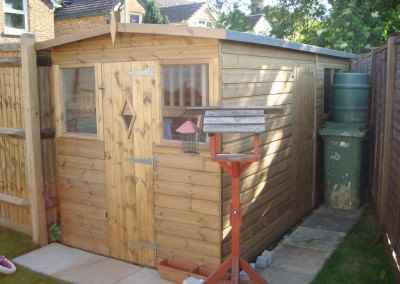 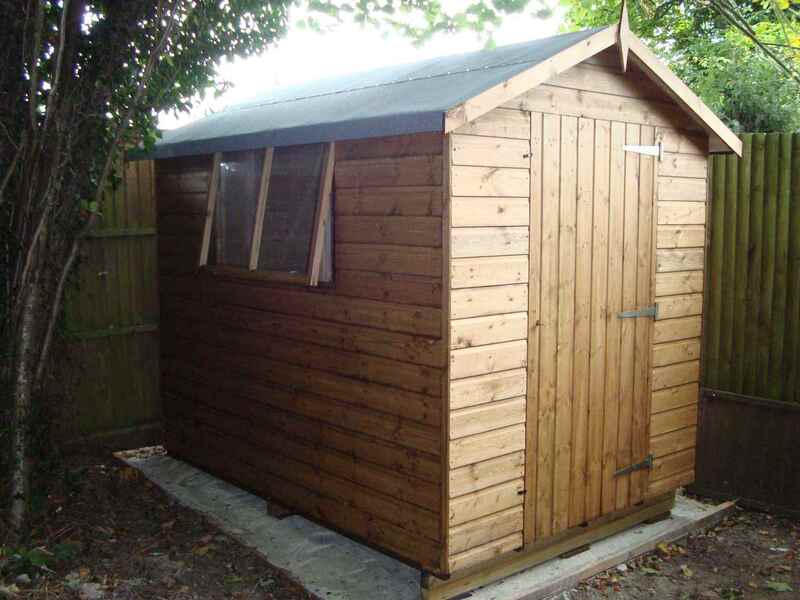 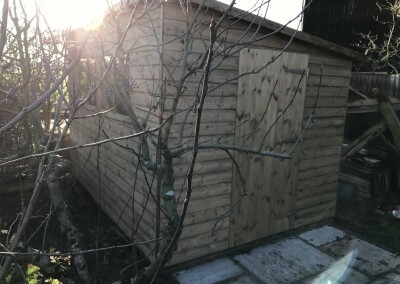 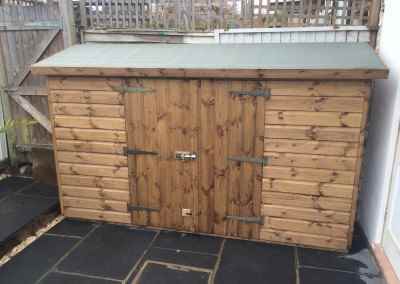 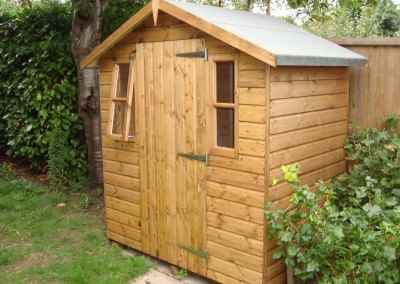 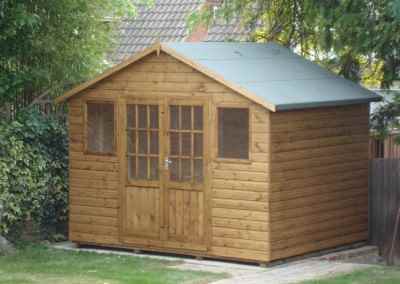 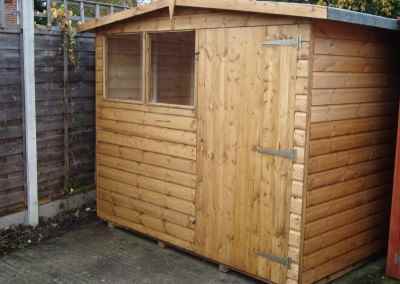 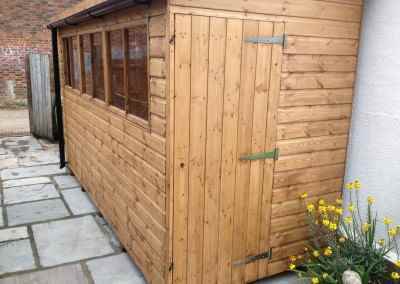 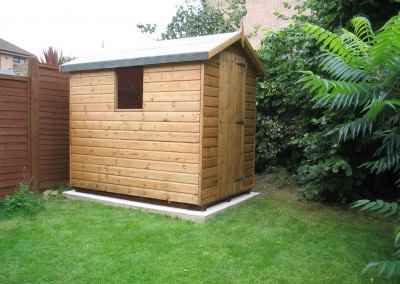 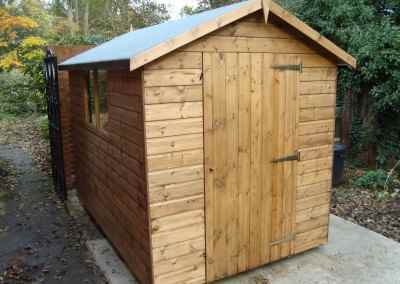 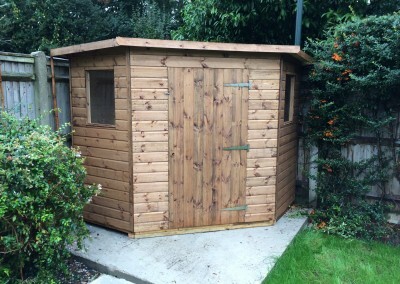 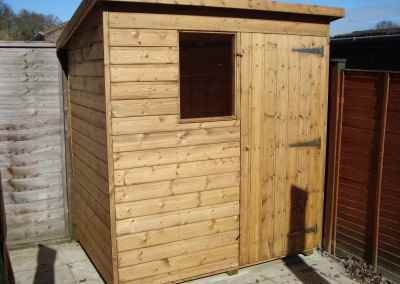 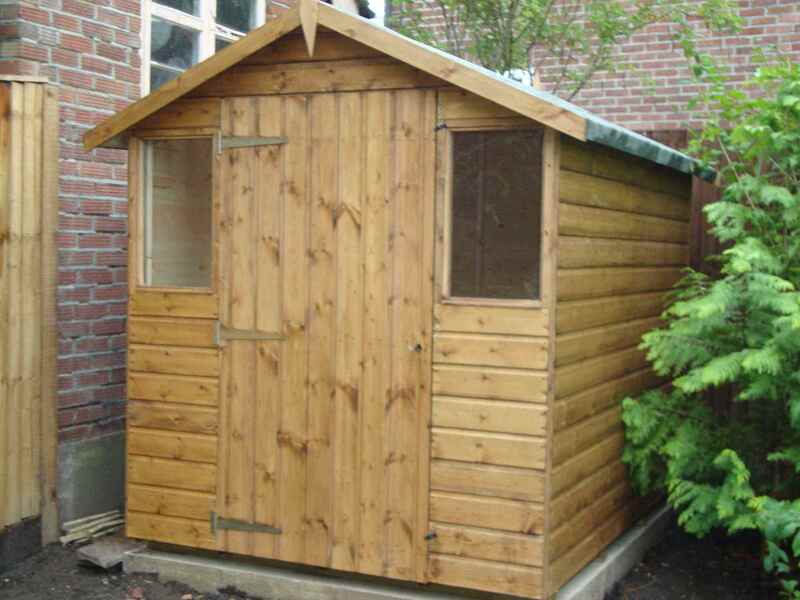 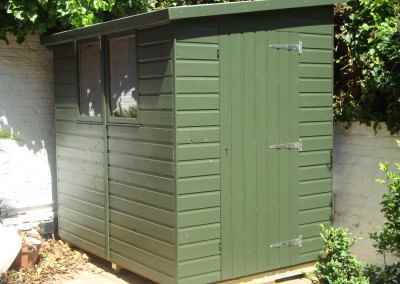 Security Shed 12×8, Heavy Torch-On Felt, Shades Finish. 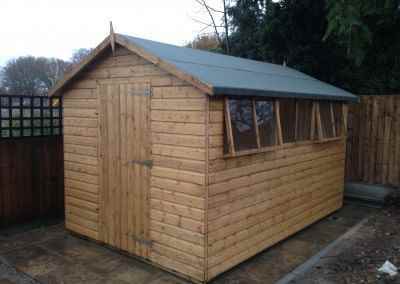 Security Shed 16×9 with Pent Roof and `built into customers exisiting wall. 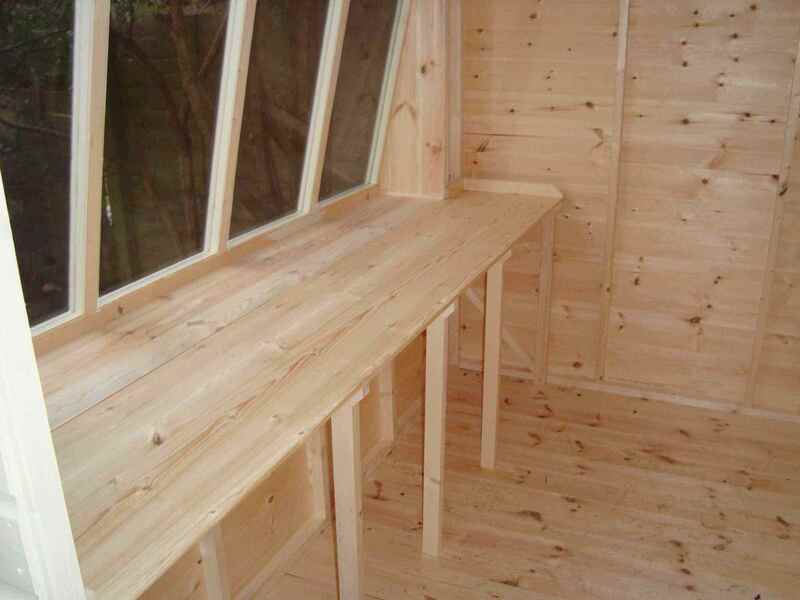 Log Store 7×3 to Customers Design. 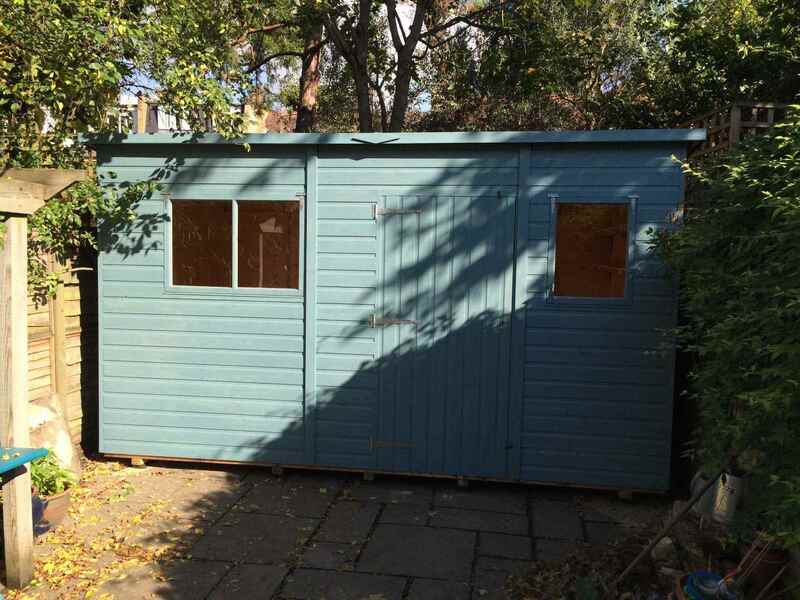 Tool Shed 4×2 with Lean To Super Pent in background. 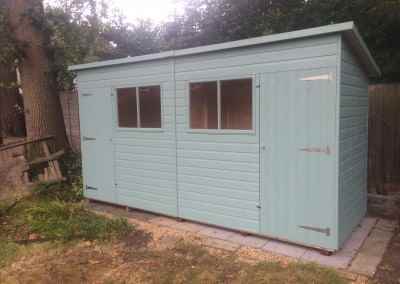 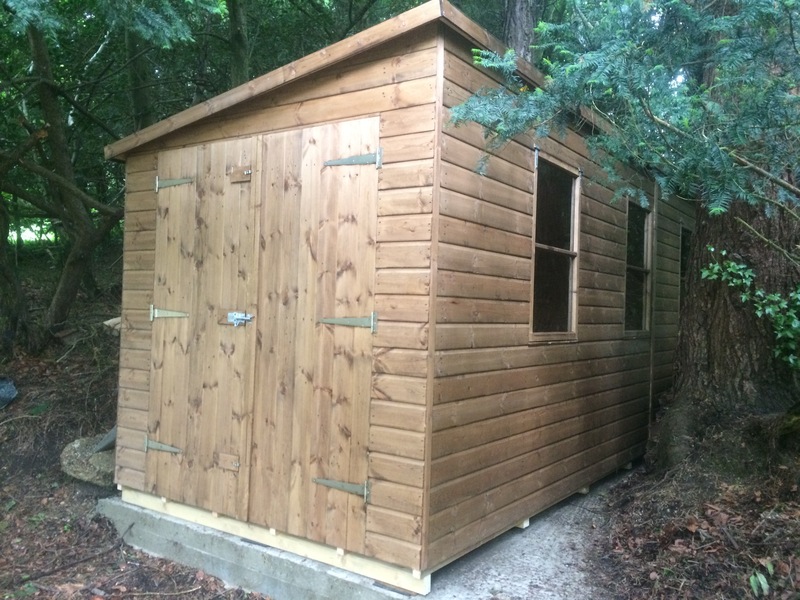 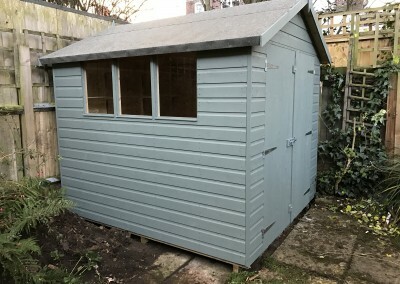 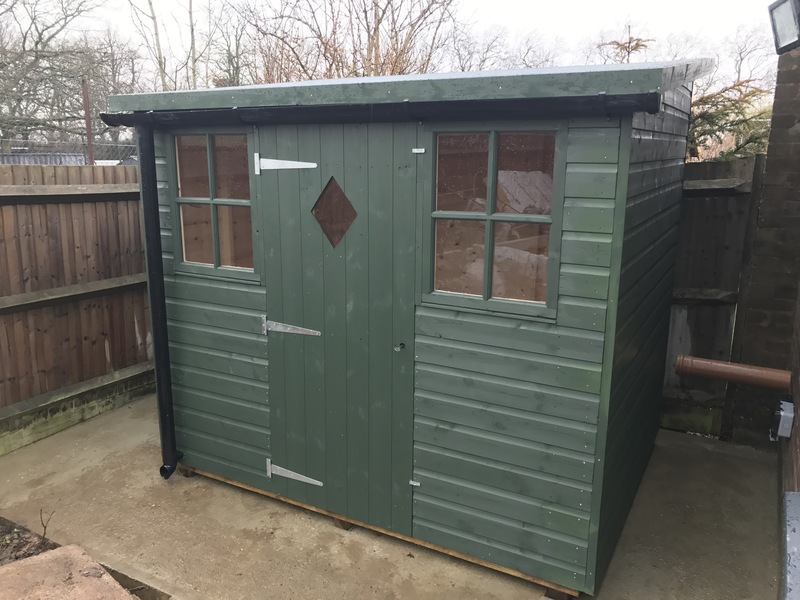 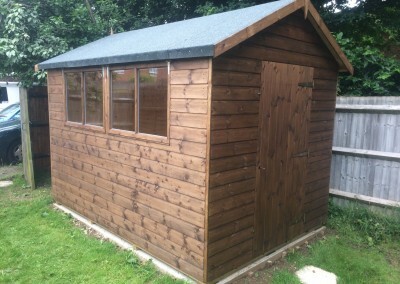 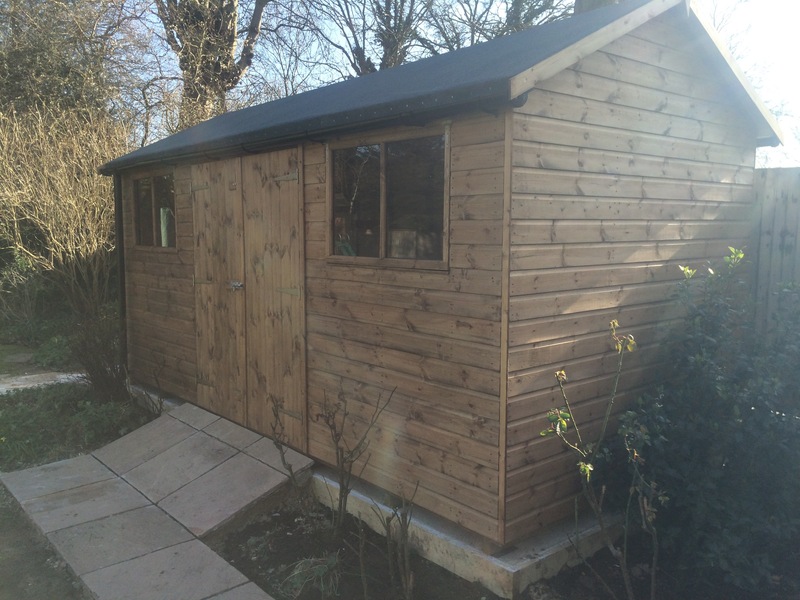 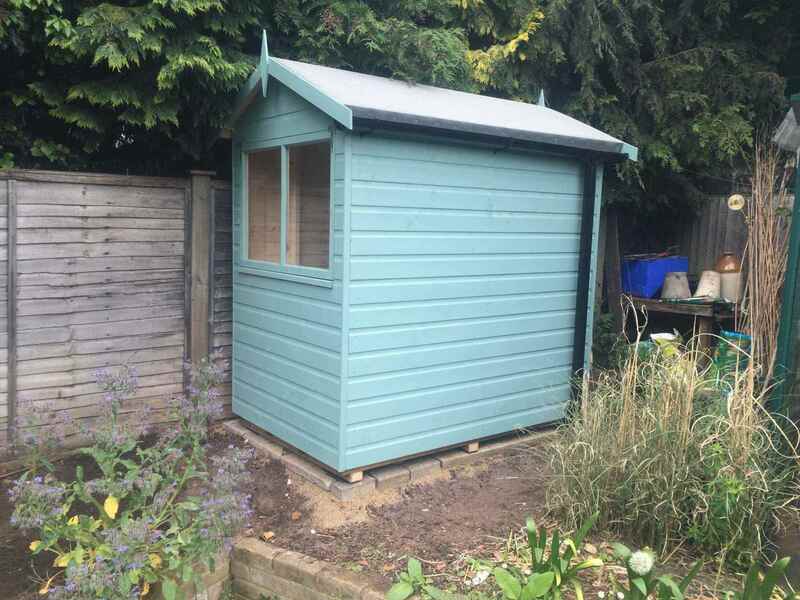 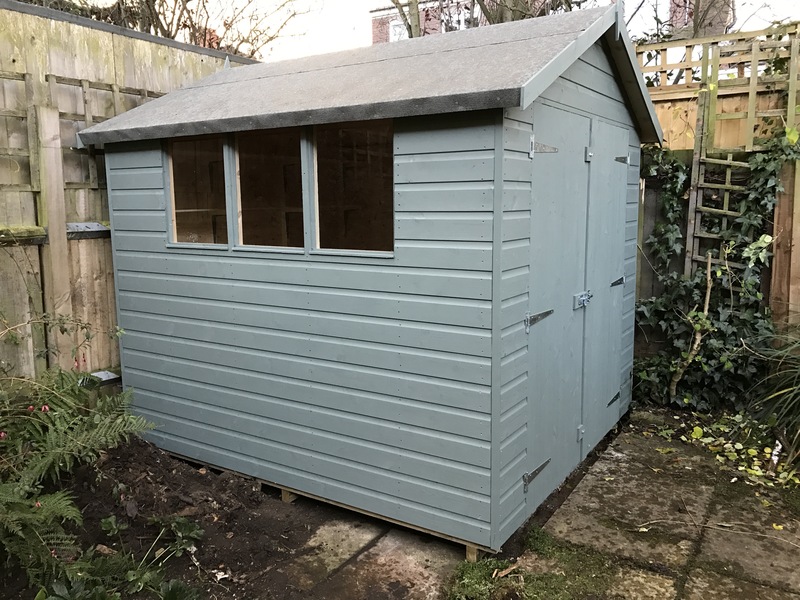 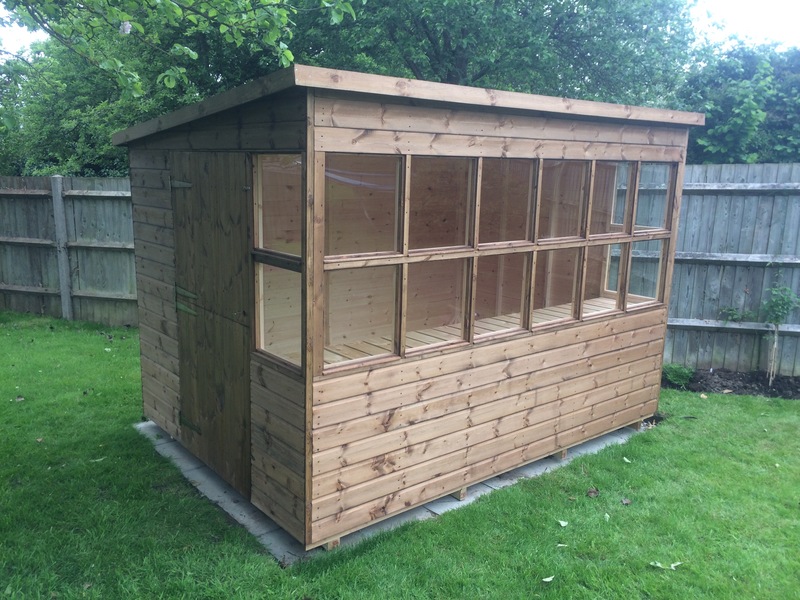 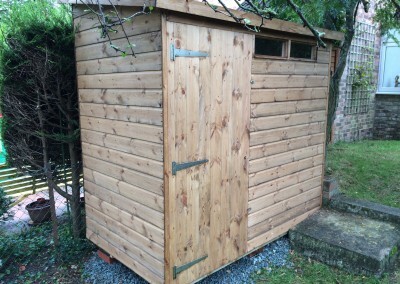 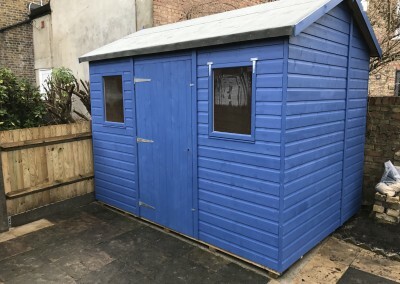 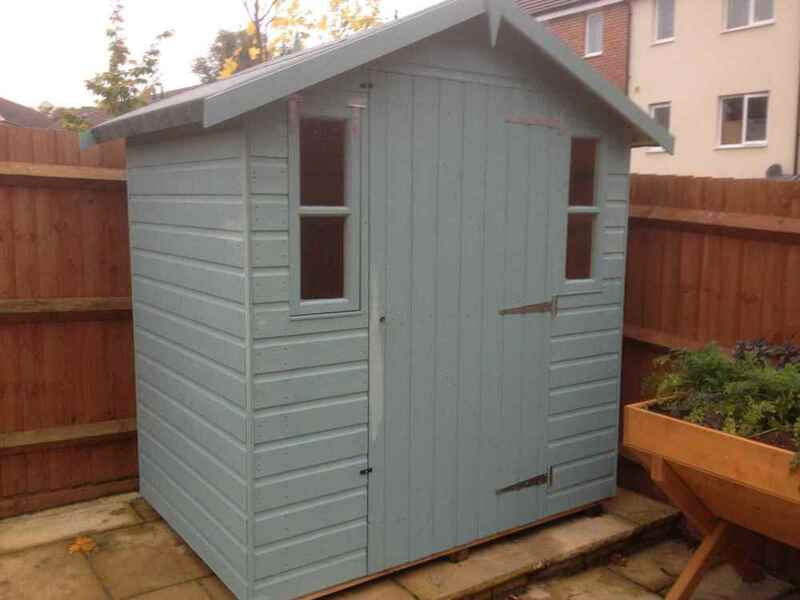 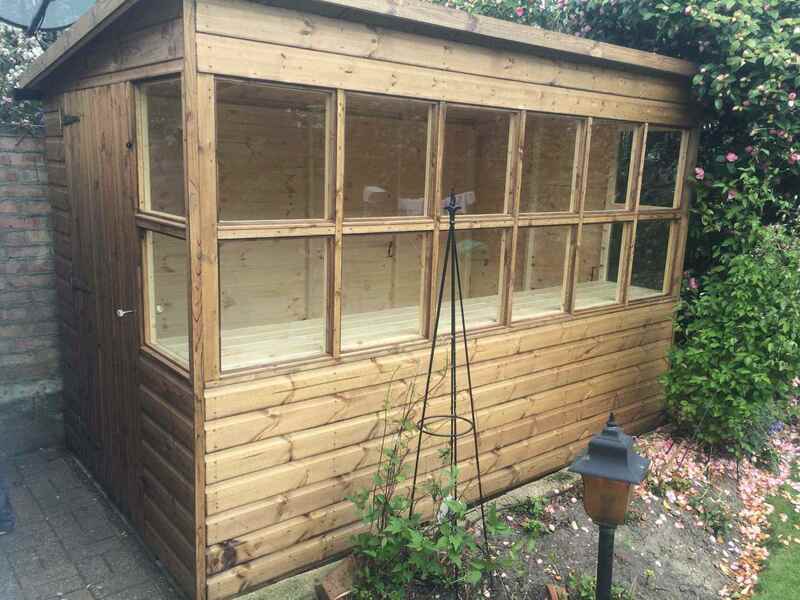 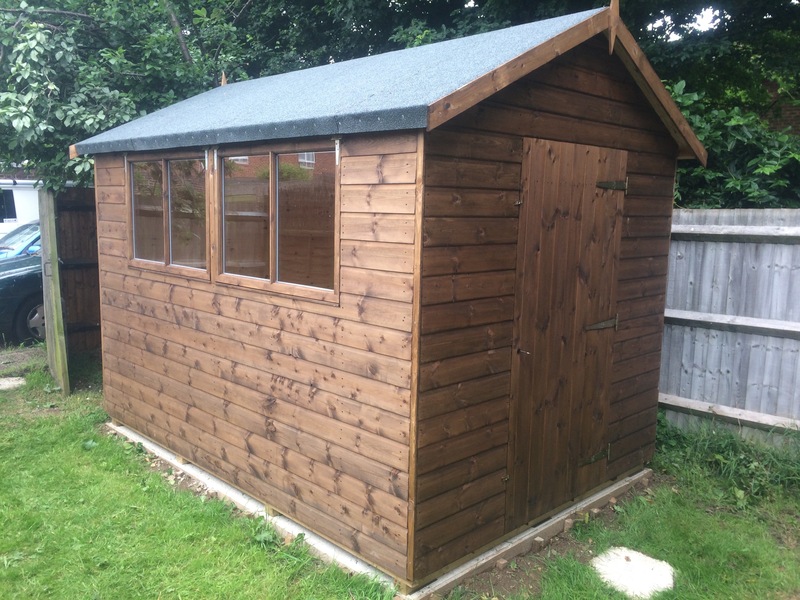 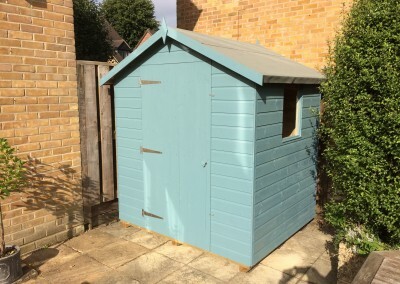 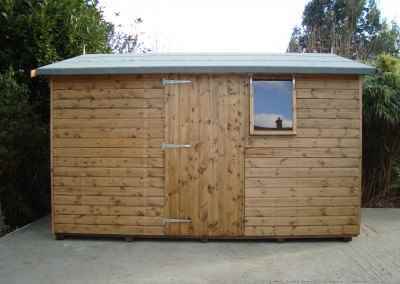 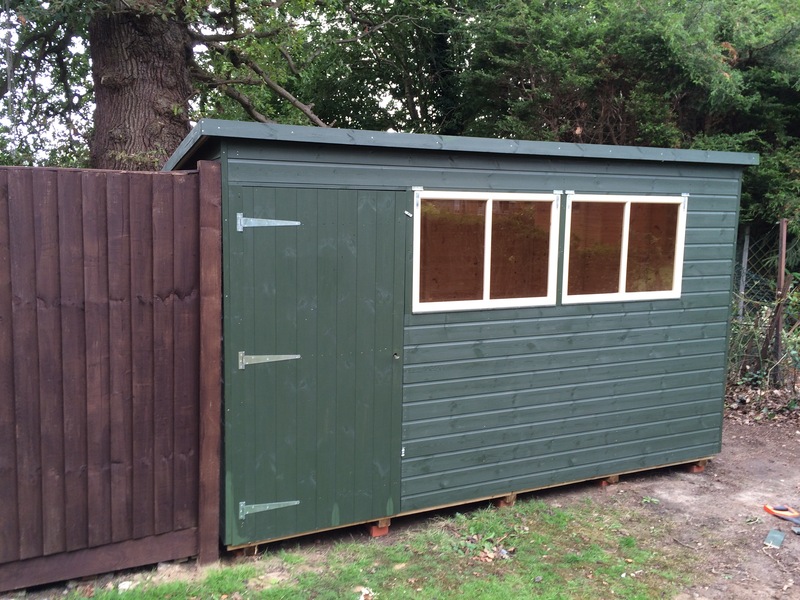 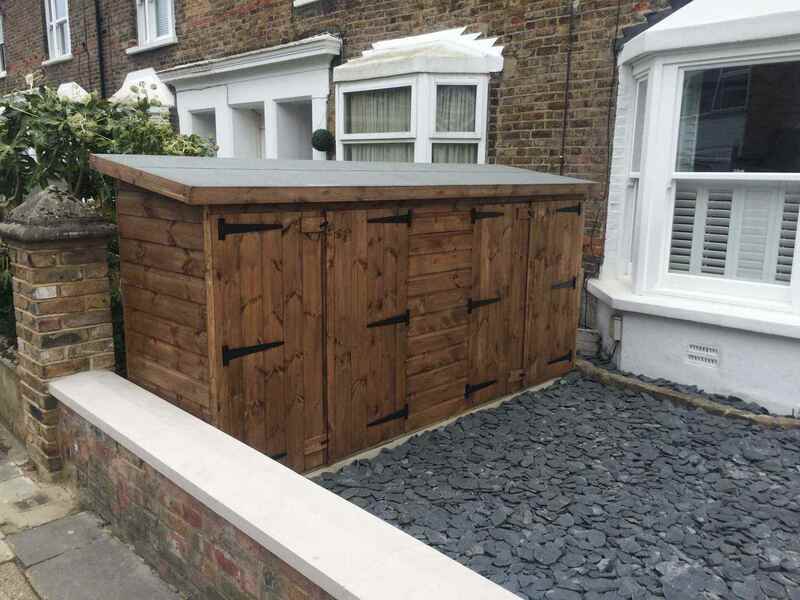 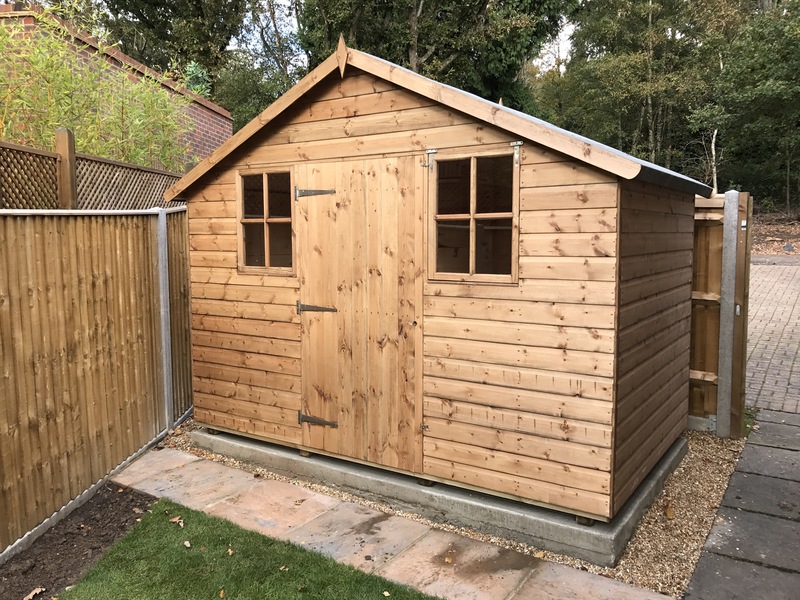 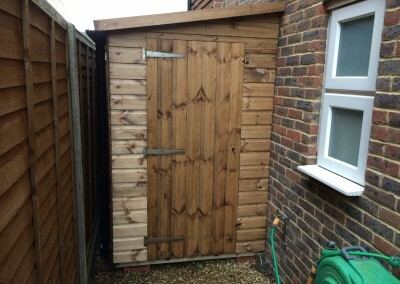 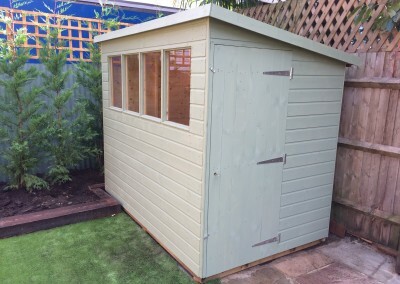 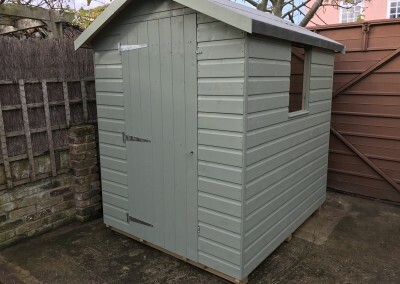 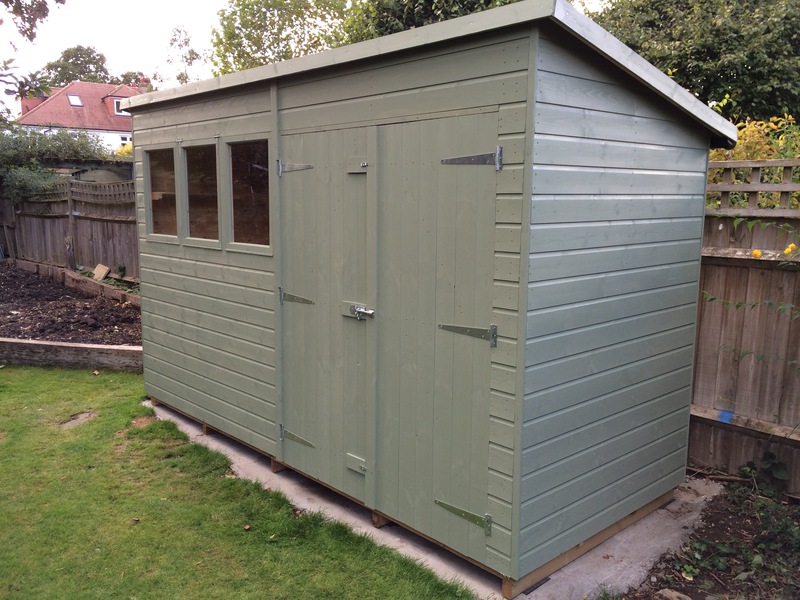 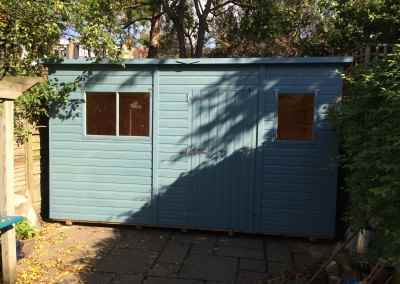 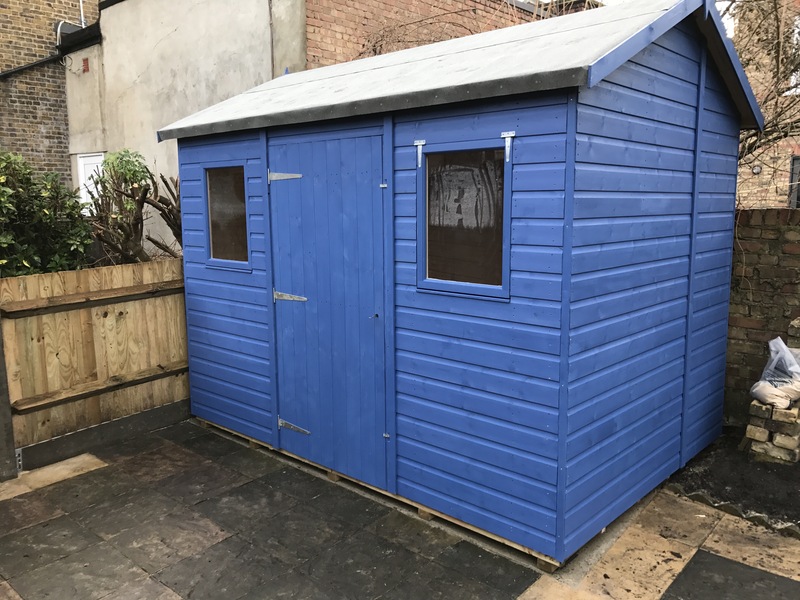 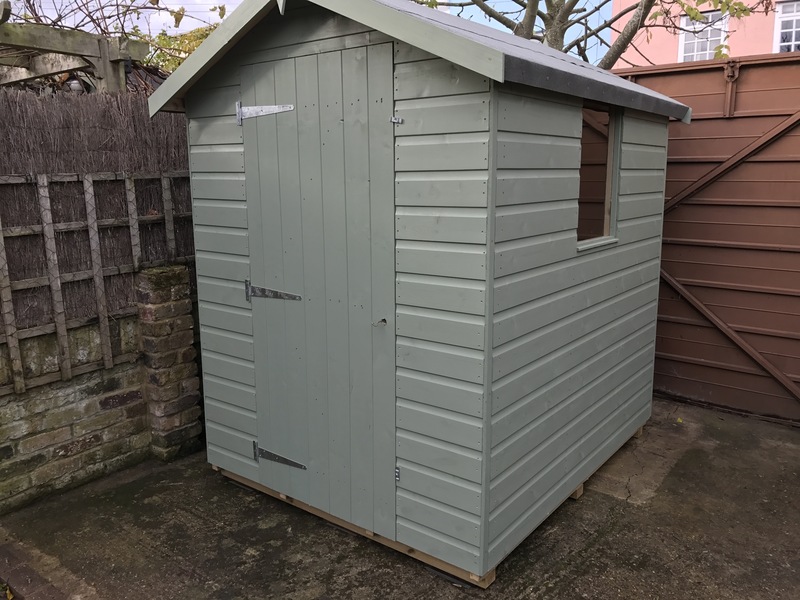 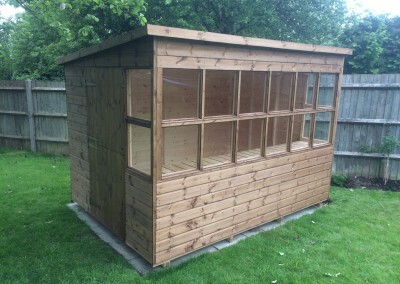 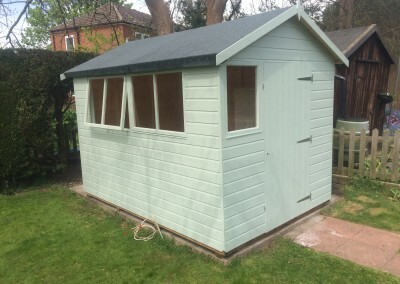 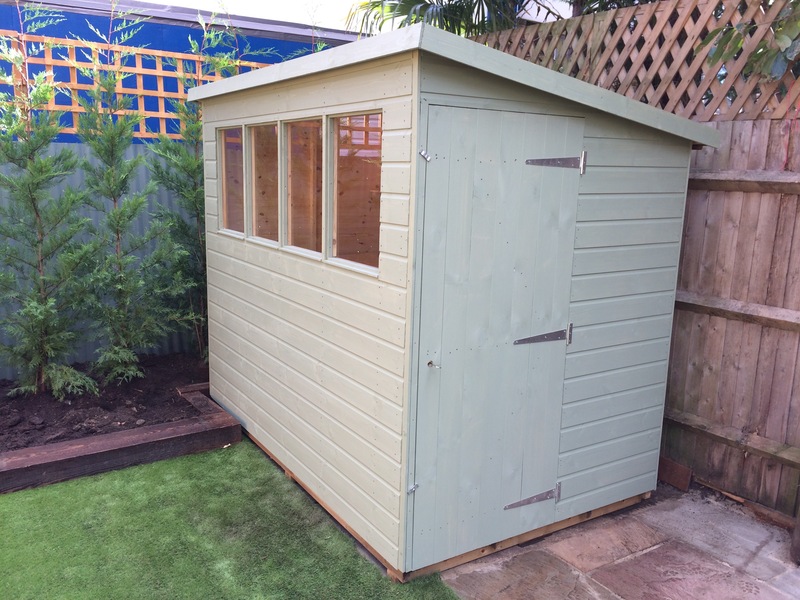 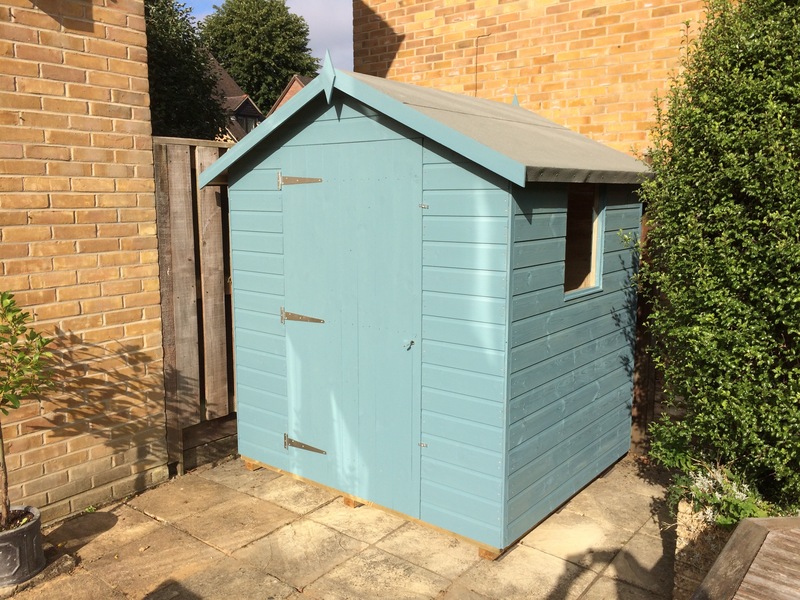 Tool Shed 6×3 with Double Doors. 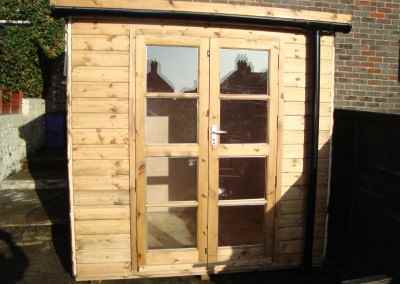 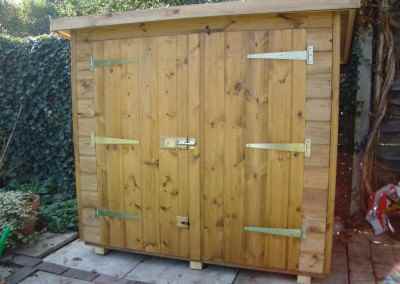 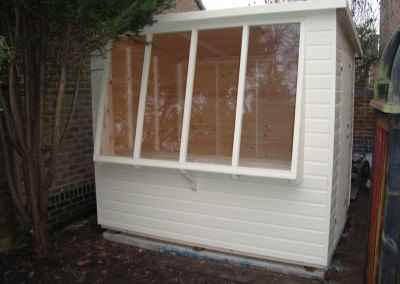 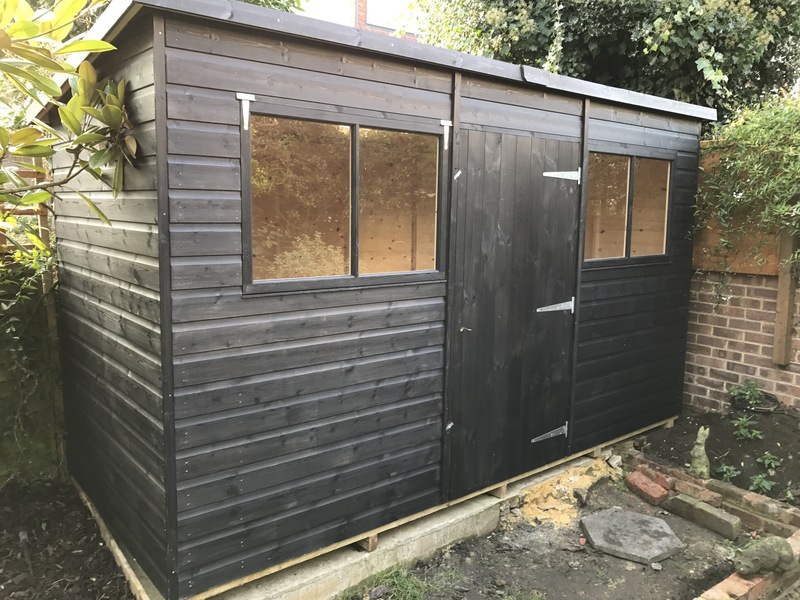 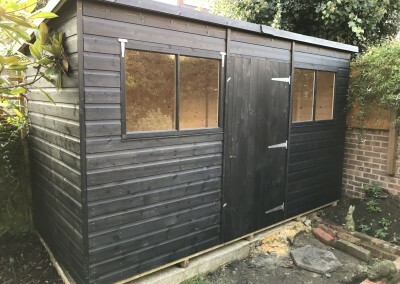 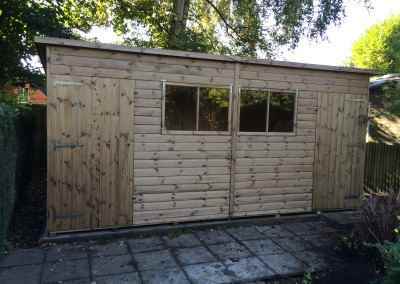 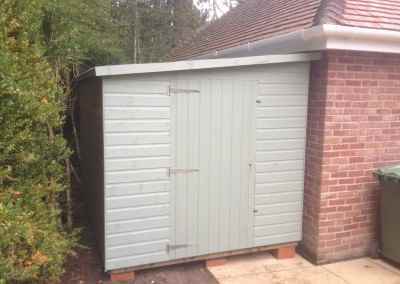 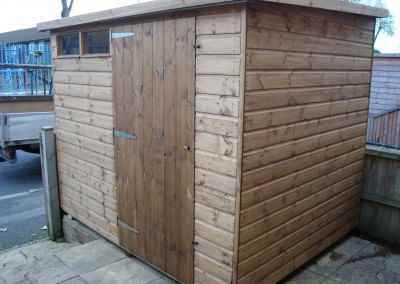 Tool Shed 10×3 2 sets of double doors with black fittings. 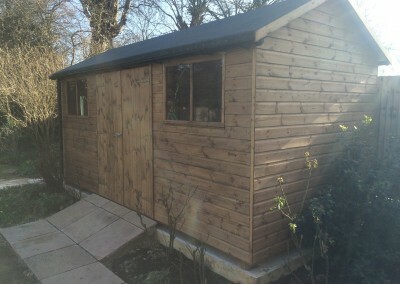 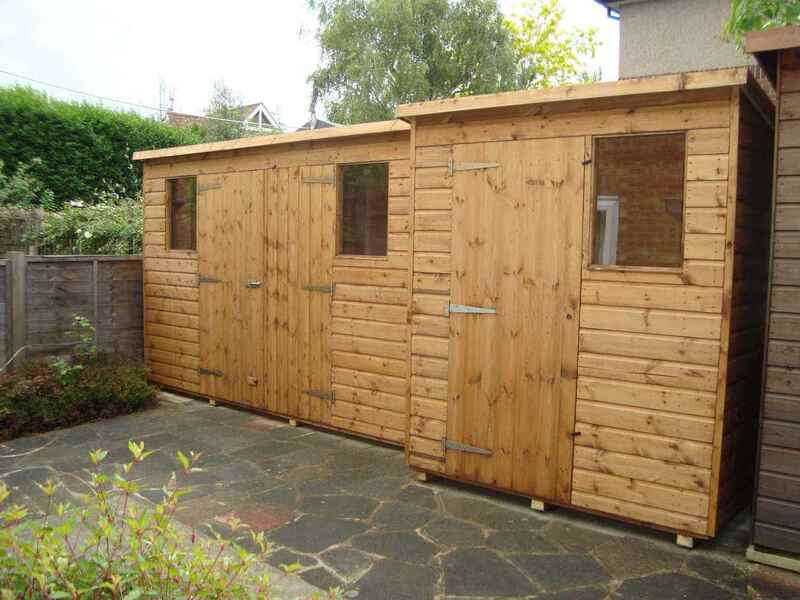 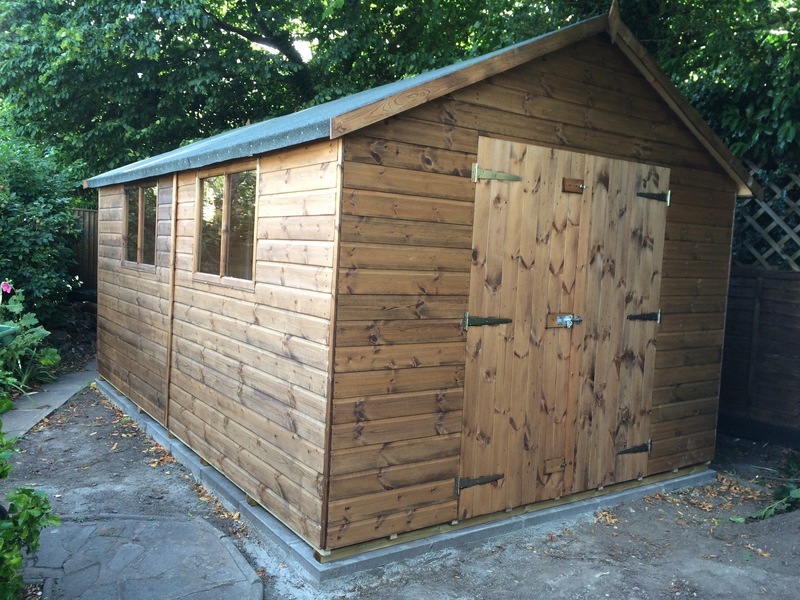 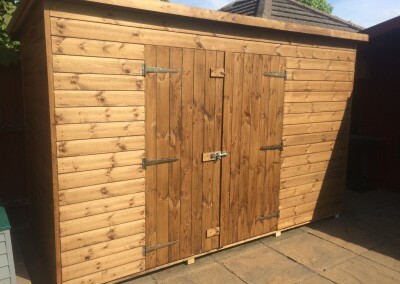 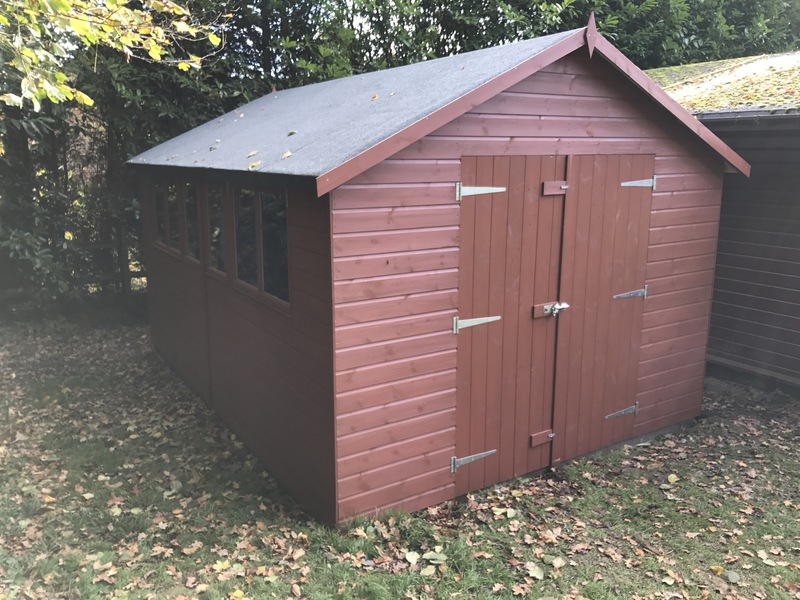 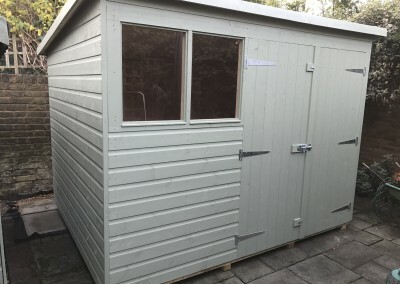 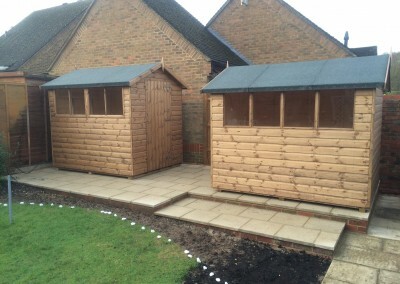 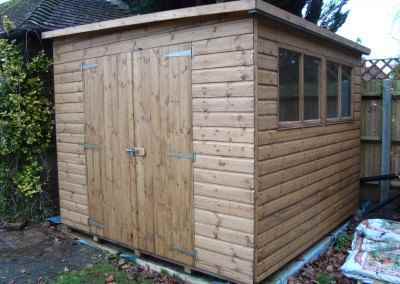 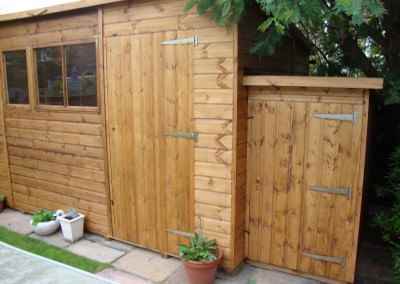 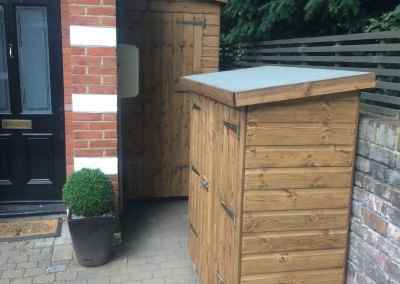 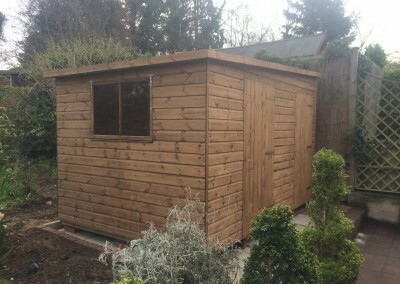 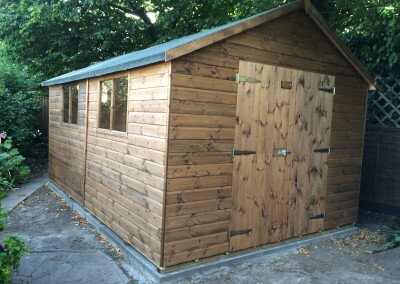 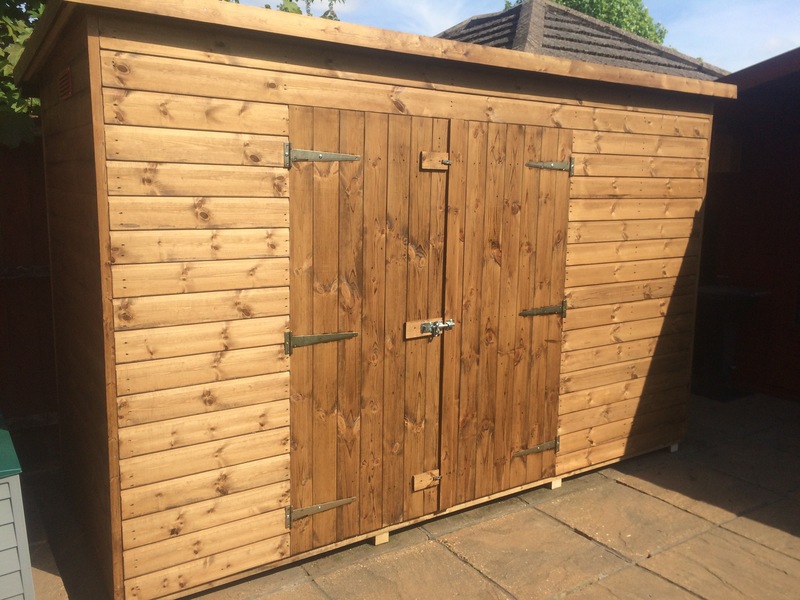 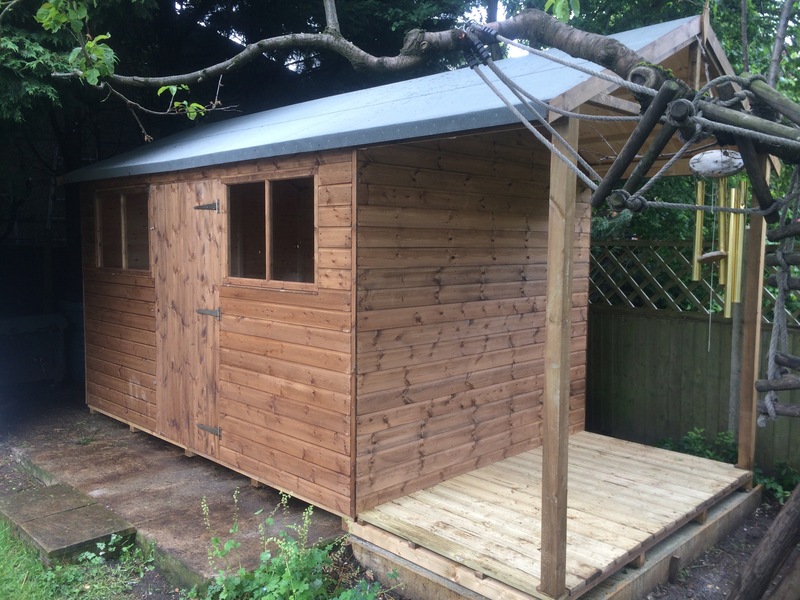 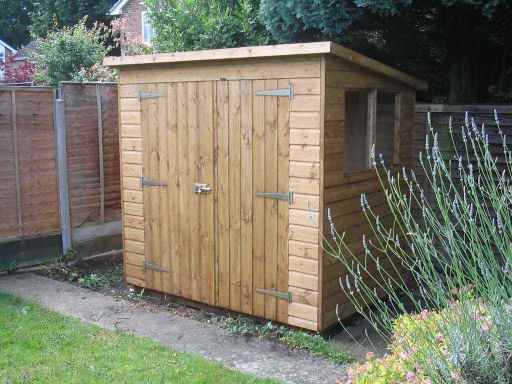 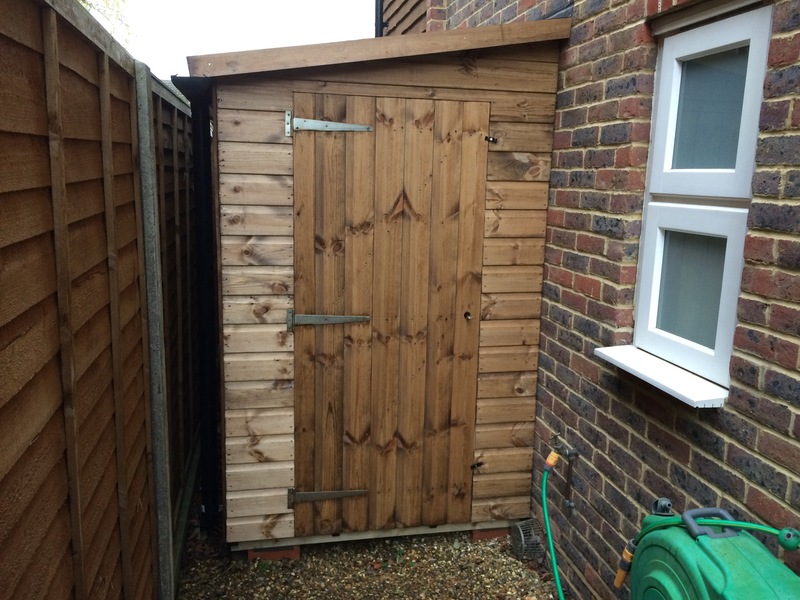 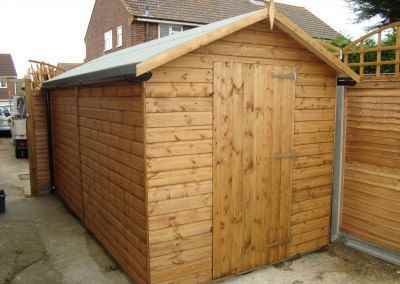 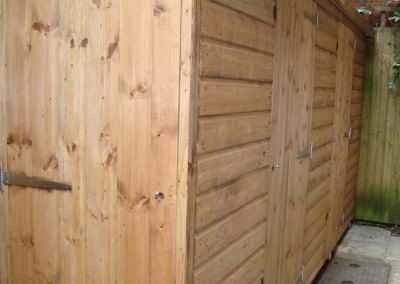 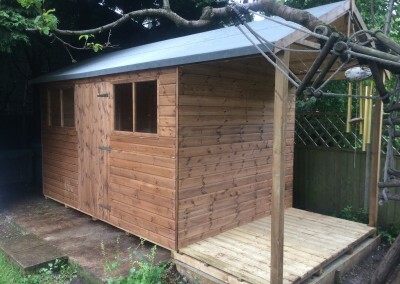 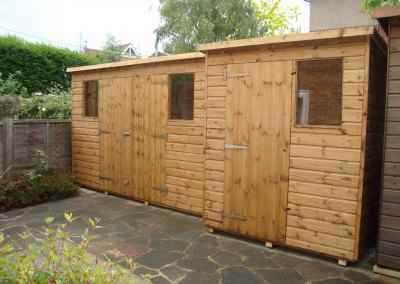 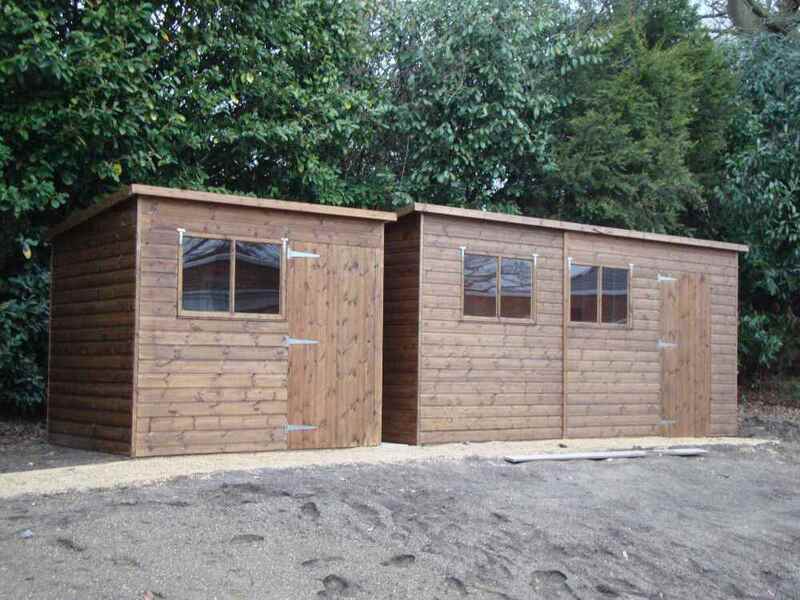 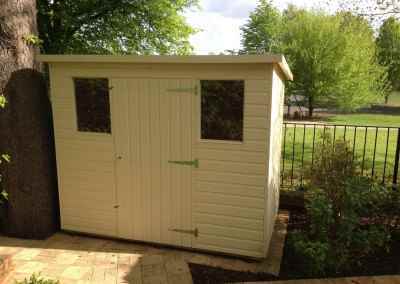 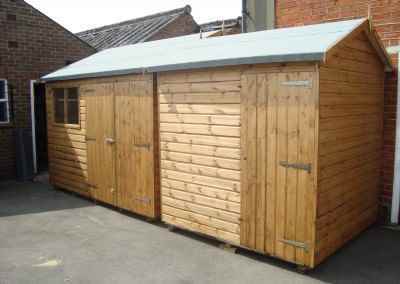 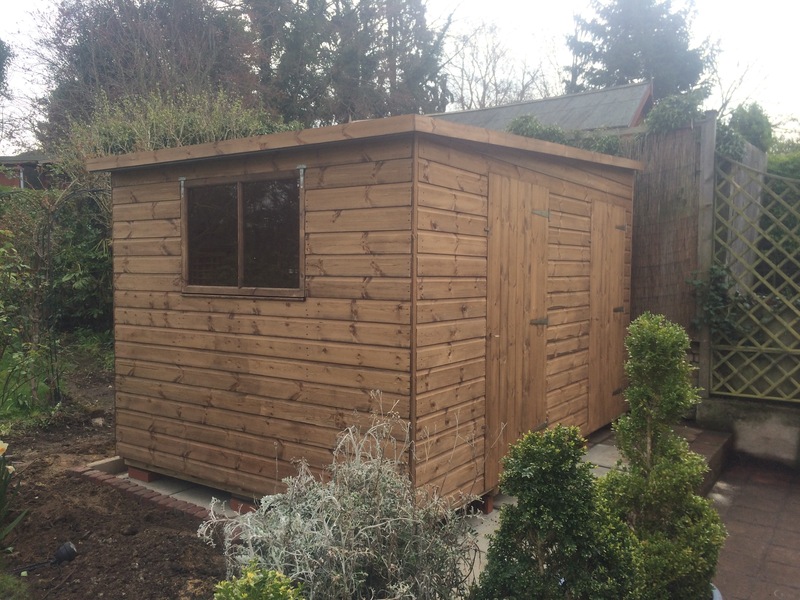 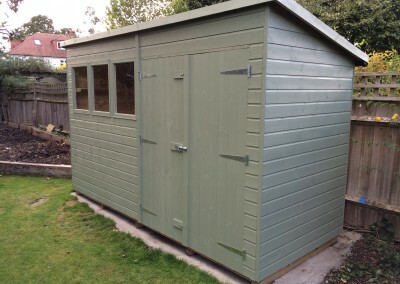 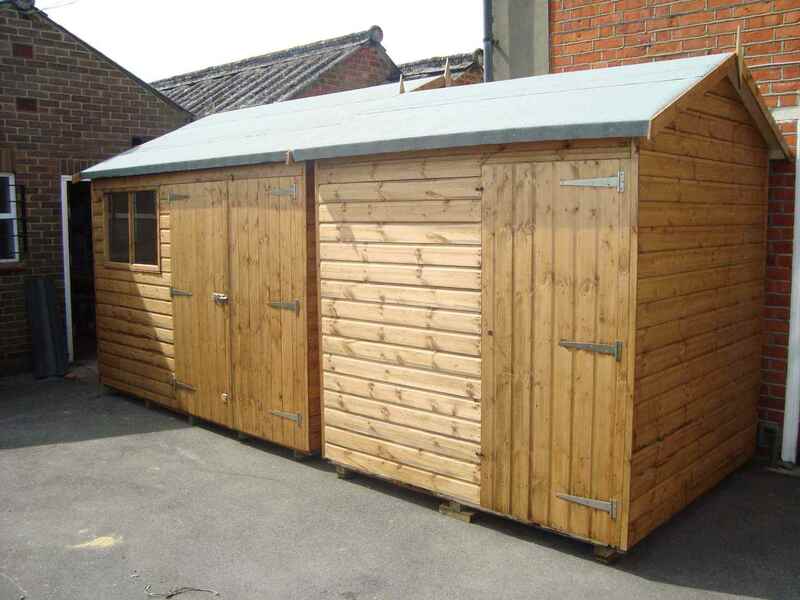 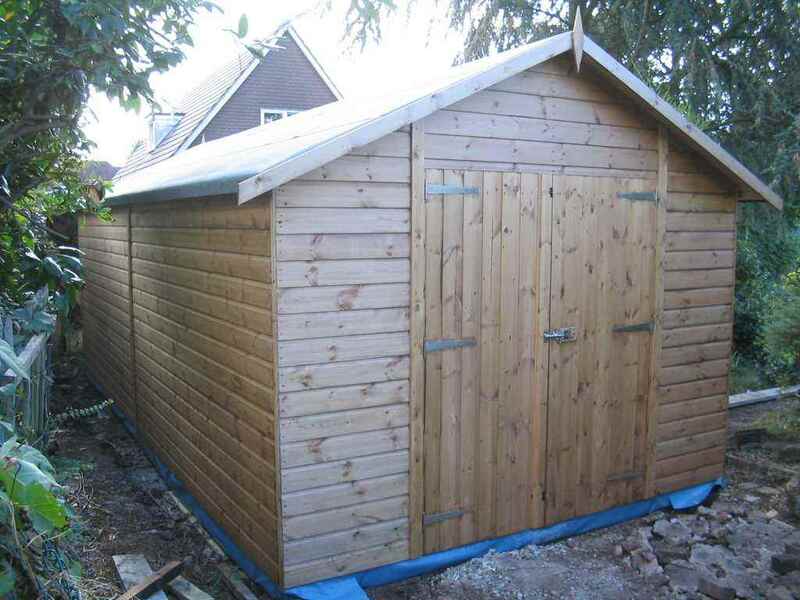 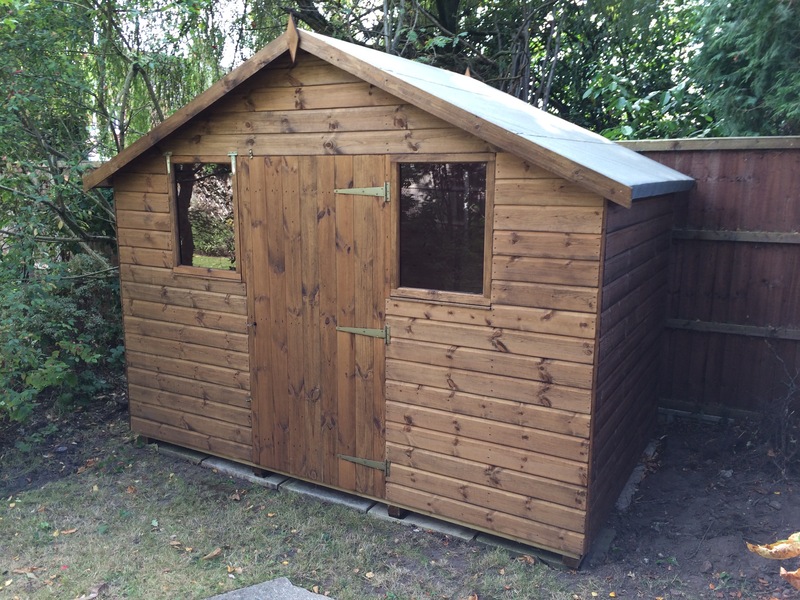 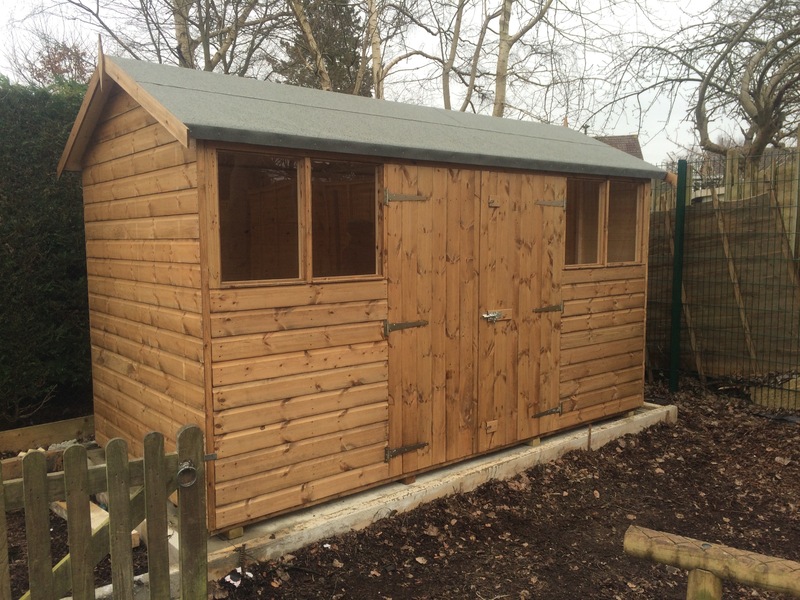 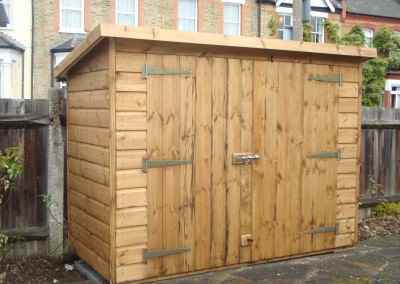 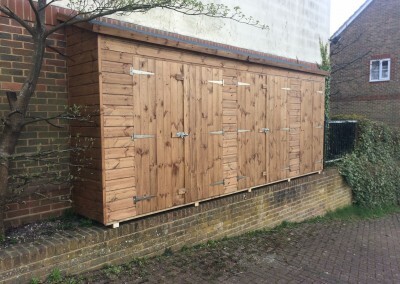 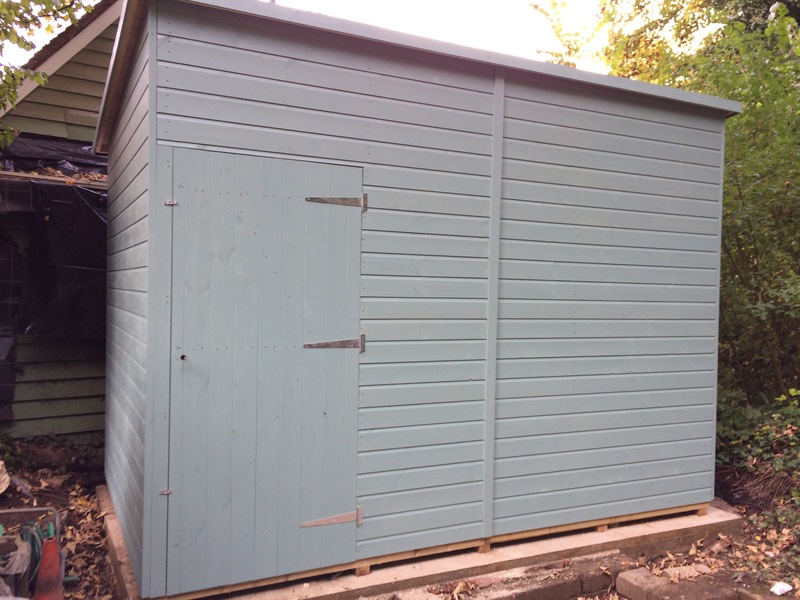 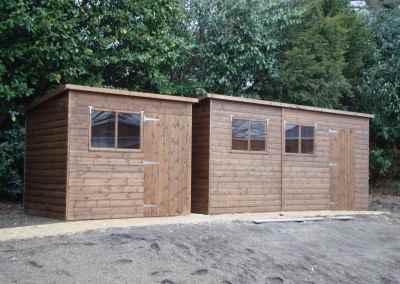 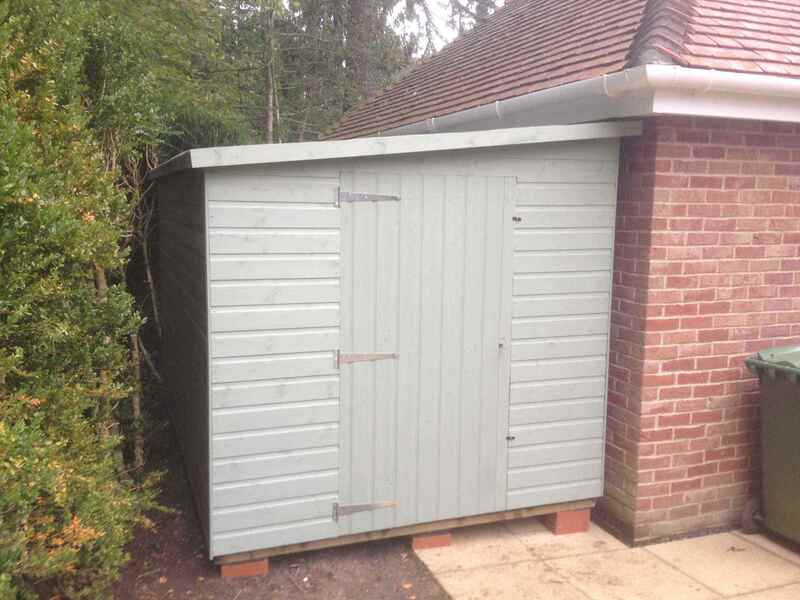 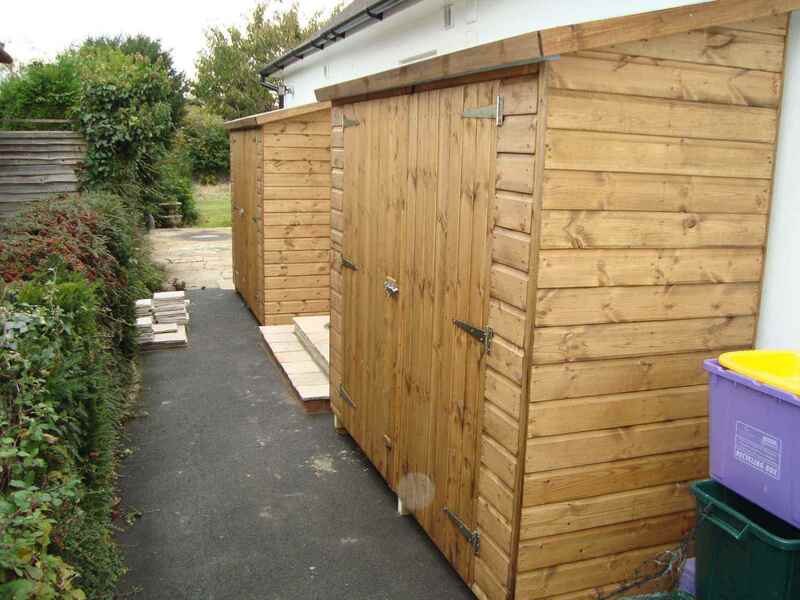 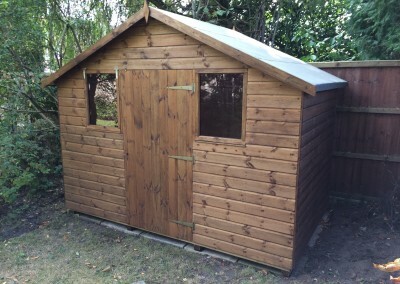 Tool Shed 15×4 with two sets of double 3′ doors. 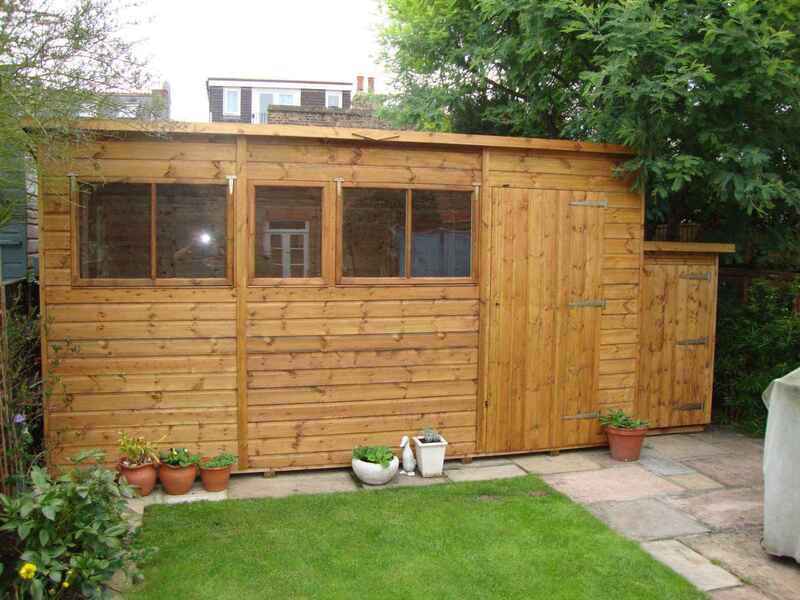 "Top quality service. 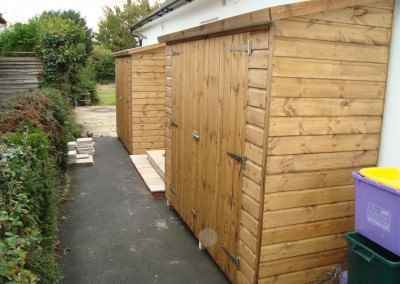 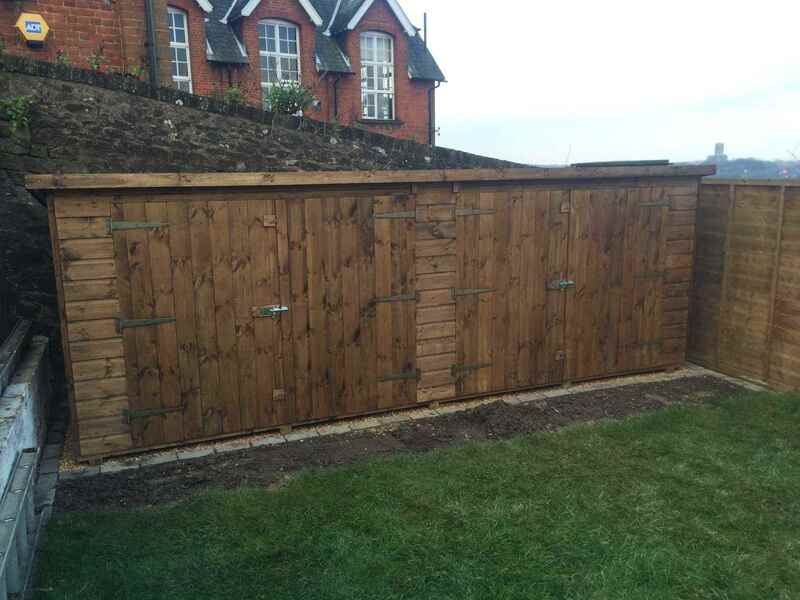 The work was done efficiently, speedily and with no fuss."